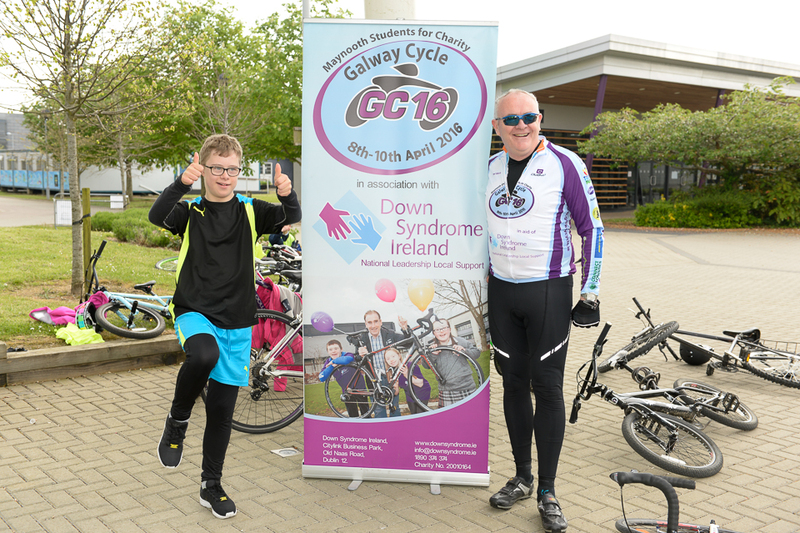 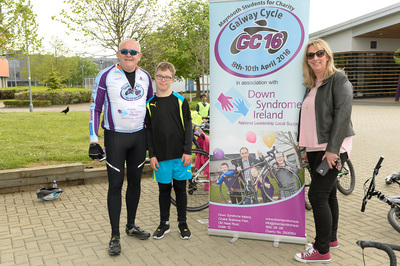 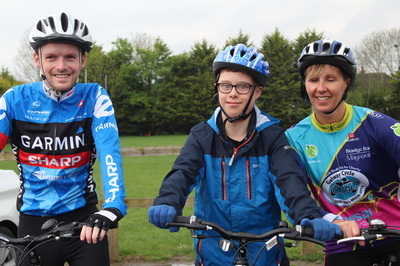 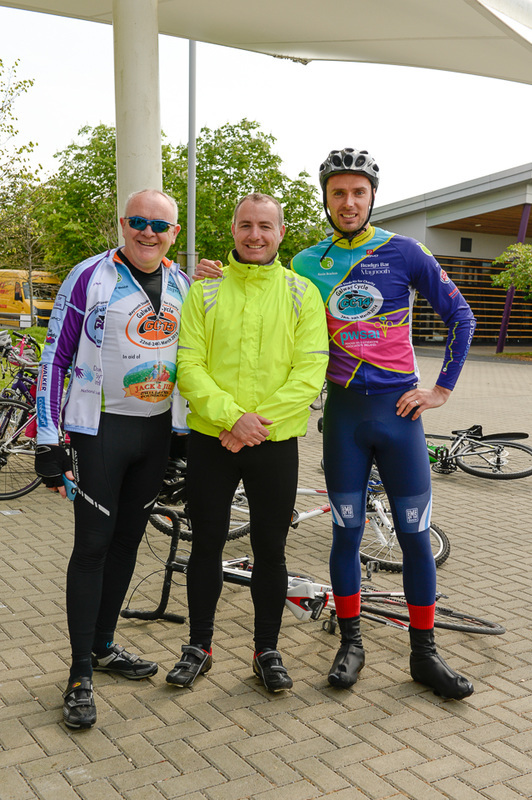 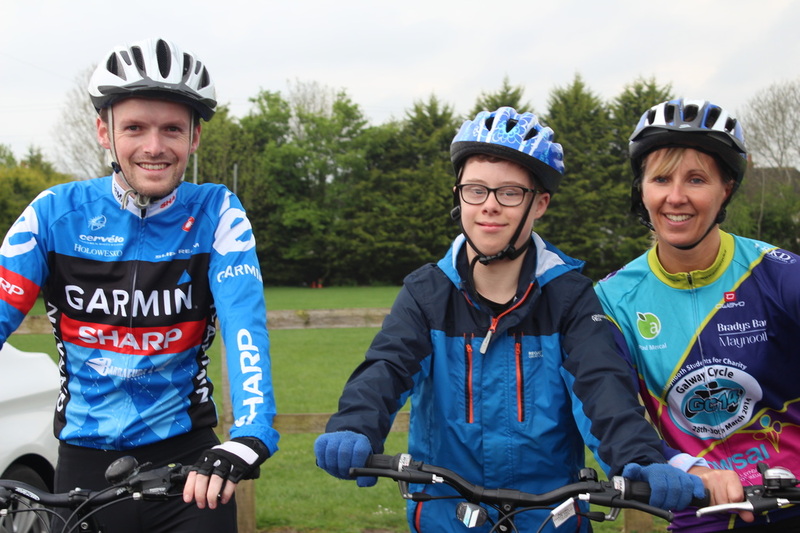 Video highlights of our cycle to Maynooth in aid of Down Syndrome Ireland have been expertly edited by local man Noel Connoly. 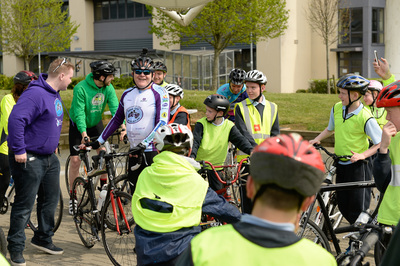 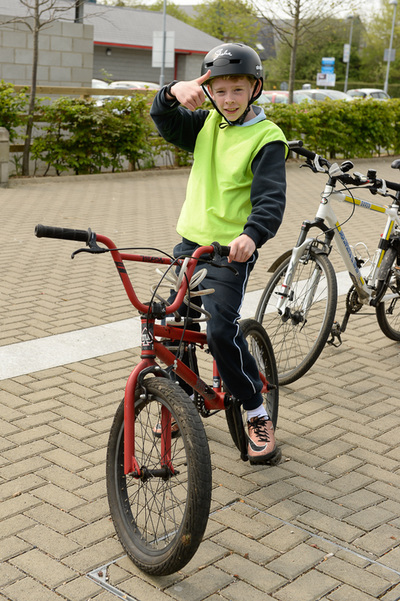 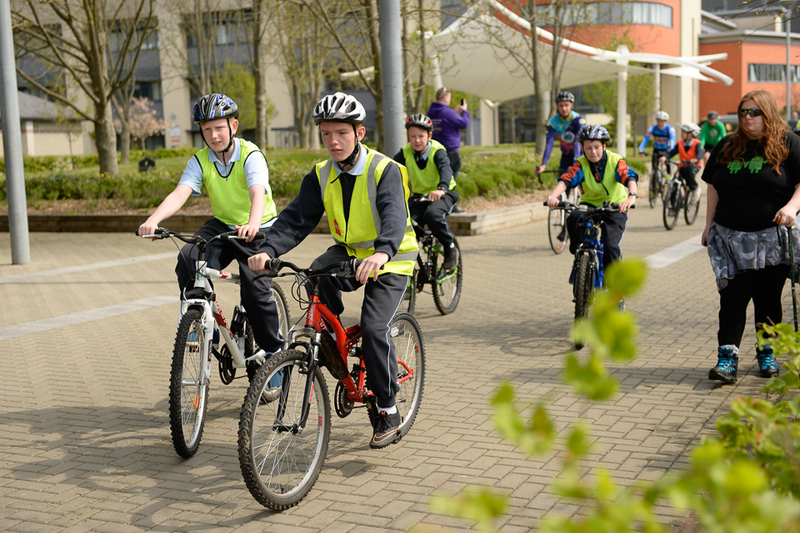 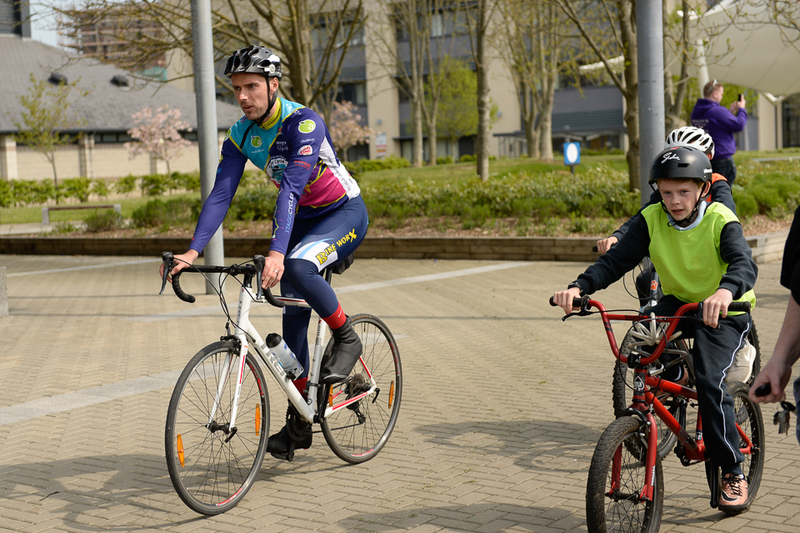 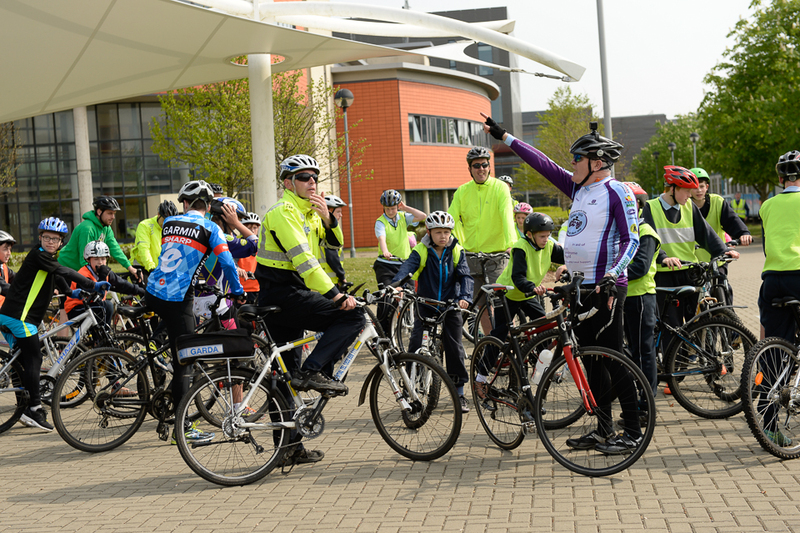 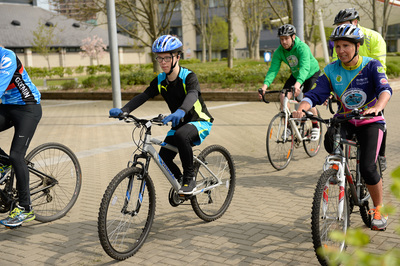 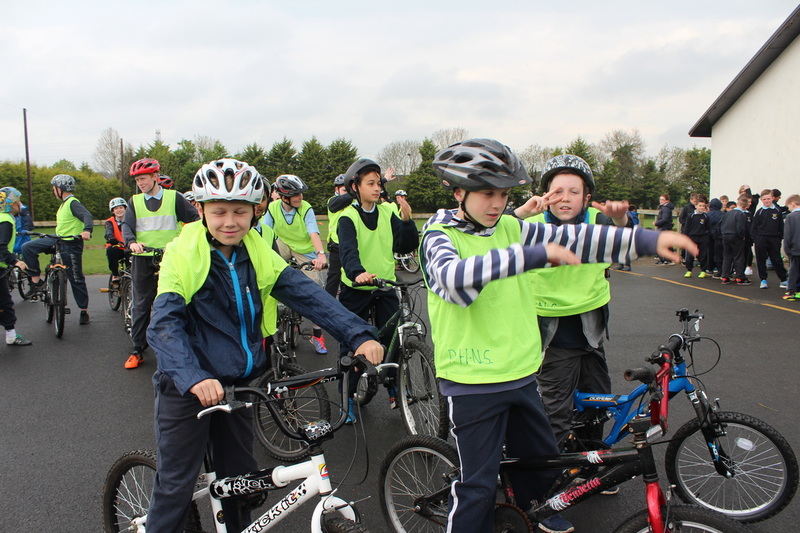 Noel who operates the Cycling Safety School taught some of our cyclists to cycle. 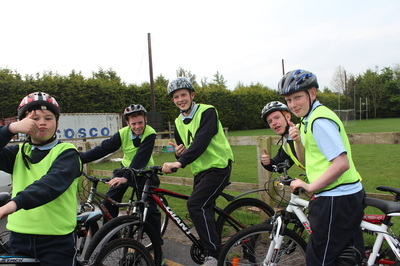 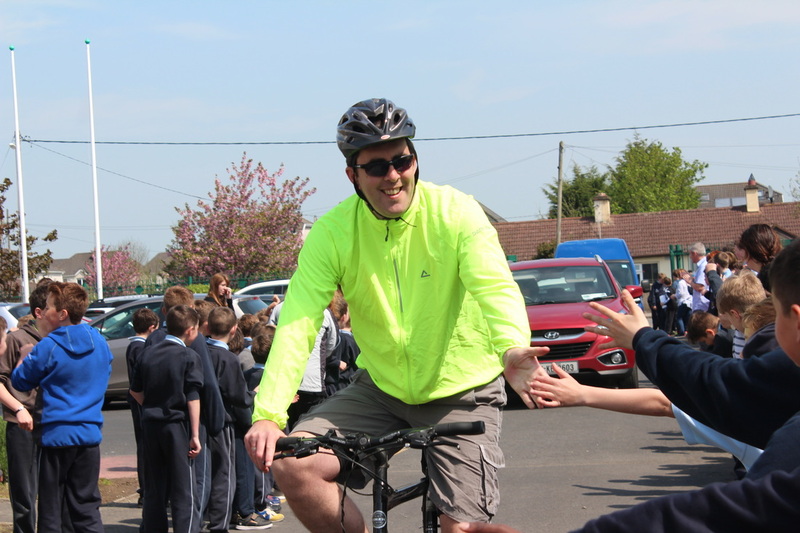 Noel has also taught some of our teachers how to teach boys to cycle and some of these pupils were also on the cycle to Maynooth. 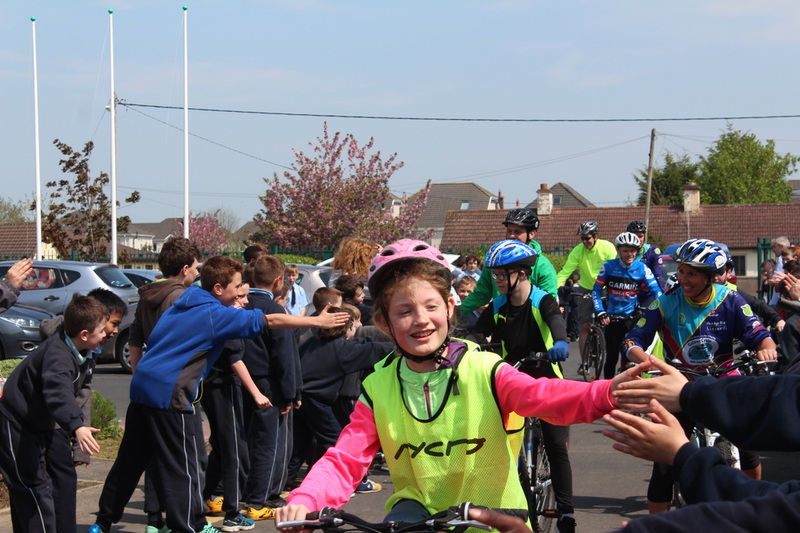 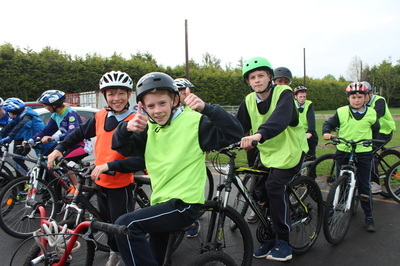 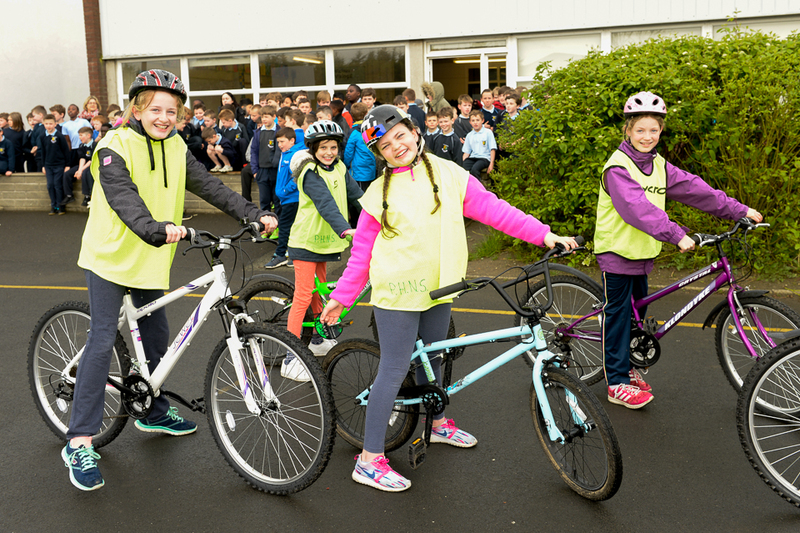 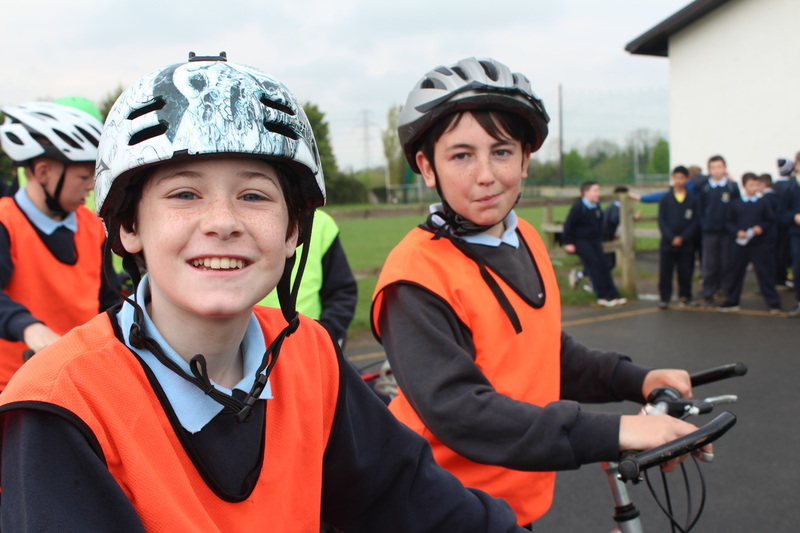 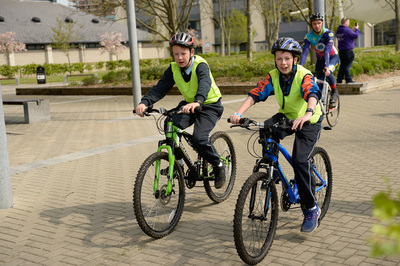 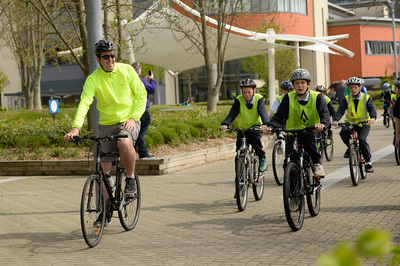 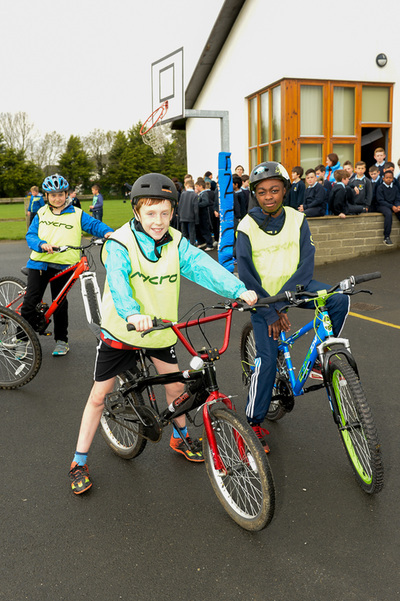 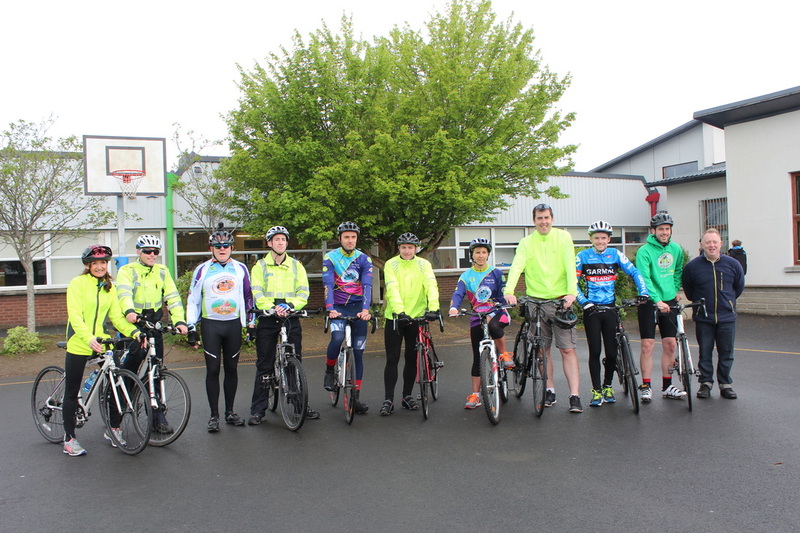 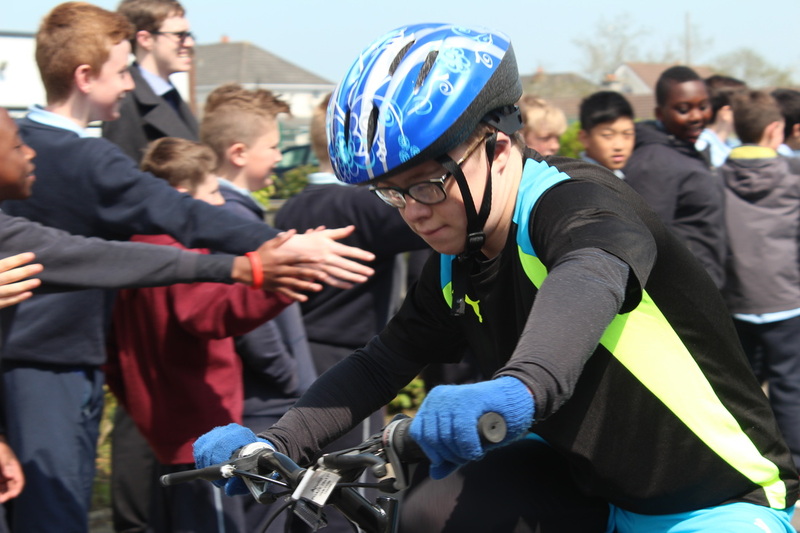 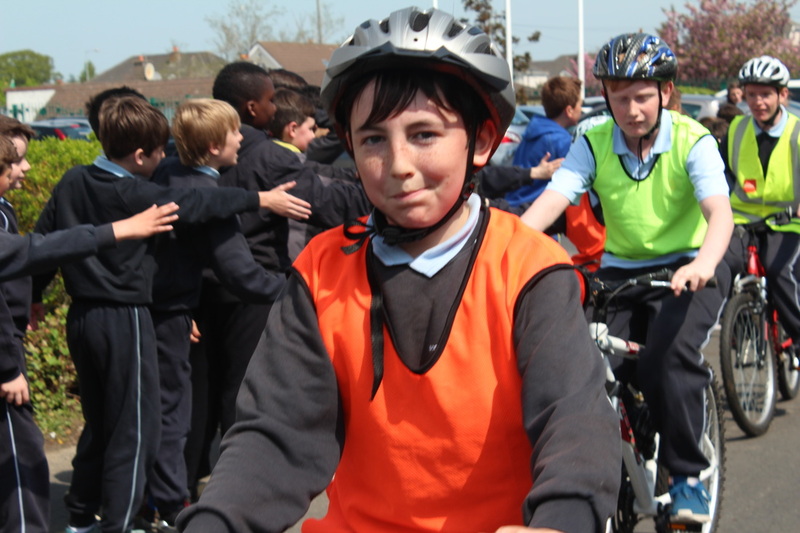 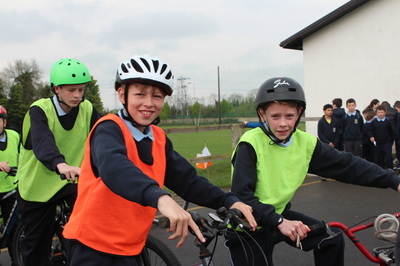 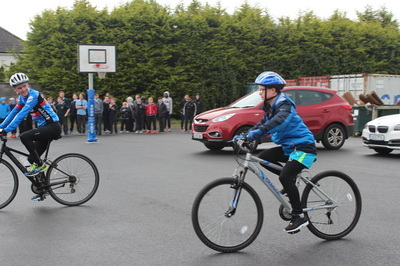 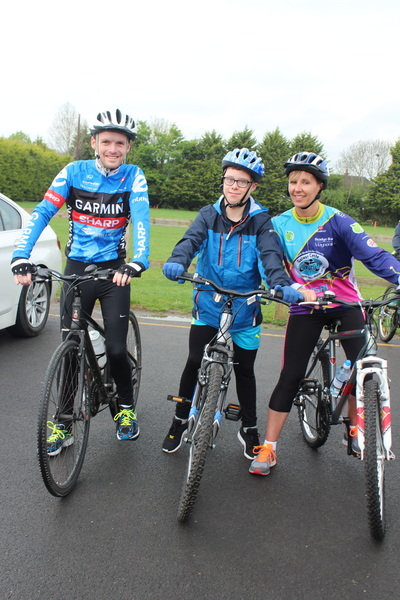 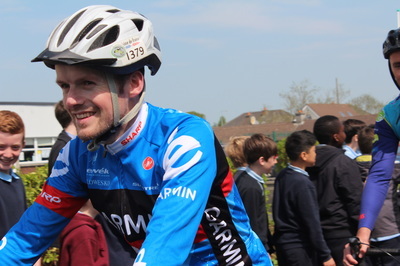 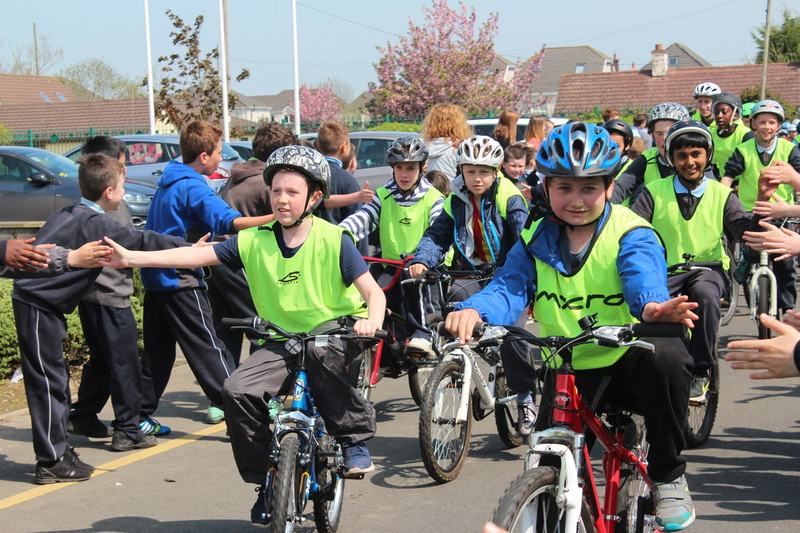 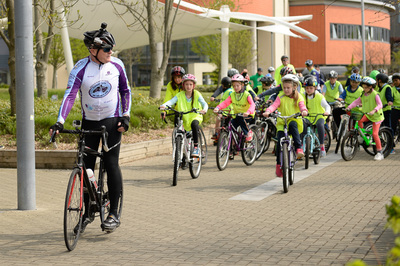 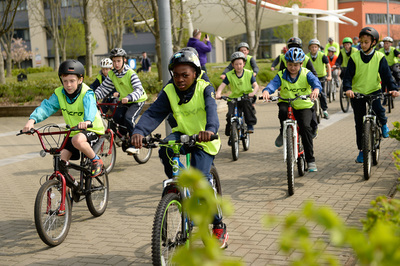 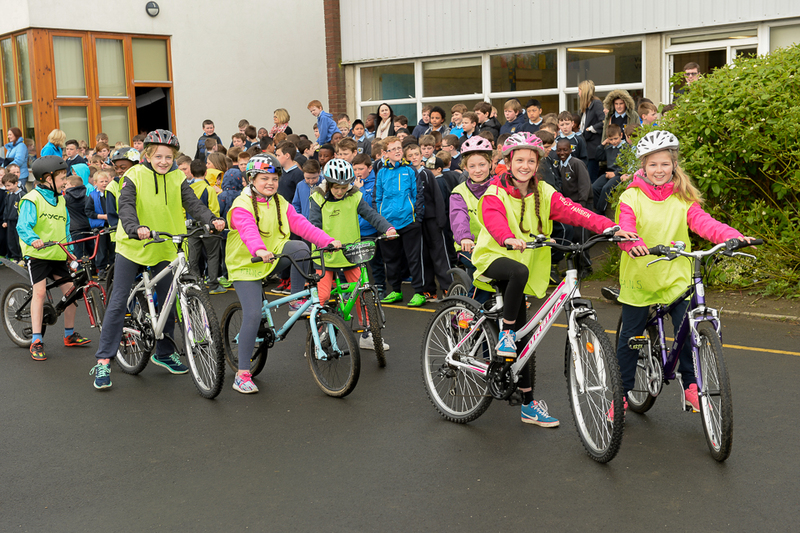 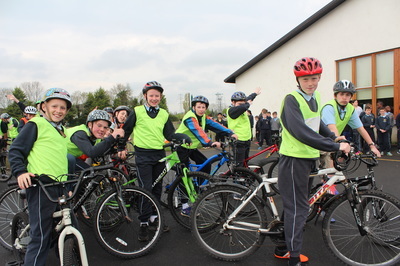 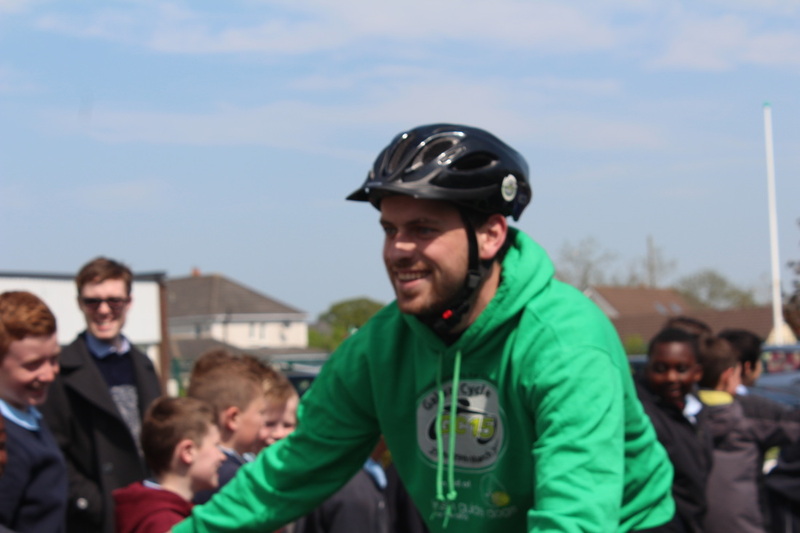 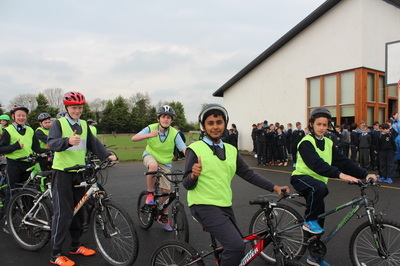 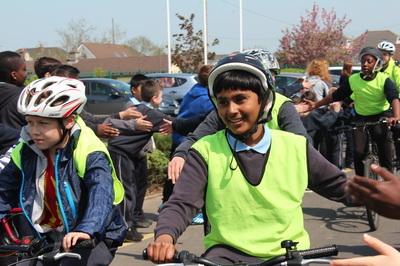 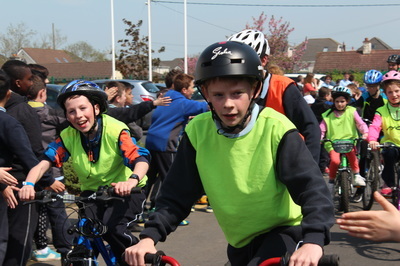 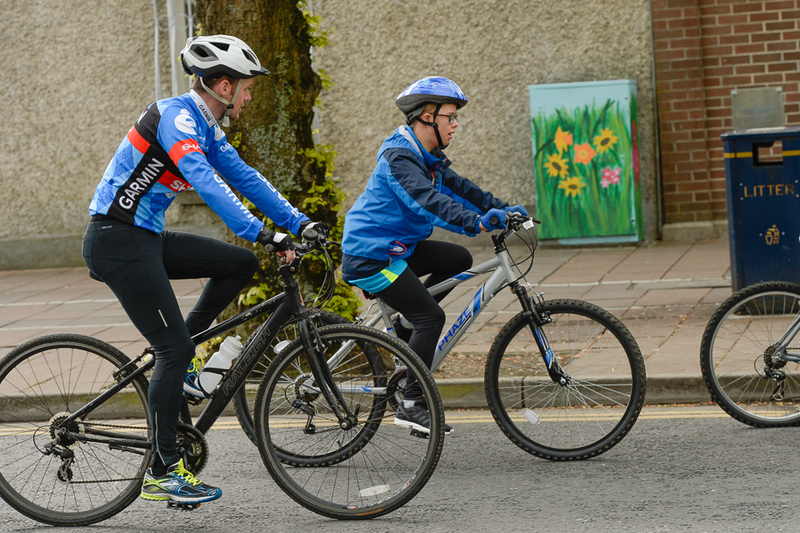 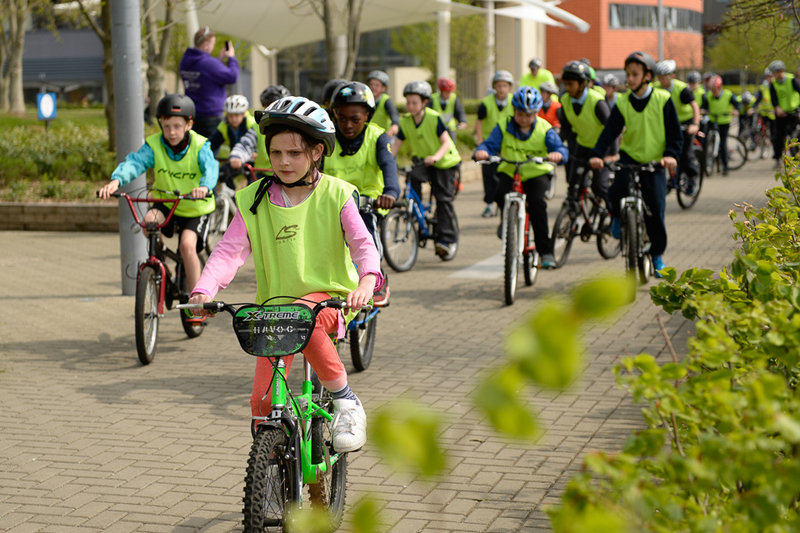 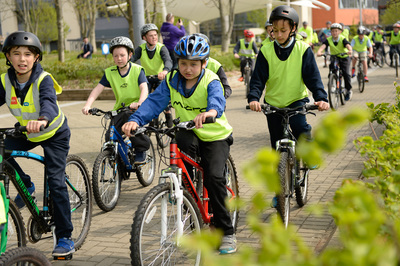 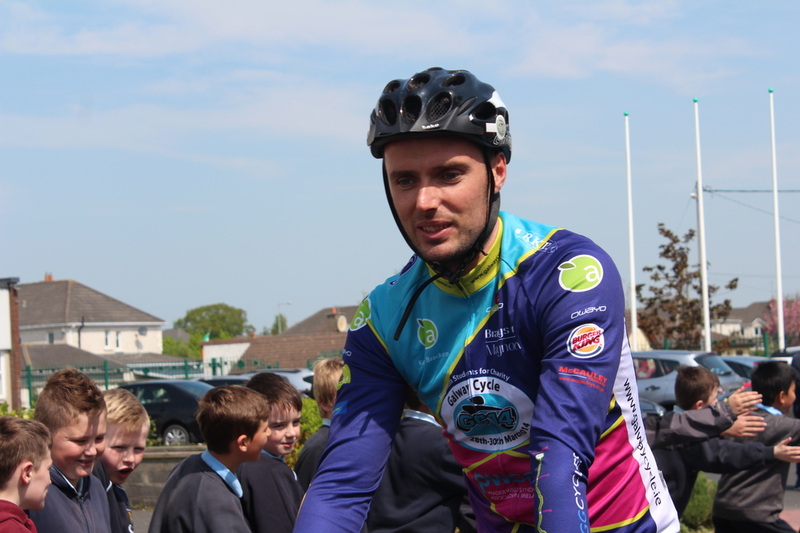 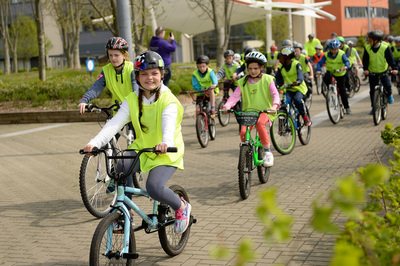 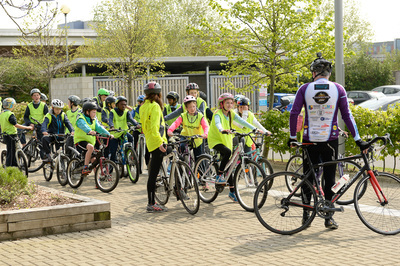 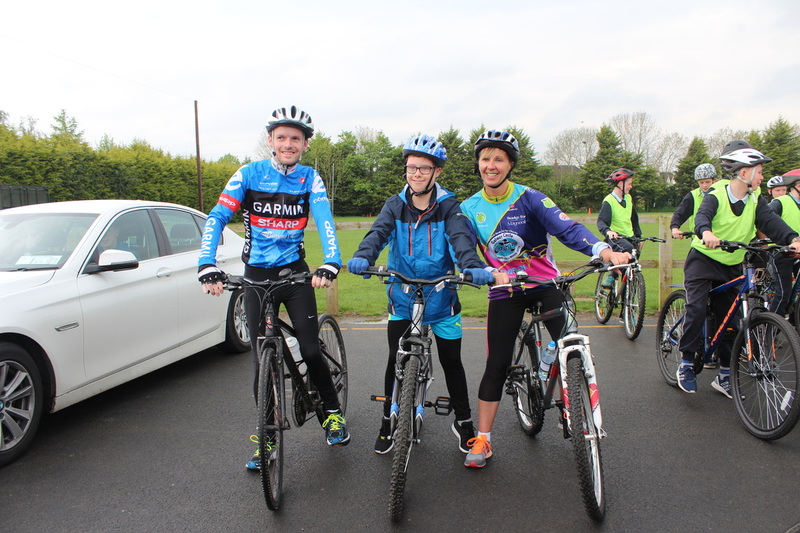 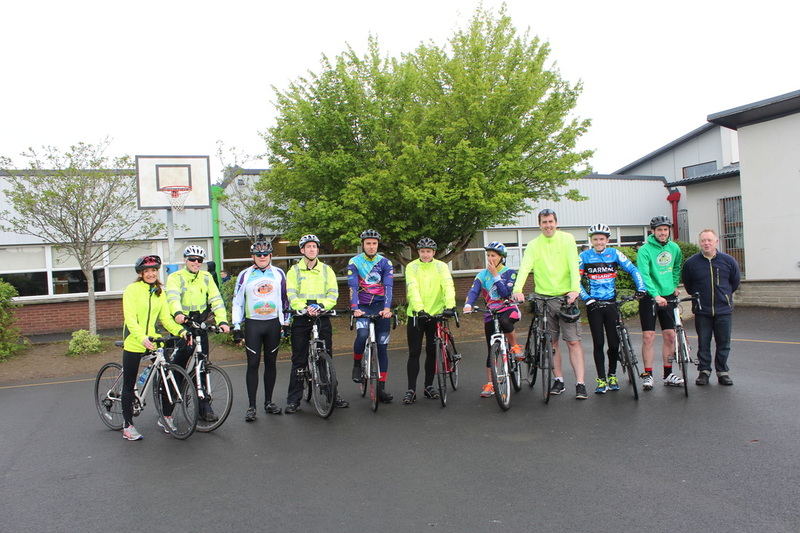 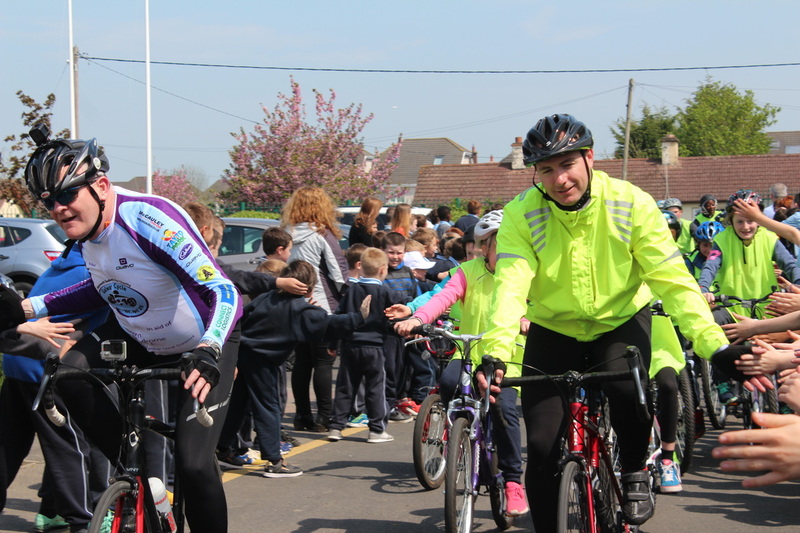 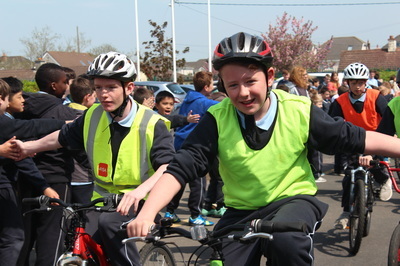 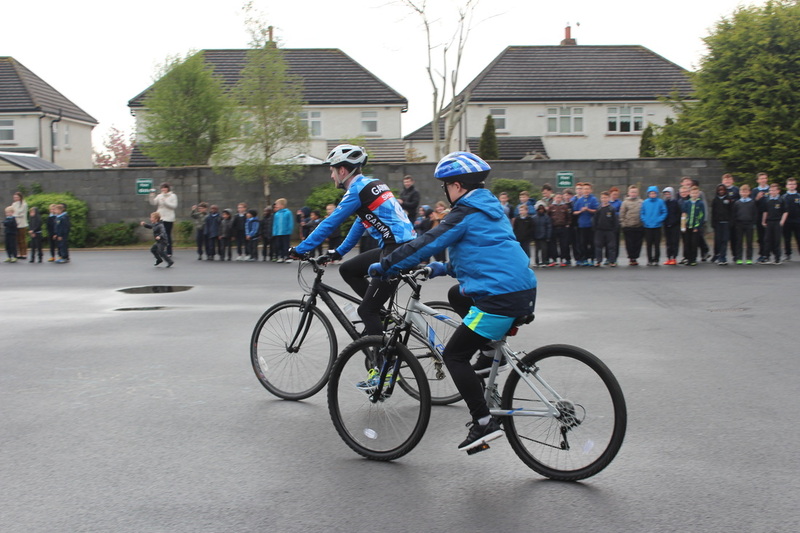 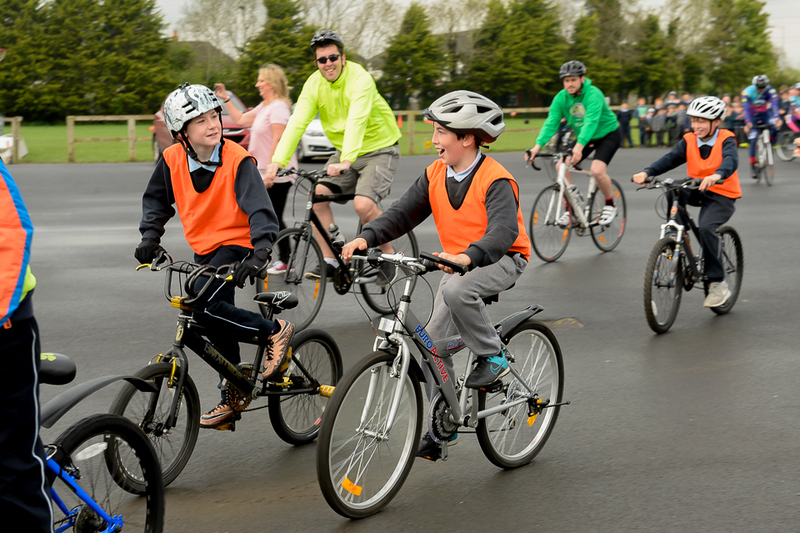 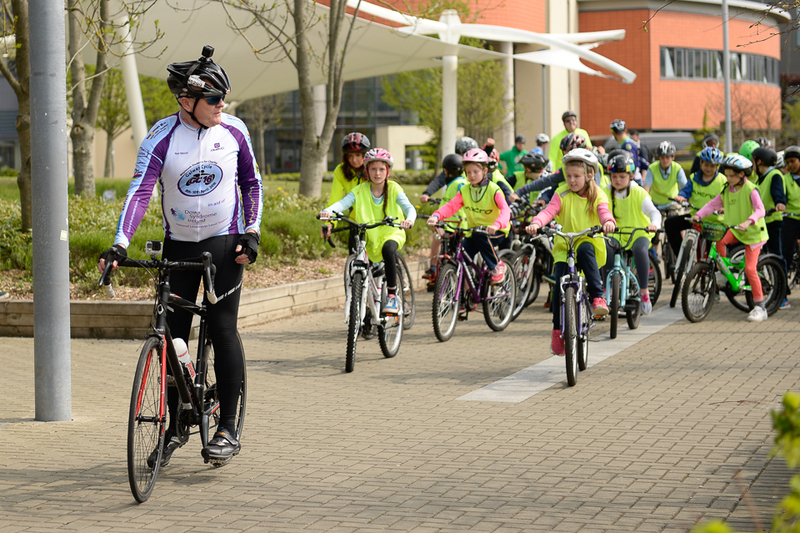 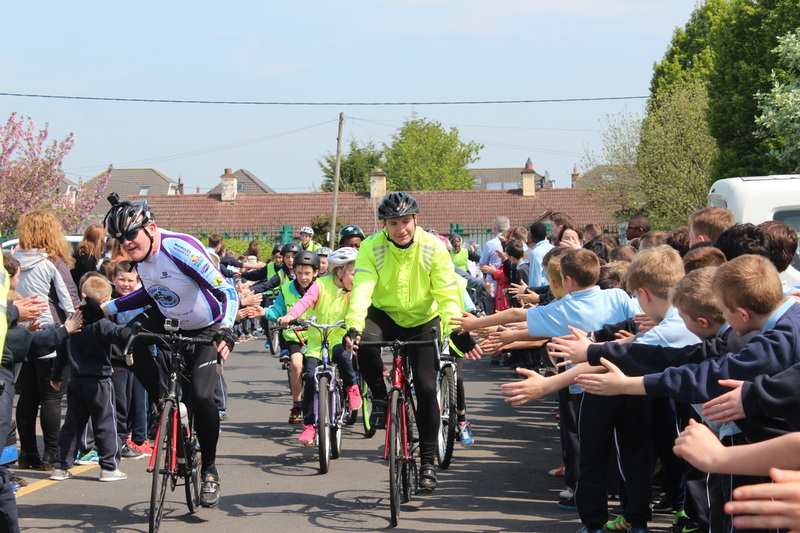 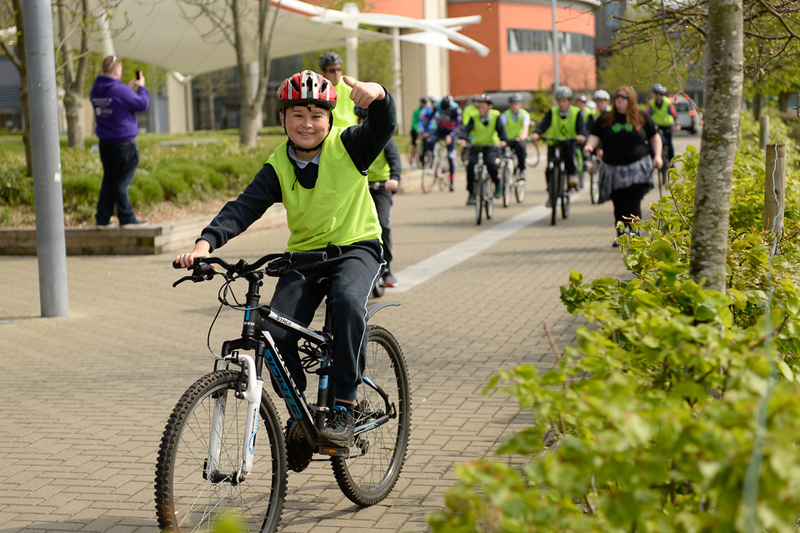 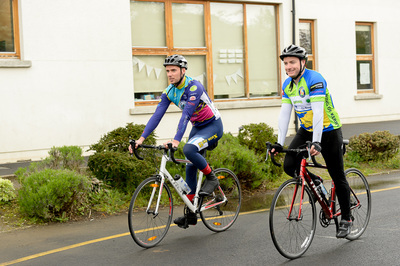 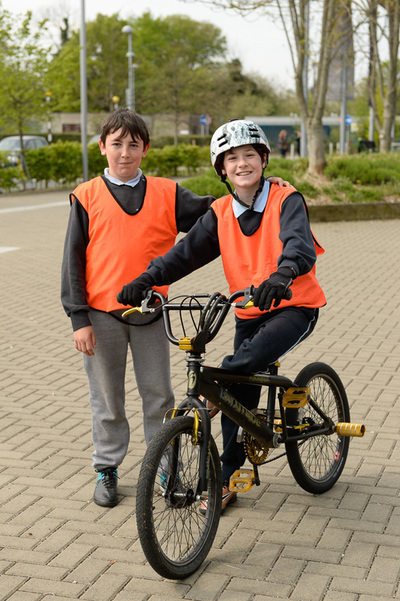 The video captures some of the magic of this memorable day and will whet the appetite of our 5th class pupils who will take part in next years cycle in aid of another charity! Enjoy! 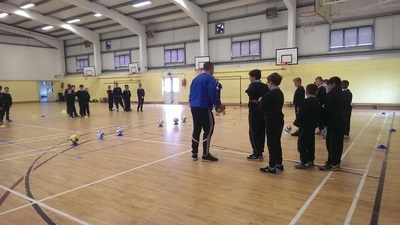 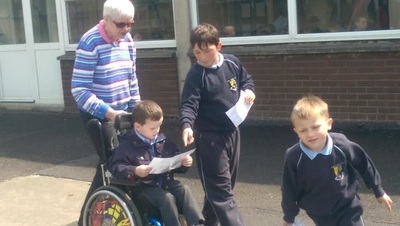 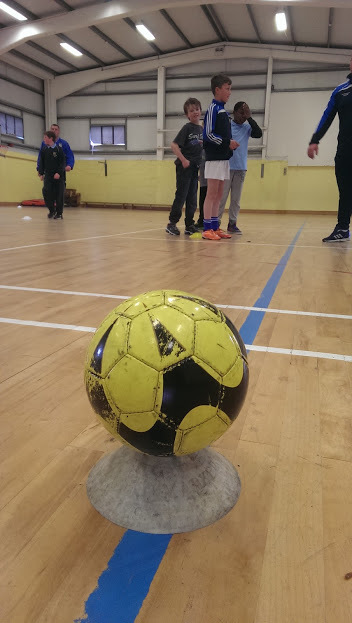 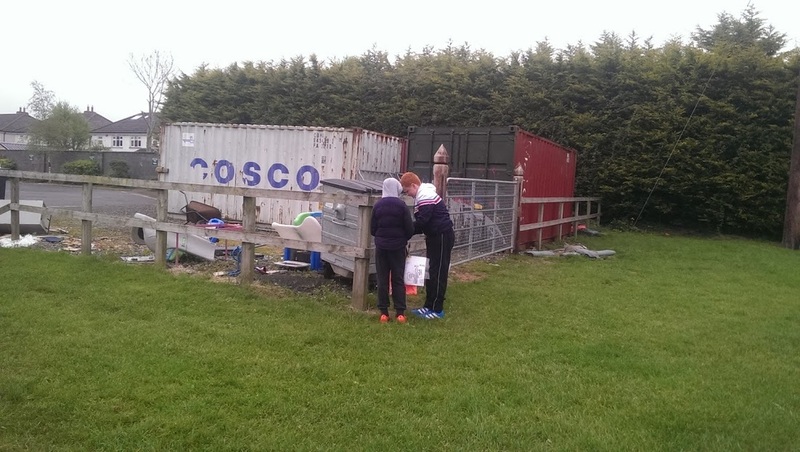 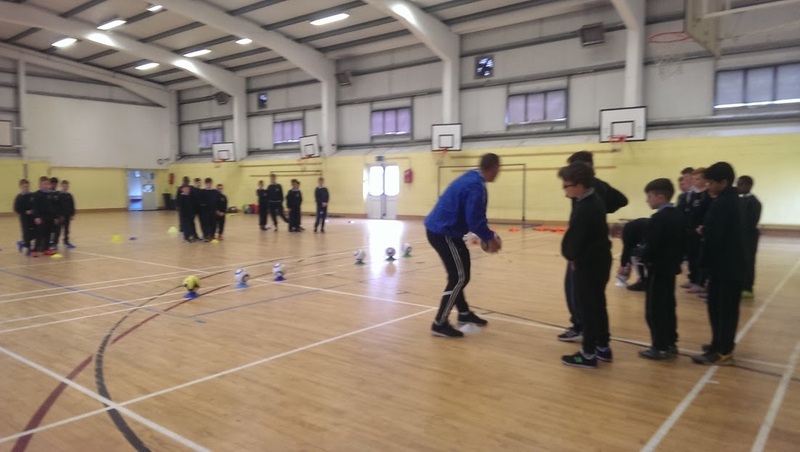 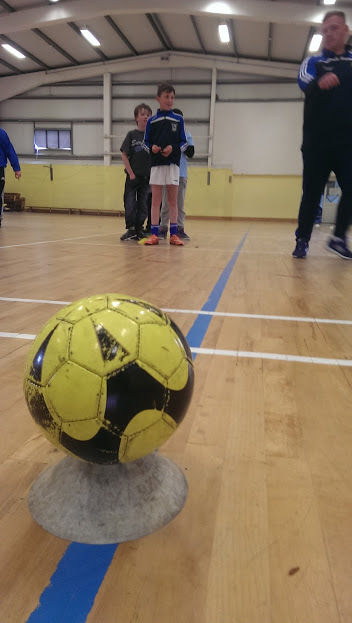 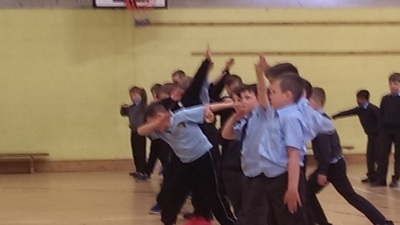 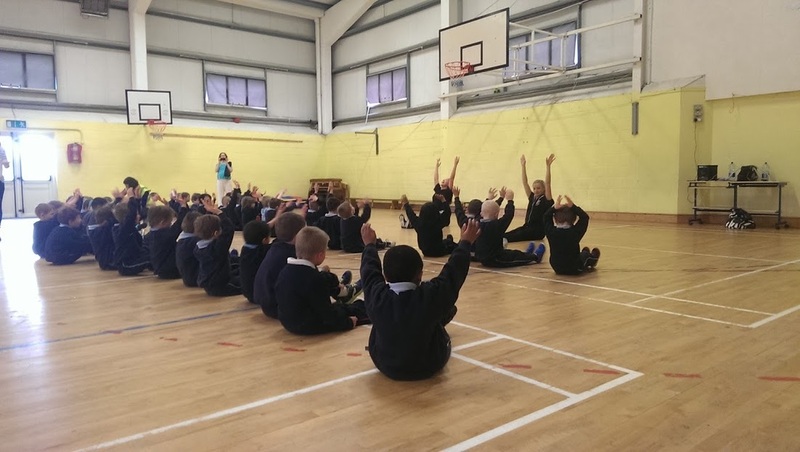 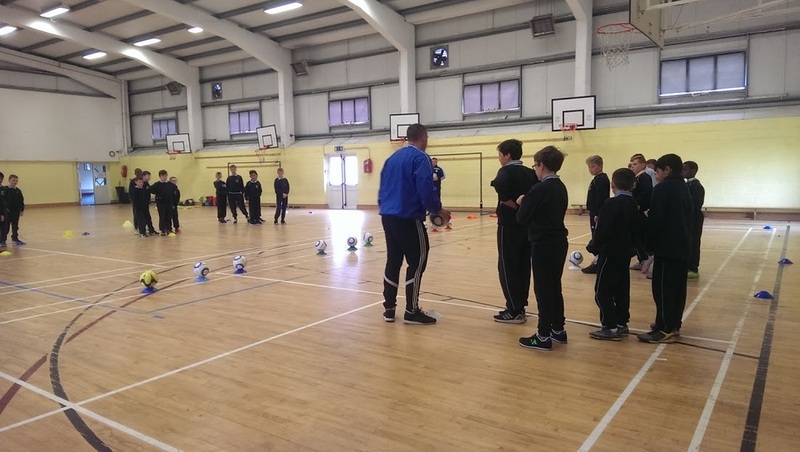 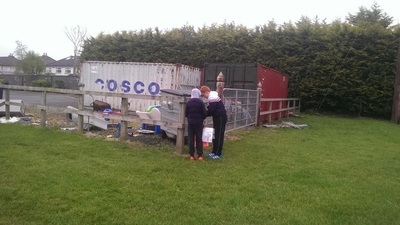 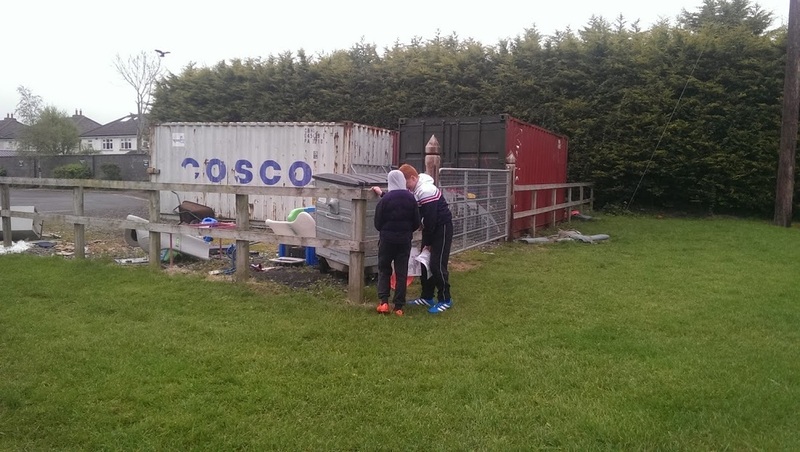 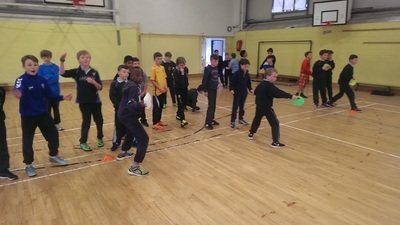 One of our aims of Active Schools Week in Scoil Na Mainistreach has been to introduce the pupils to activities in the community that ordinarily they might not have been involved in. 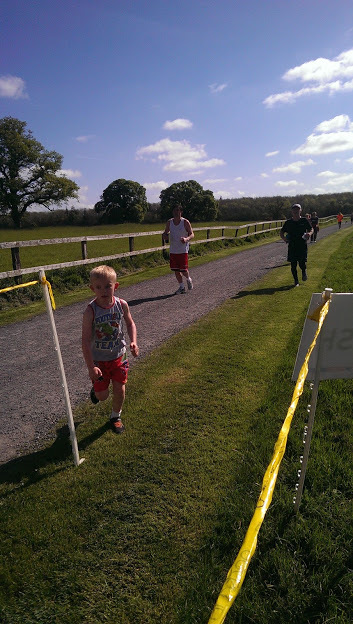 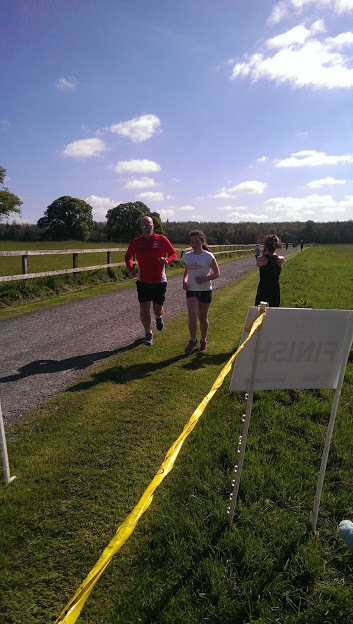 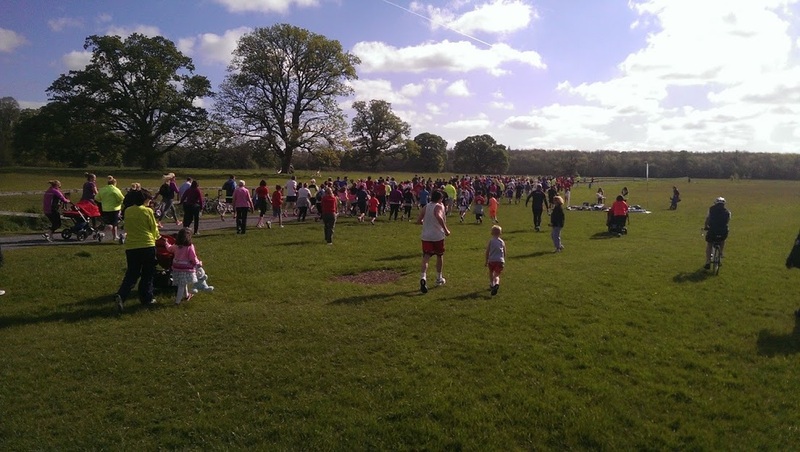 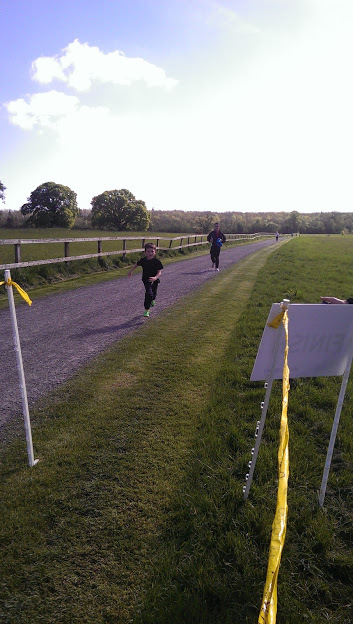 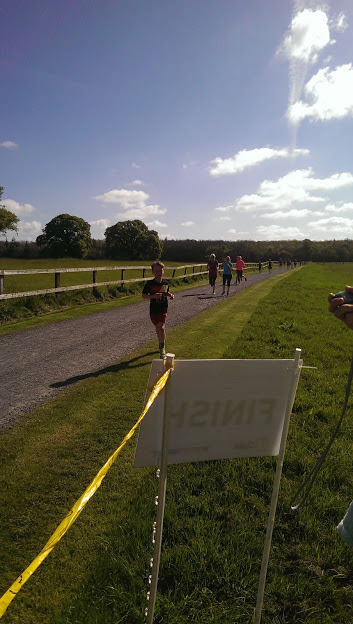 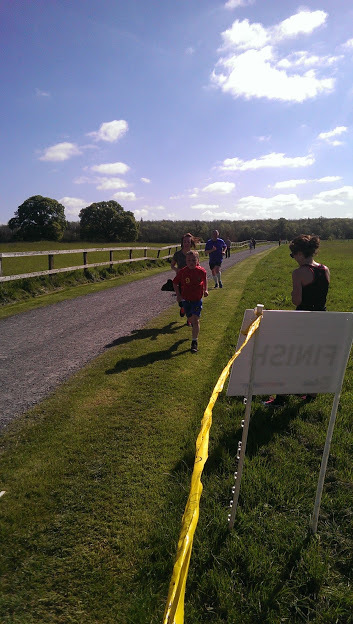 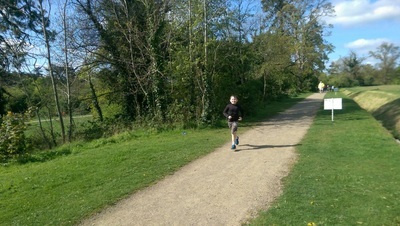 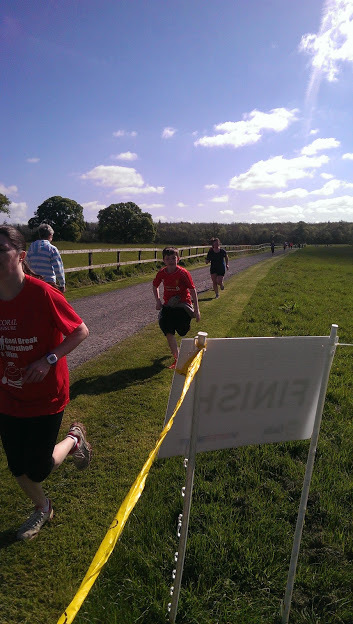 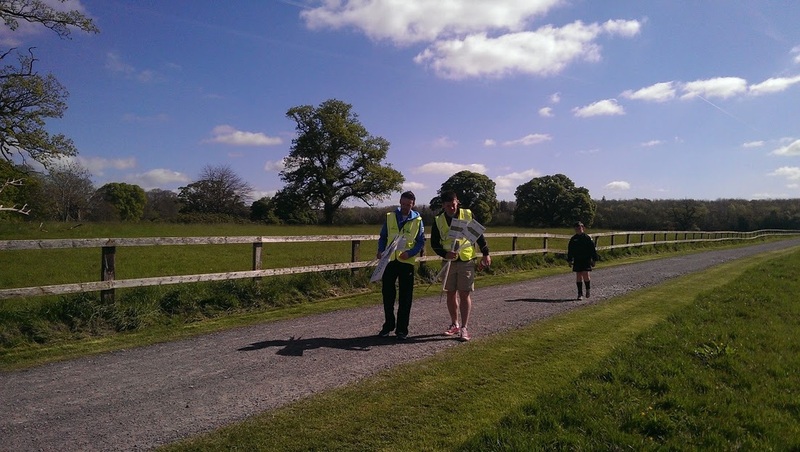 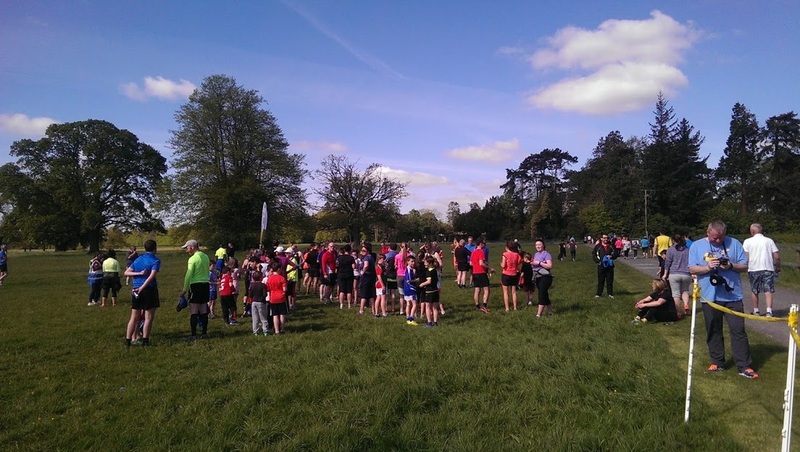 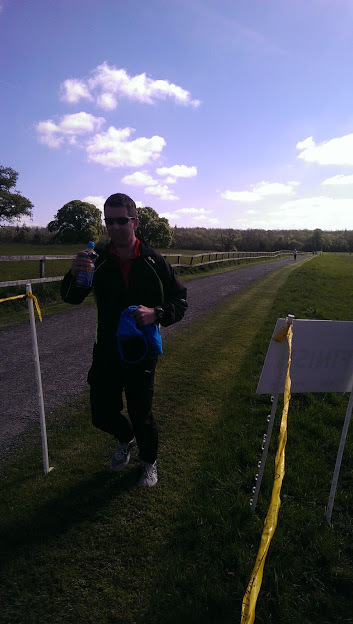 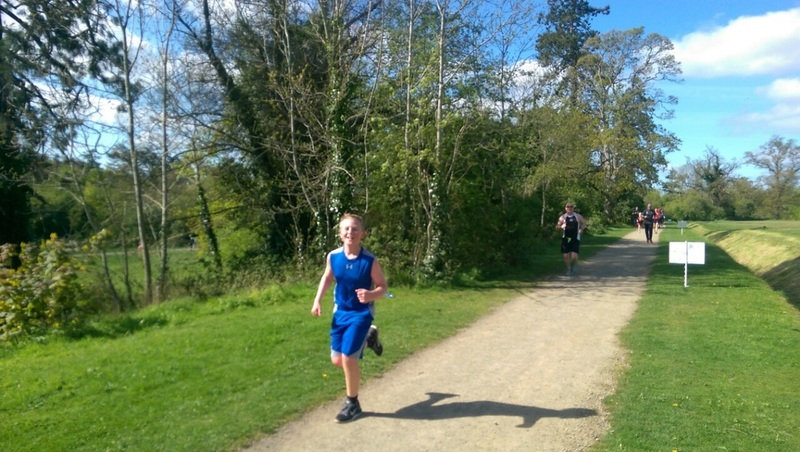 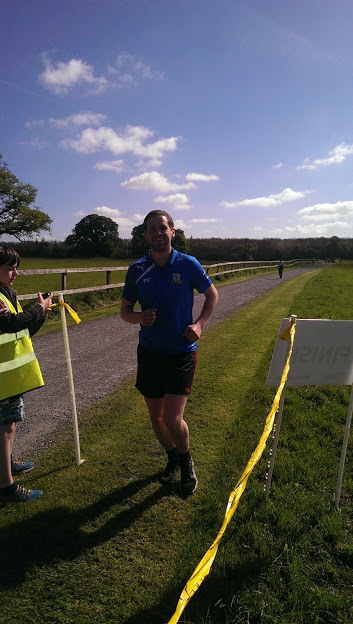 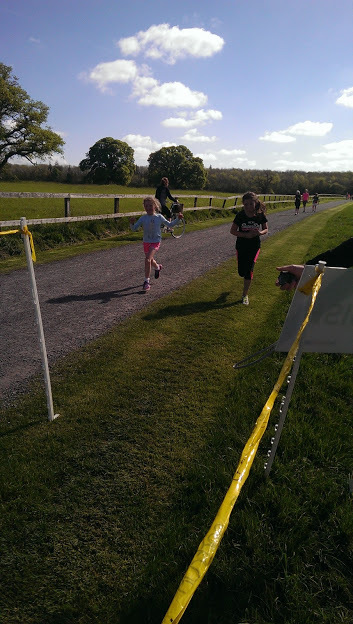 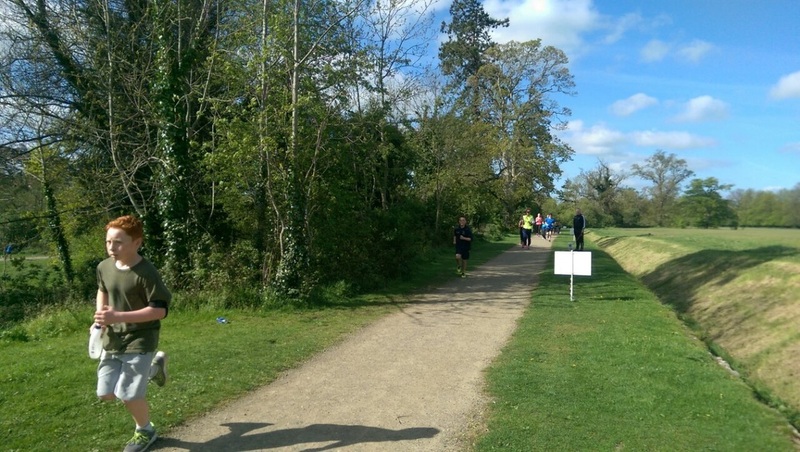 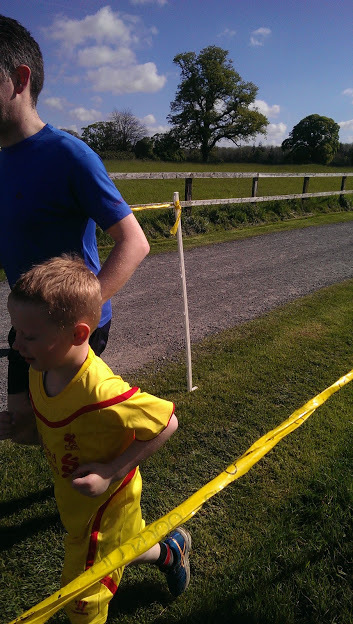 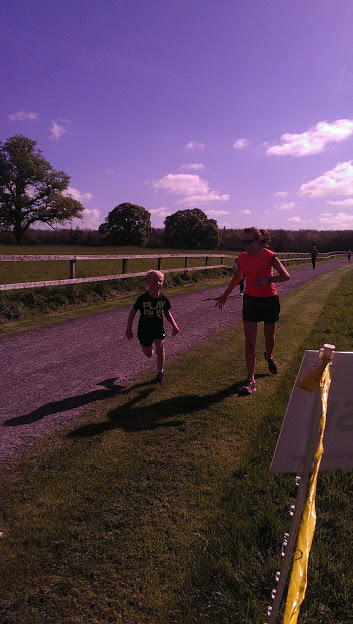 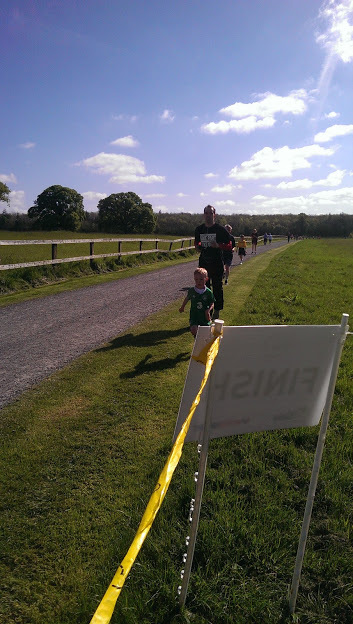 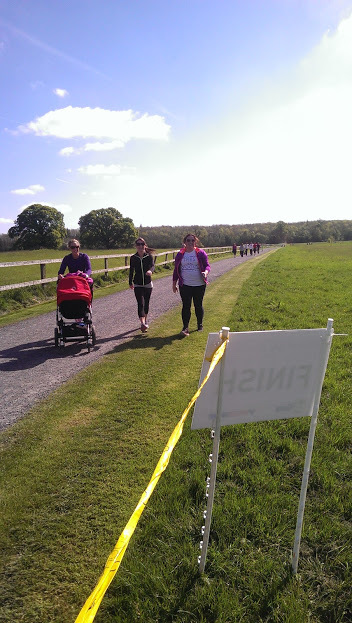 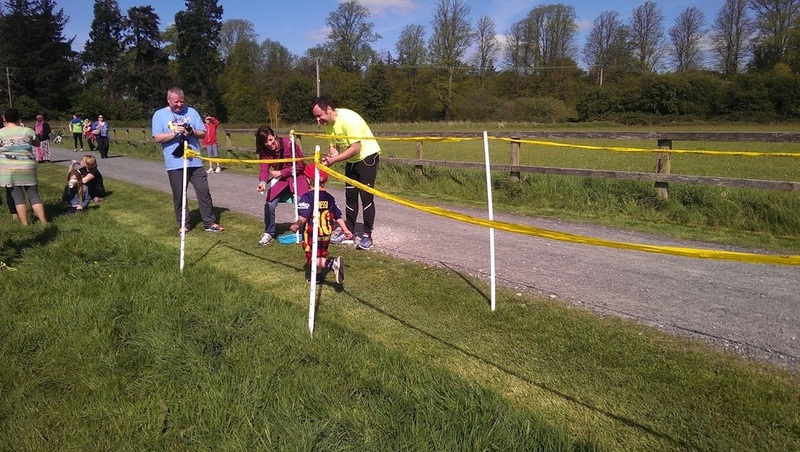 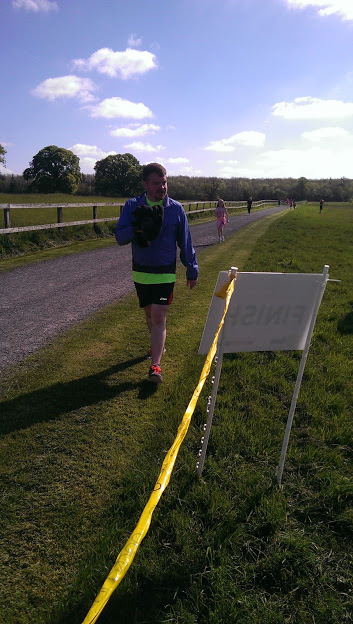 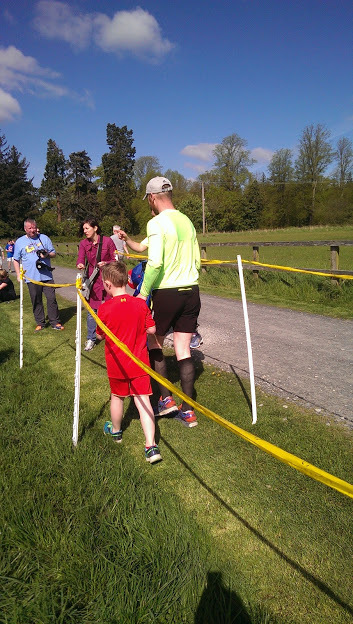 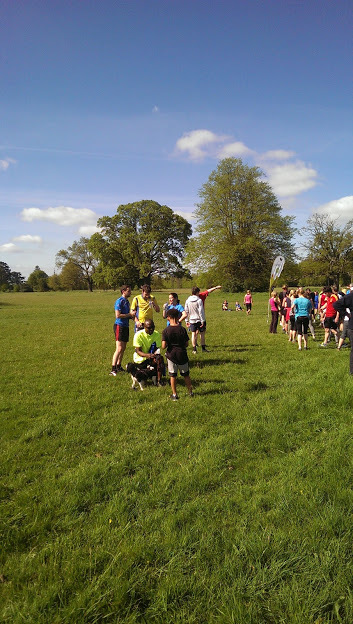 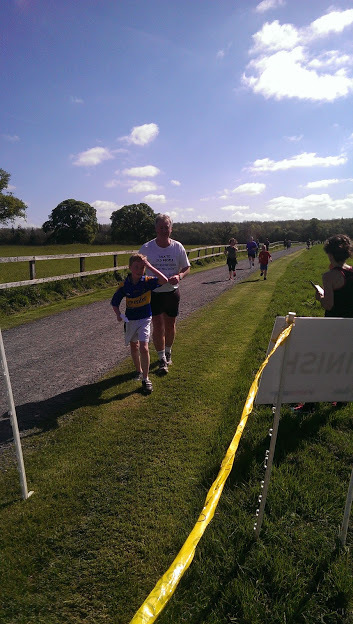 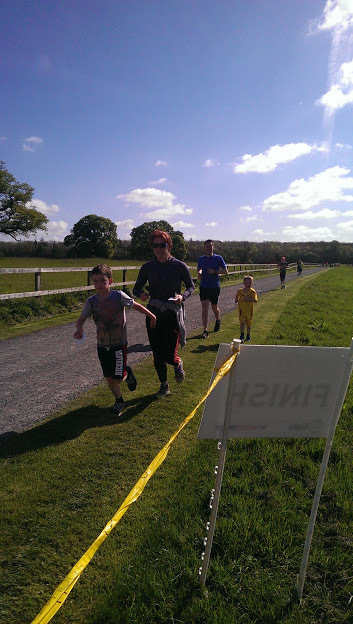 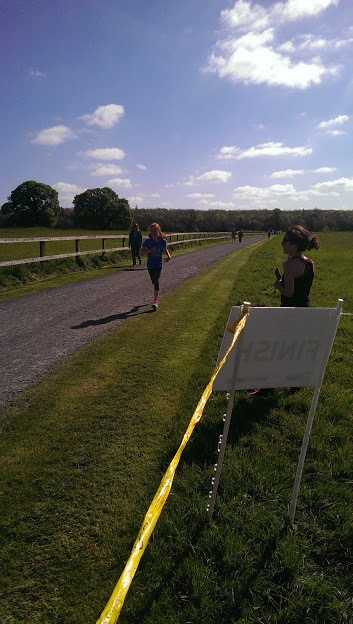 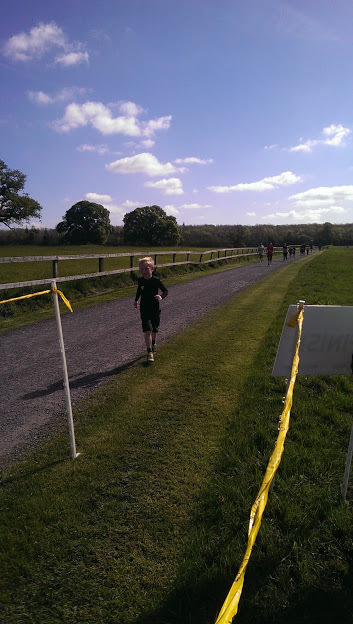 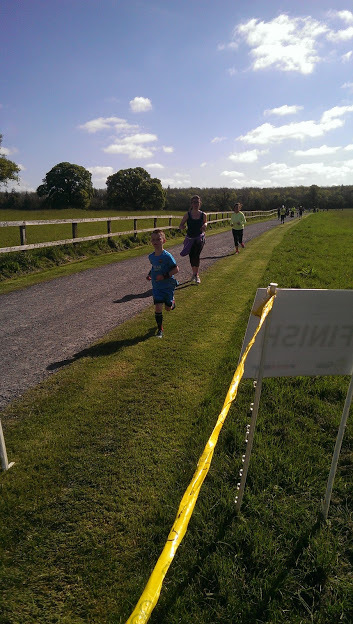 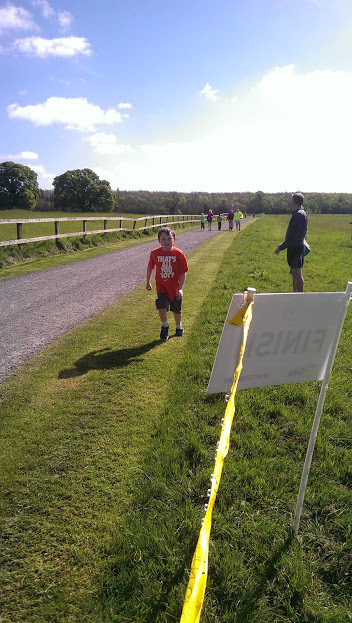 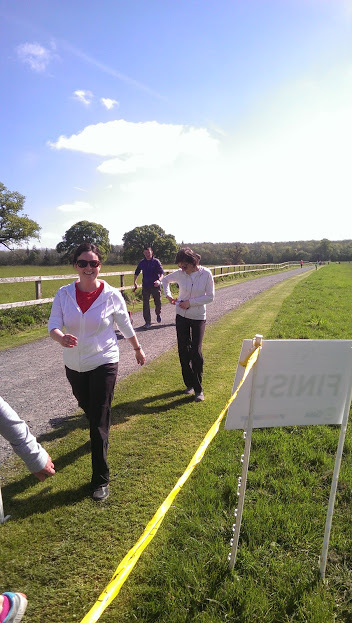 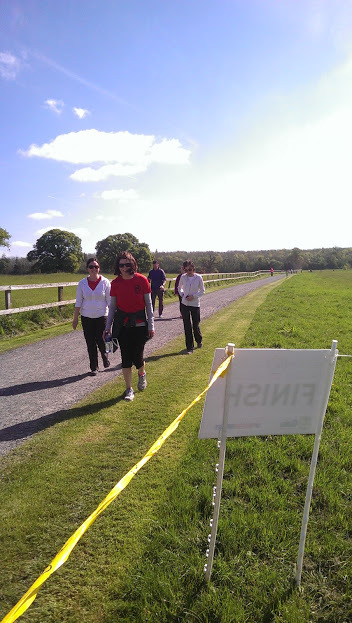 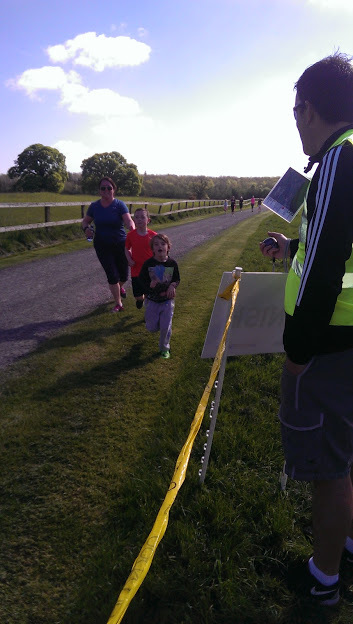 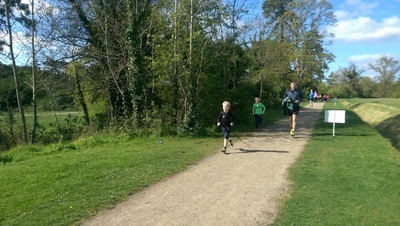 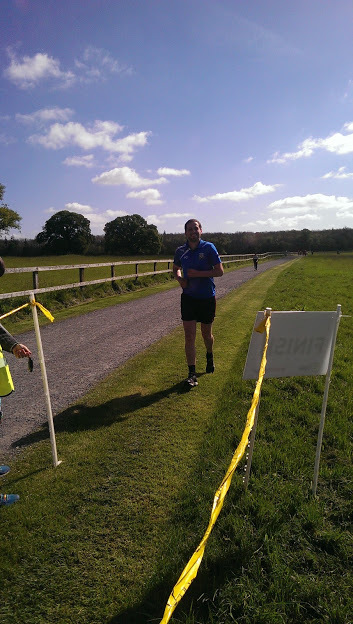 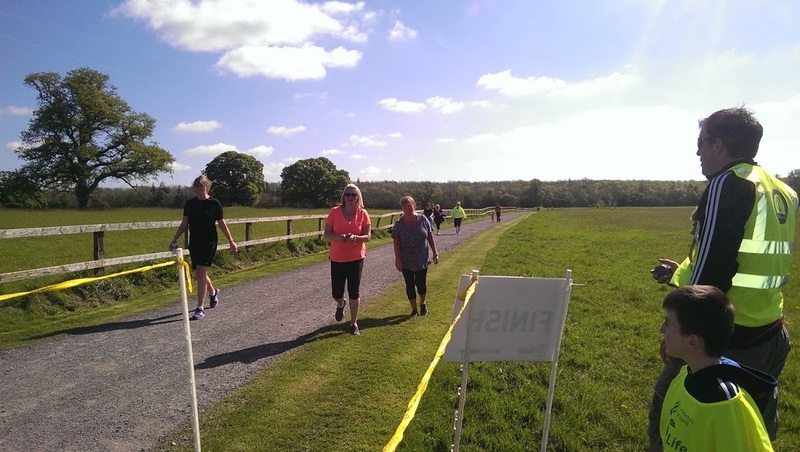 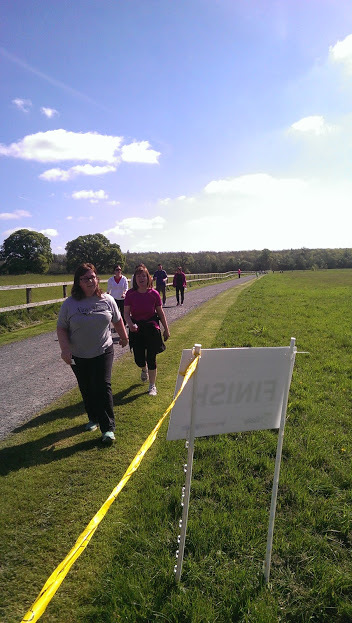 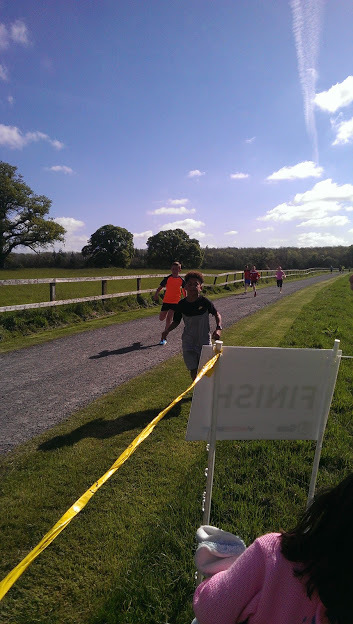 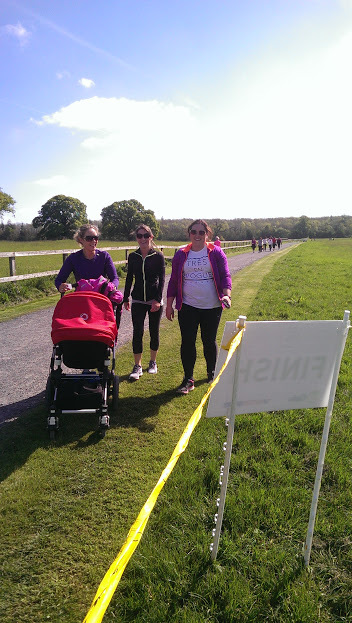 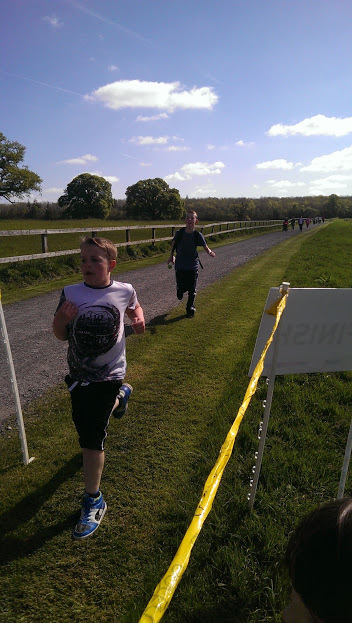 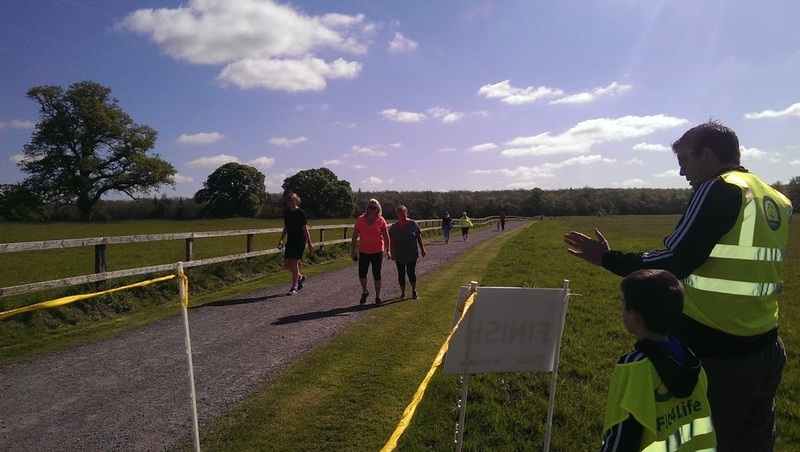 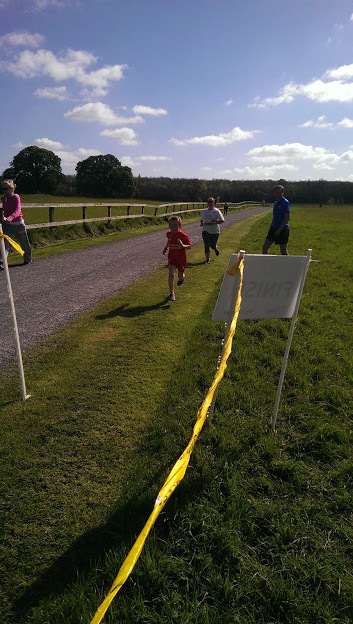 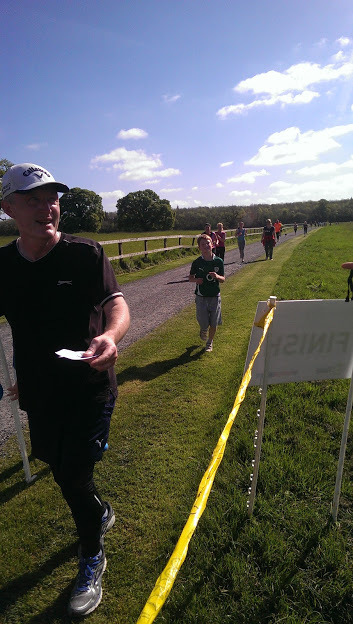 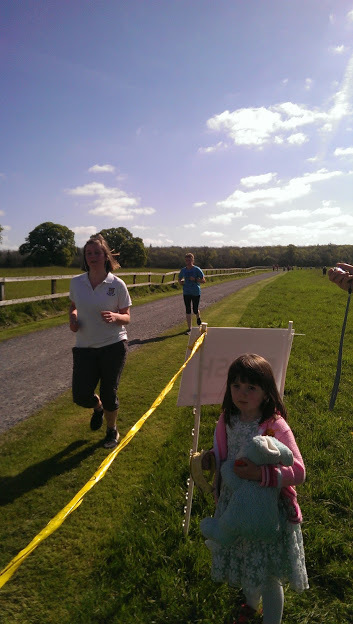 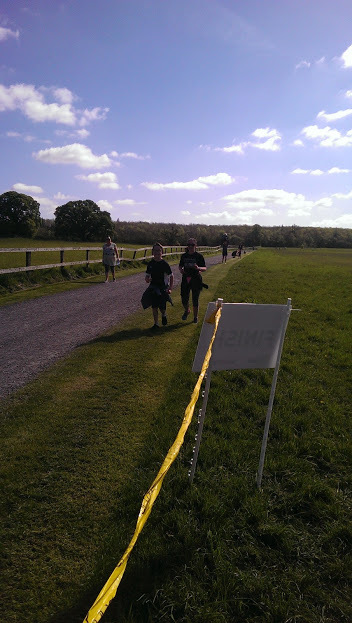 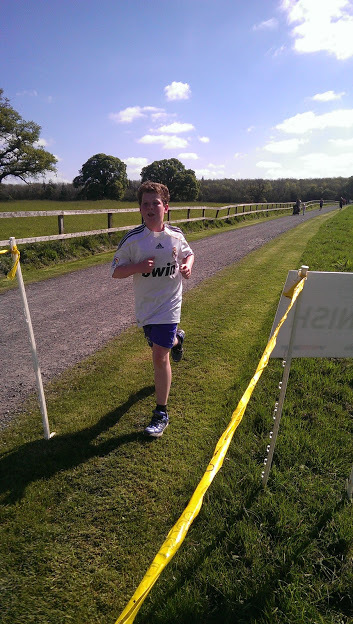 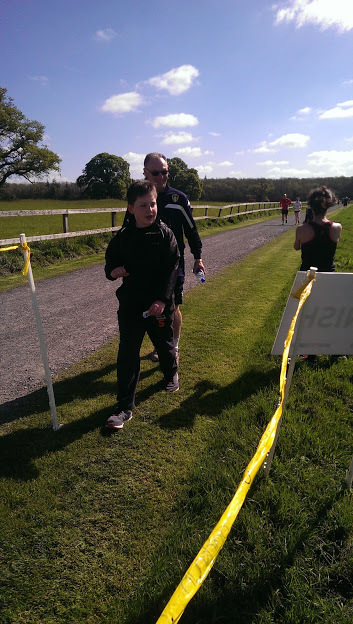 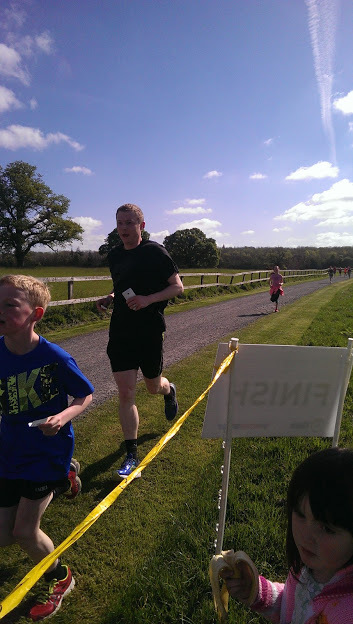 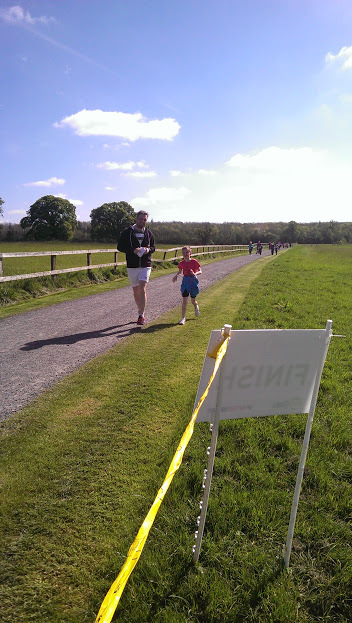 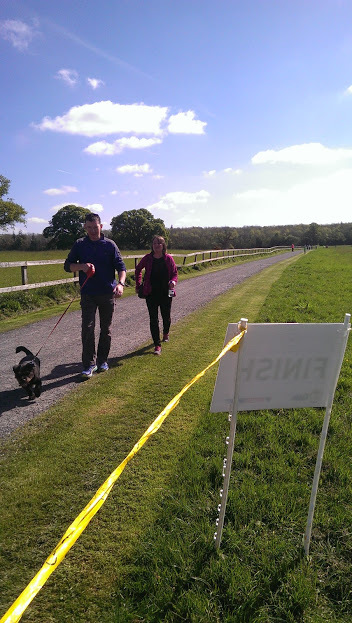 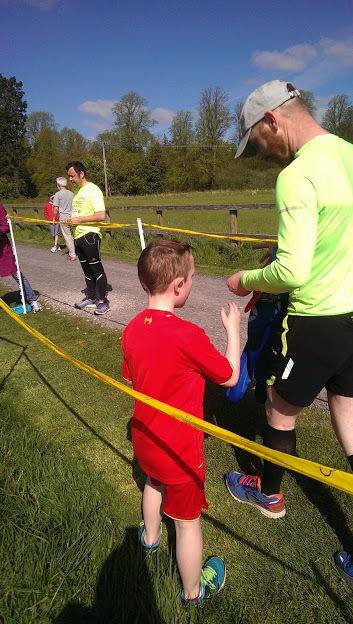 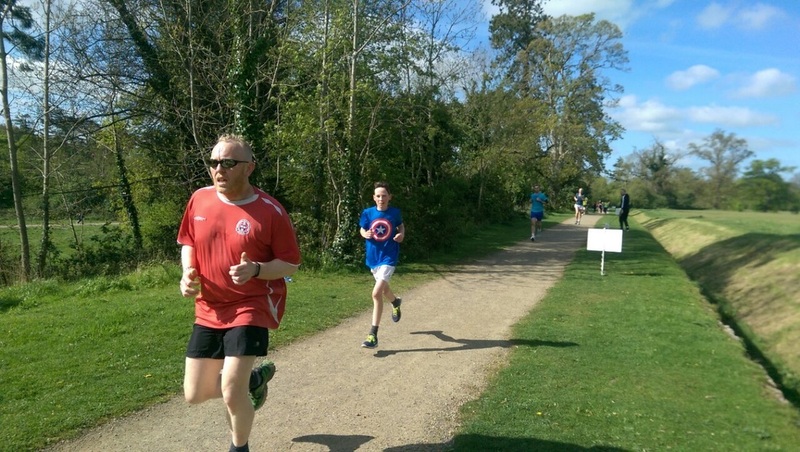 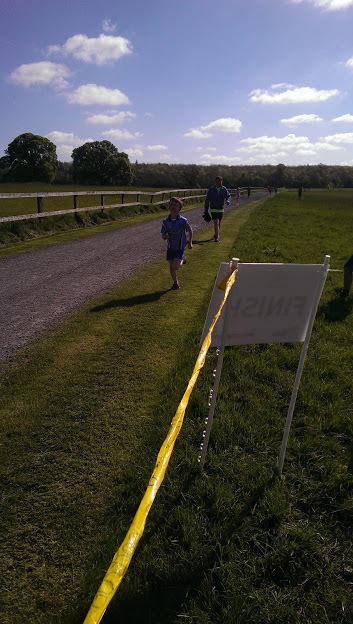 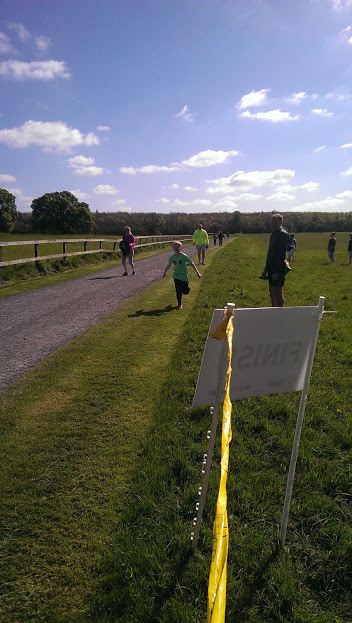 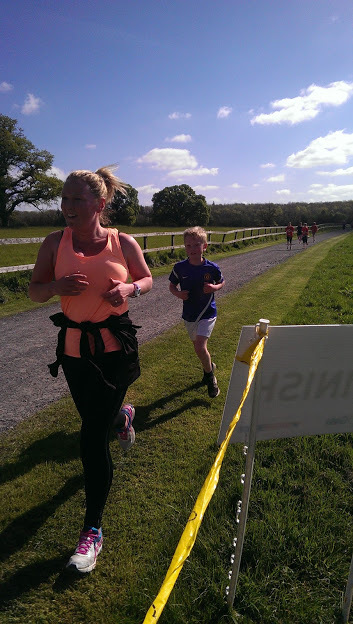 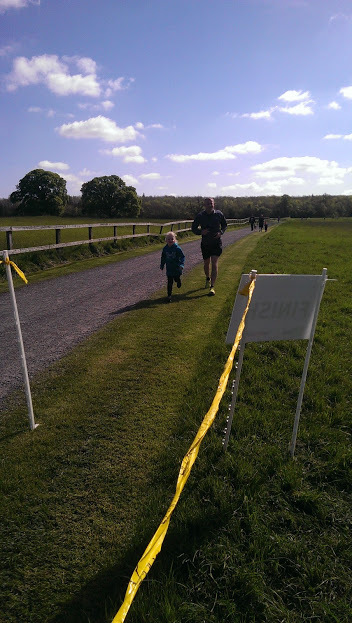 One such activity that we identified was the weekly 5KM parkrun that takes place on Saturday mornings at 9.30 on the grounds of Castletown estate. 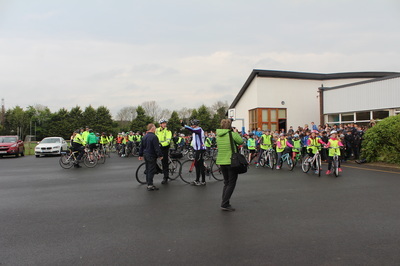 Mr Tyrrell was tasked with the organisation of the event from the school side of things and this mornings turnout was just reward for the time and effort he put in over the last few weeks. 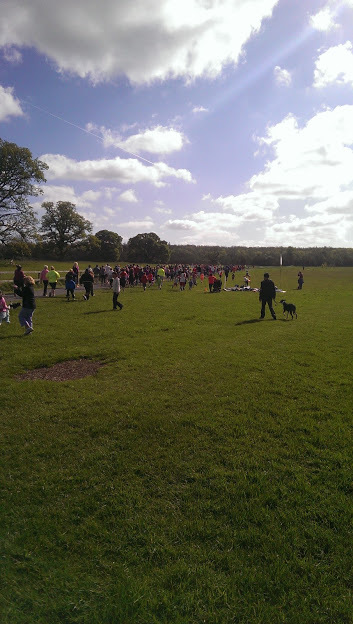 We had an outstanding representation of pupils, parents, families, staff and friends of Scoil Na Mainistreach at the start line this morning, many taking part in parkrun for the first time. 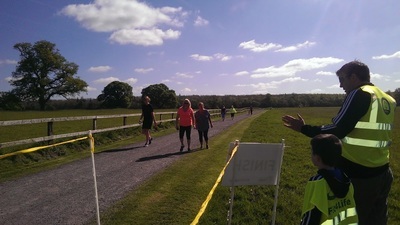 Entrants ran, jogged, walked the course at their own pace on what were perfect conditions for running. Other members of the school community volunteered to help as marshalls, completing various tasks to ensure the event ran smoothly. 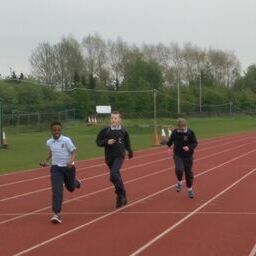 Boys who took part in this mornings run will receive a night off homework on Monday as a reward for their participation. 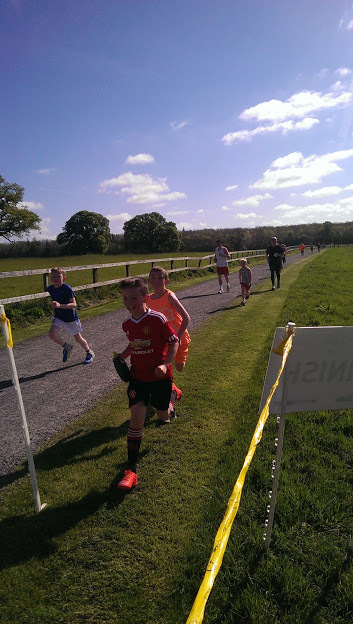 On behalf of everyone in Scoil Na Mainistreach we owe a big thanks to Sharon Ashmore of parkrun Castletown for facilitating this mornings run. 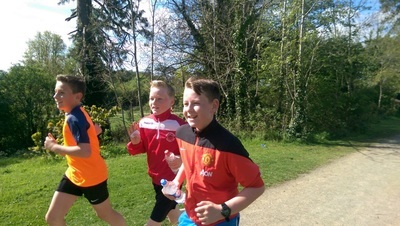 Sharon recognised from an early stage the purpose of Active Schools Week and the role parkrun could play in promoting physical activity among the school community. 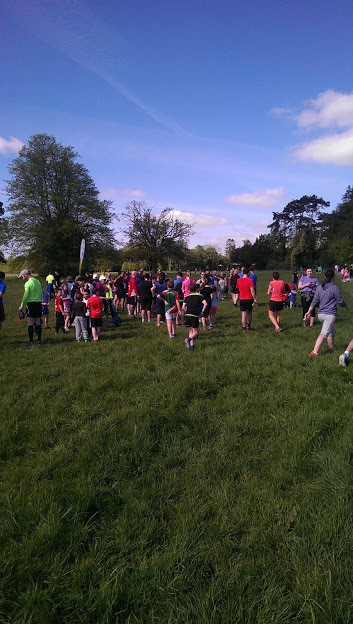 Everybody has a much better idea of the organisation and planning that must go in to parkrun on a weekly basis and we look forward to returning in the future to play our part. 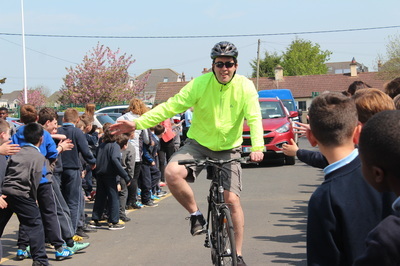 Thanks also to Mr Tyrrell for liasing with Sharon over the last few weeks and for informing the boys and their families about the event. We had a great turnout of staff members from the school and their efforts on a Saturday morning are greatly appreciated. 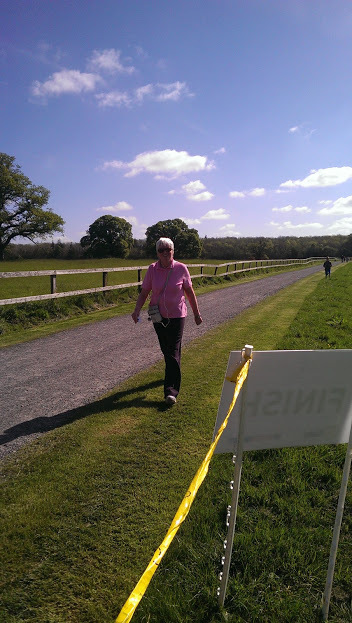 Castletown estate as always was in magnificent condition. 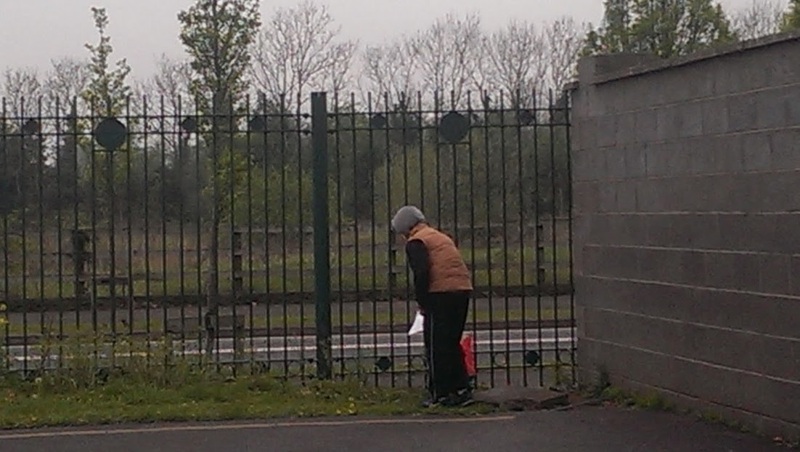 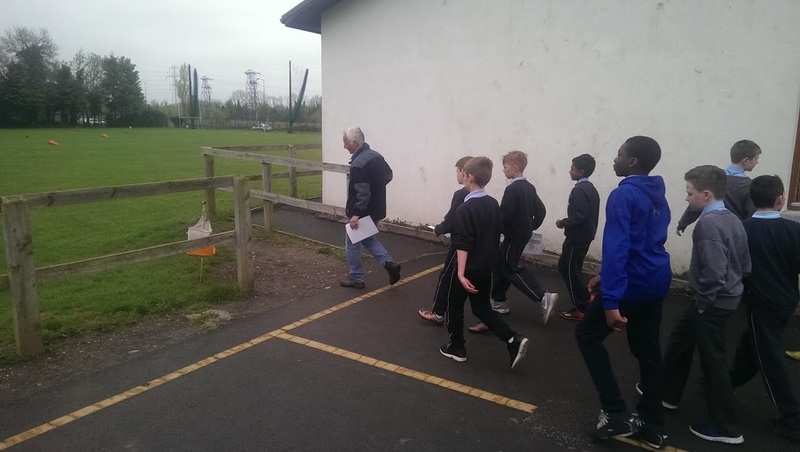 For that we owe great thanks to the OPW and staff, particularly Mr. Ward Knowles who was most helpful to everyone from Scoil Na Mainistreach on Saturday morning. 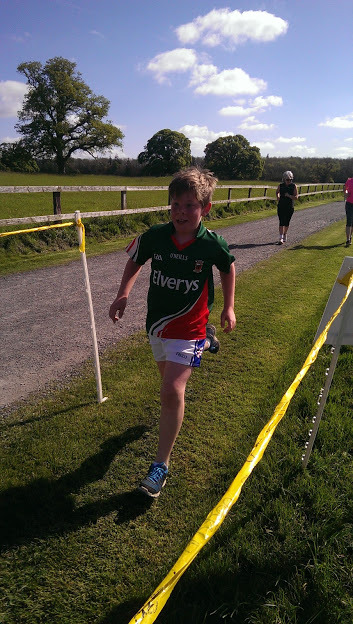 The pictures below show the many happy faces of entrants as they participated in this mornings run. 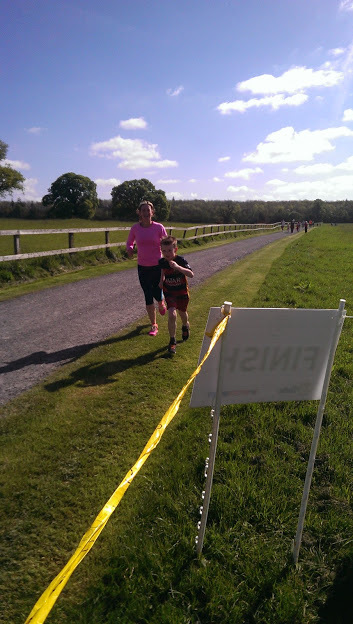 Many more wonderful pictures are available to view on the parkrun Castletown Flickr page. 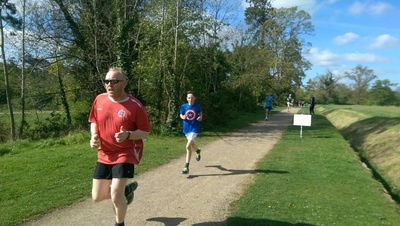 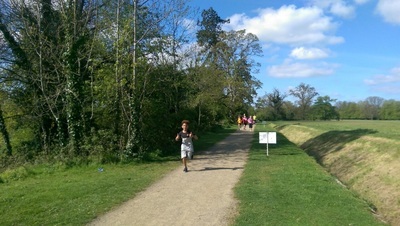 We look forward to participating in future parkruns and having many more joyous pictures to look back on. 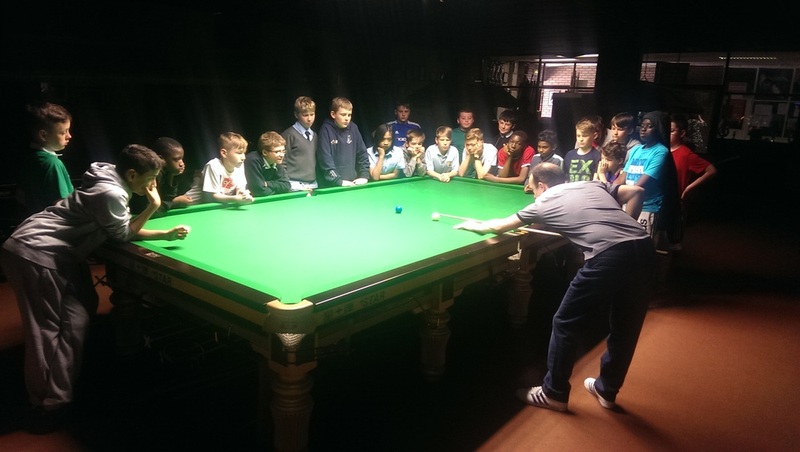 6th Class boys rounded off their Active Schools Week with a most enjoyable afternoon in Celbridge Snooker Hall receiving coaching from one of the top Snooker players in the world over the last 20 years Fergal O Brien. 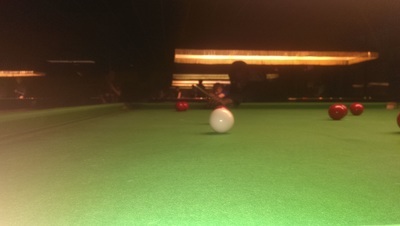 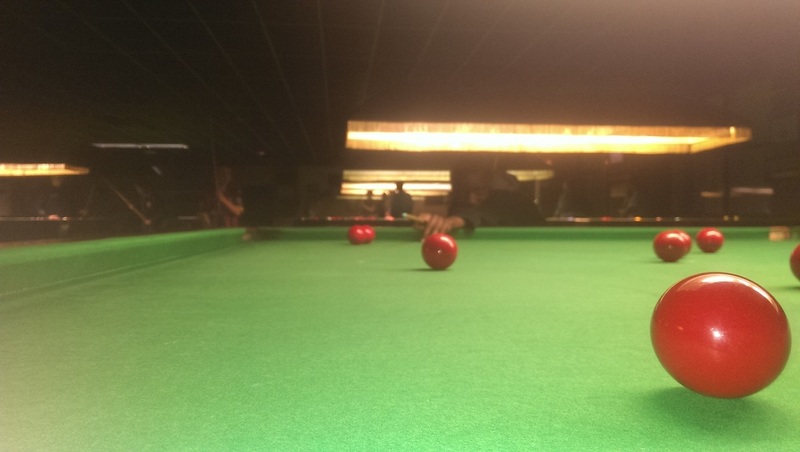 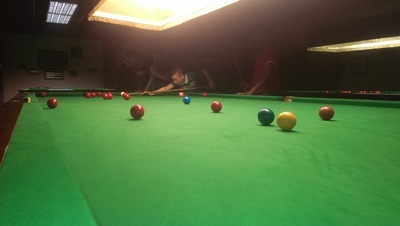 He began the lesson by explaining how to control the white ball in snooker, how to hold the cue and the correct stance when taking a shot. 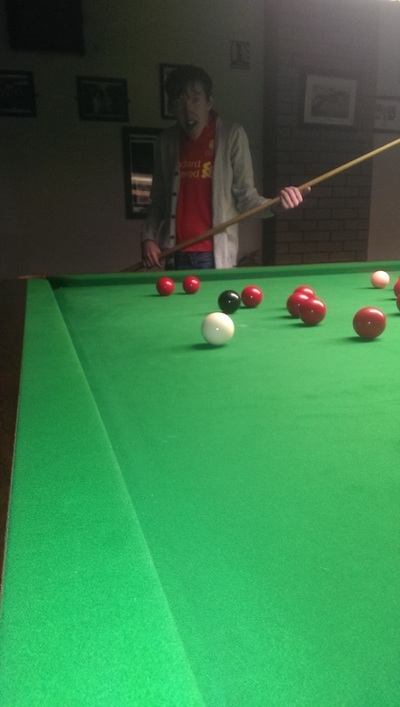 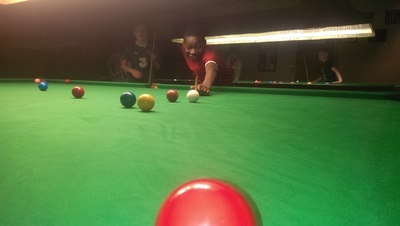 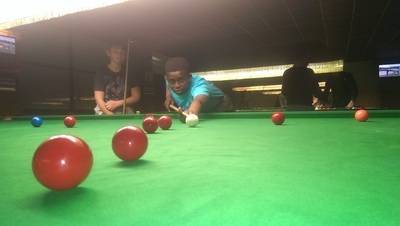 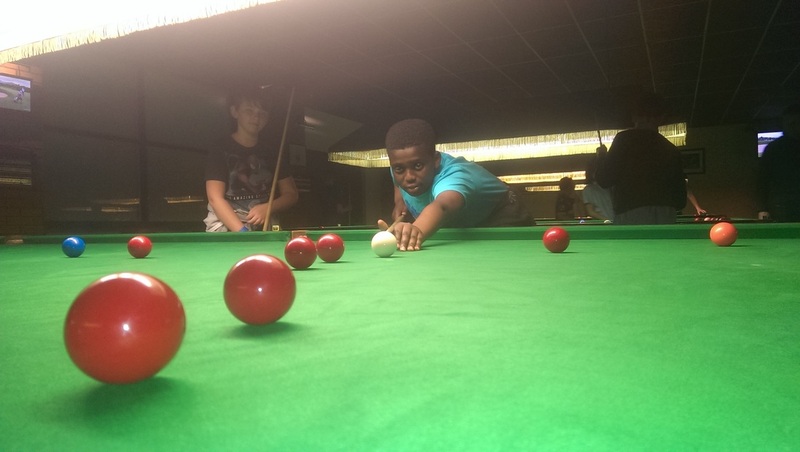 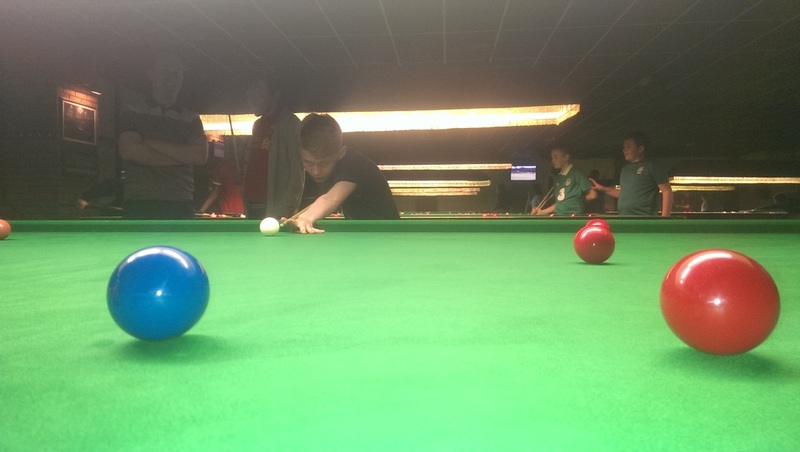 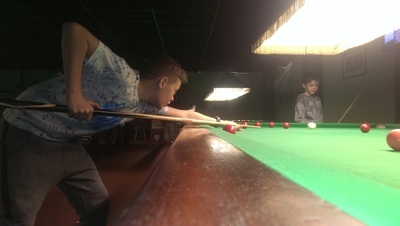 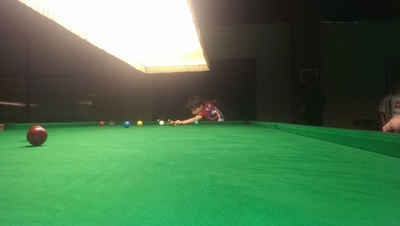 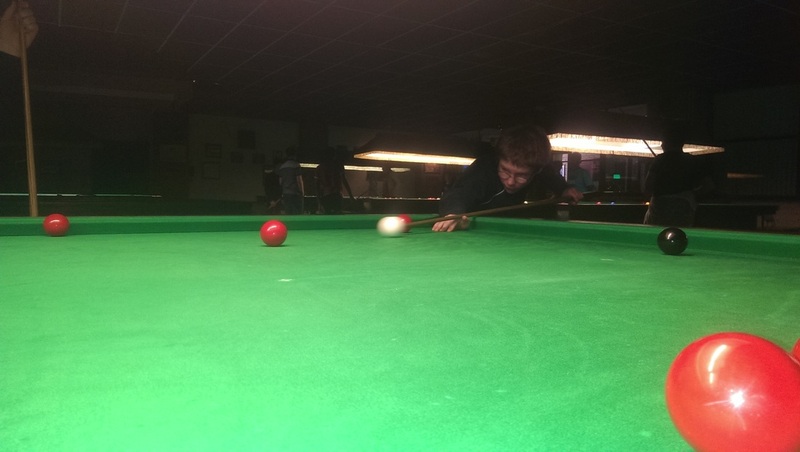 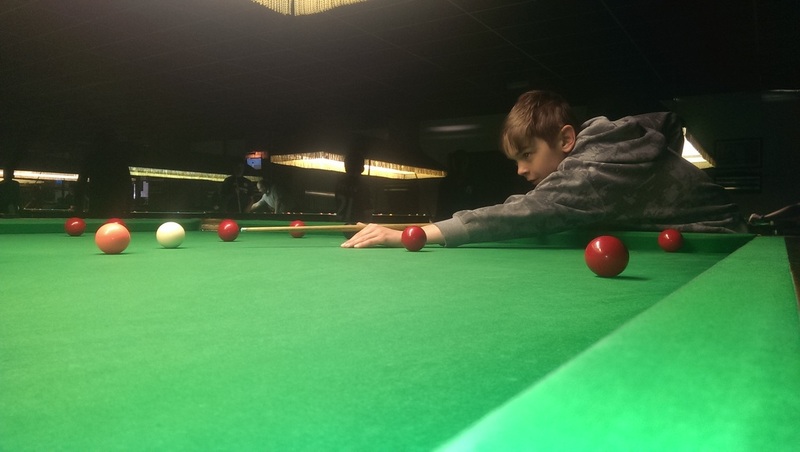 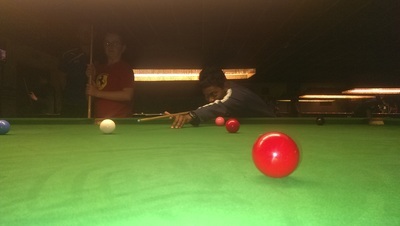 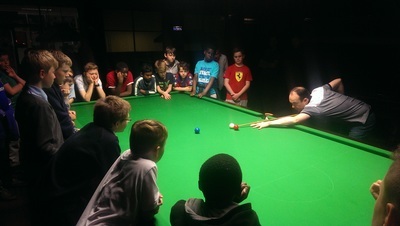 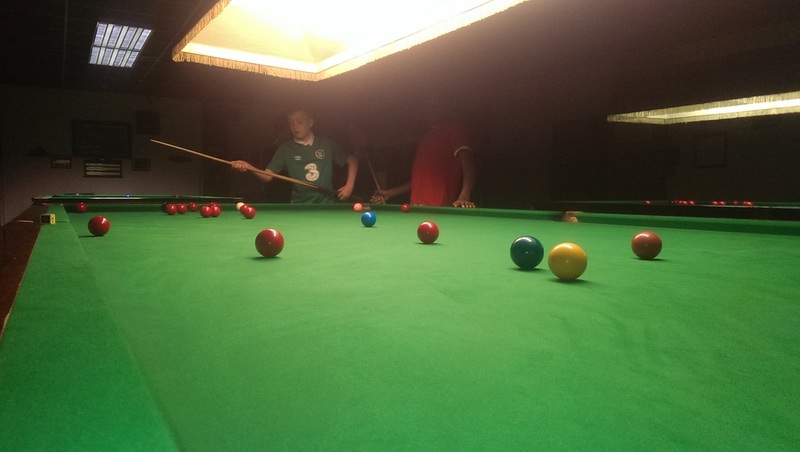 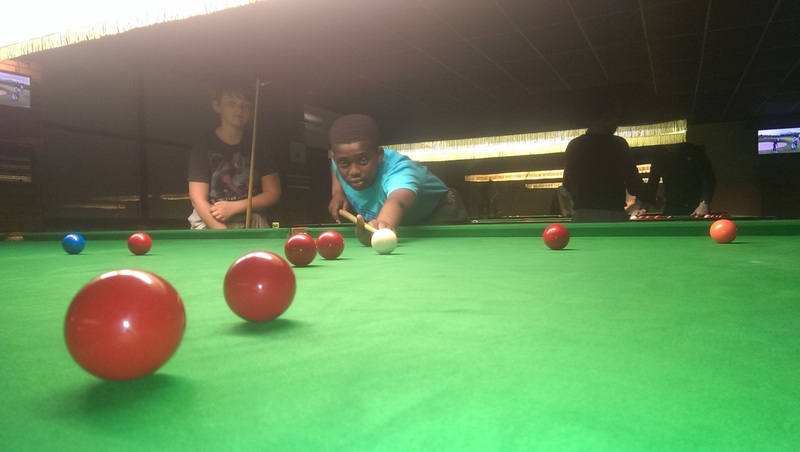 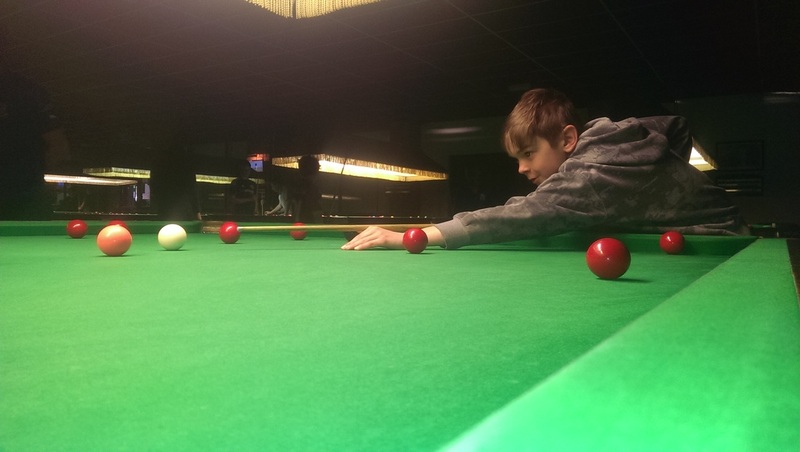 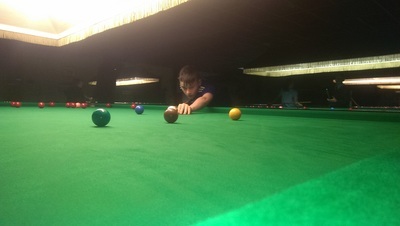 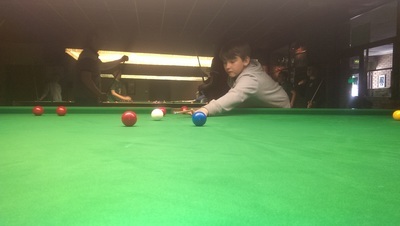 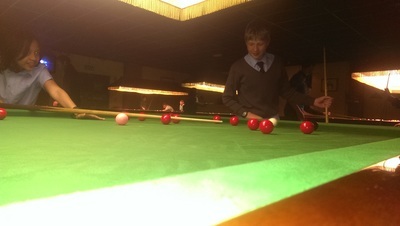 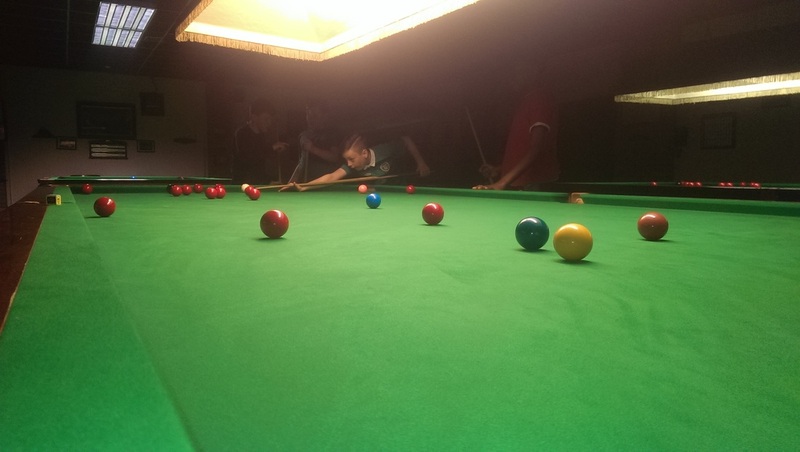 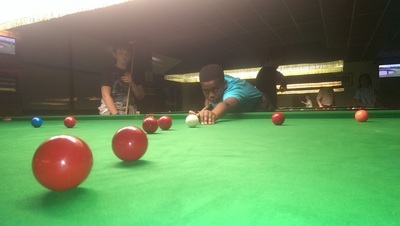 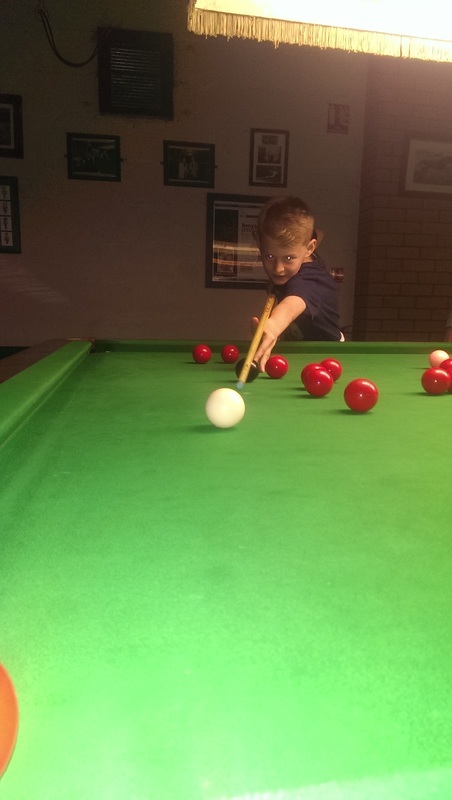 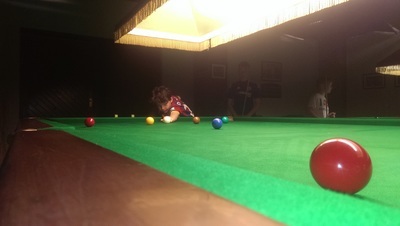 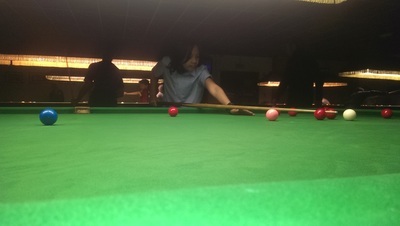 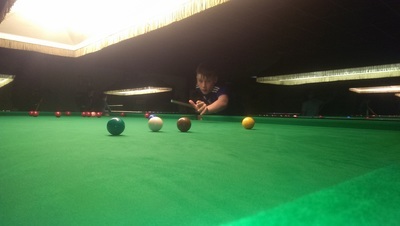 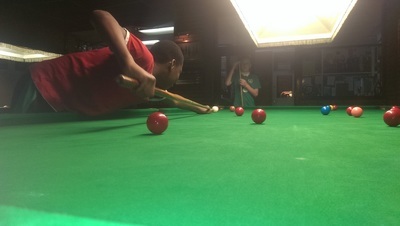 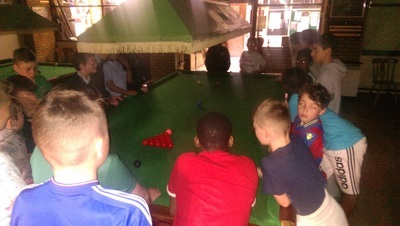 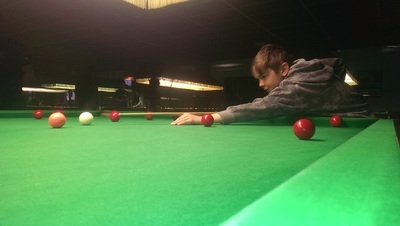 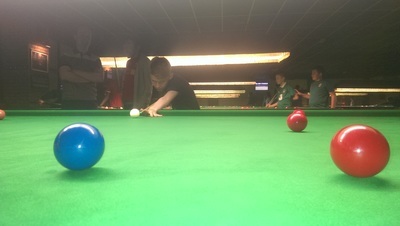 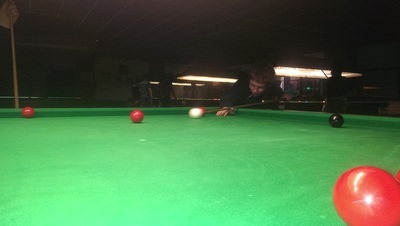 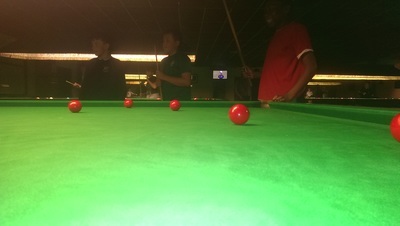 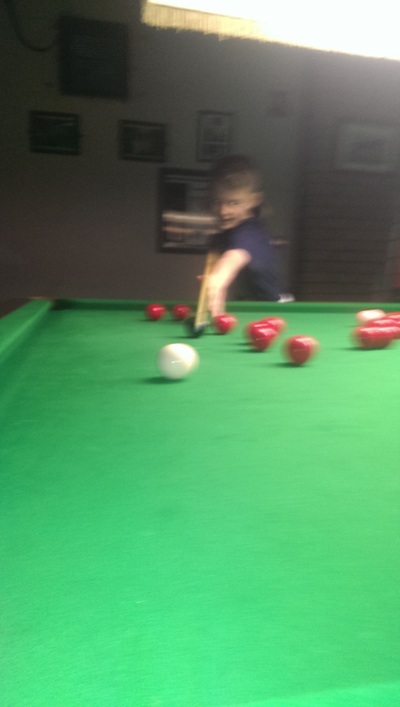 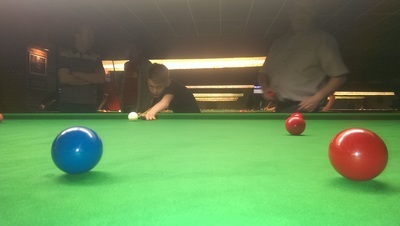 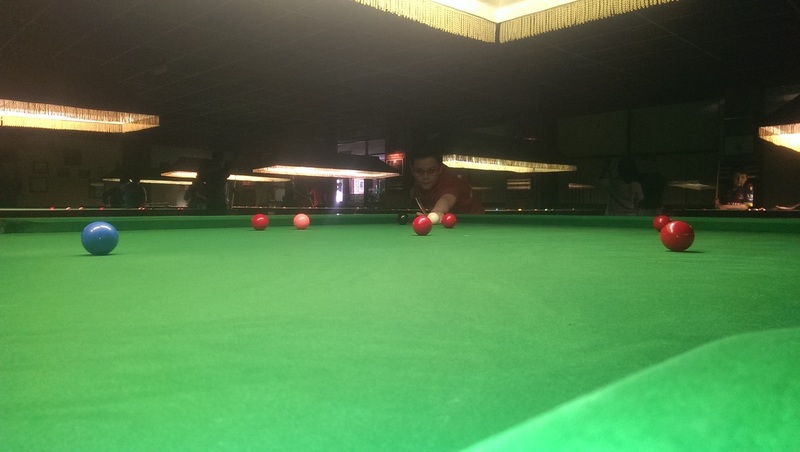 The boys were given the opportunity to play matches against each other on the tables in the snooker hall. 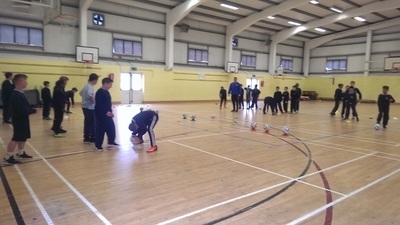 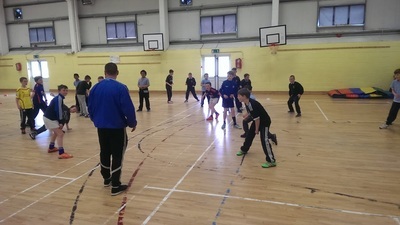 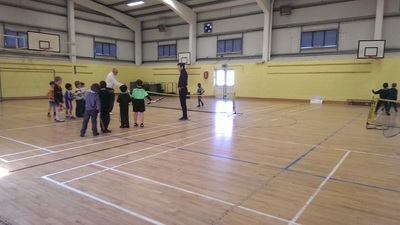 During this time Fergal was generous with his teaching and took time to give all the boys around the hall various tips about their techniques. 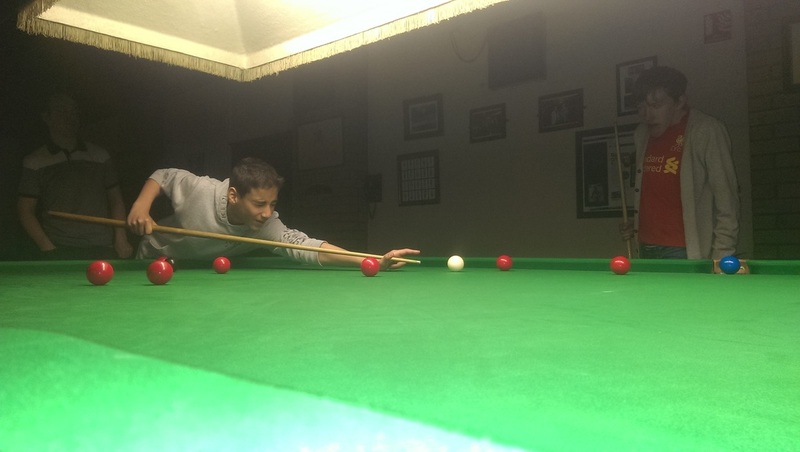 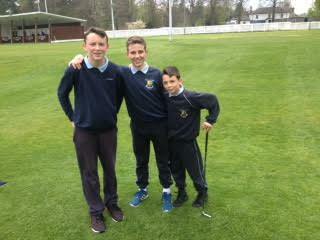 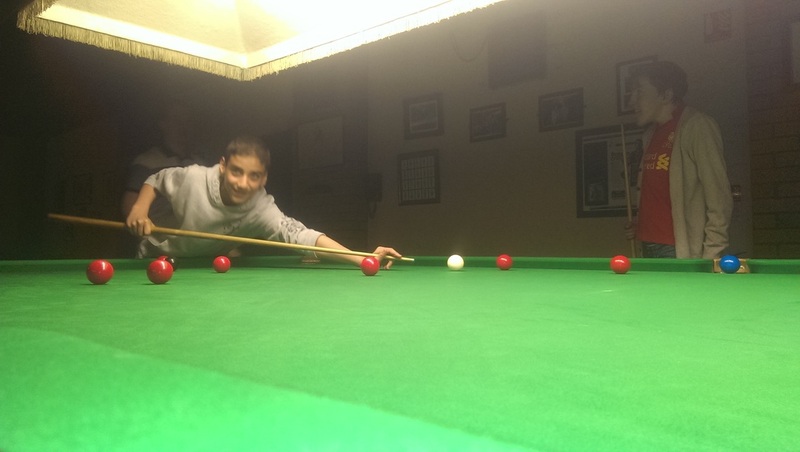 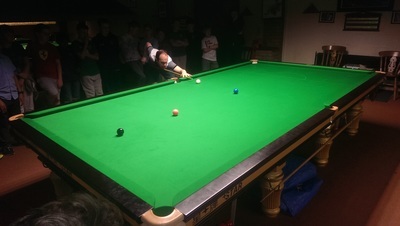 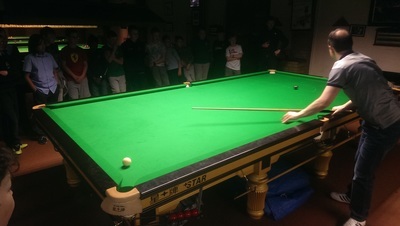 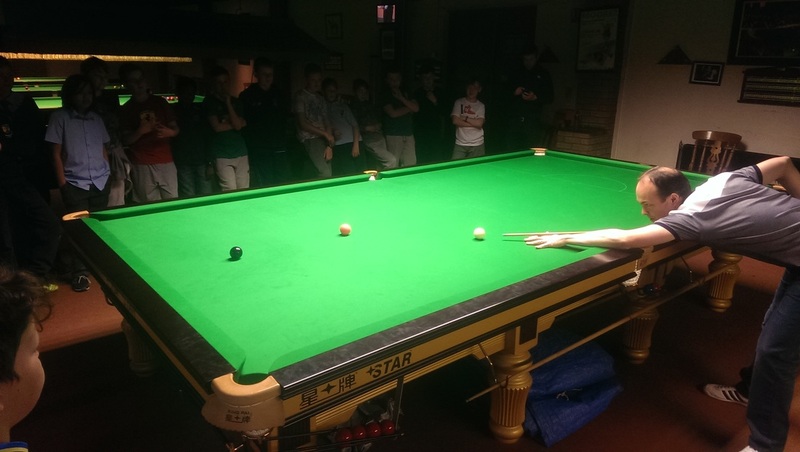 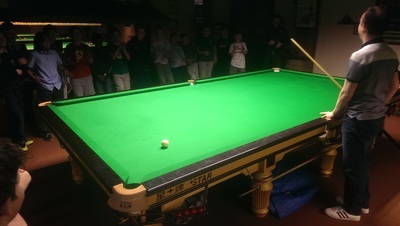 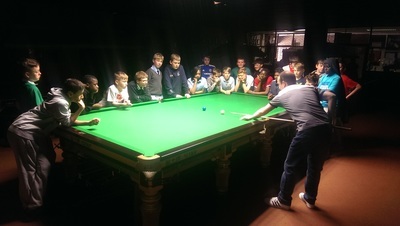 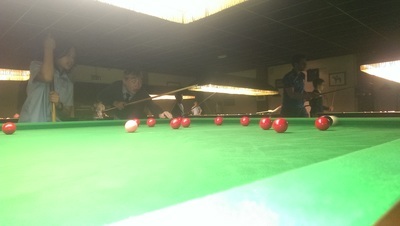 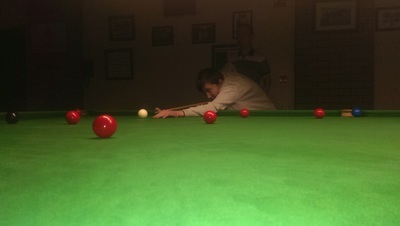 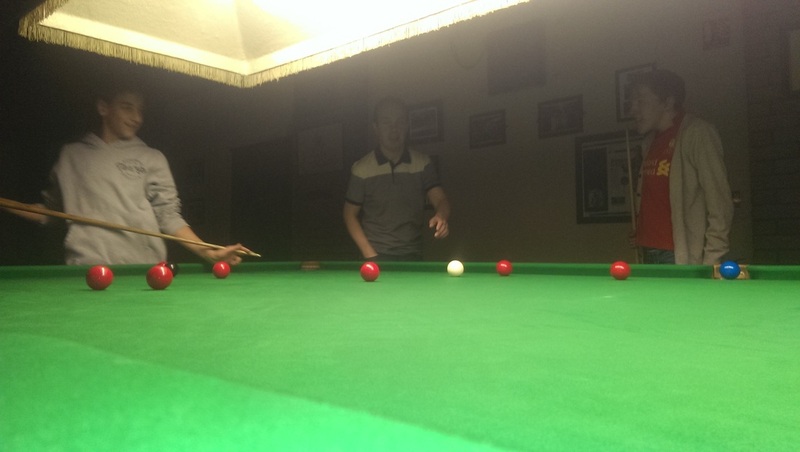 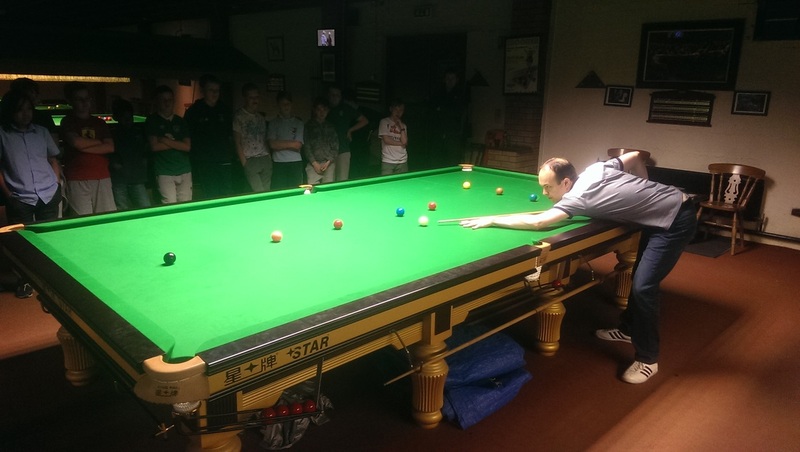 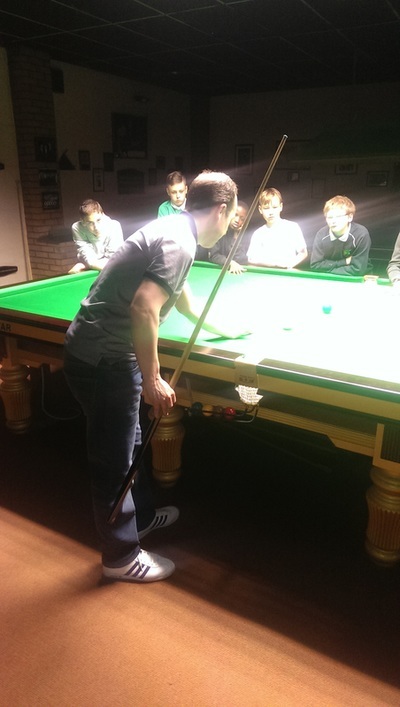 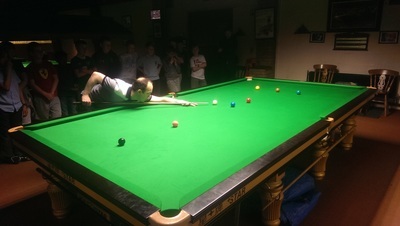 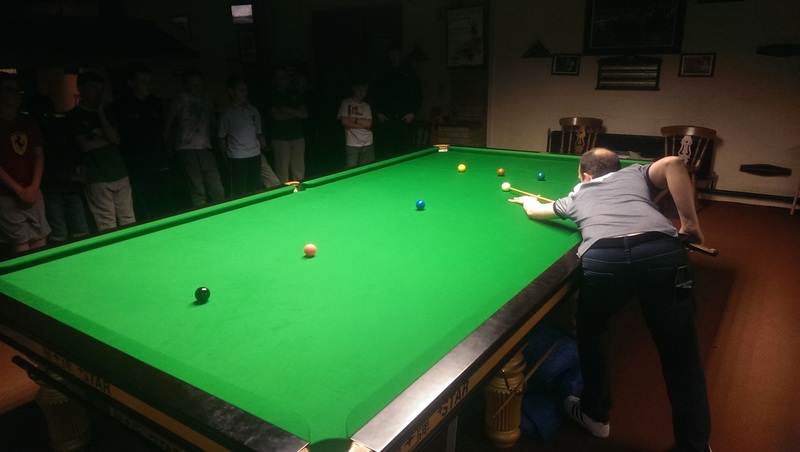 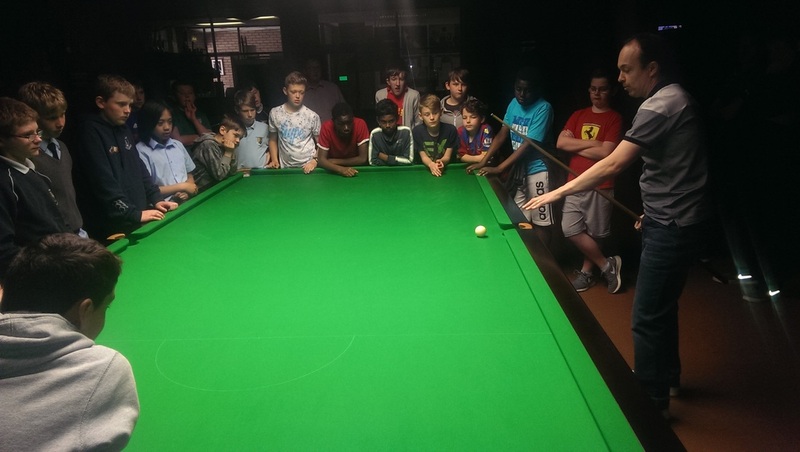 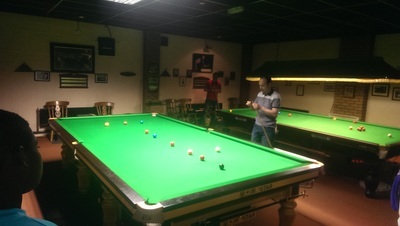 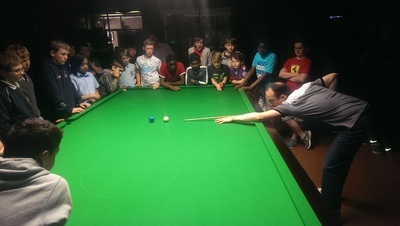 James who also coaches at Celbridge Snooker Hall was also on hand to pass on some valuable advice to the boys. 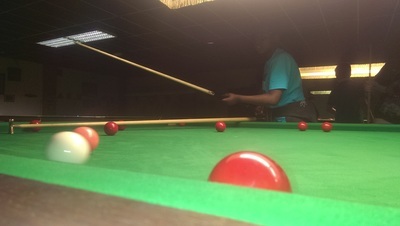 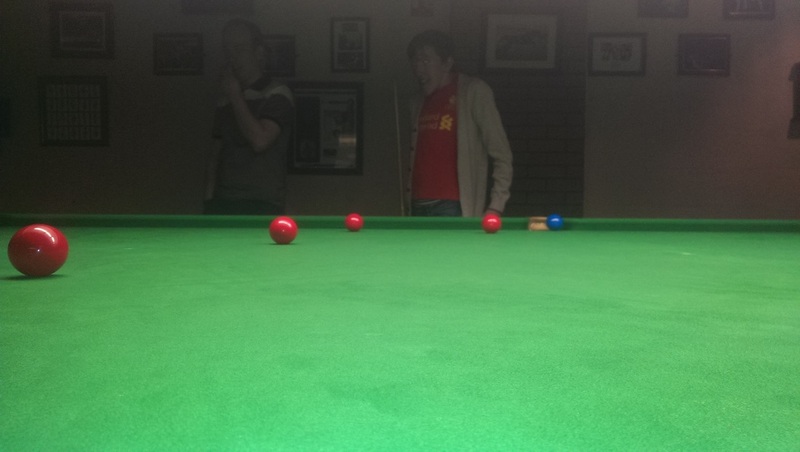 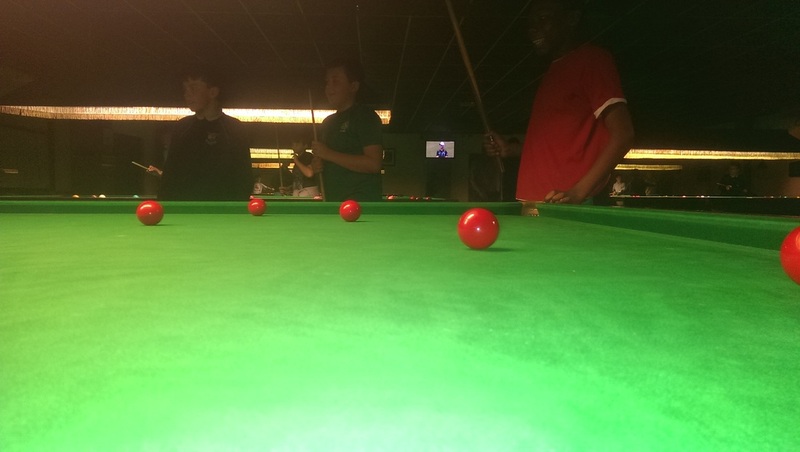 ​At the end of their games the boys gathered once more around Fergals table where he demonstrated a number of trick shots for the boys before completing a break of 3 Reds and all the colours to the astonishment of all the boys. 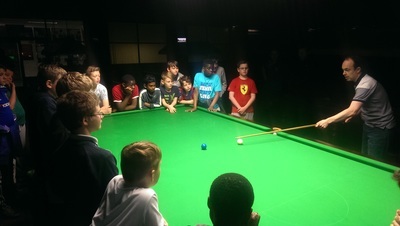 From their experience today the boys certainly learned first hand the importance hard work and practice plays in this sport which looks much easier on television. We are very grateful to Fergal for his time and skill sharing with the boys today. 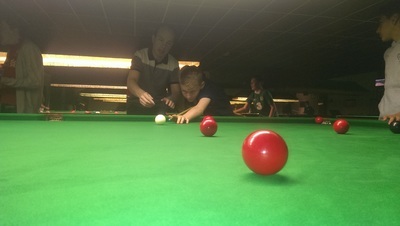 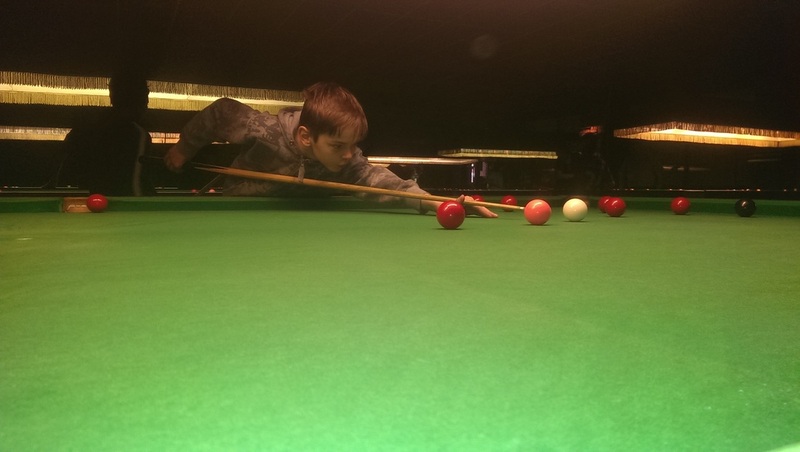 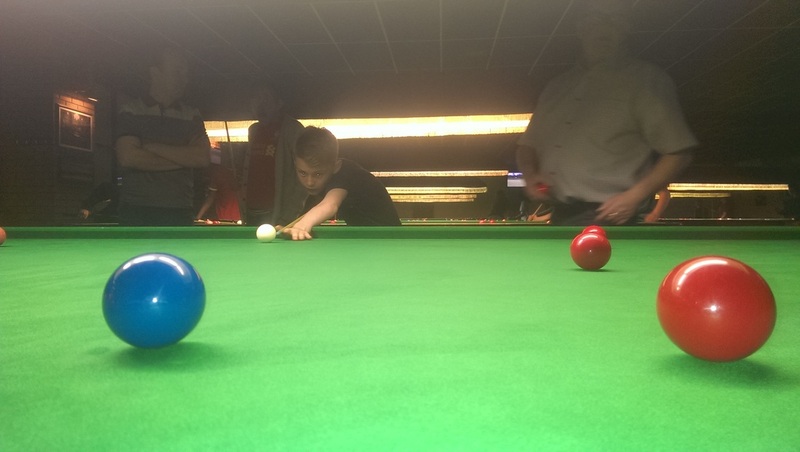 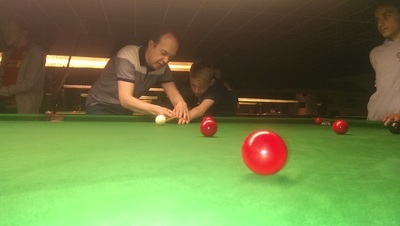 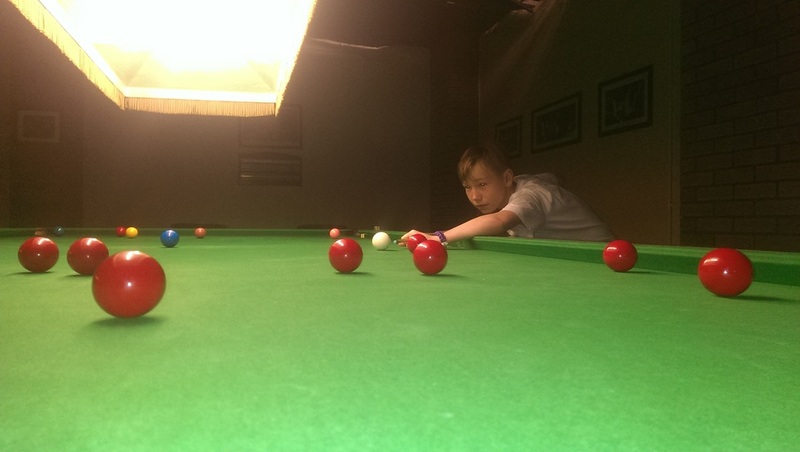 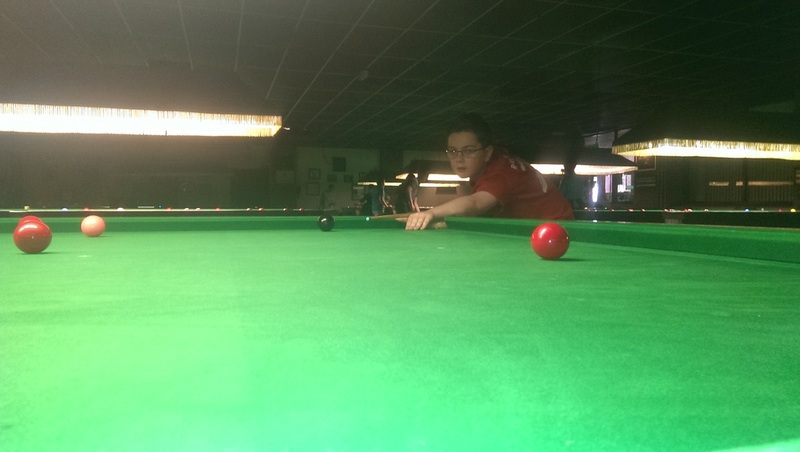 It was an experience they will treasure forever, We owe a big thanks to James and all in Celbridge Snooker for hosting todays lesson. We will all be keeping an eye on the snooker results in the future and following his recent 147 Break he is obviously in good form. 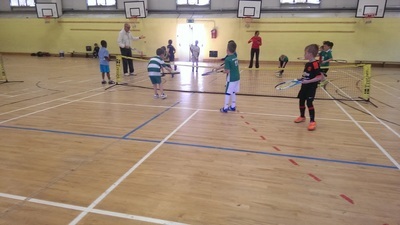 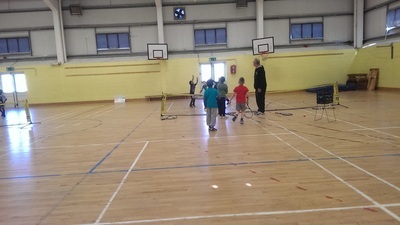 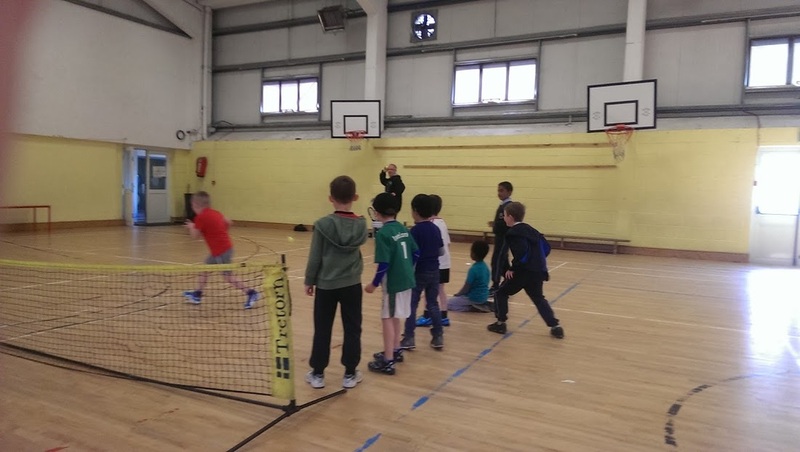 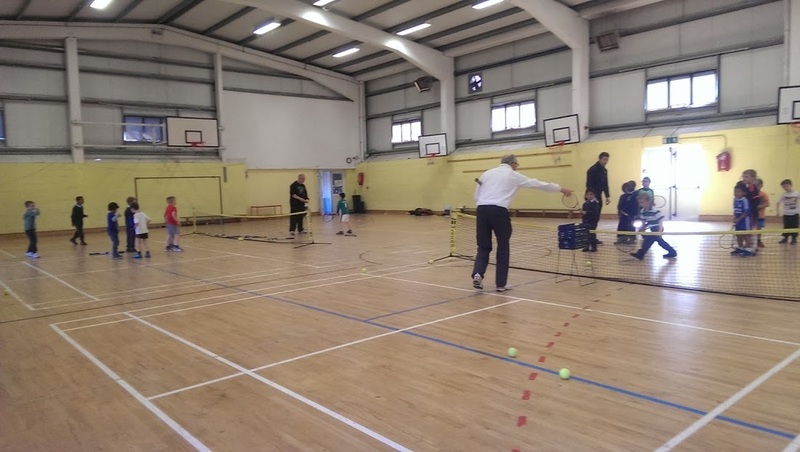 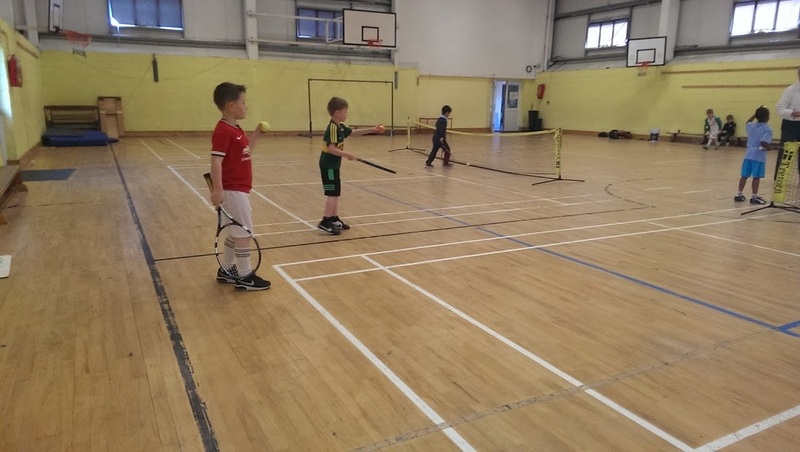 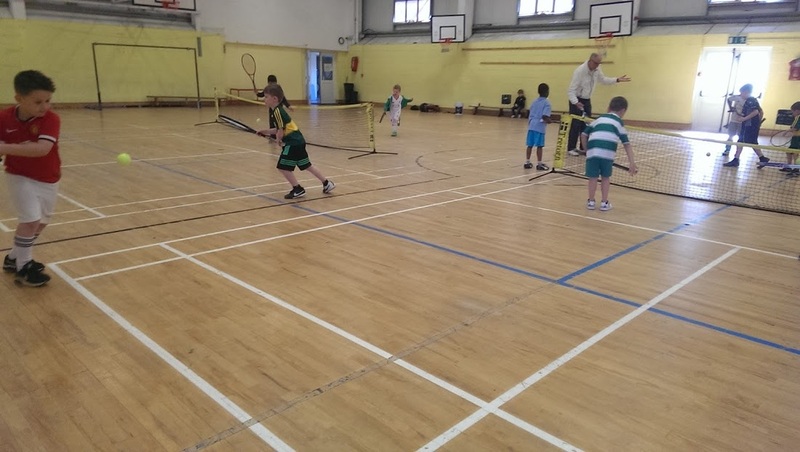 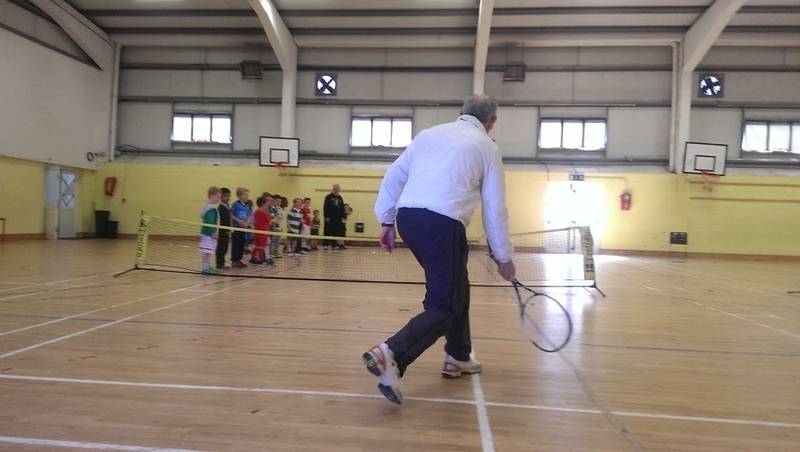 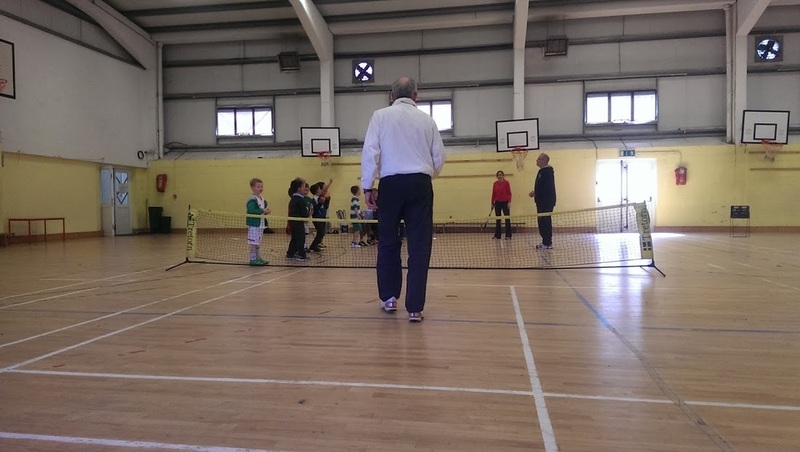 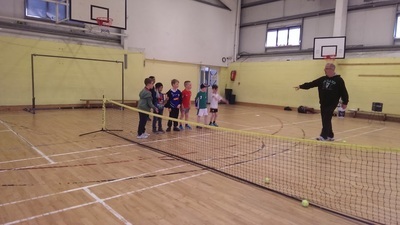 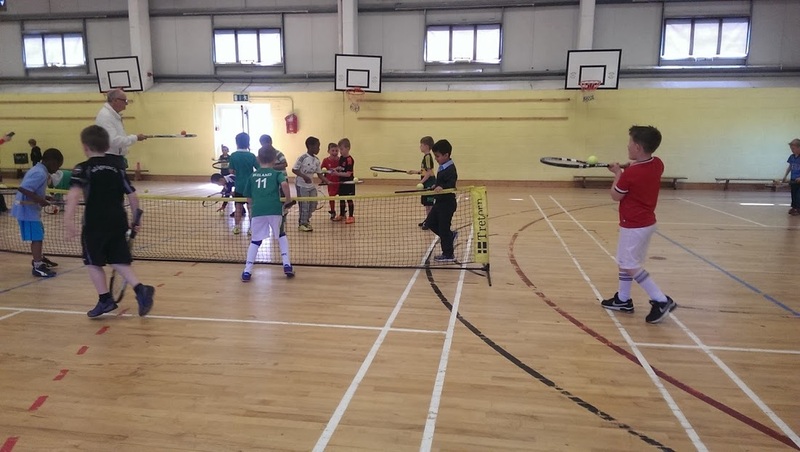 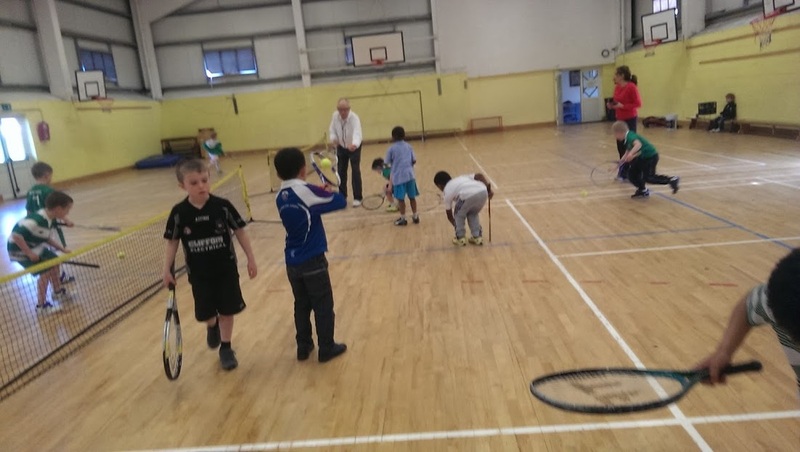 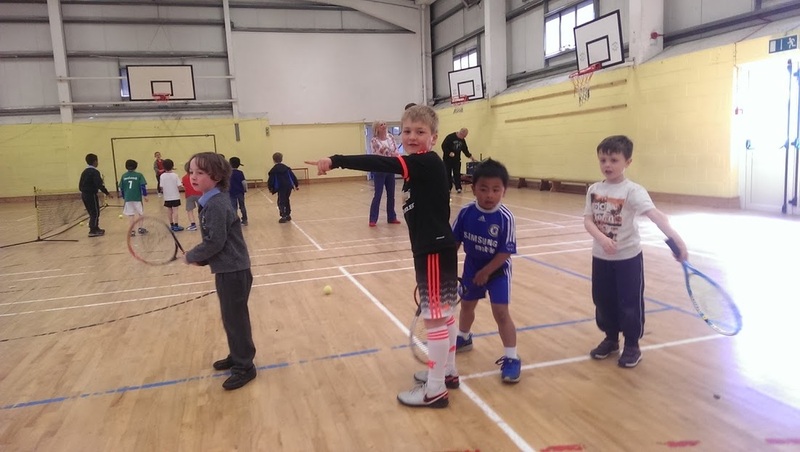 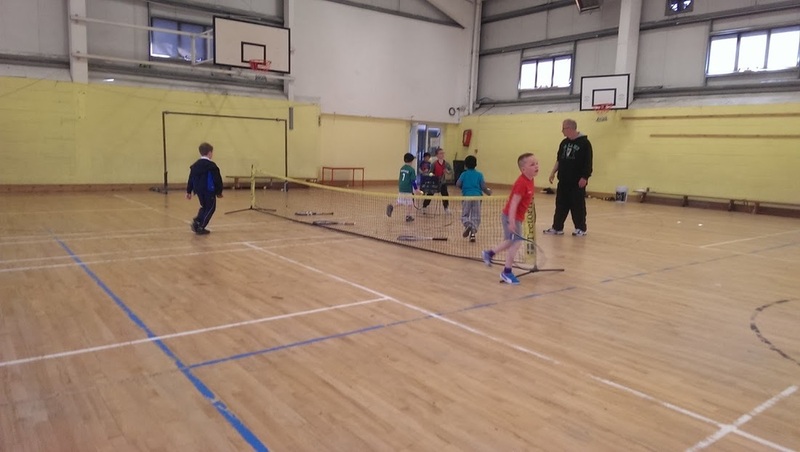 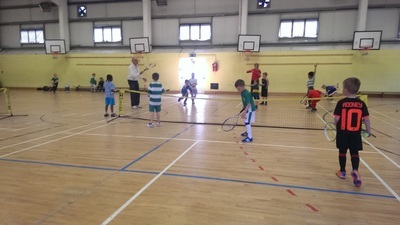 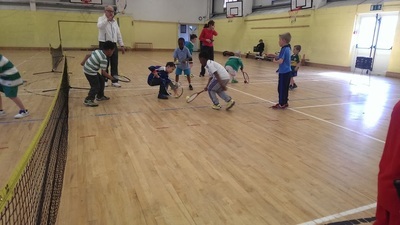 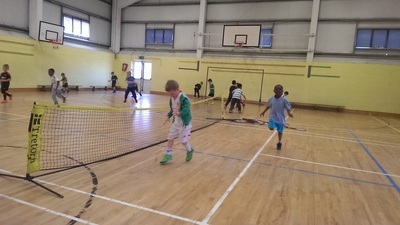 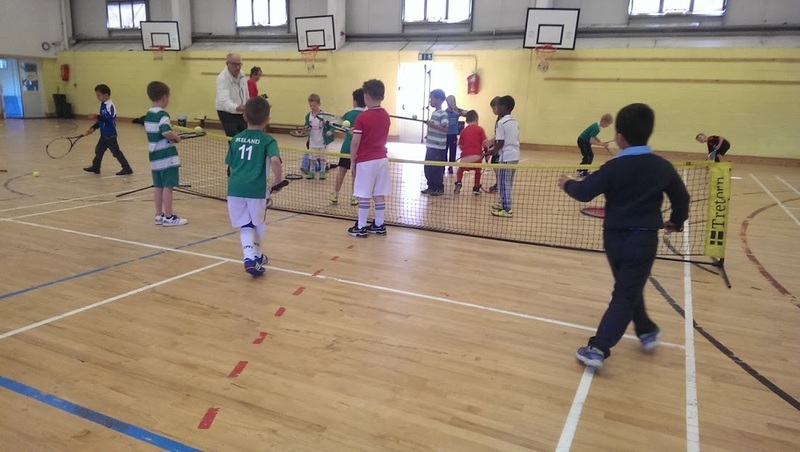 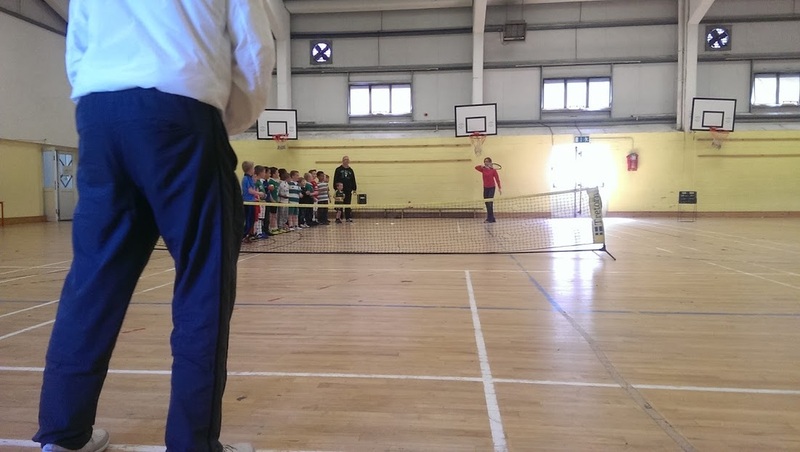 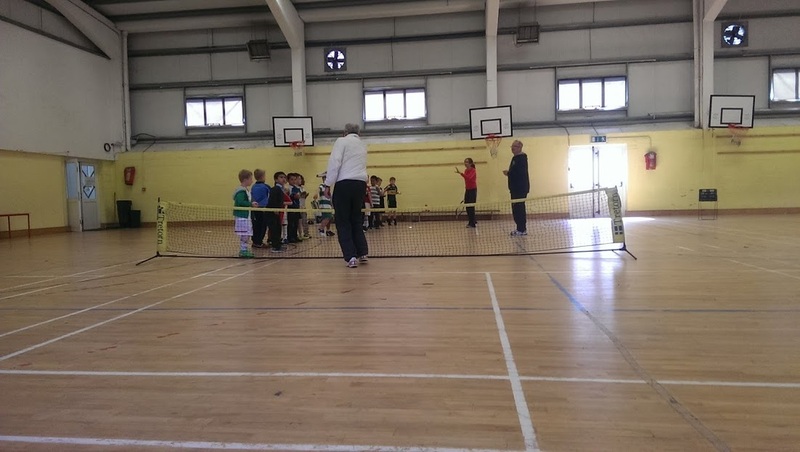 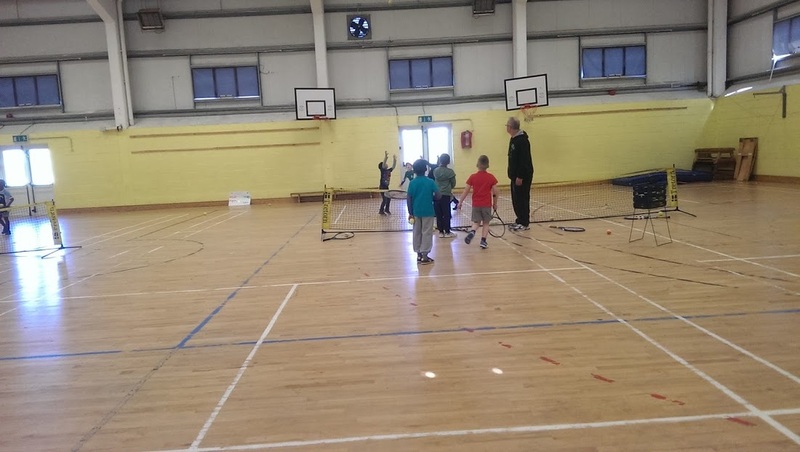 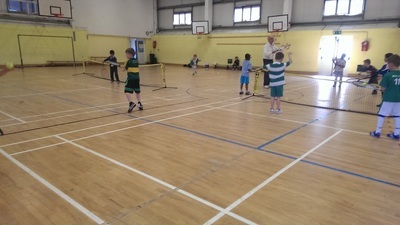 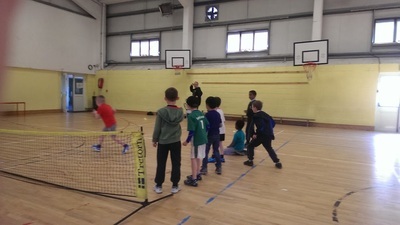 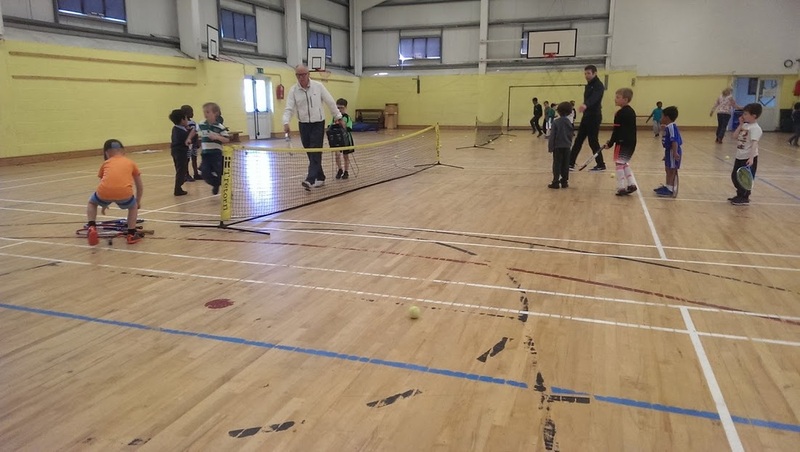 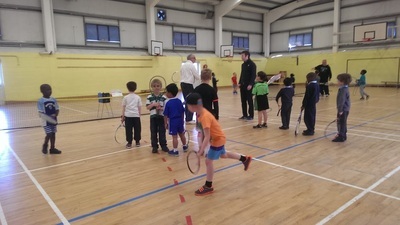 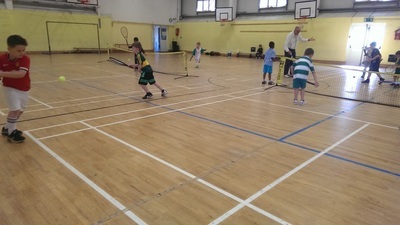 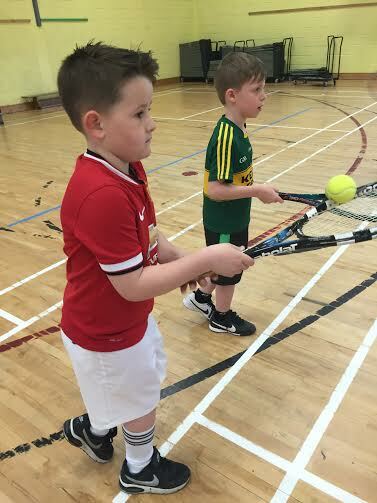 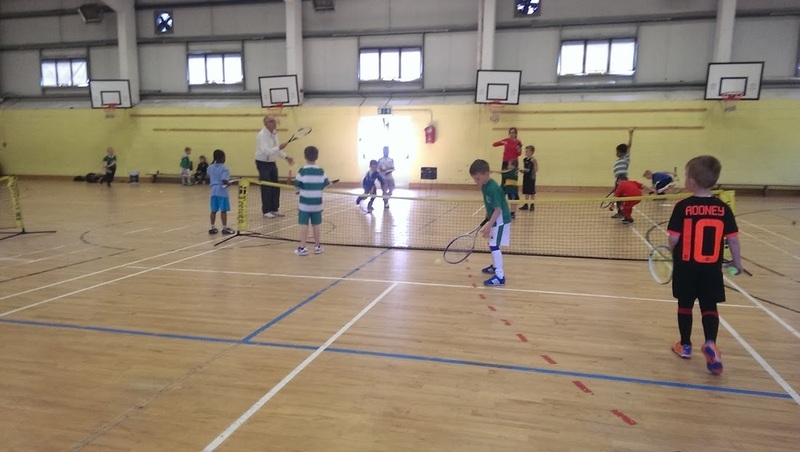 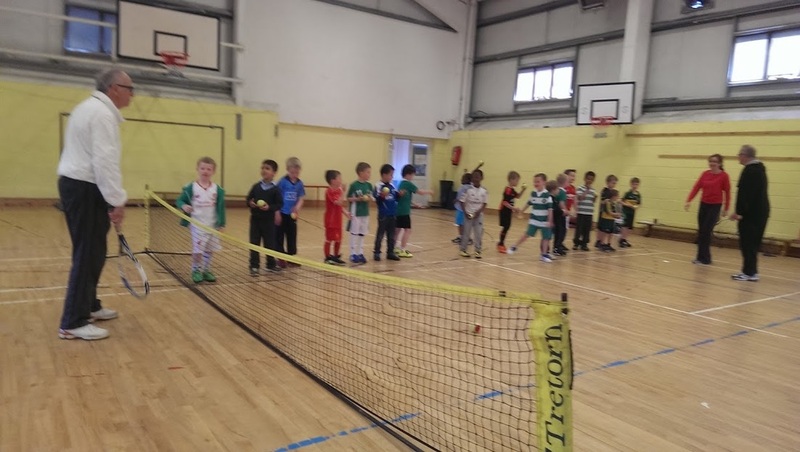 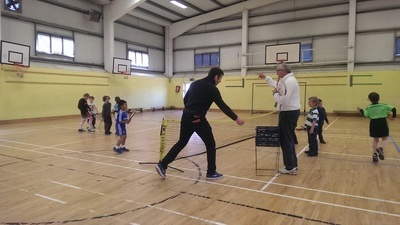 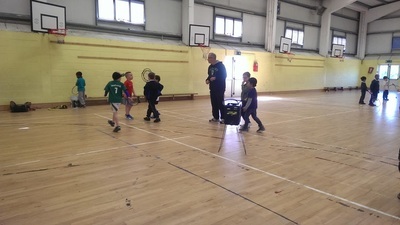 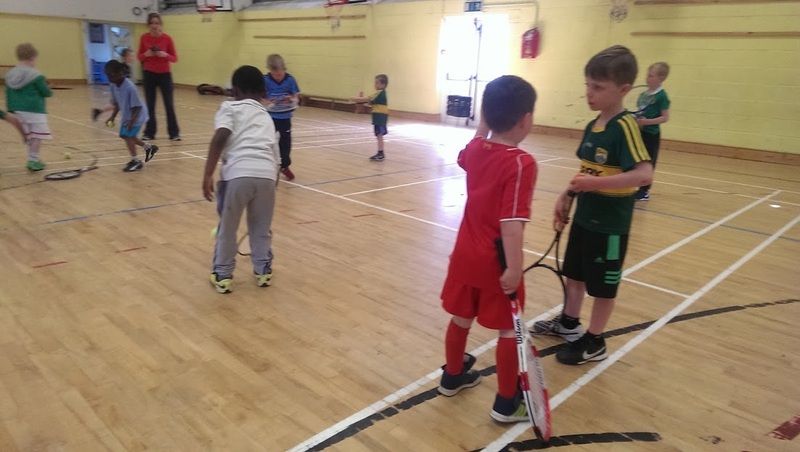 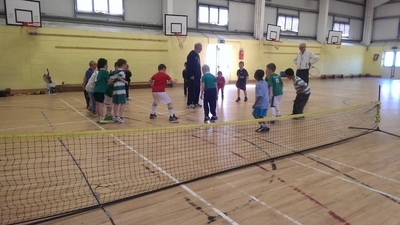 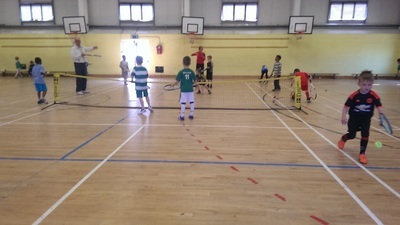 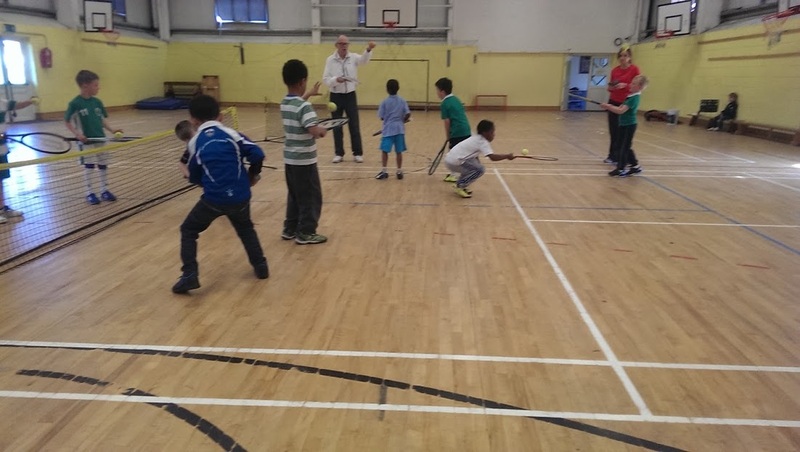 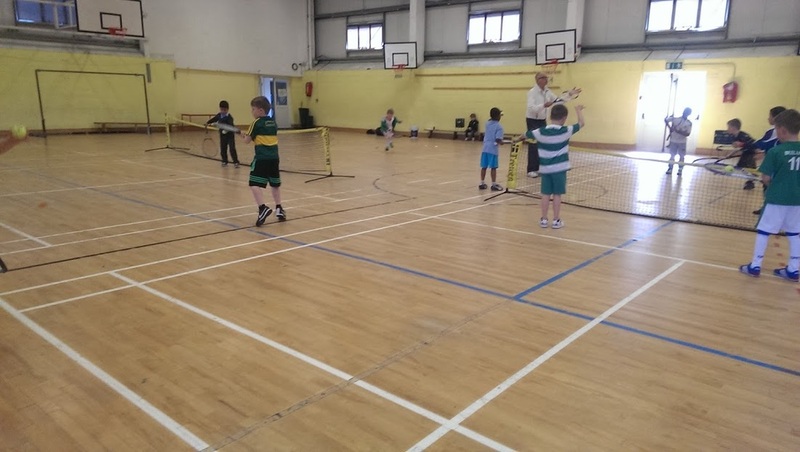 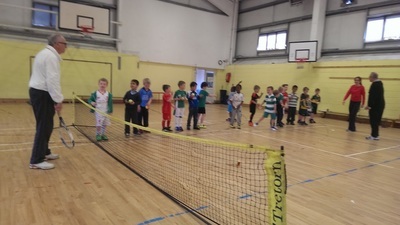 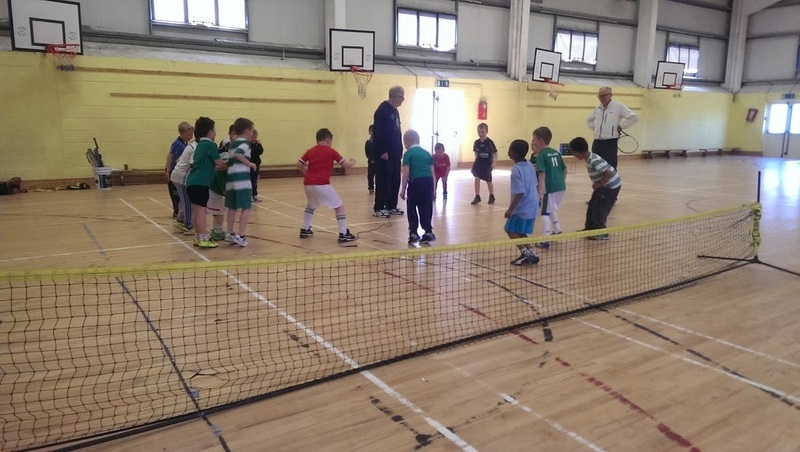 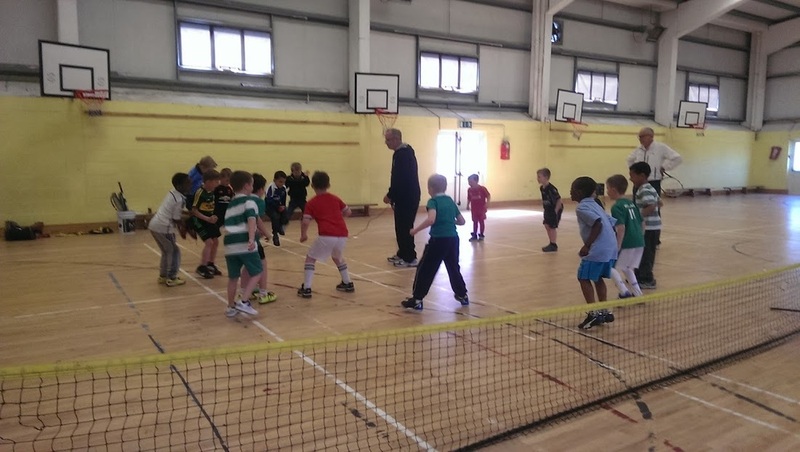 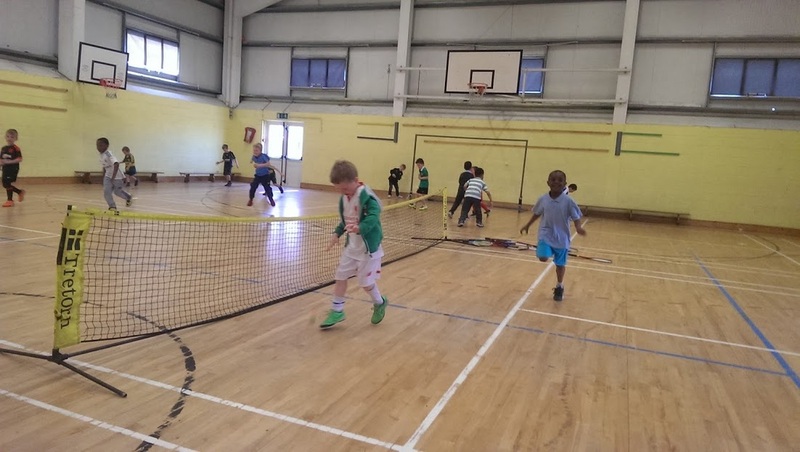 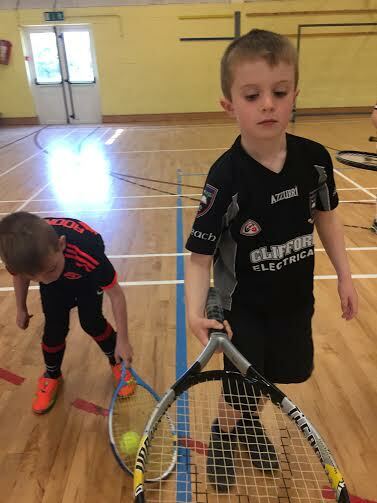 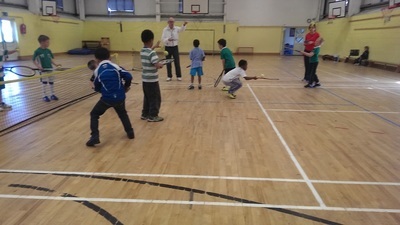 Senior Infants and First Class boys became Rafa Nadals and Andy Murrays for a few hours this morning courtesy of Michael and Ed, the ever popular coaches from Celbridge Tennis Club who returned to the school again for Active Week 2016. 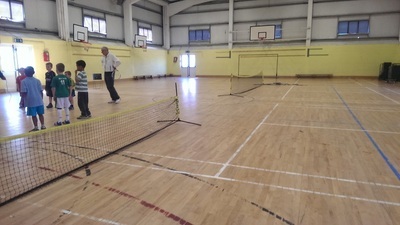 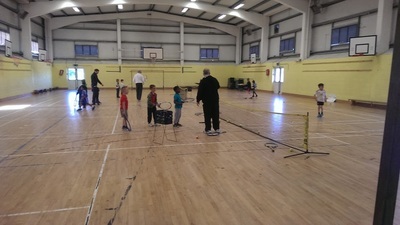 Using a number of different techniques and games the coaches provided a most enjoyable introduction to the sport of tennis for the boys. 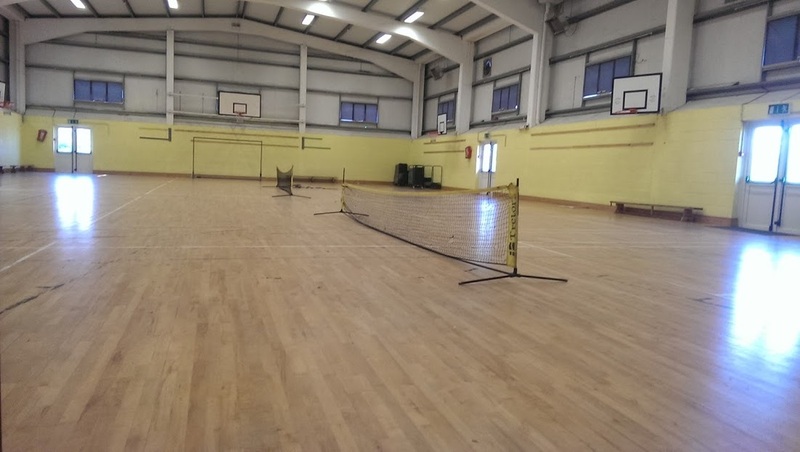 Tennis is widely regarded as a summer sport and we can expect to see the number of tennis rackets on the greens around Celbridge increase during the Wimbledon season in particular. 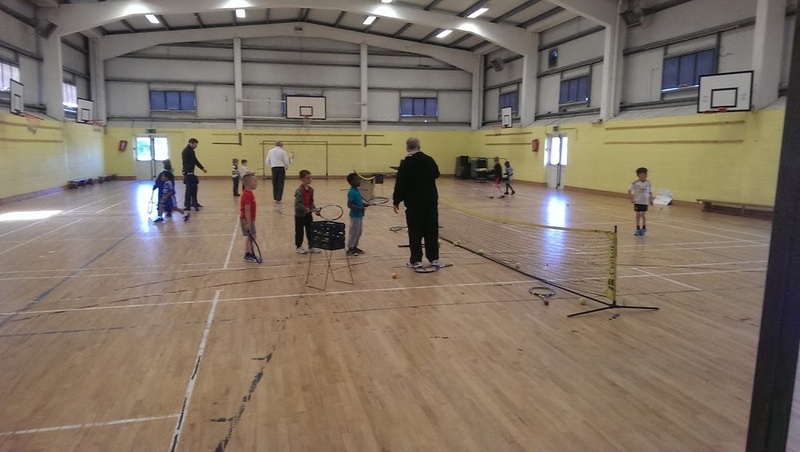 For any parent interested in finding out more about Celbridge Tennis club check out their Facebook Page Here for up to dtae news and events. 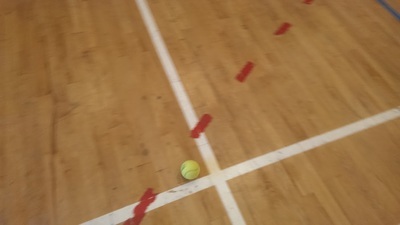 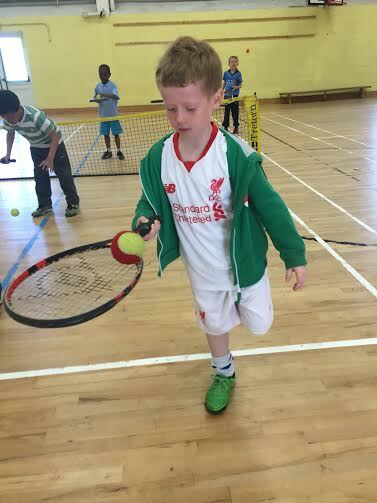 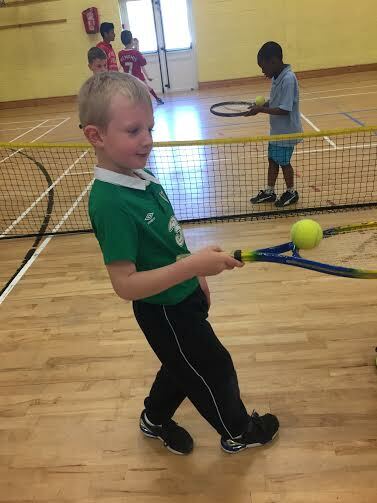 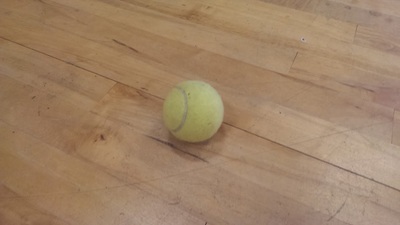 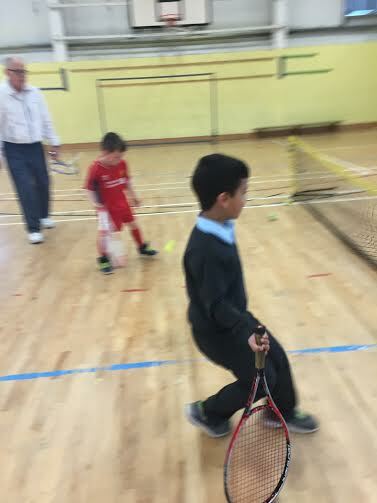 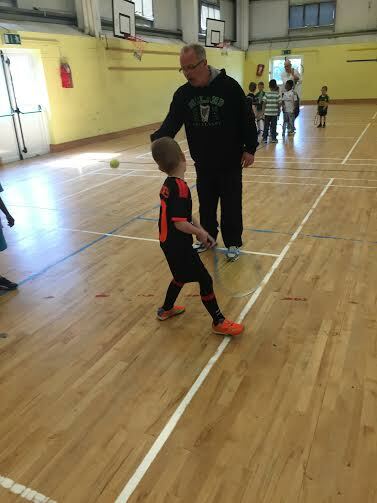 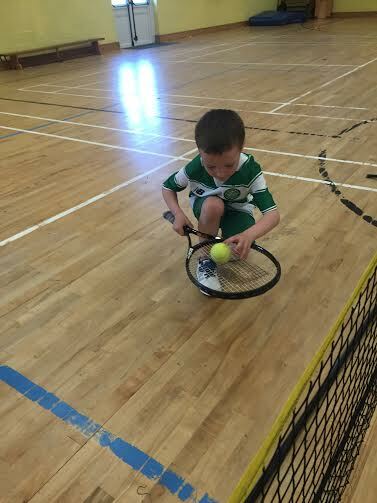 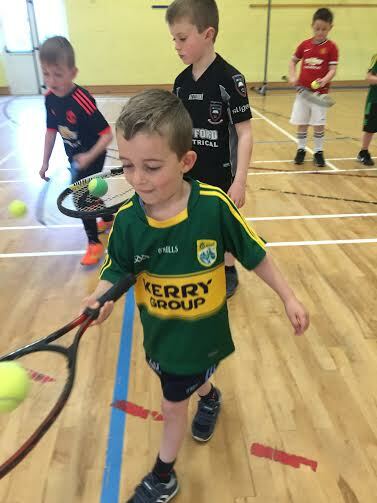 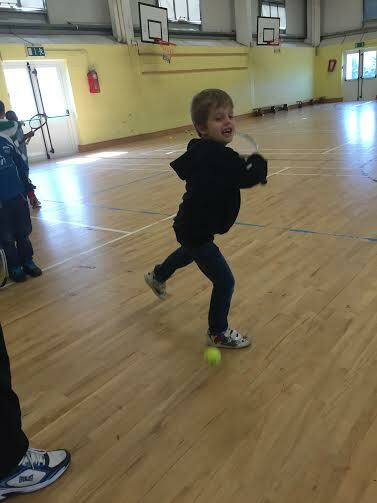 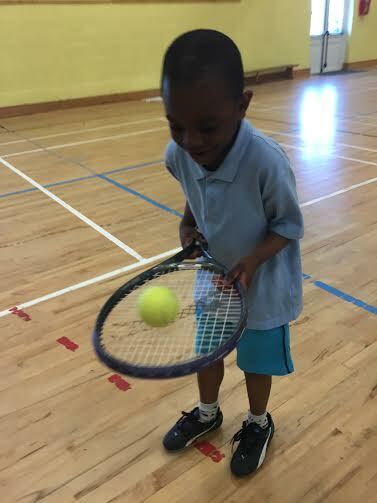 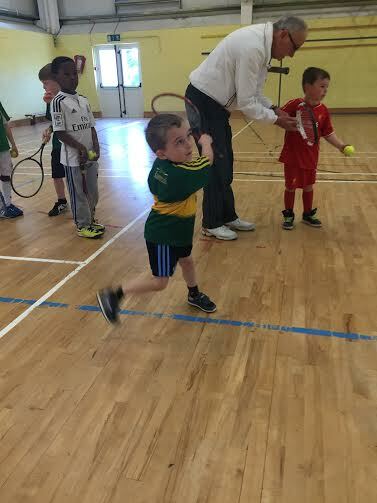 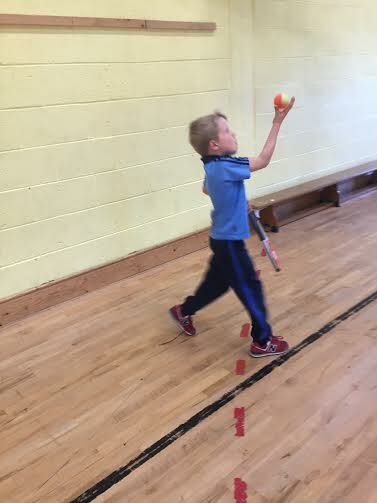 Friday begins with our rescheduled tennis lessons for senior infants and first classes. 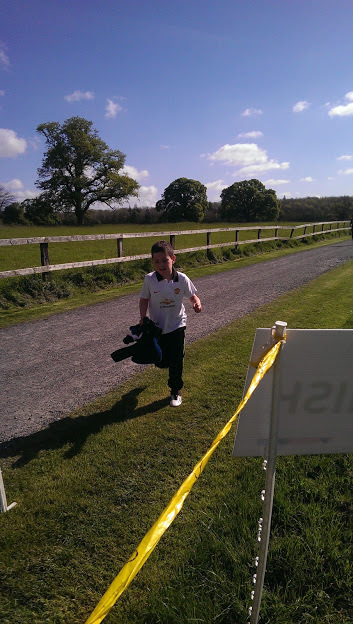 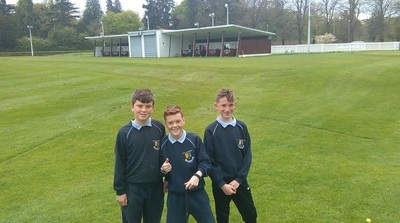 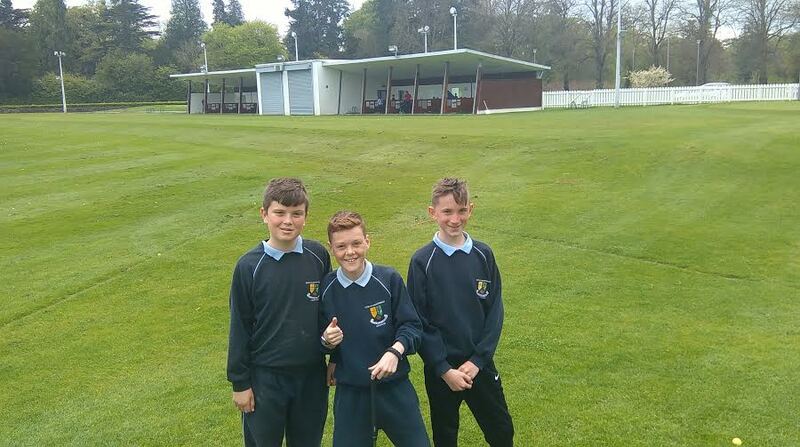 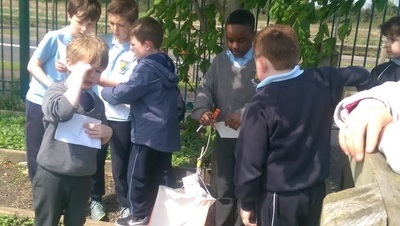 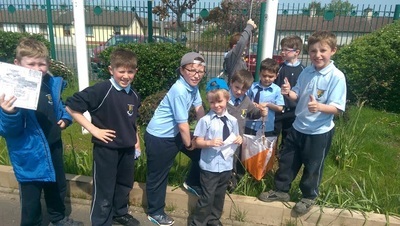 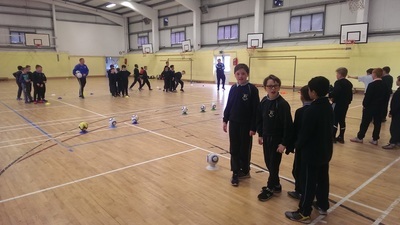 Orienteering continues for classes yet to take part while Irish Snooker Ace Fergal O Brien will give 6th class boys snooker lessons in Celbridge Snooker Club. 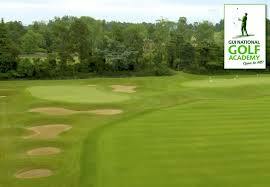 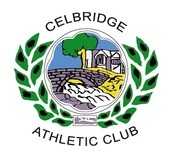 As we have seen this week Celbridge is home to many wonderful sporting clubs and organisations. 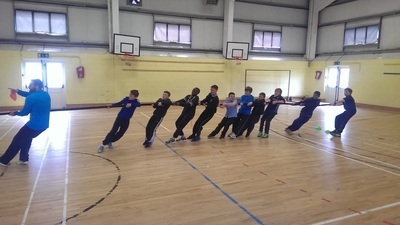 One such organisation is Excel Gymnastics, one of the leading Gymnastics Clubs in Ireland. 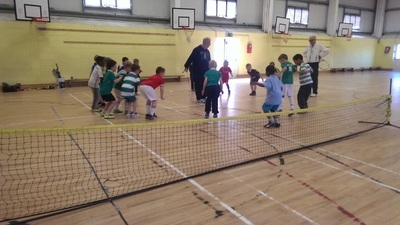 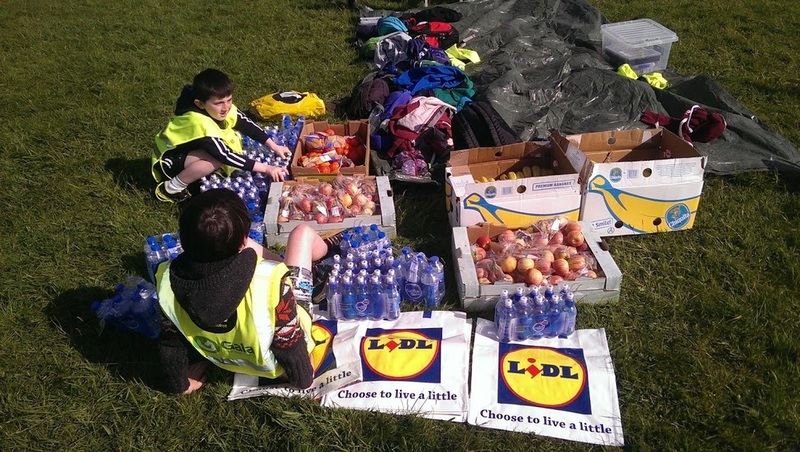 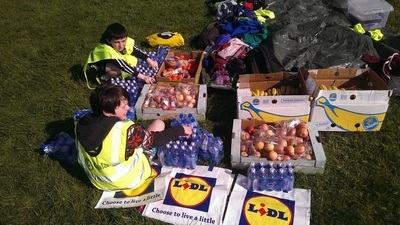 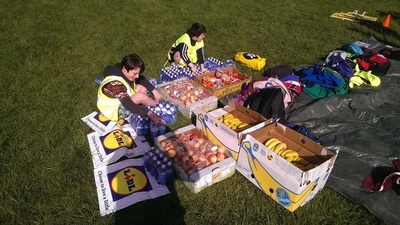 Excel have been great supporters of Scoil Na Mainistreach, Active School Week over the last few years. This year was no different and Excel Coach Sam certainly lived up to the name. 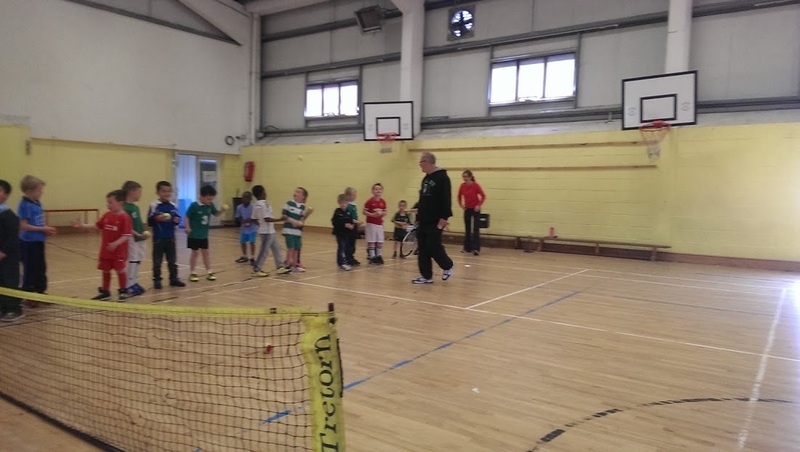 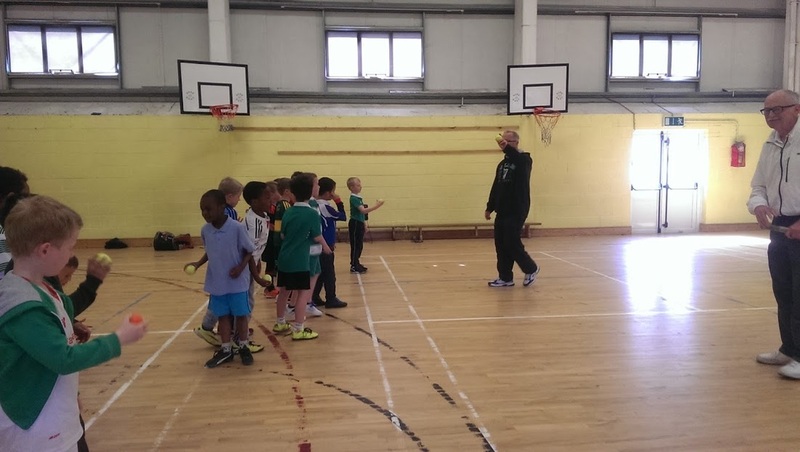 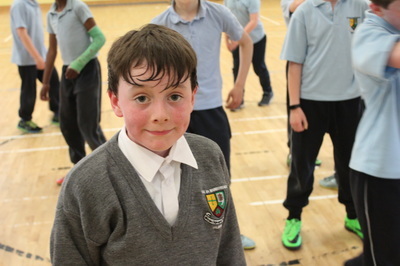 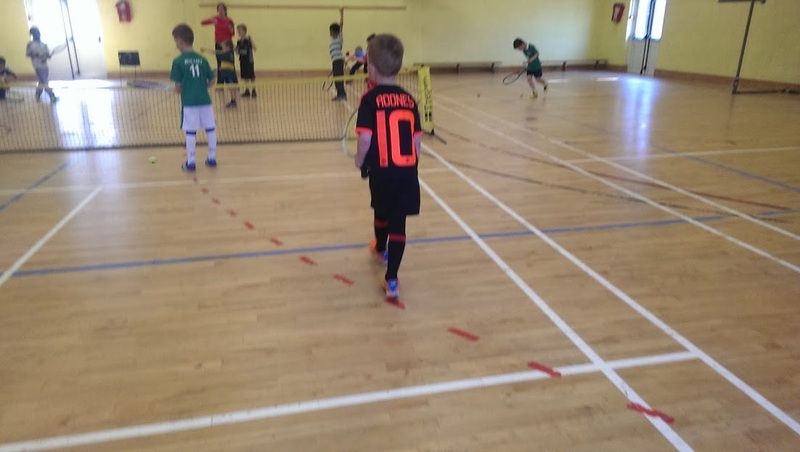 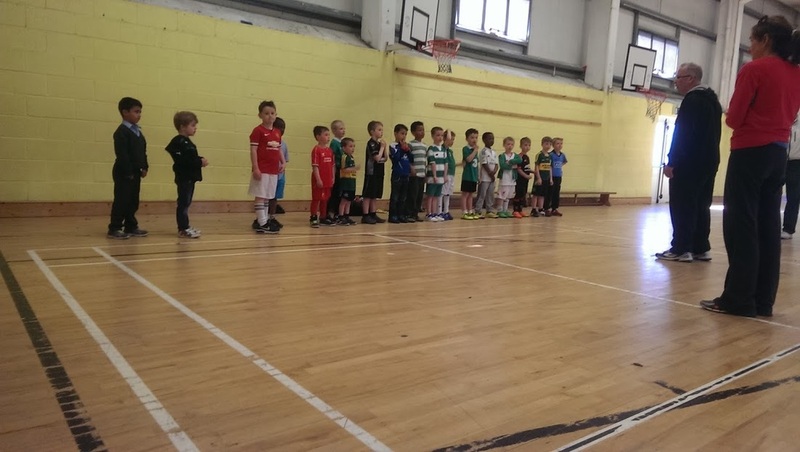 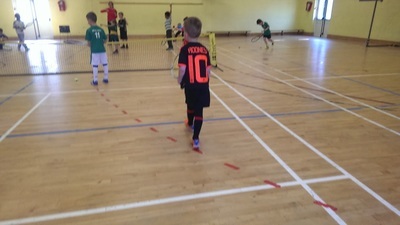 Coaching pupils in Junior Infants and First Class he demonstrated a level of interest and enthusiasm for the sport and the pupils that was second to none. 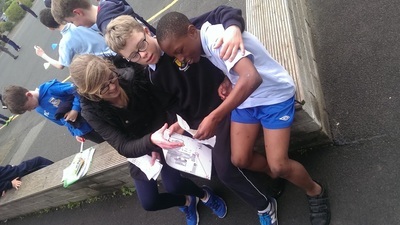 We very much appreciate Sam's work with the boys as well as his patience and kindness towards all. 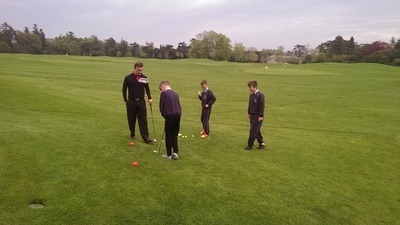 The boys ereally enjoyed the lesson and learned a lot. For any parent interested in Gymnastics for their child more information on Excel Gymnastics can be found at ​http://www.excelgc.com/. 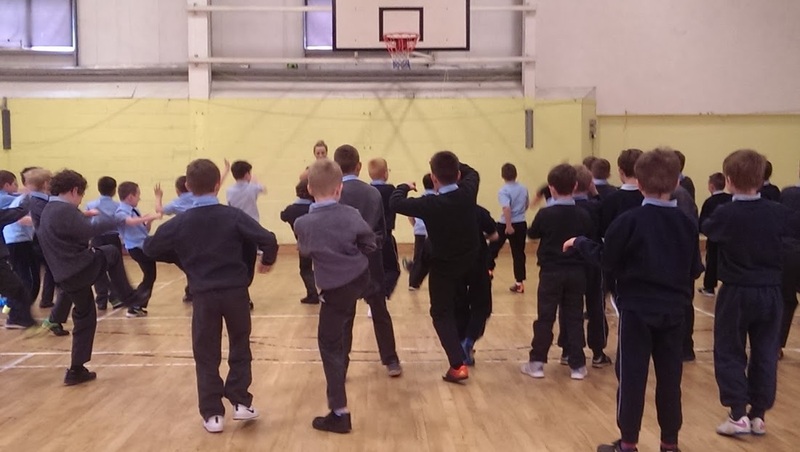 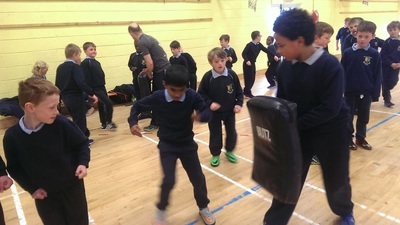 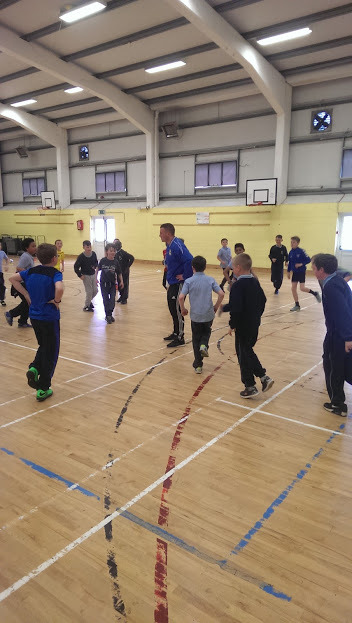 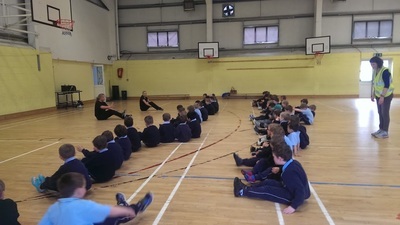 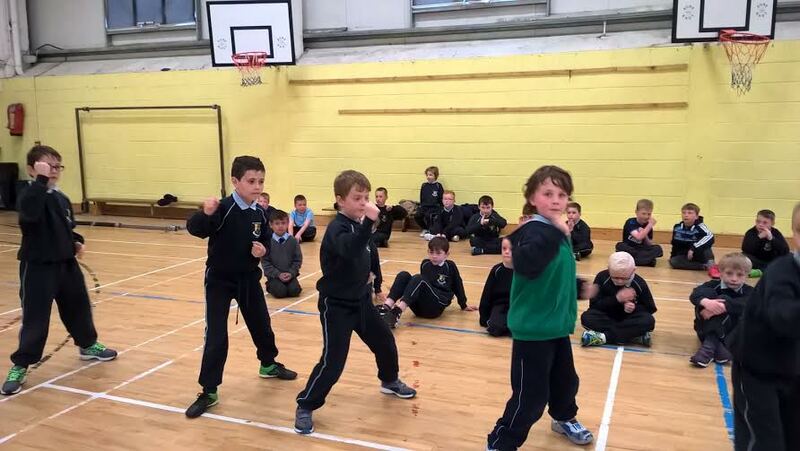 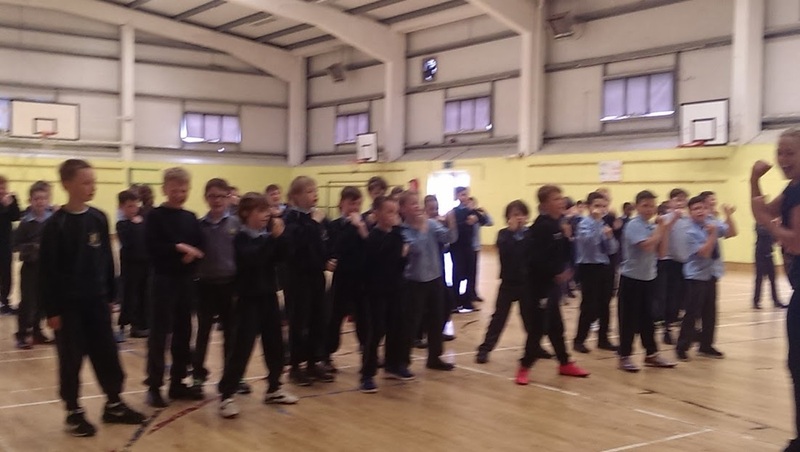 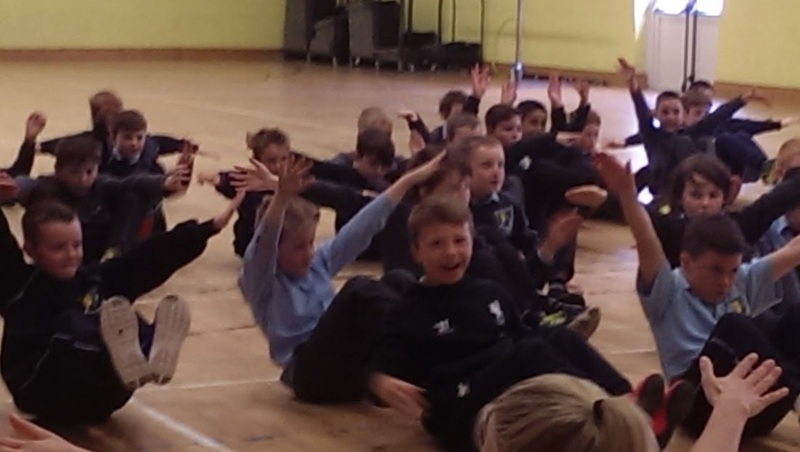 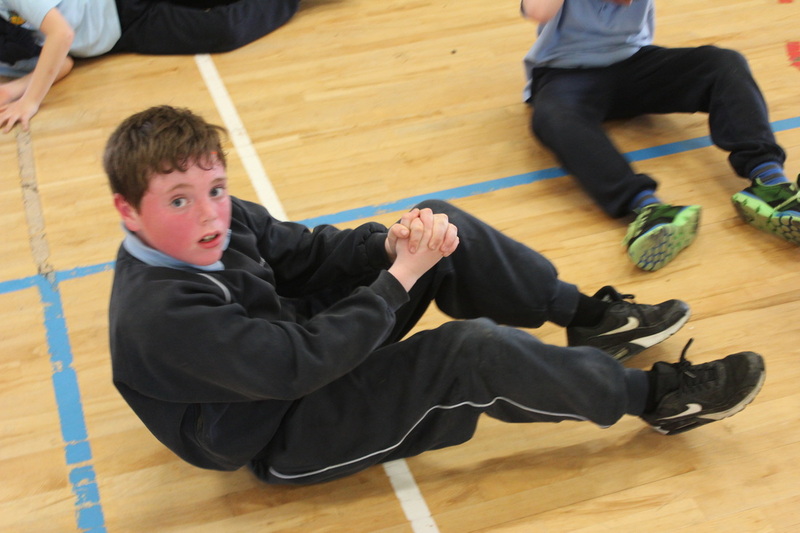 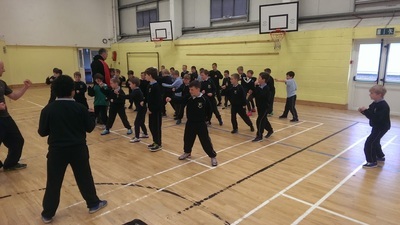 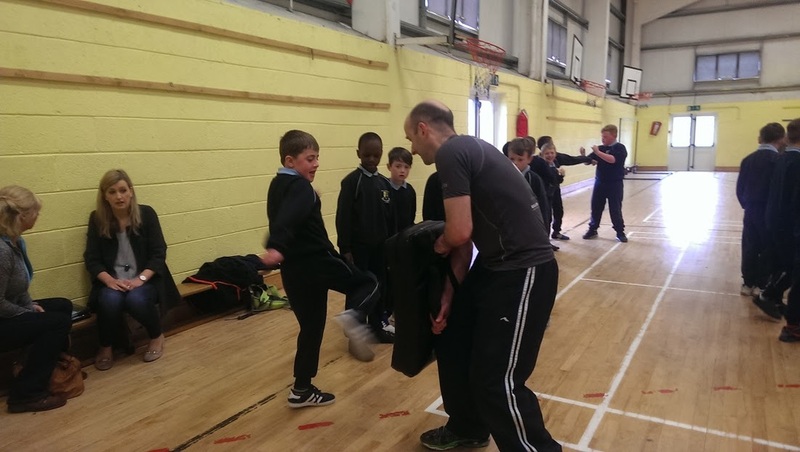 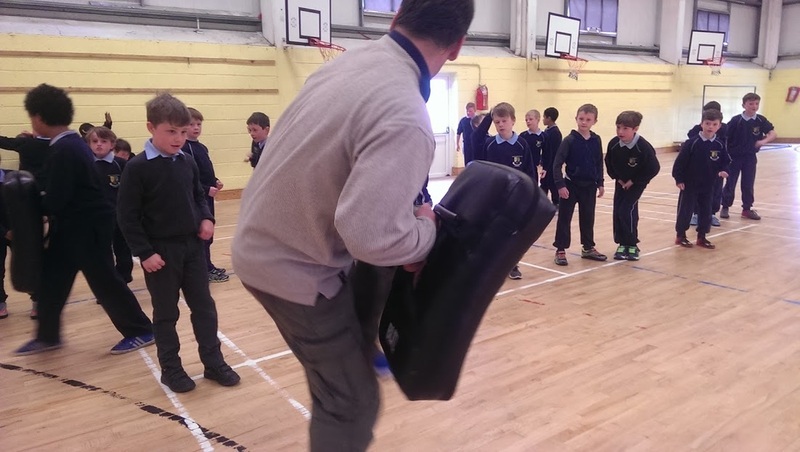 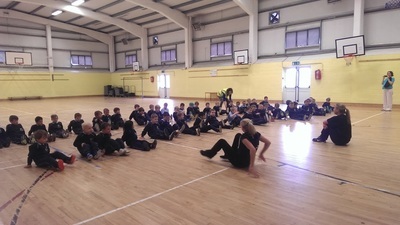 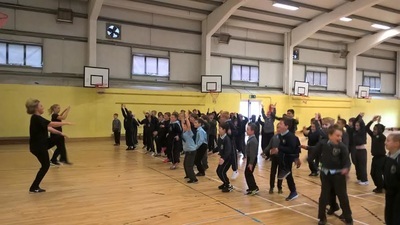 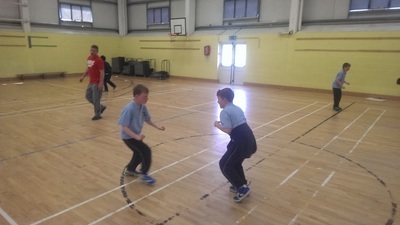 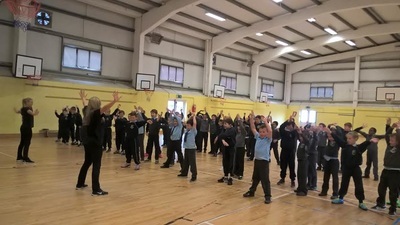 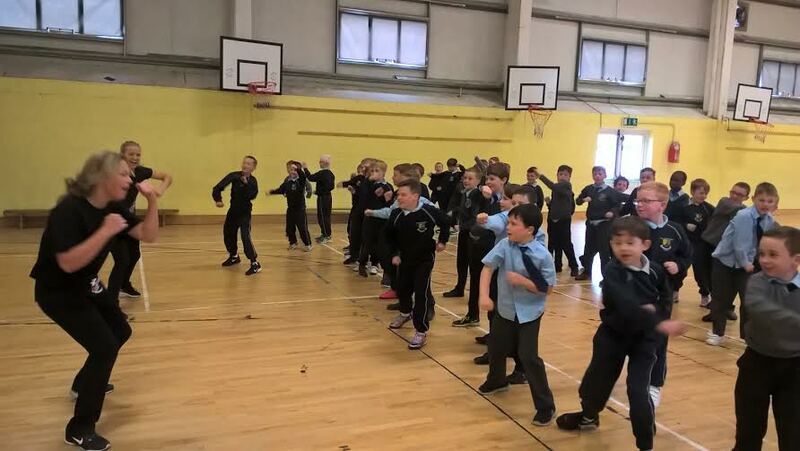 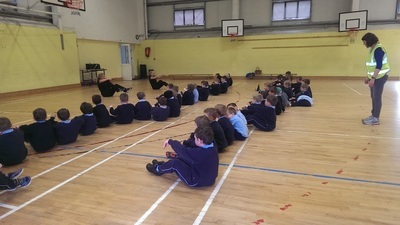 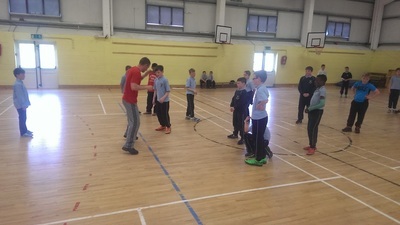 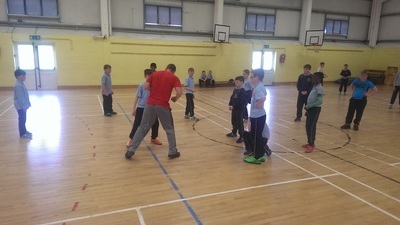 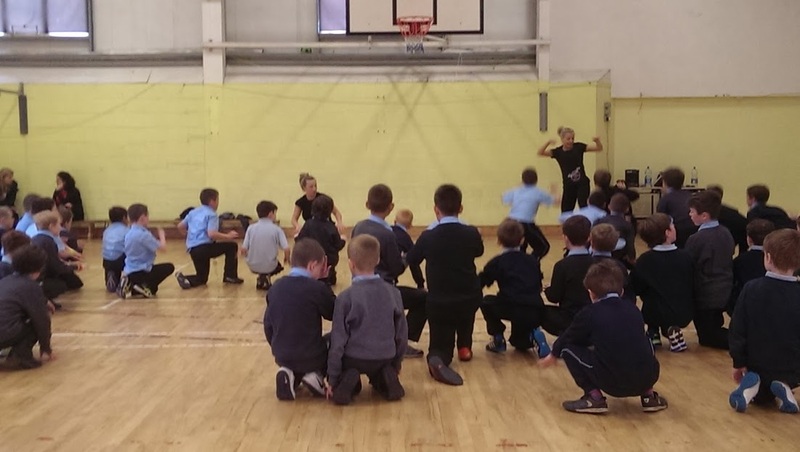 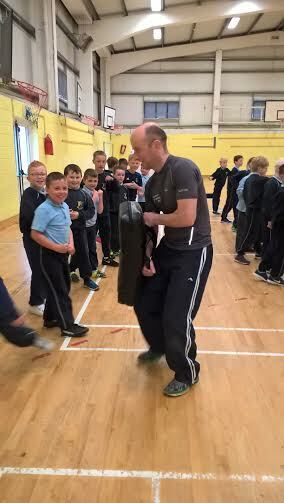 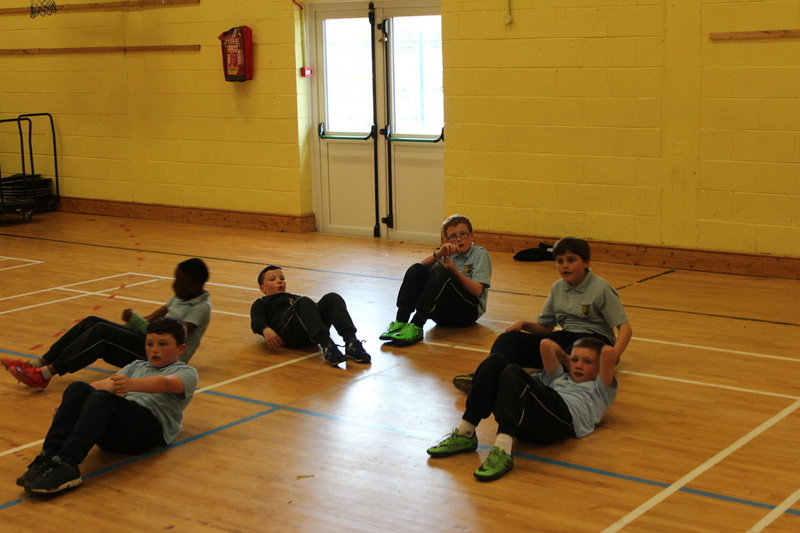 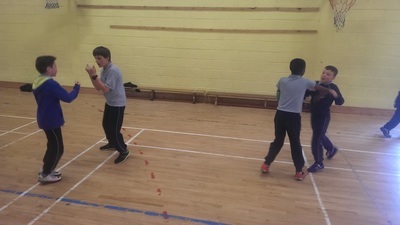 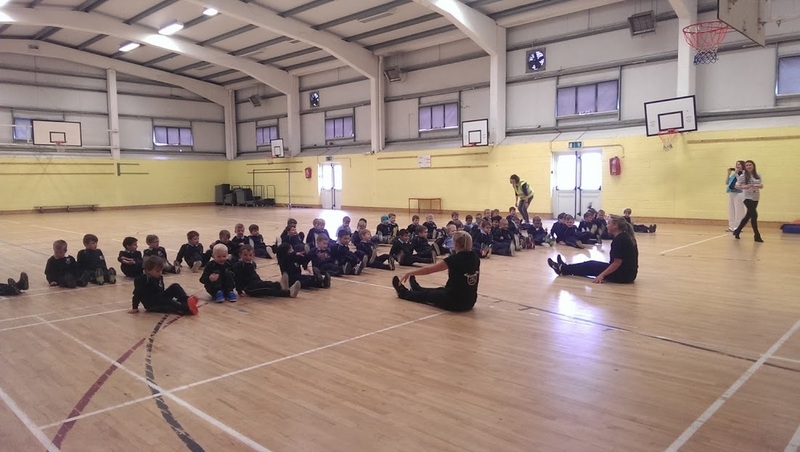 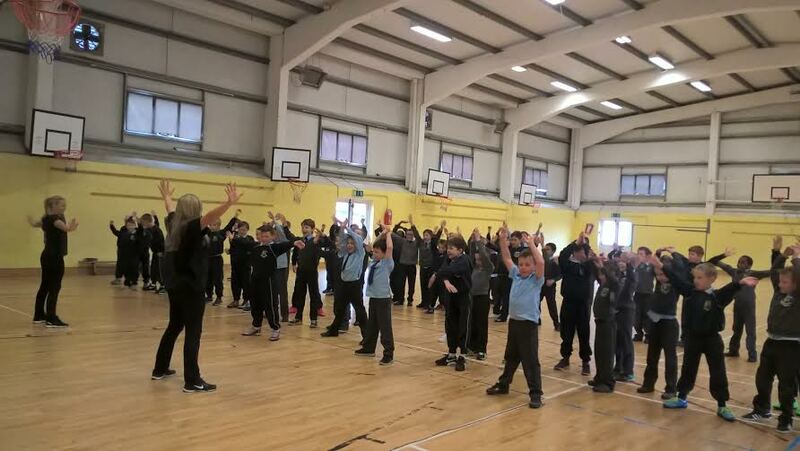 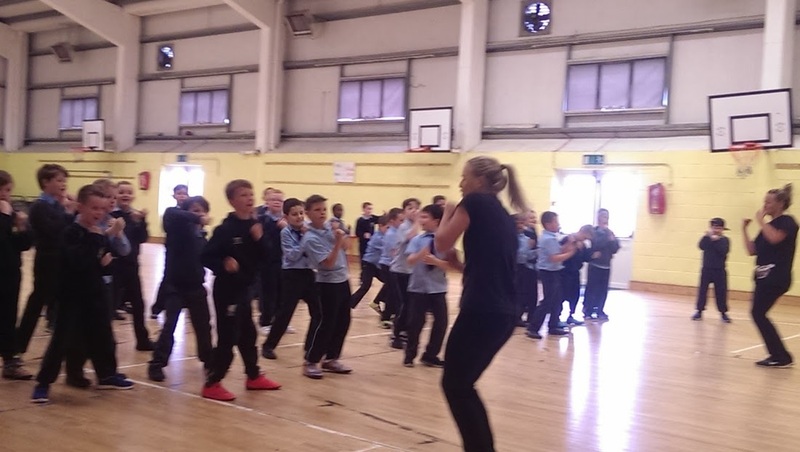 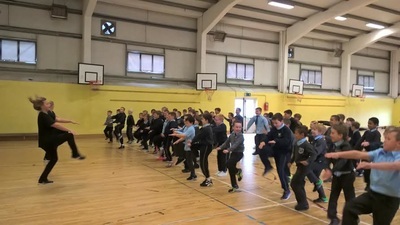 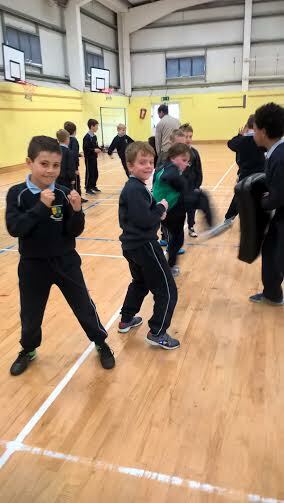 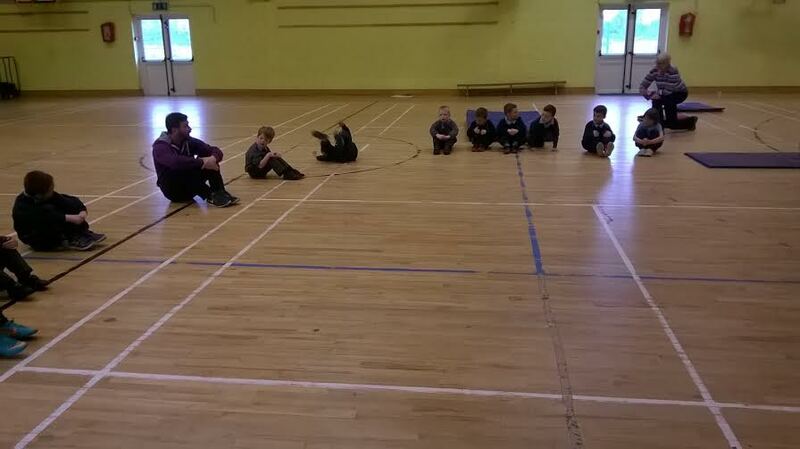 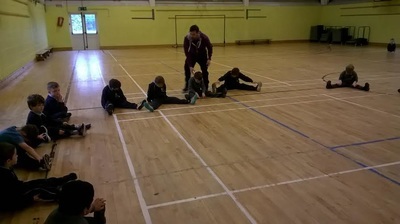 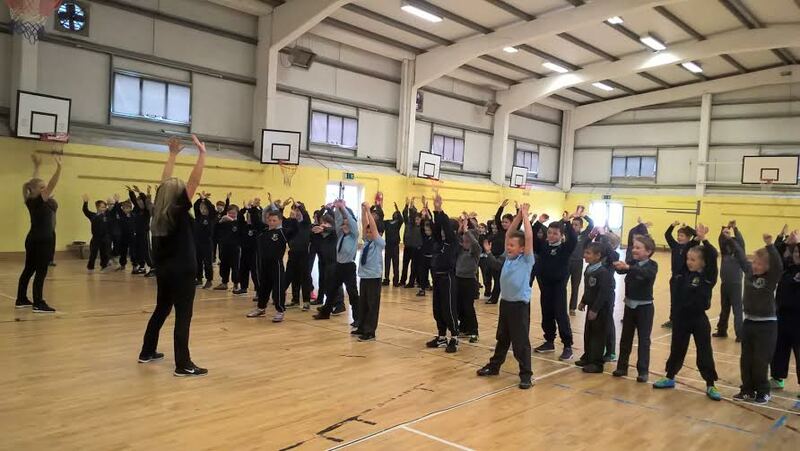 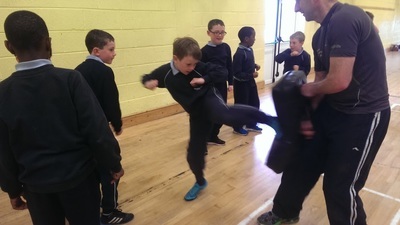 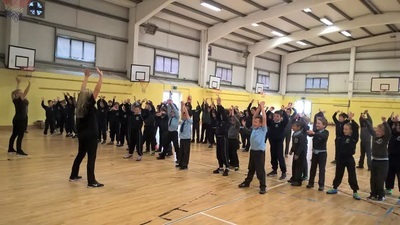 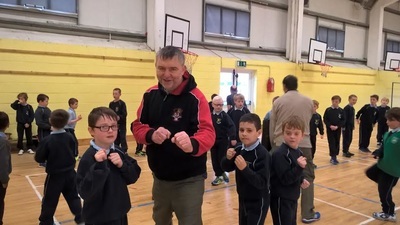 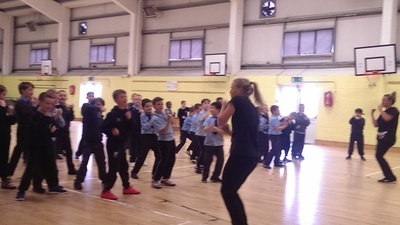 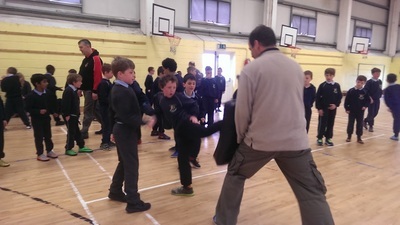 3rd and 4th Class pupils spent a half an hour in the company of local fitness instructor and boxing coach Ger Kavanagh. 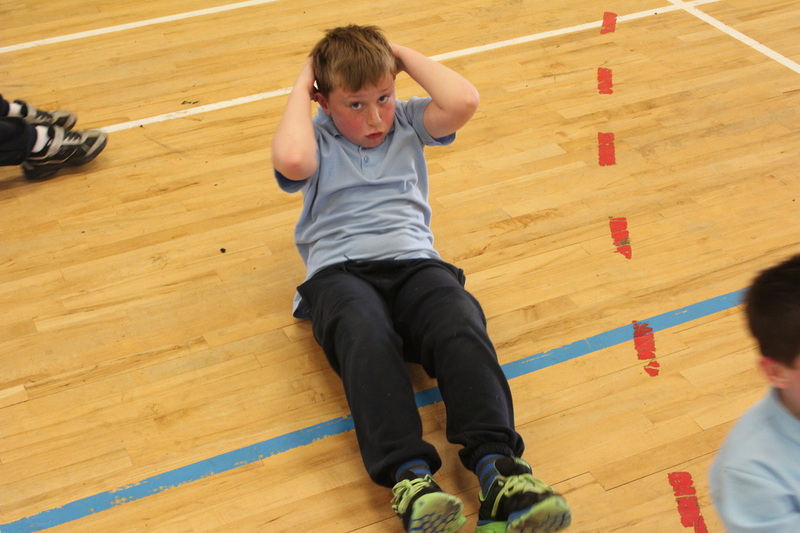 After a vigorous warm-up to some very upbeat music, the boys broke into 4 groups where they completed circuits of sit ups, press ups, mountain climbers and burpees. 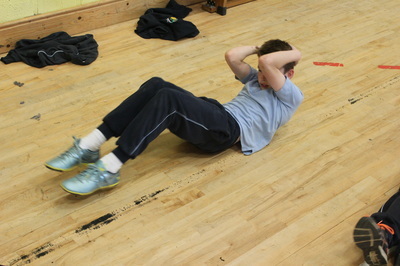 Ger certainly worked the boys hard and the general consensus was they were 'Wrecked' afterwards. Check out the pictures below. 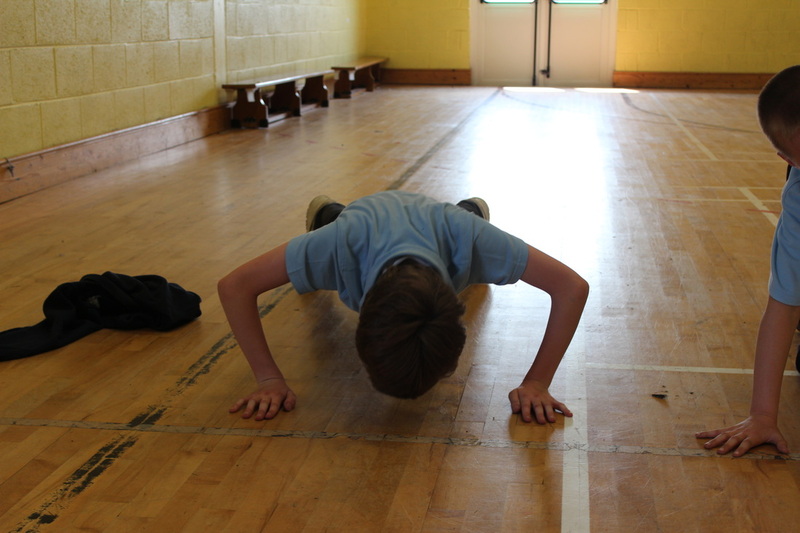 You'll be forgiven for feeling tired just looking at the pictures of the boys working out! 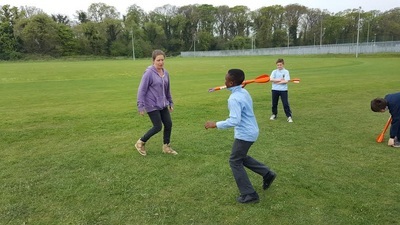 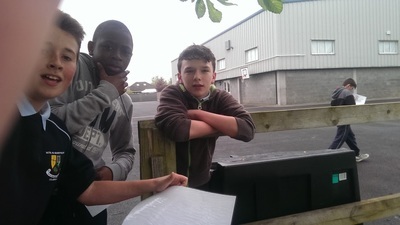 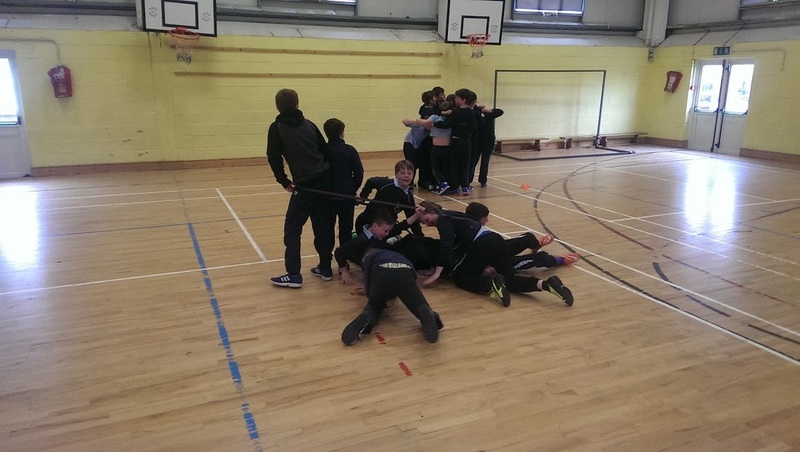 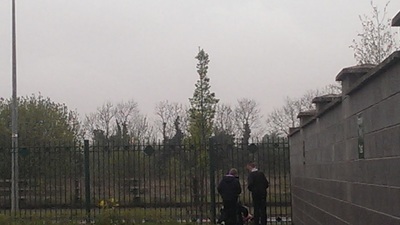 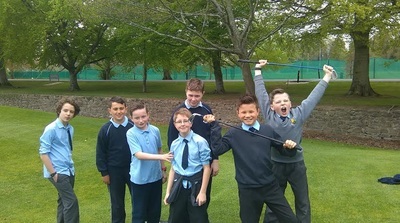 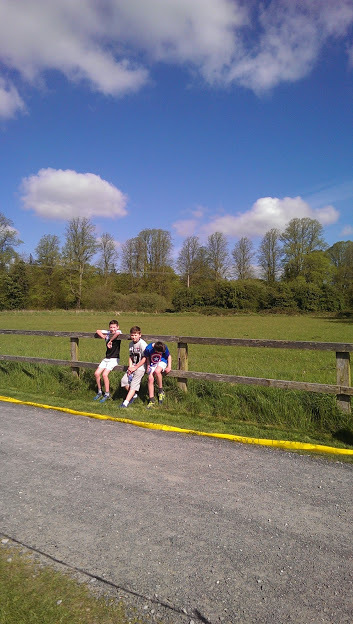 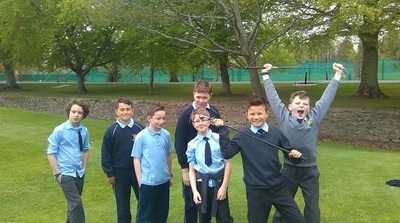 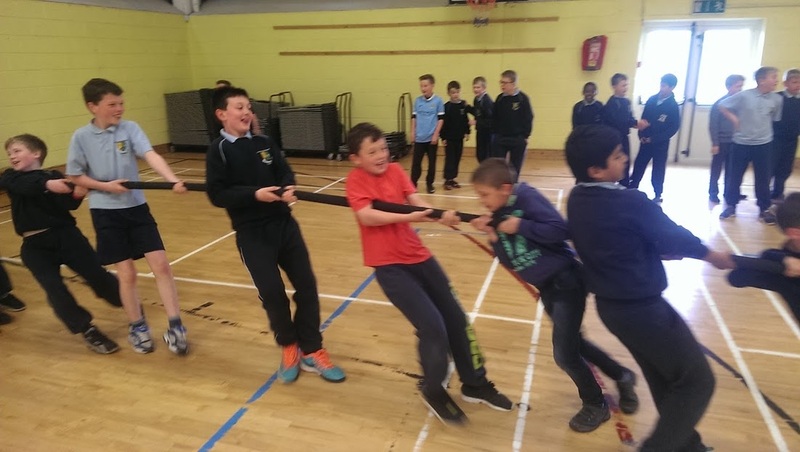 The famous quote "We didn't realise we were making memories, we just knew we were having fun" appropriately sums up the events of May 12th 2016 in the lives of the 6th Class boys in Scoil Na Mainistreach. 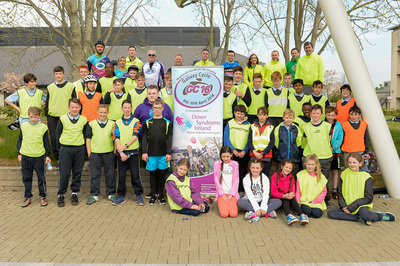 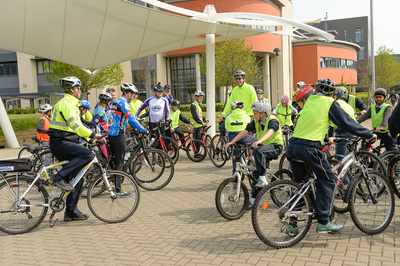 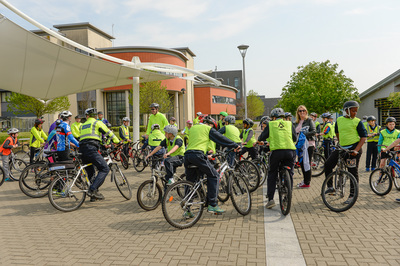 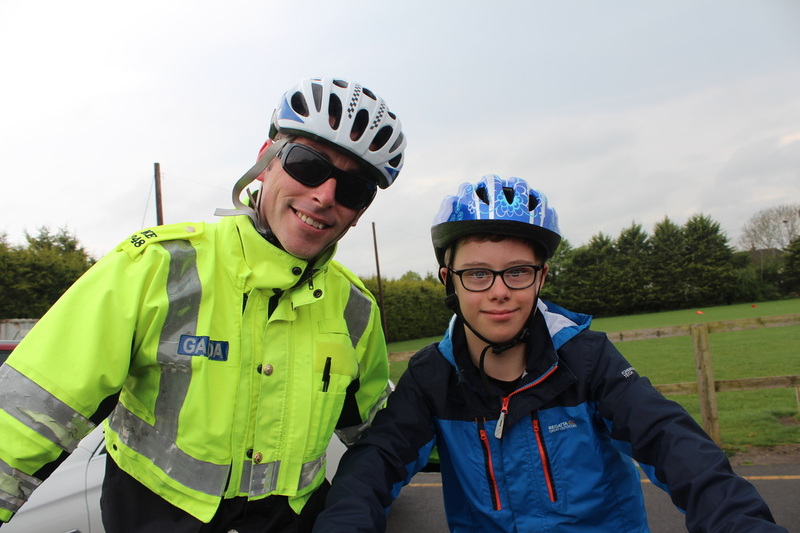 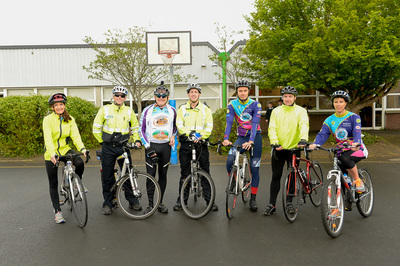 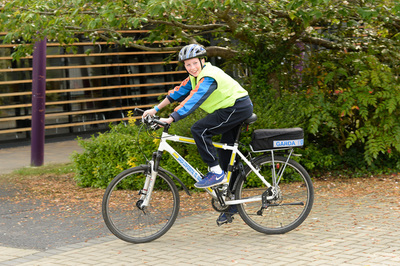 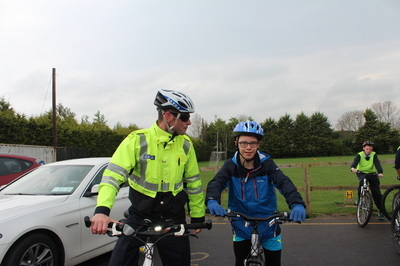 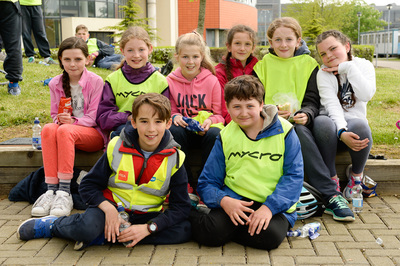 Joined by pupils from Primrose Hill National School in Celbridge the boys along with teachers, parents, members of An Garda Síochána and a support van from Maynooth Cycles set out on bicycle for Maynooth University. 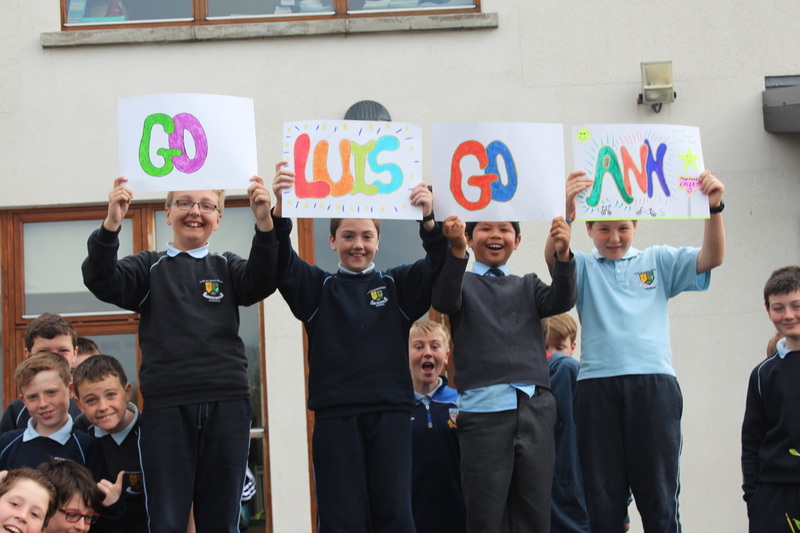 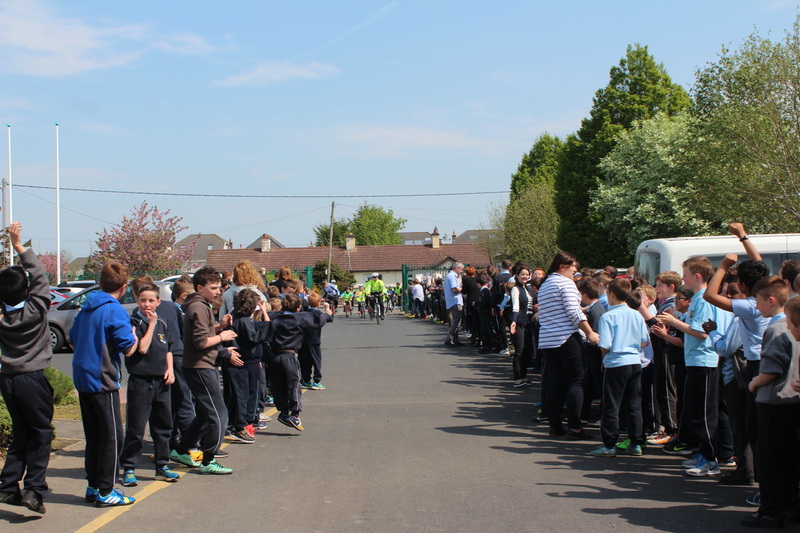 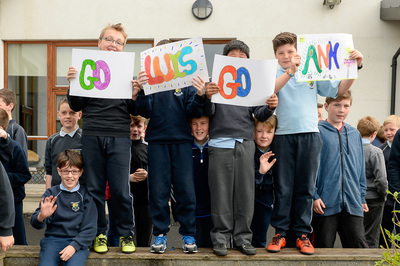 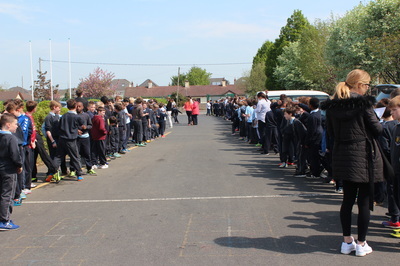 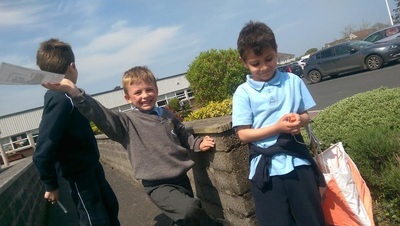 The excitement and atmosphere as the boys left the school was one of many highlights as the 500+ population of Scoil Na Mainistreach gathered to wave the boys off. 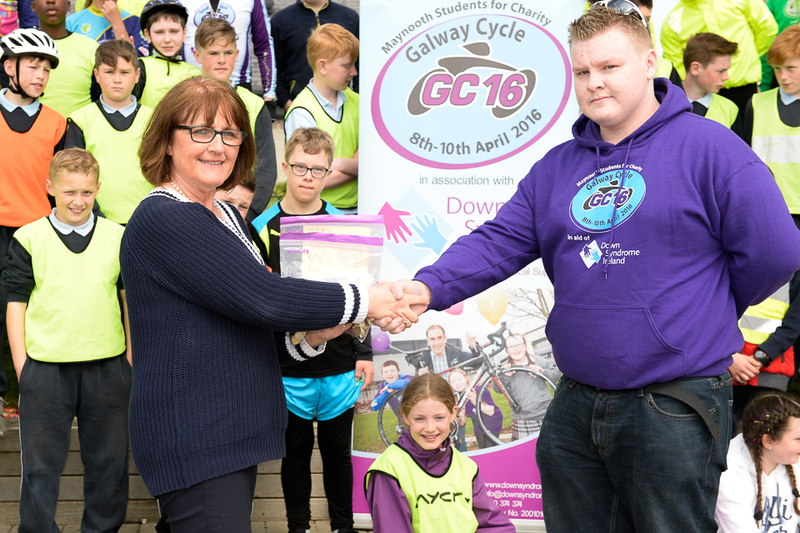 In Maynooth we were met by Aaron Darcy, President of the Galway Cycle, a charity based in the University which every year raises thousands of Euros for charity. 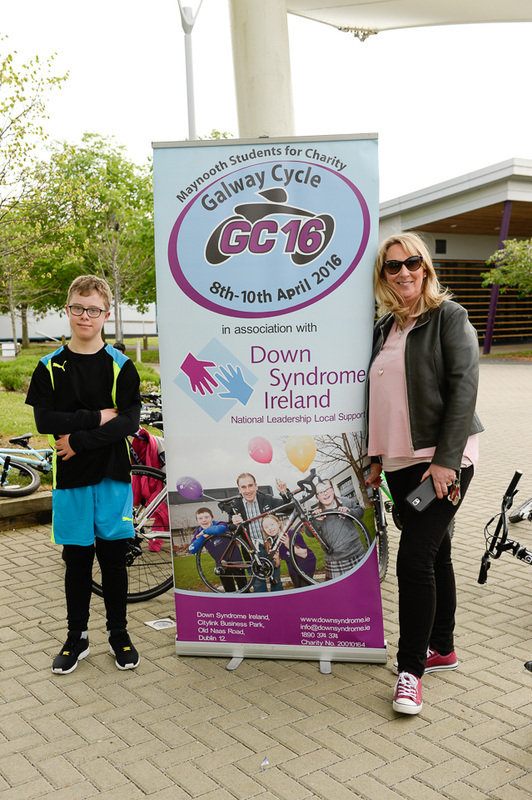 This year the chosen charity was Down Syndrome Ireland. 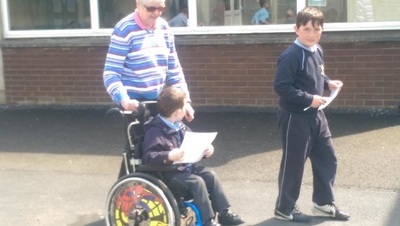 The pupils of Scoil Na Mainistreach and Primrose Hill together raised over €400 which we presented to Aaron today. 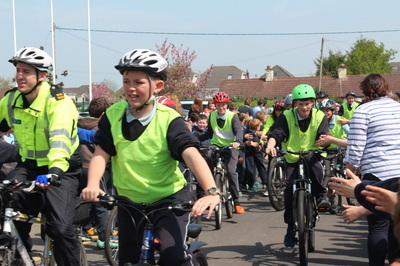 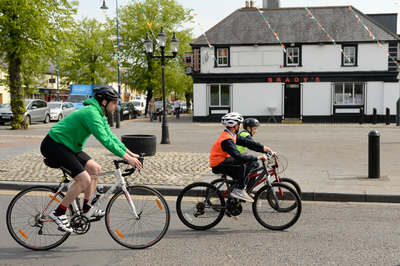 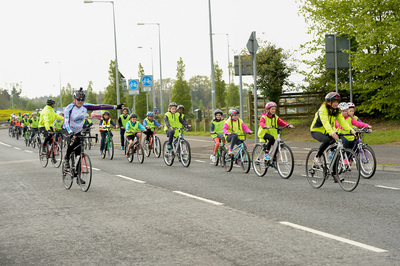 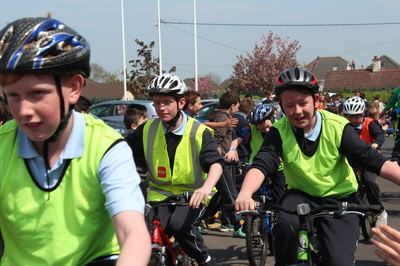 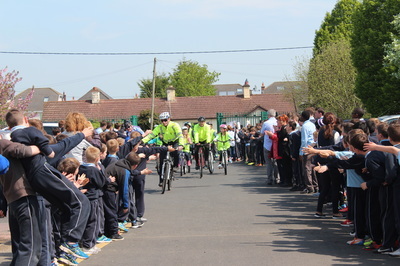 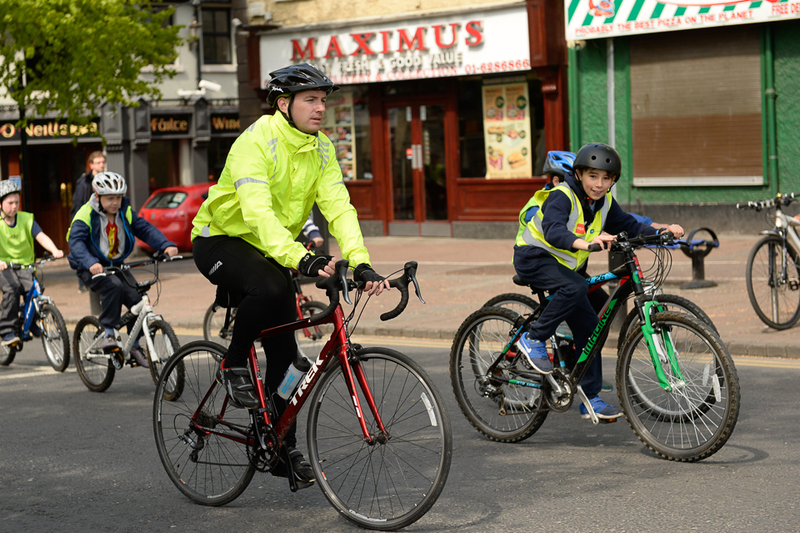 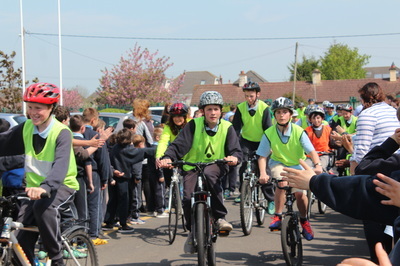 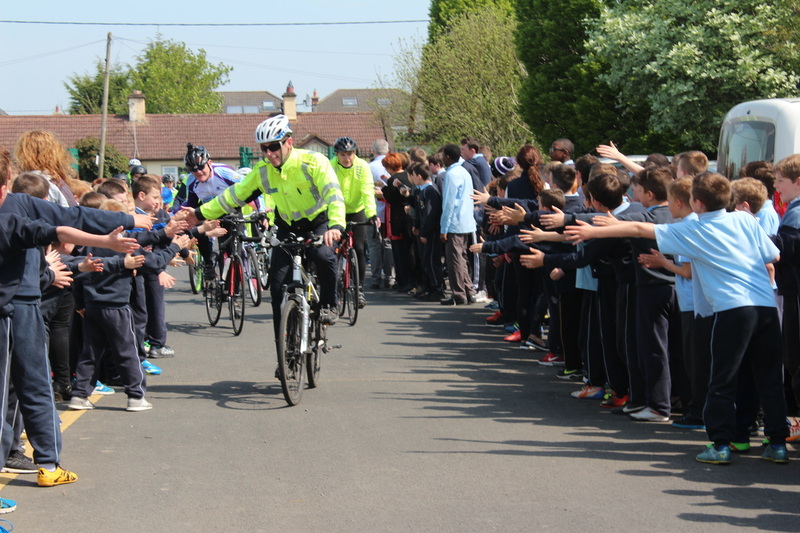 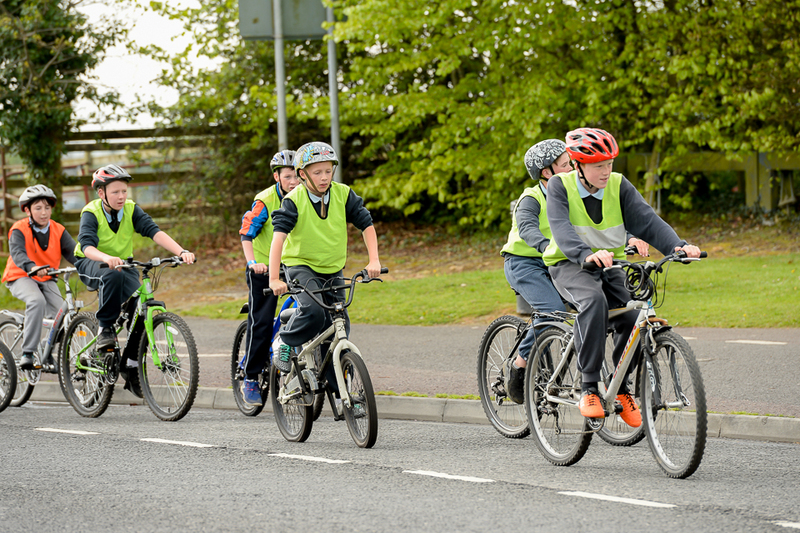 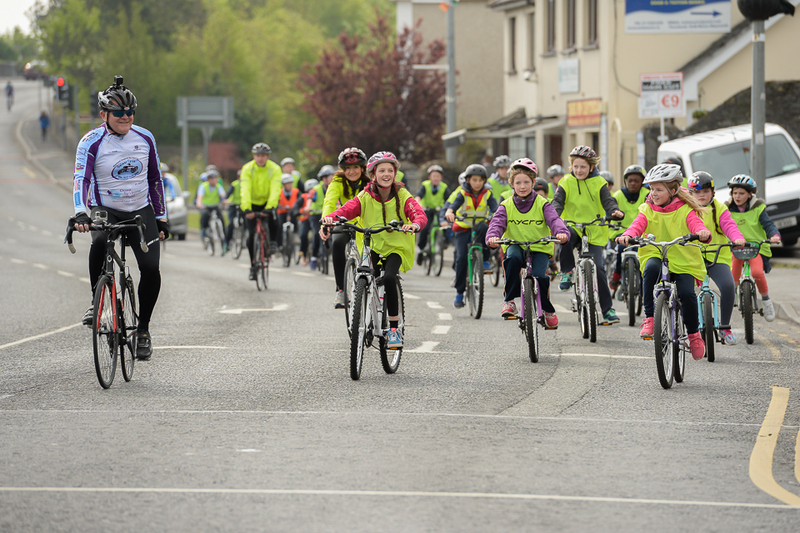 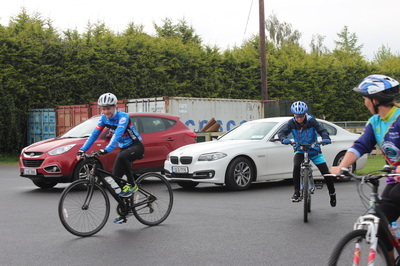 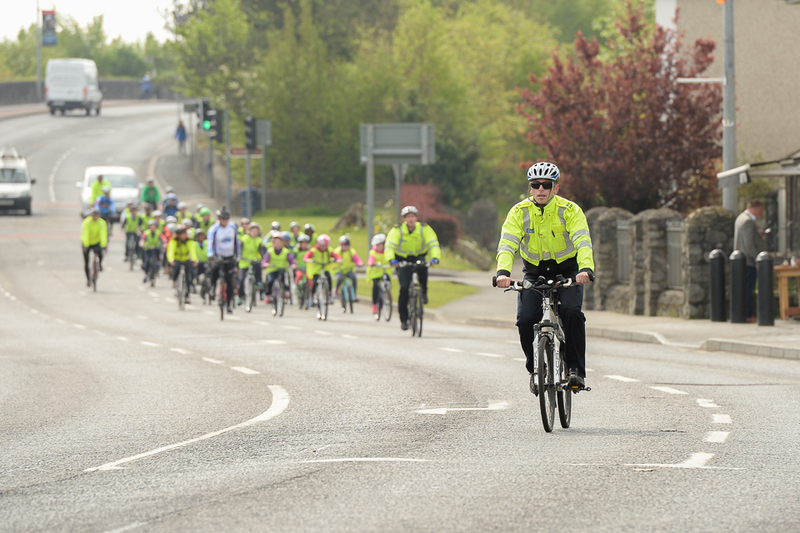 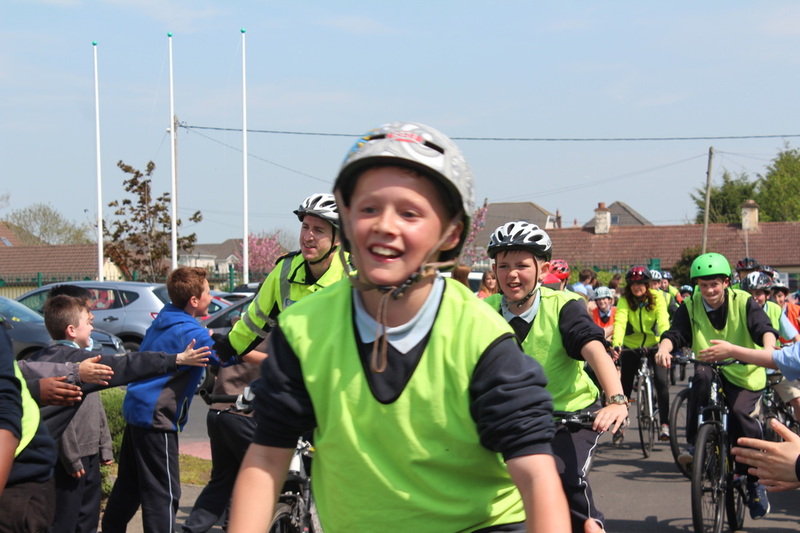 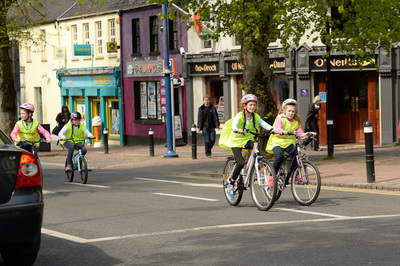 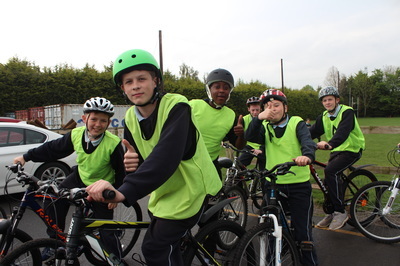 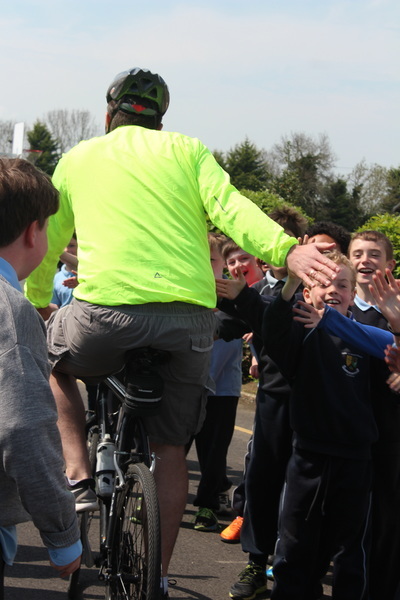 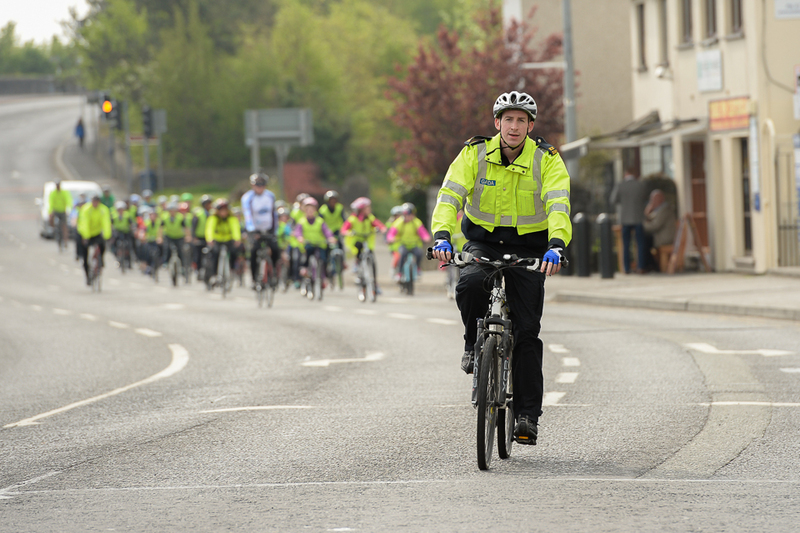 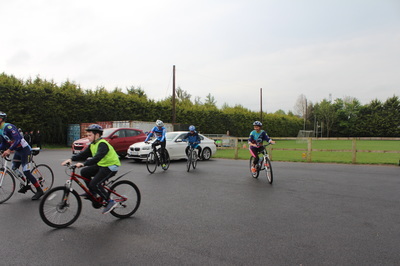 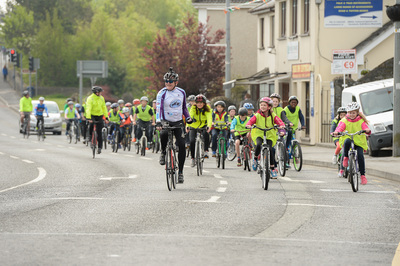 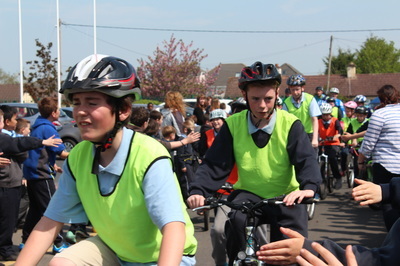 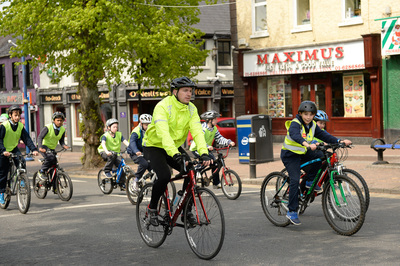 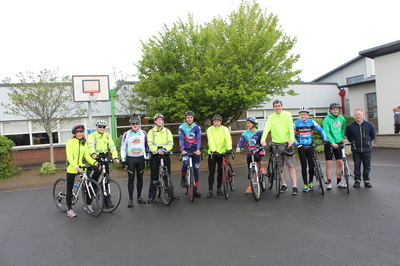 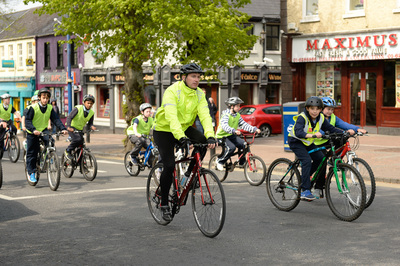 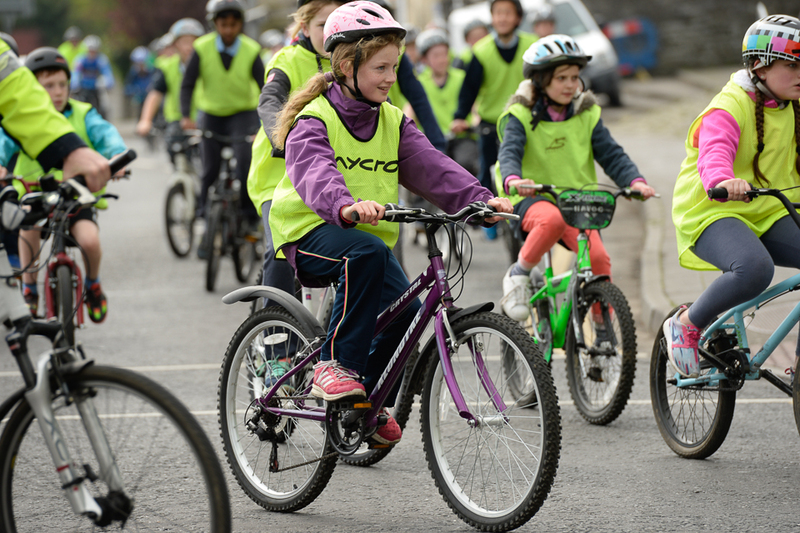 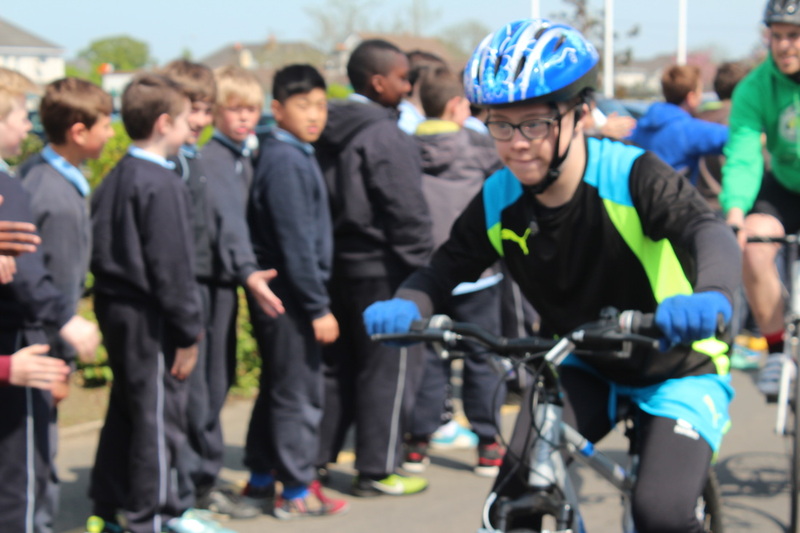 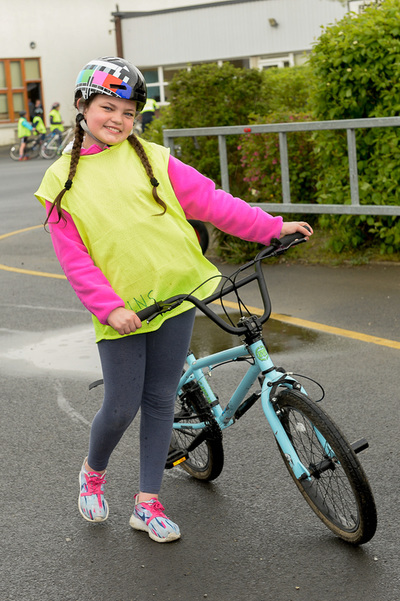 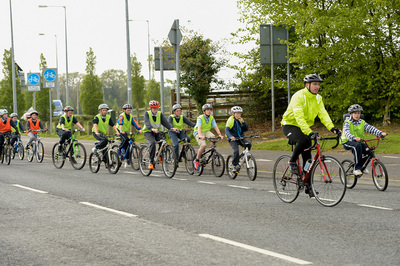 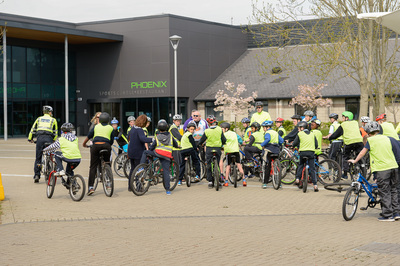 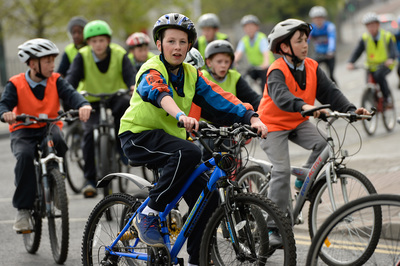 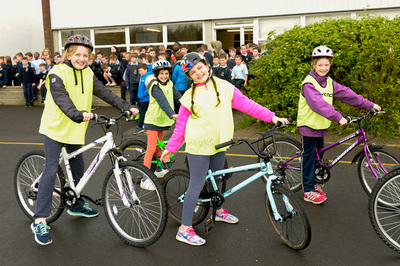 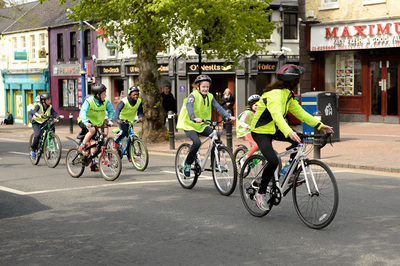 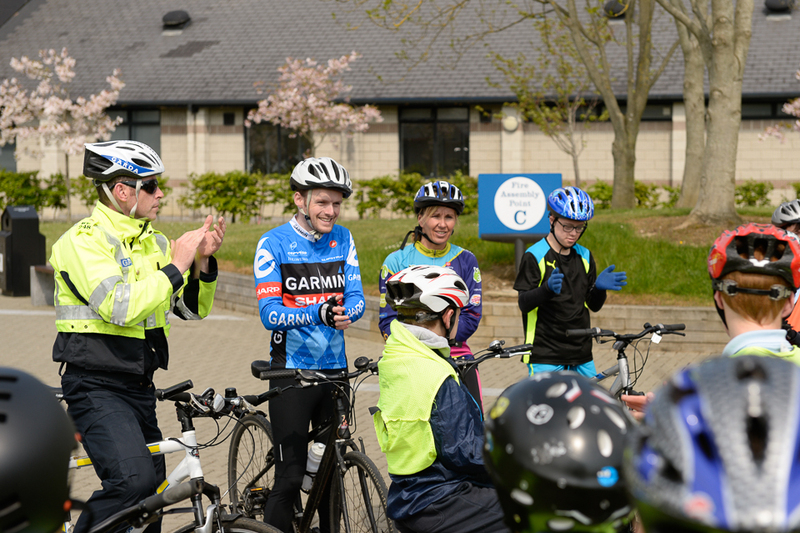 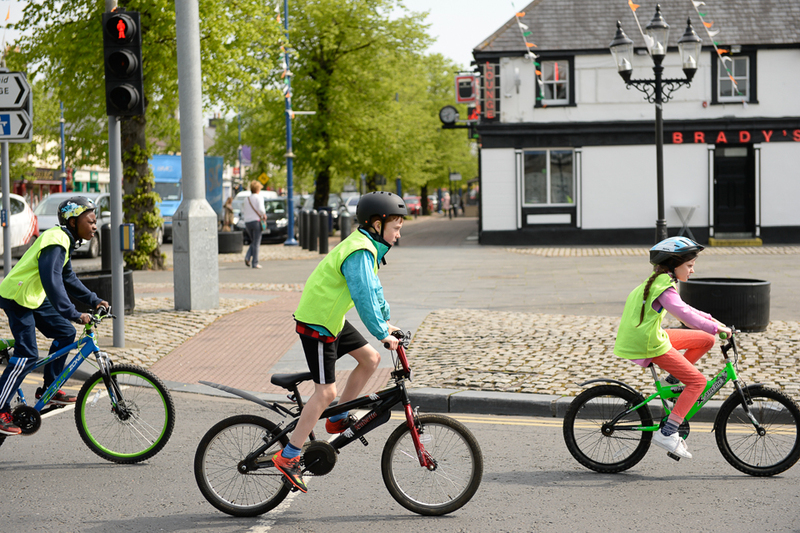 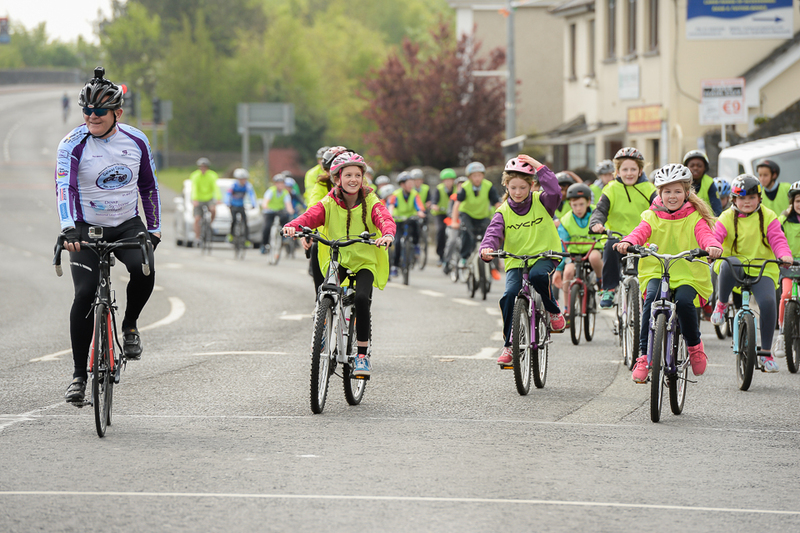 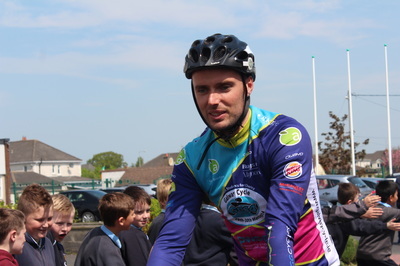 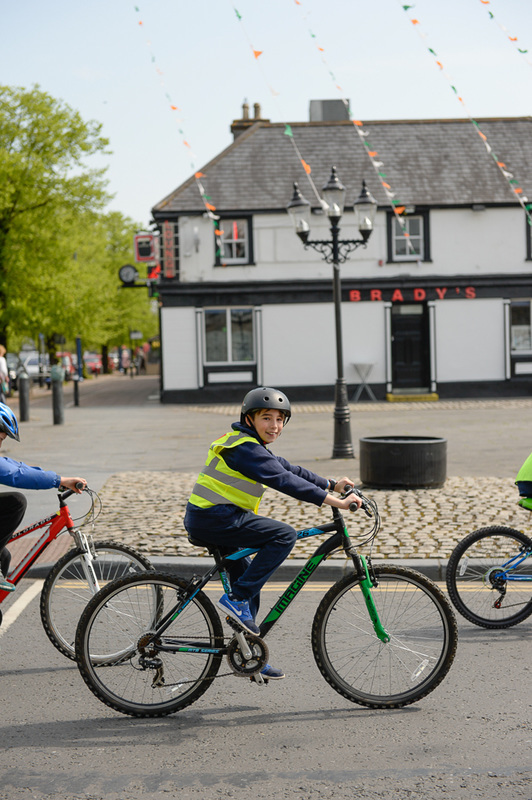 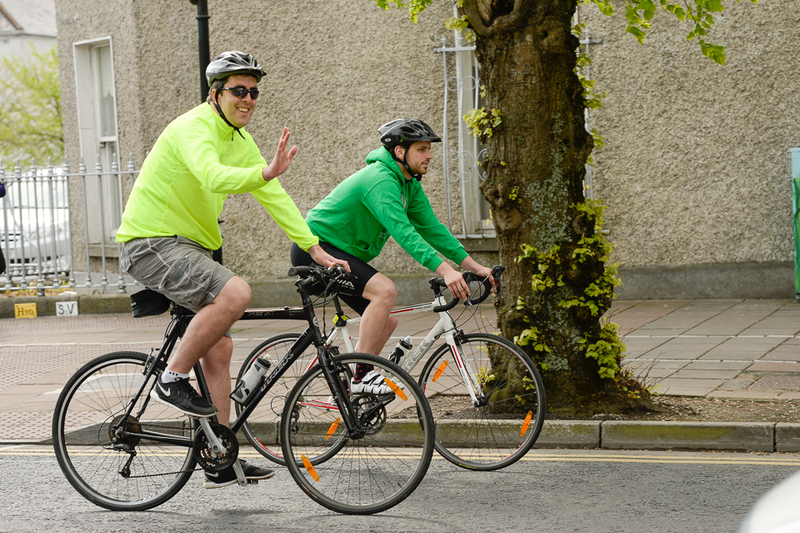 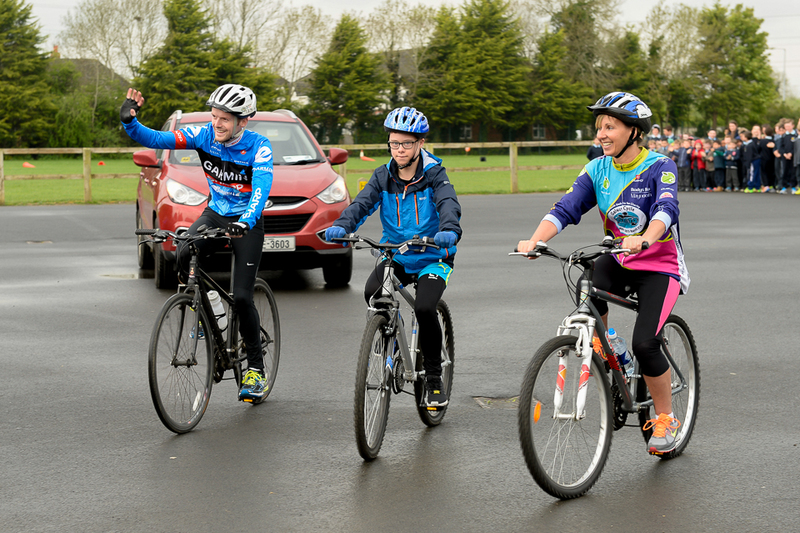 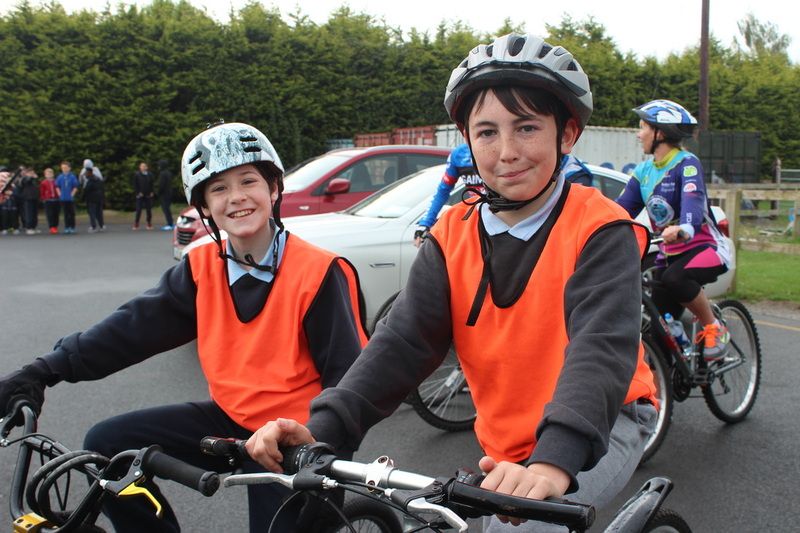 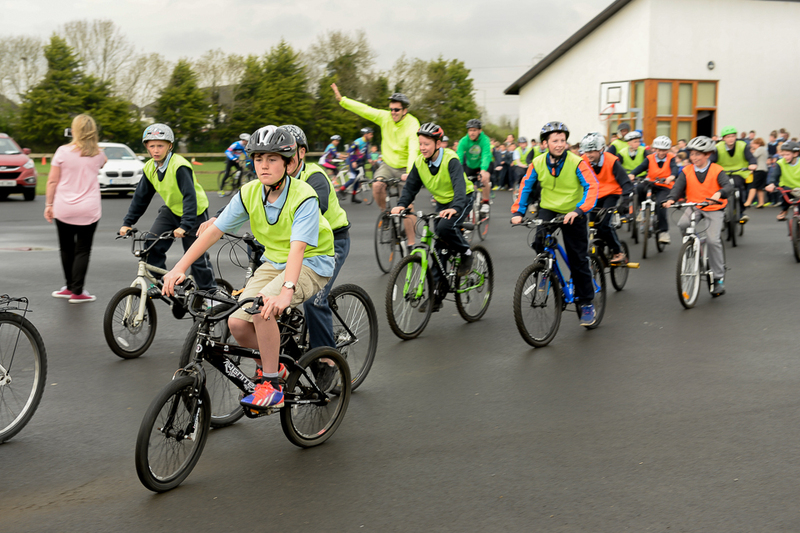 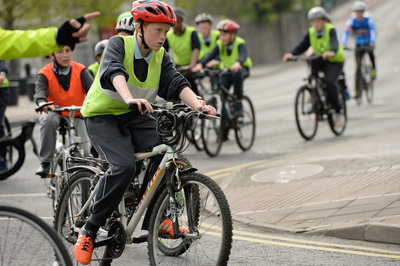 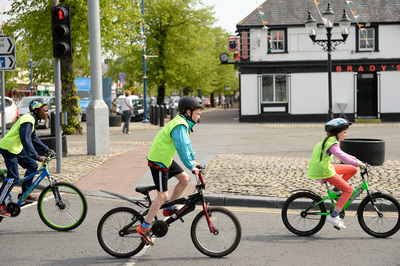 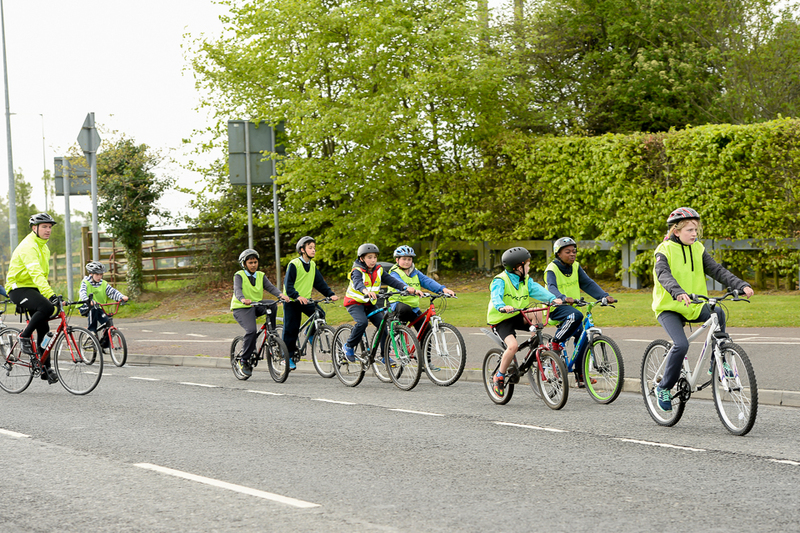 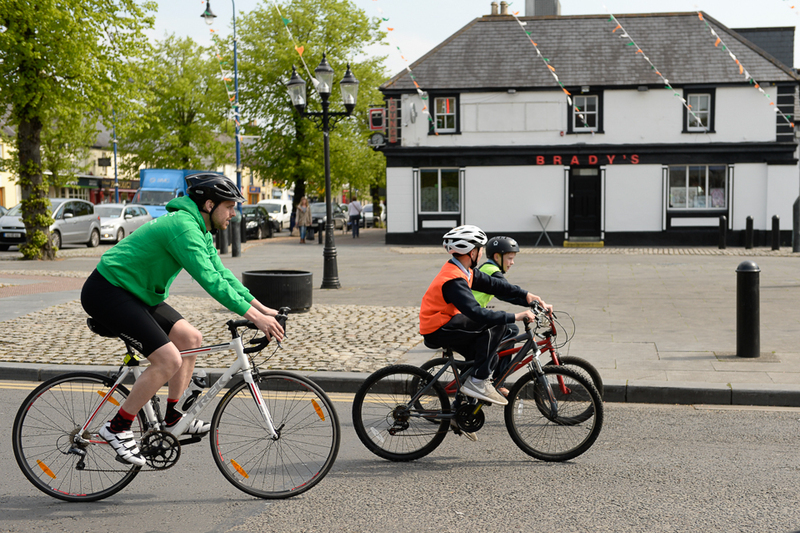 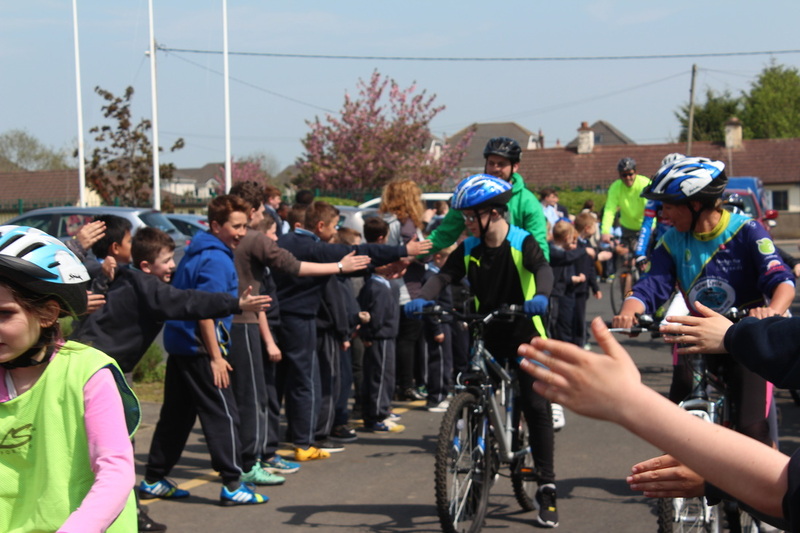 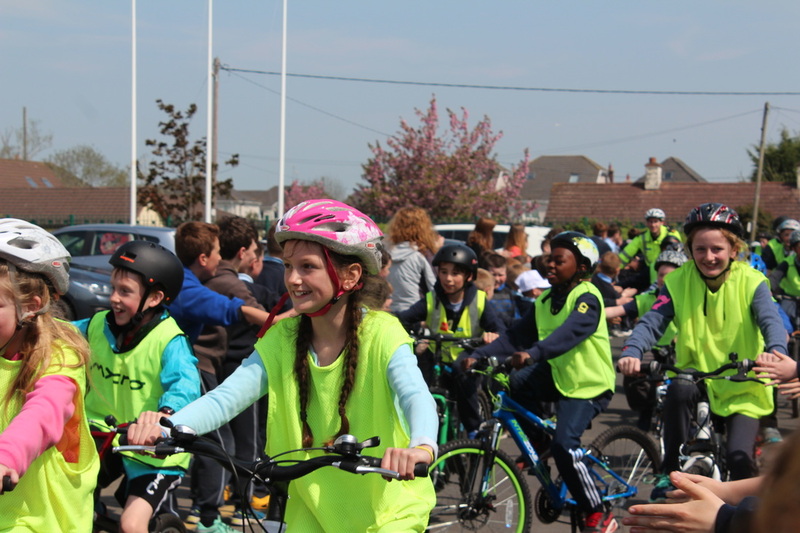 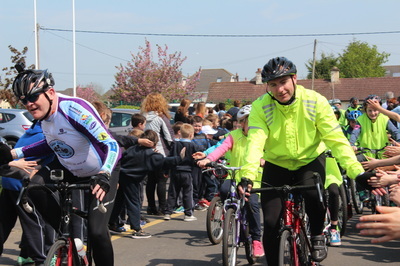 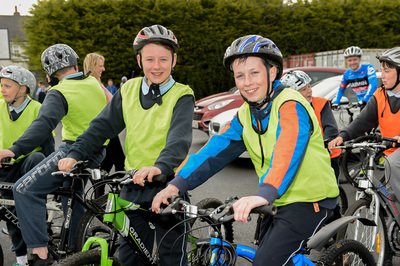 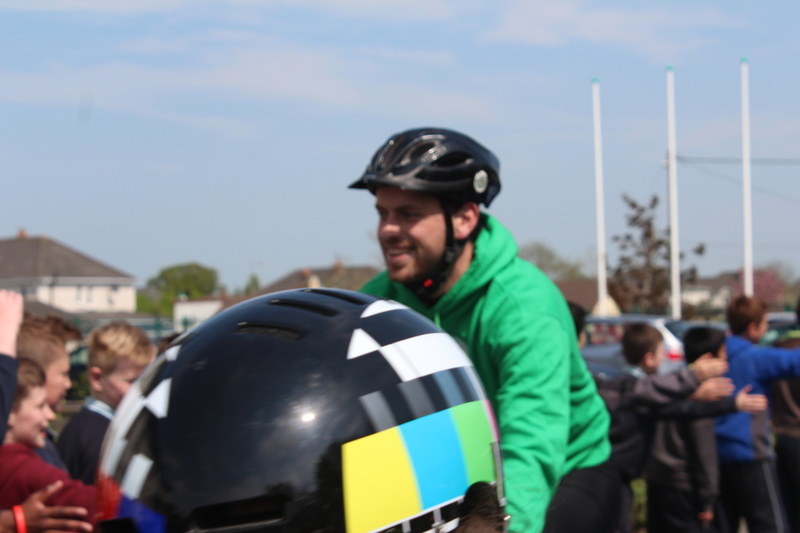 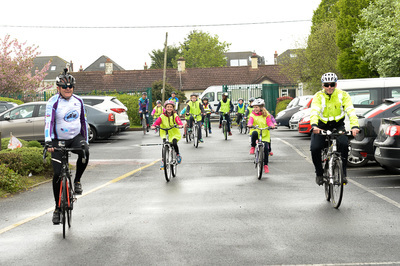 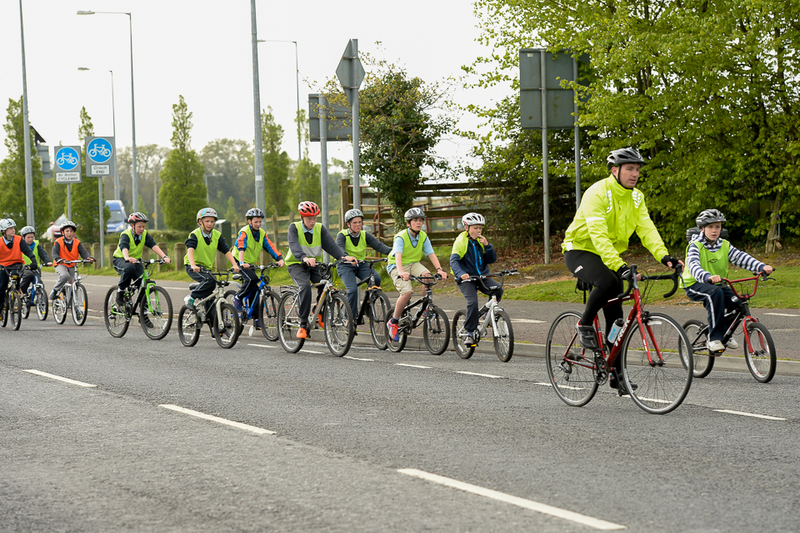 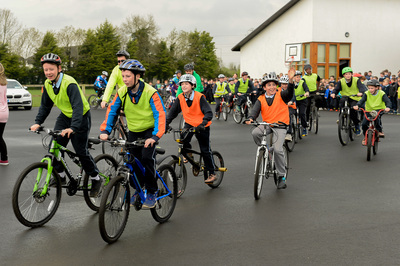 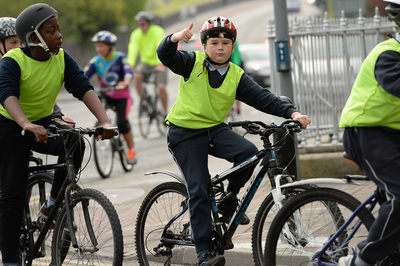 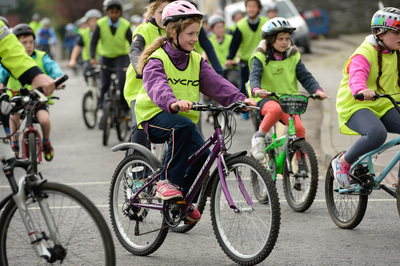 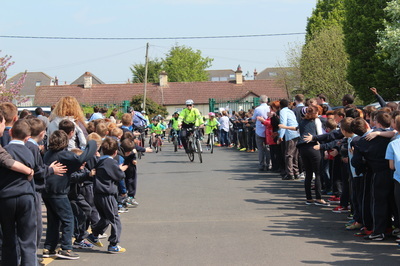 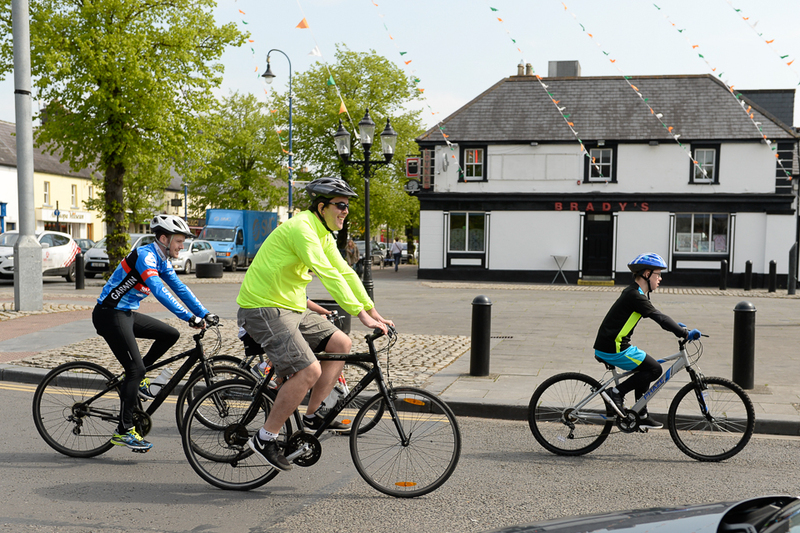 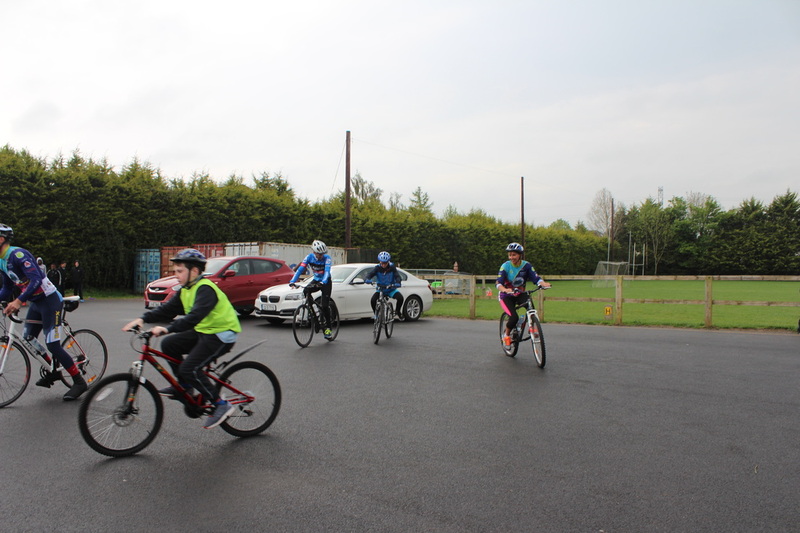 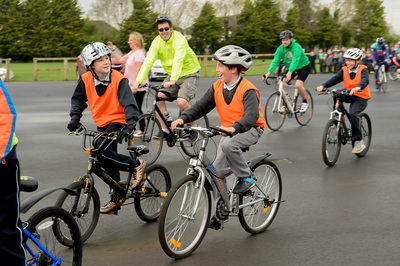 On return, the near 60 strong group cycled up main street in Celbridge, bringing traffic to a standstill before returning to a guard of honour from the whole school community all the way in from the front gate. 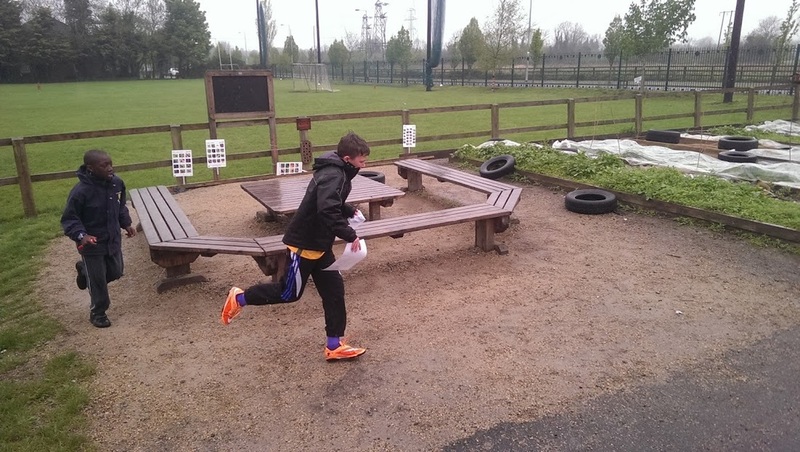 Many were shattered from the journey, probably didn't realise they were making memories but all knew they had fun. Local Gardaí Aidan and Conor from Celbridge Garda Station went out of their way to ensure that today's event was a huge success. 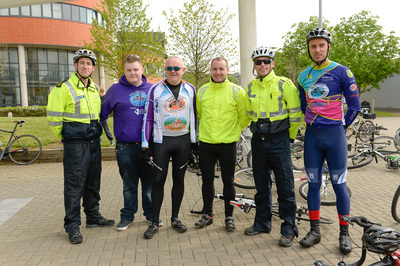 Both men gave up their day off work to support this wonderful cause and for that we are very appreciative. 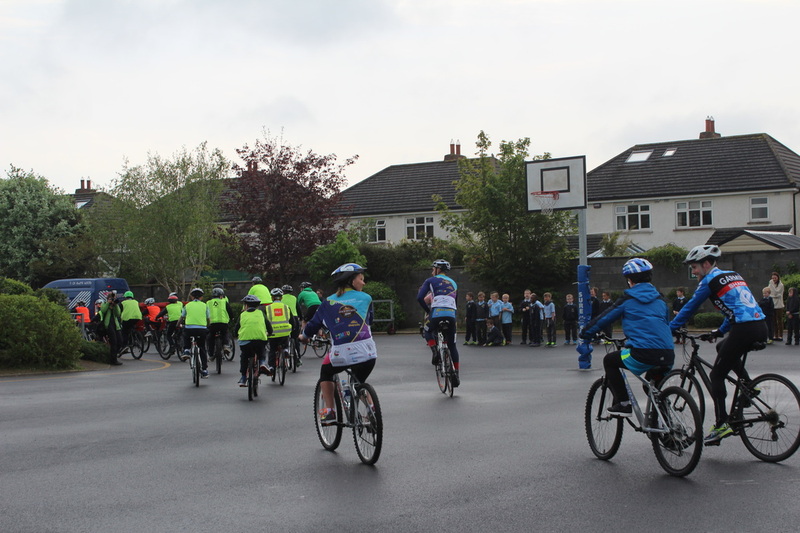 Their professionalism and attention to detail ensured the safety of everyone on the cycle and for that we are very grateful. 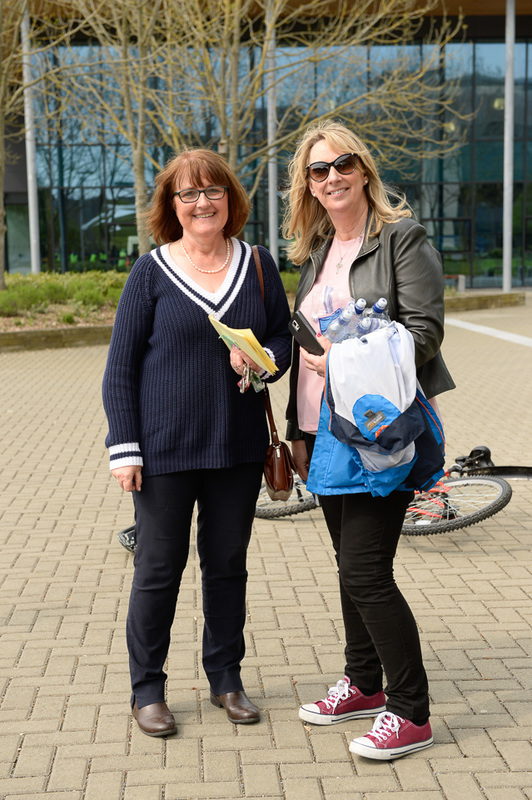 Our support drivers Teresa and Sandra kept a watchful eye from behind the peloton while Jolanta was on hand with her camera to capture the many magical moments. 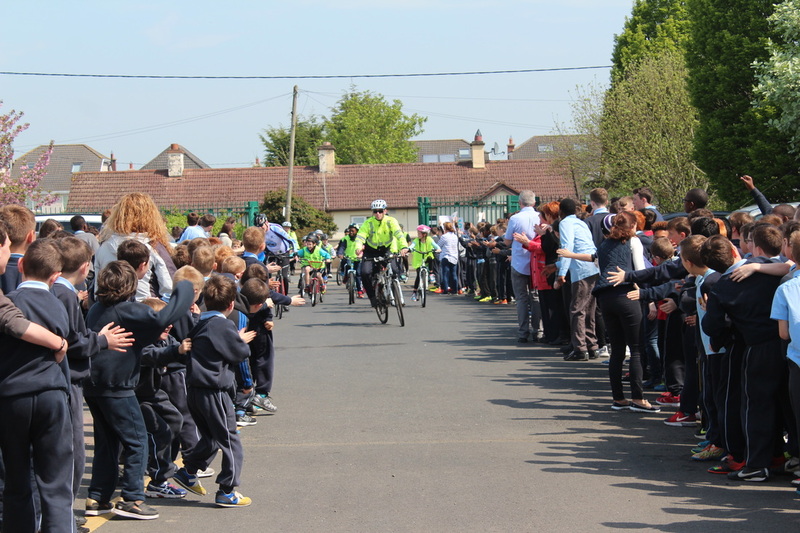 We look forward to seeing her pictures which will as usual be of the highest standard and we will publish them here in the gallery below. The staff of Scoil Na Mainistreach Kevin, Barry, Cáit, Aidan, Dominic, Ann and Pa who cycled on the trip as marshalls ensured the group kept close together at all times whille the whole event would not have taken place without the enthusiasm and determination of Paul Mescal. 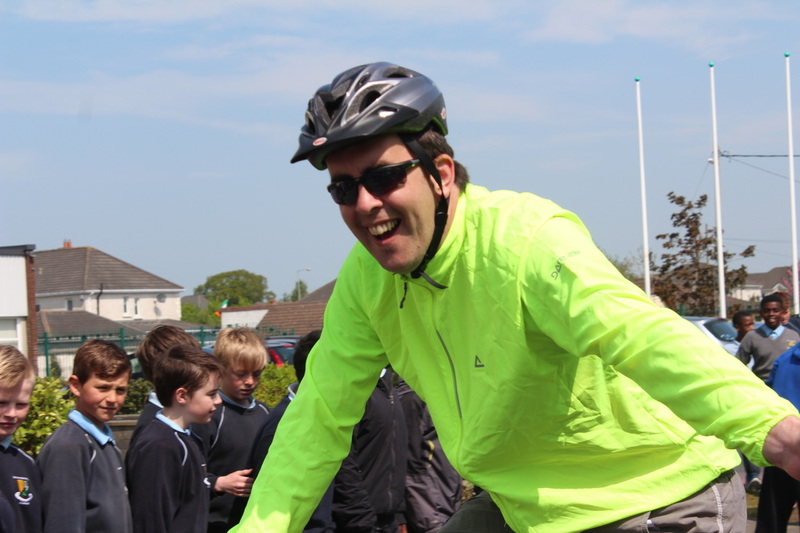 Mr. Mescal is a veteran of a number of Galway Cycles and recently travelled to Galway and back with the group. 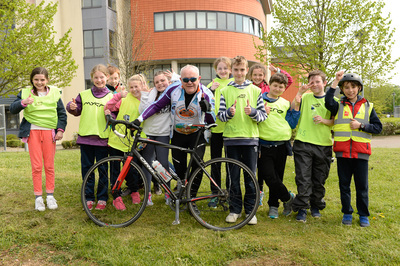 Last year was our first year cycling to Maynooth during Active Week and already it has the feel of an annual event thanks to the efforts of Paul. 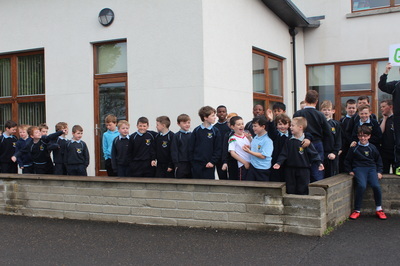 5th Class boys have already been heard talking about next years event in great anticipation. Check out the gallery below for pictures which will be added to over the coming days as more pictures are received. Also a Vidoe of the days events is currently being edited and will be added soon. 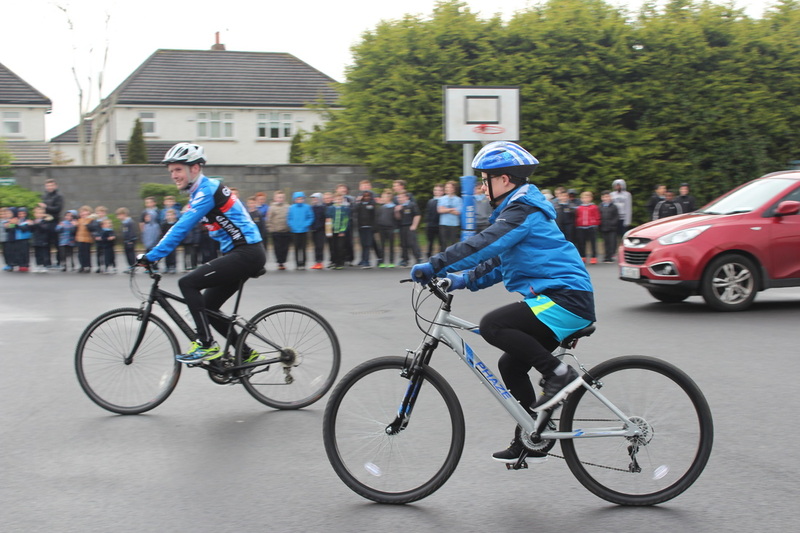 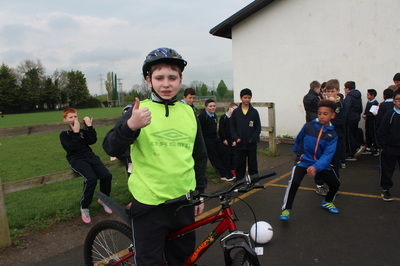 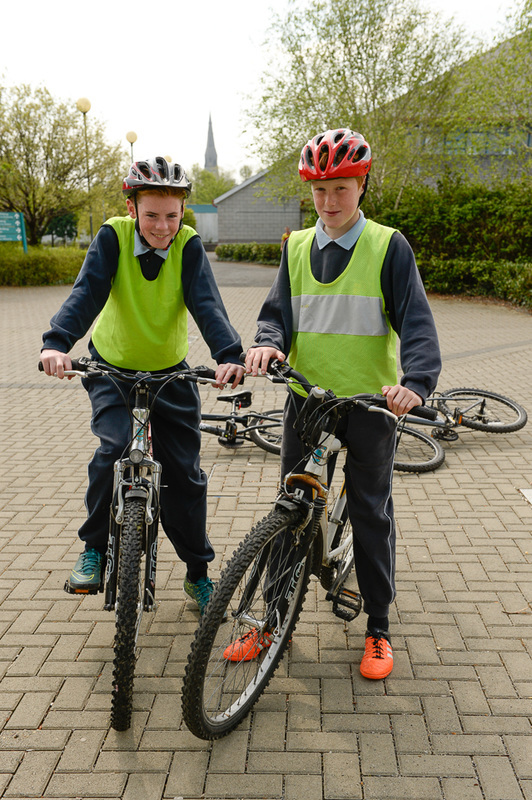 Thursday of Active Week will see the 6th Class boys Cycle to Maynooth in a fundraising drive to raise funds for Down Syndrome Ireland. 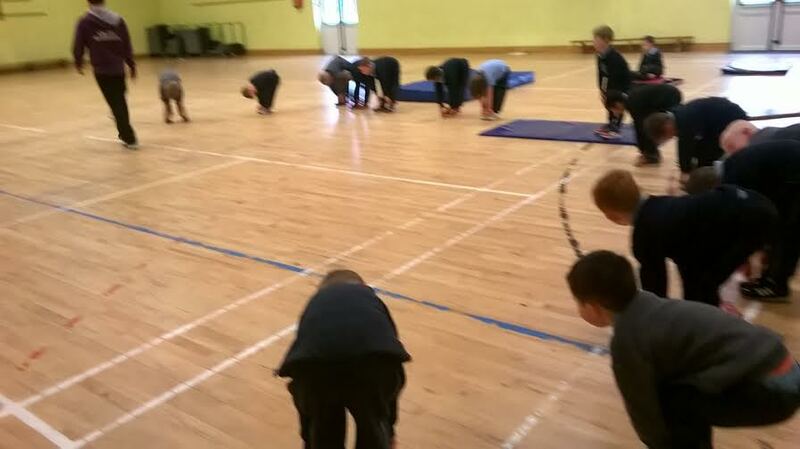 Junior Infants and First Class will take part in Gymnastics Activities in the hall with Excel Gymnastics. 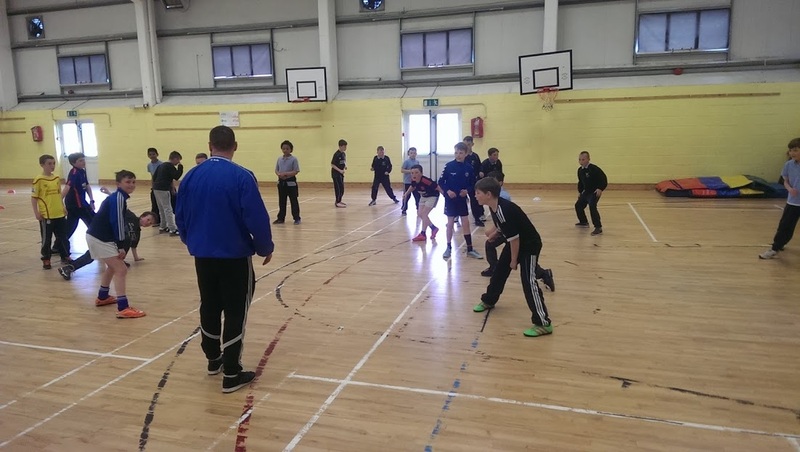 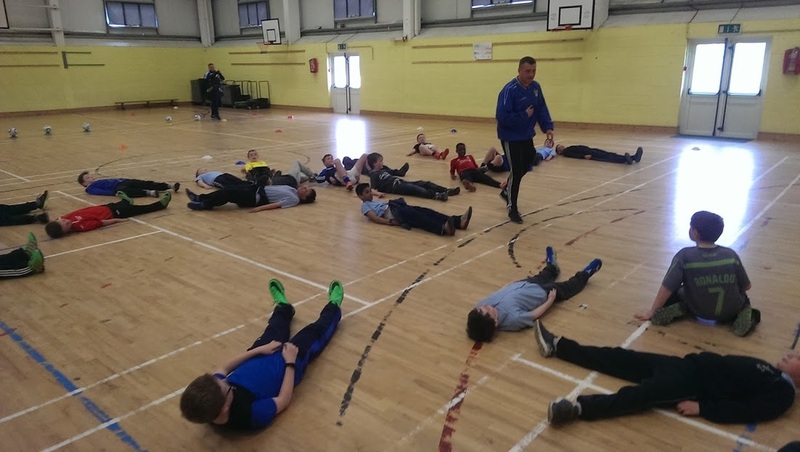 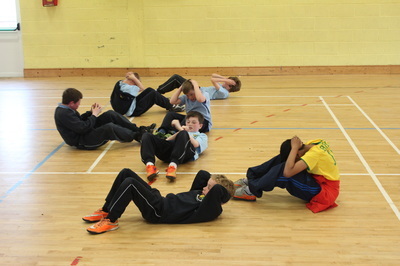 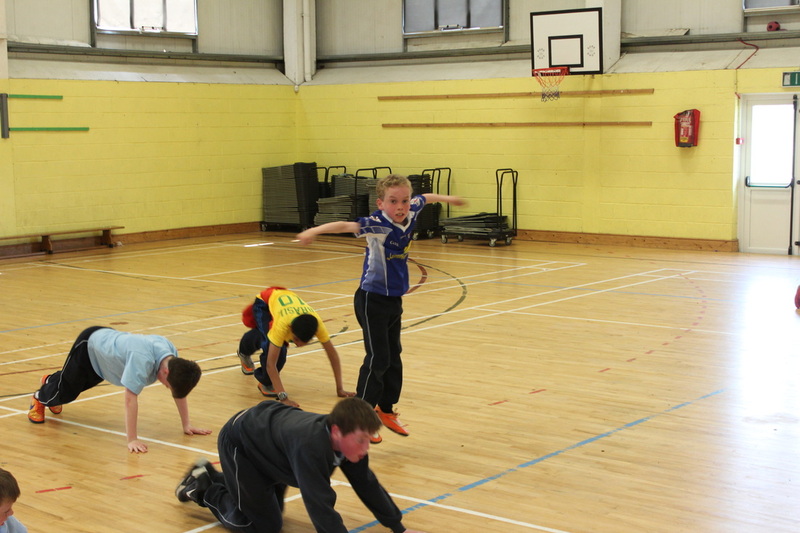 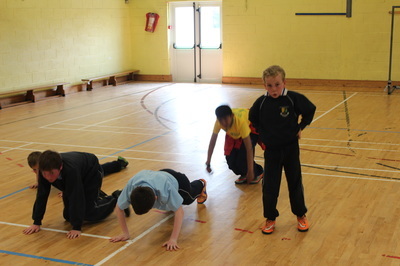 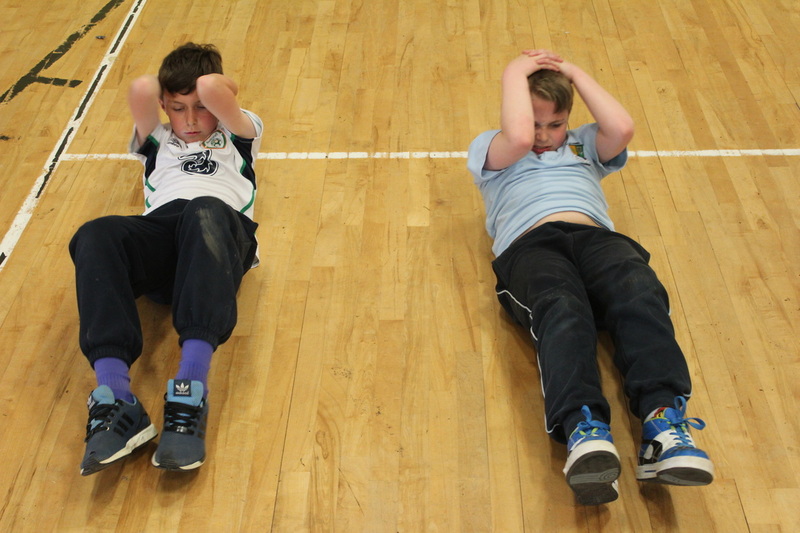 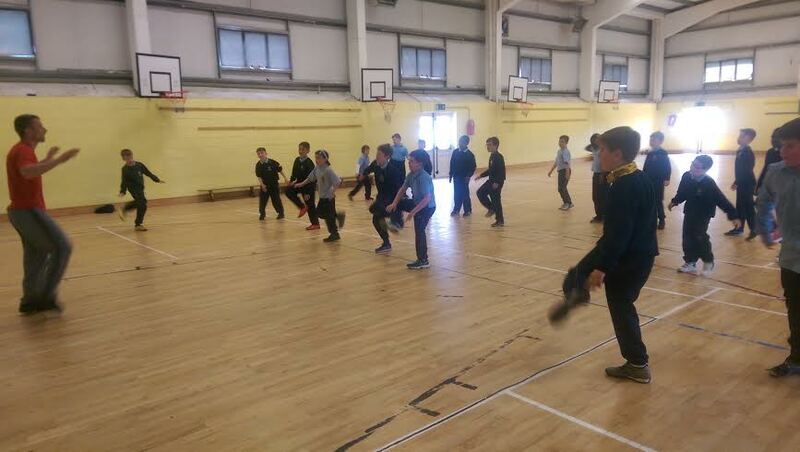 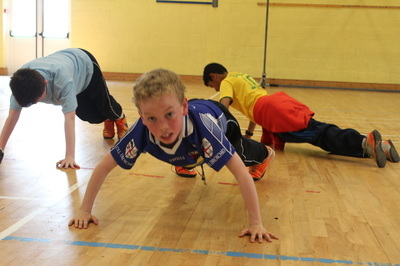 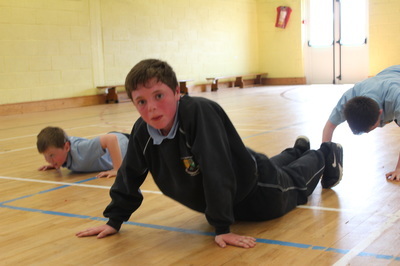 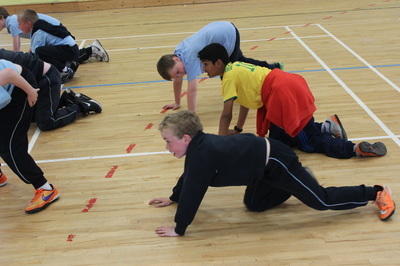 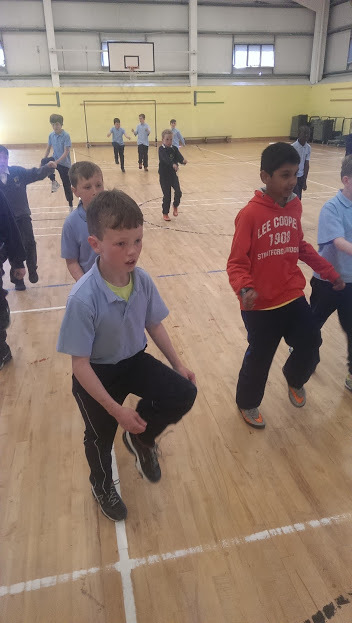 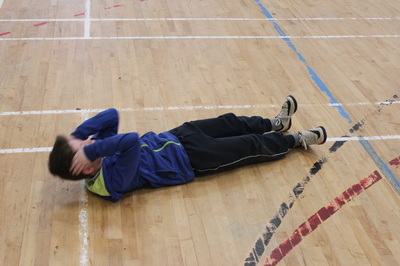 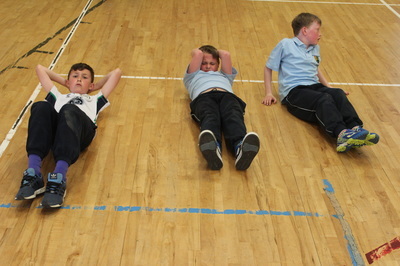 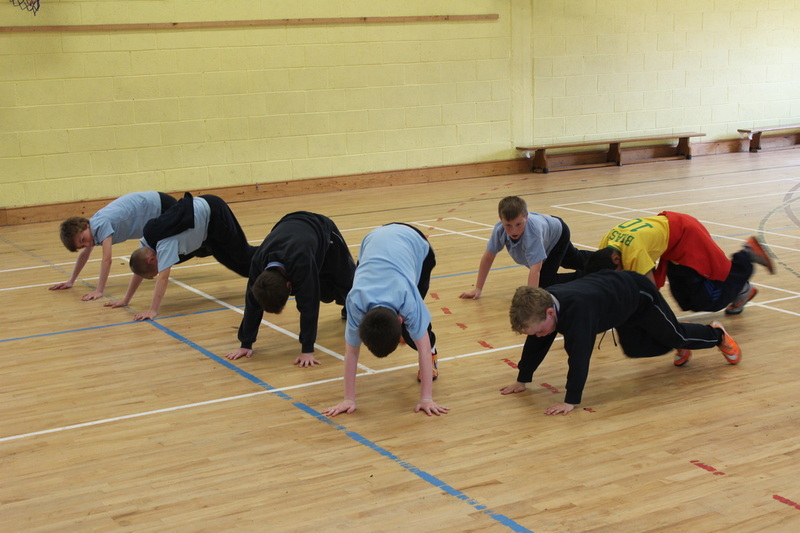 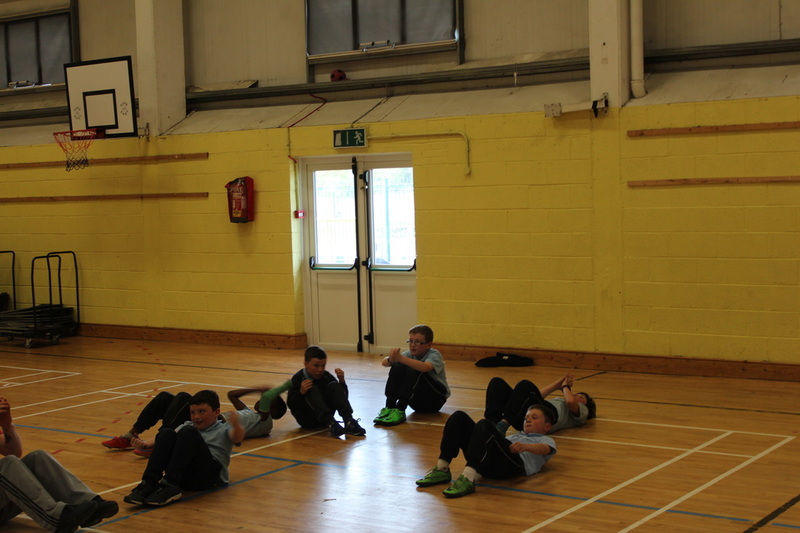 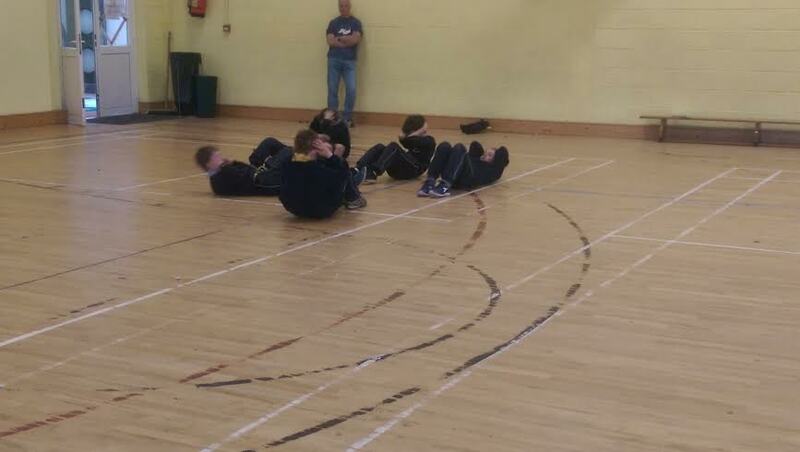 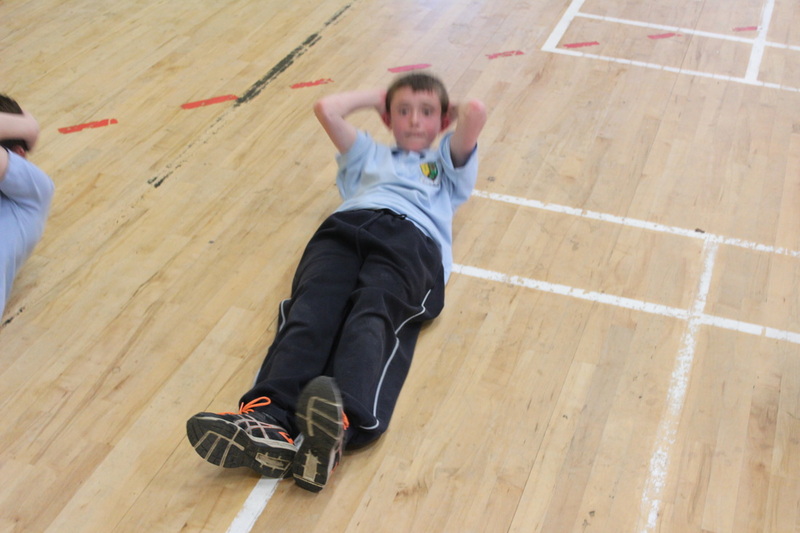 Local fitness coach Ger Kavanagh will do circuit training for 3rd and 4th Class boys. 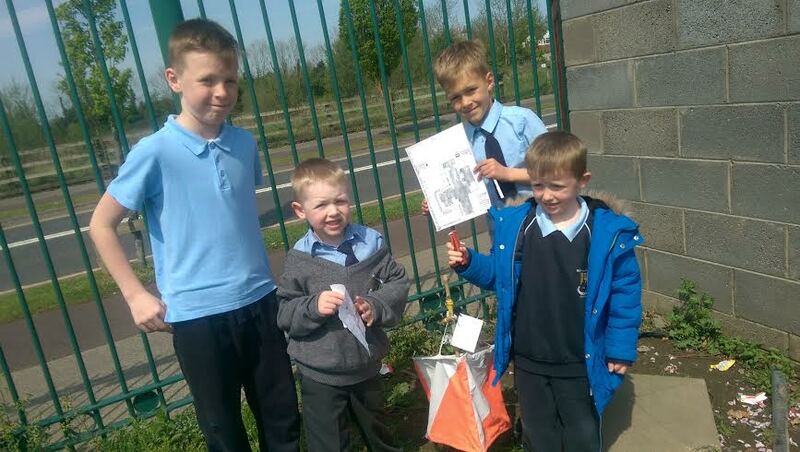 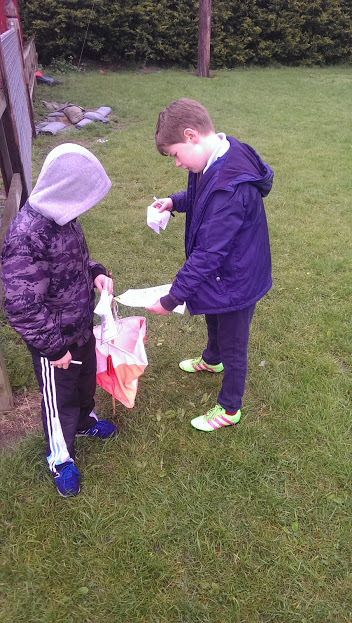 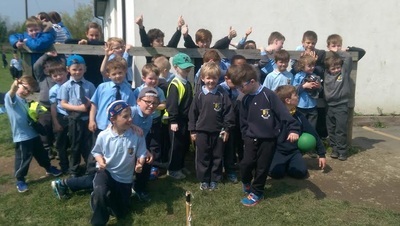 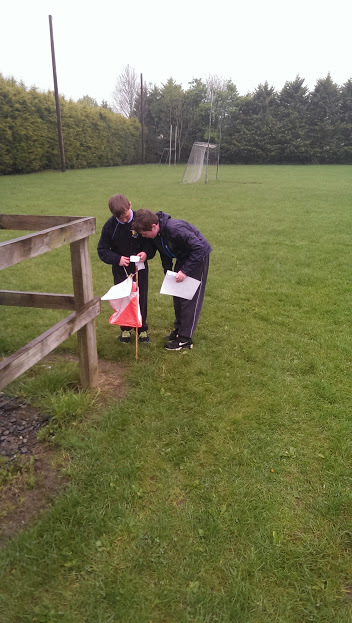 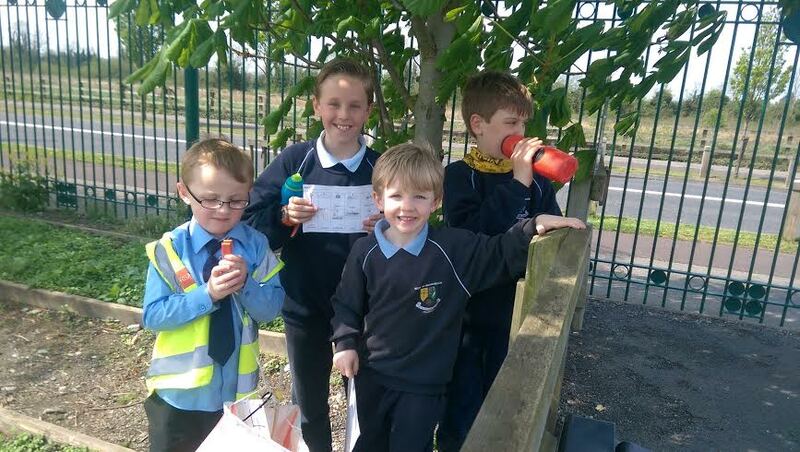 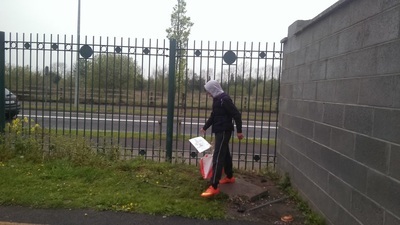 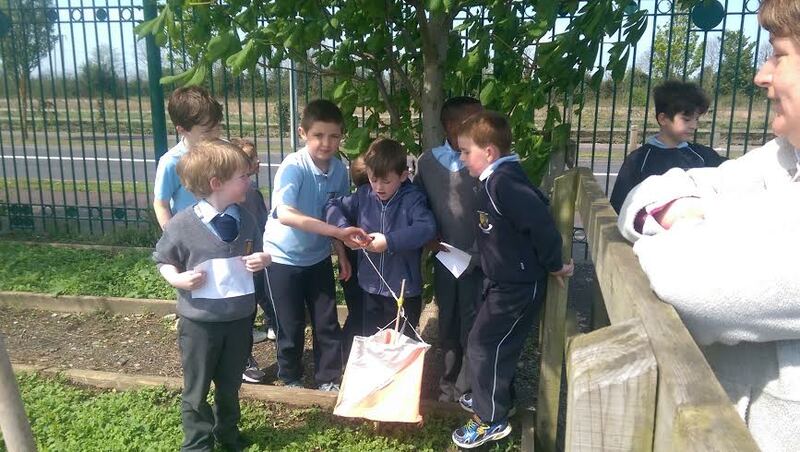 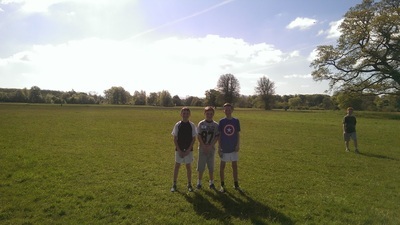 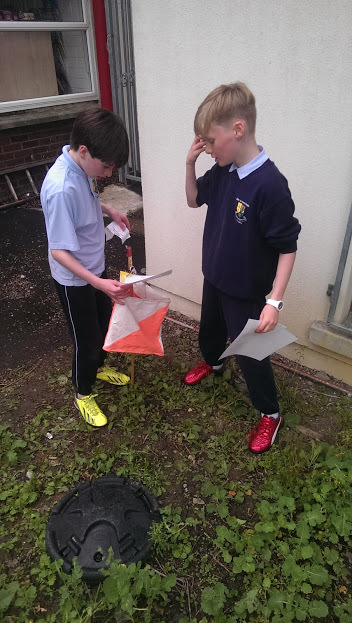 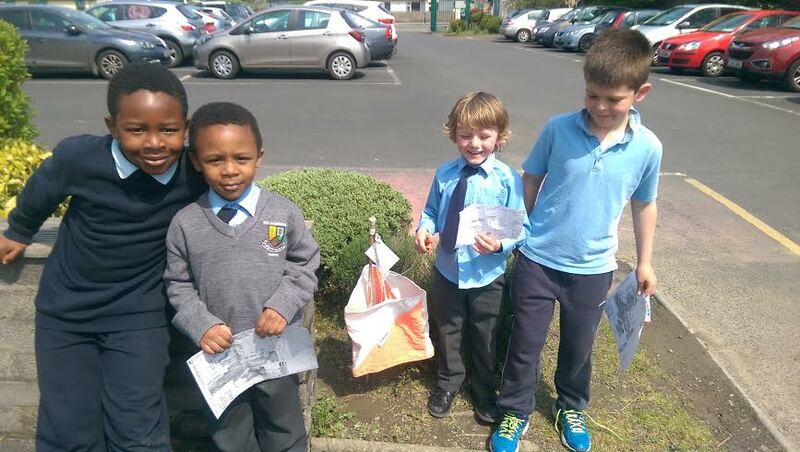 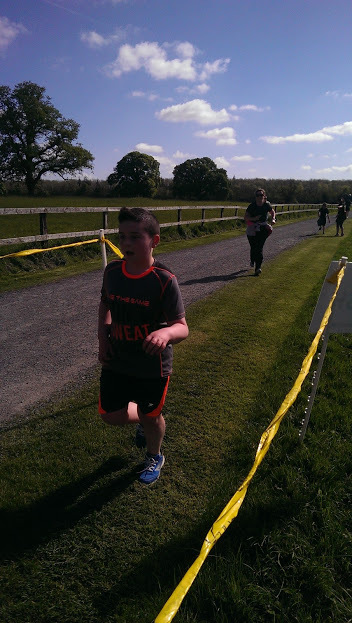 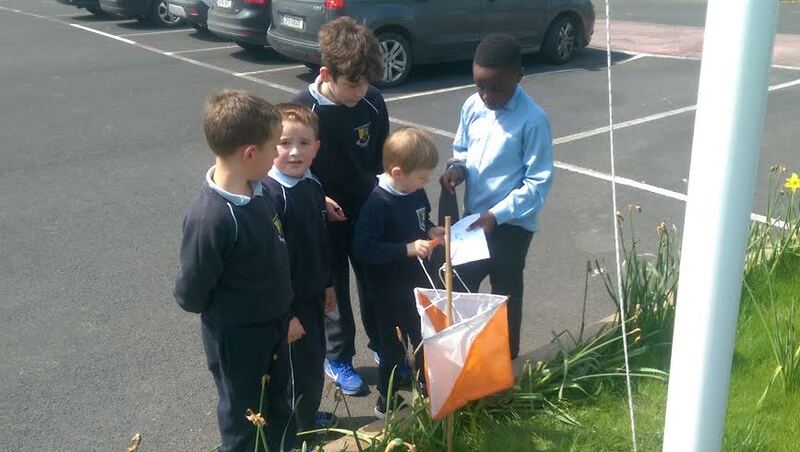 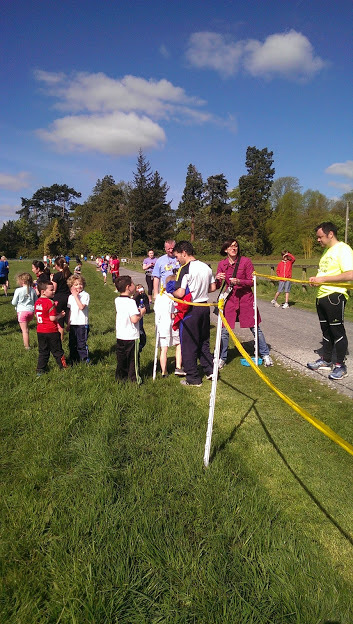 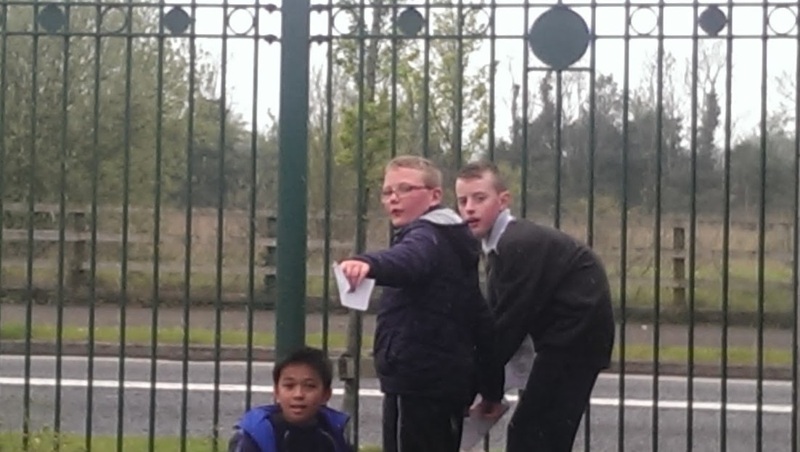 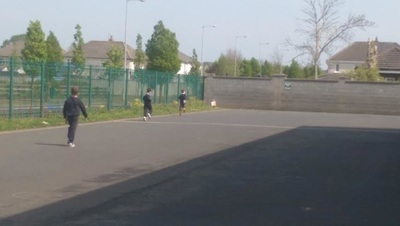 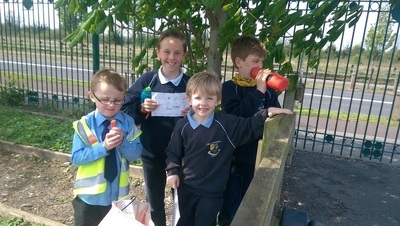 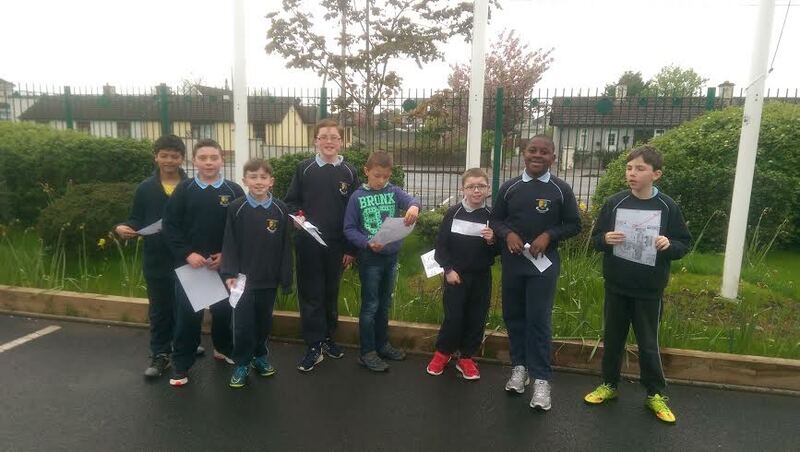 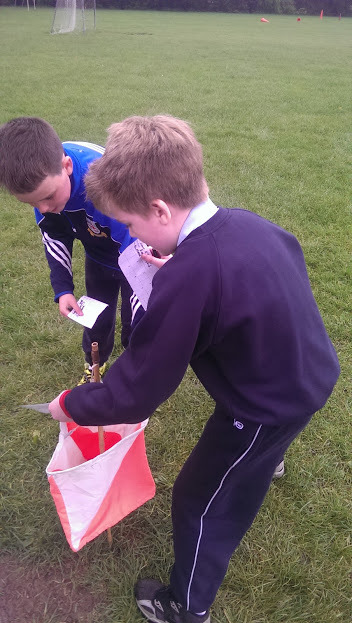 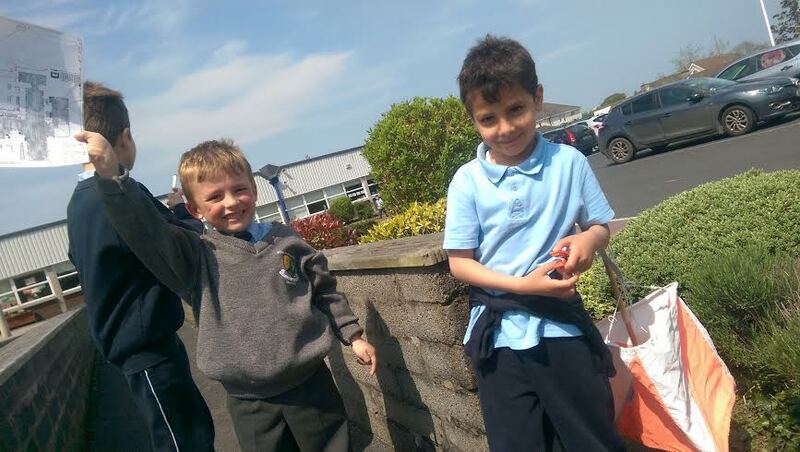 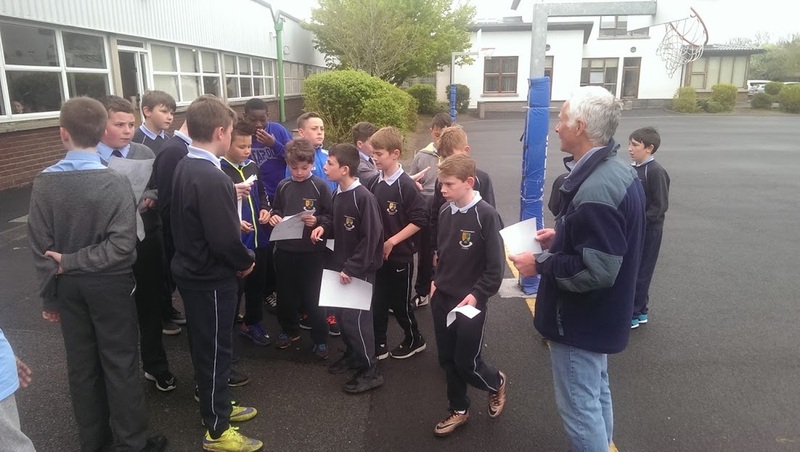 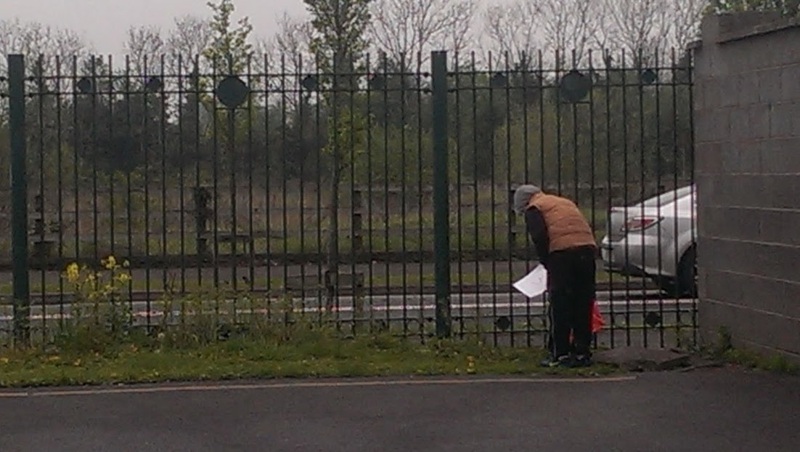 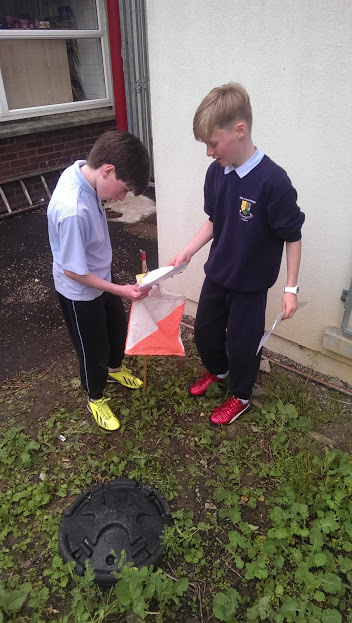 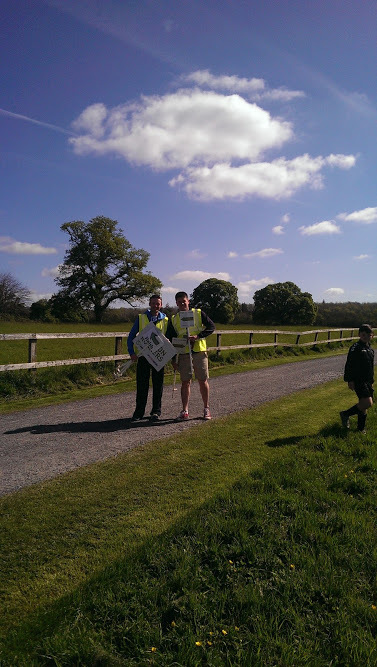 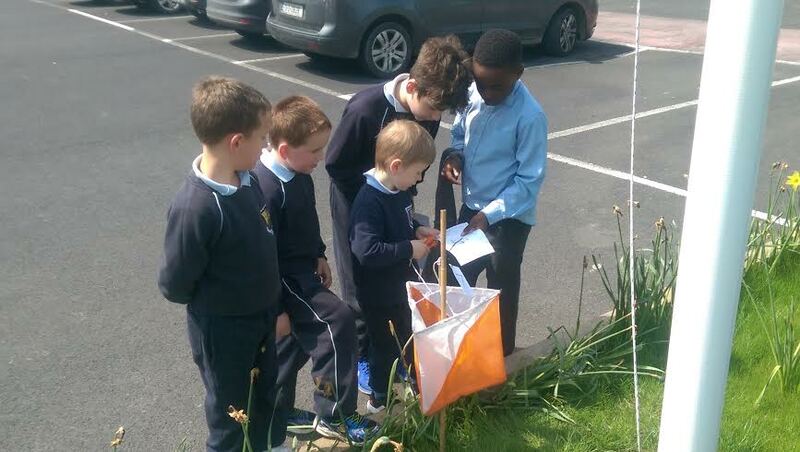 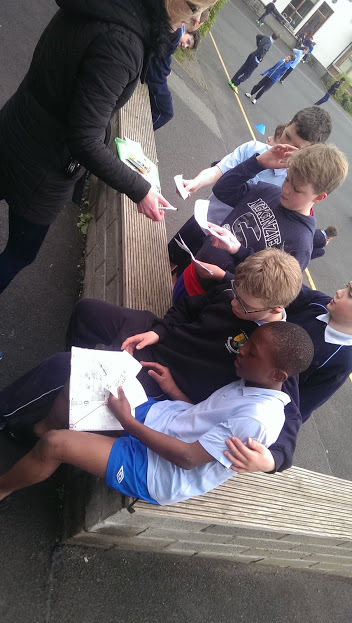 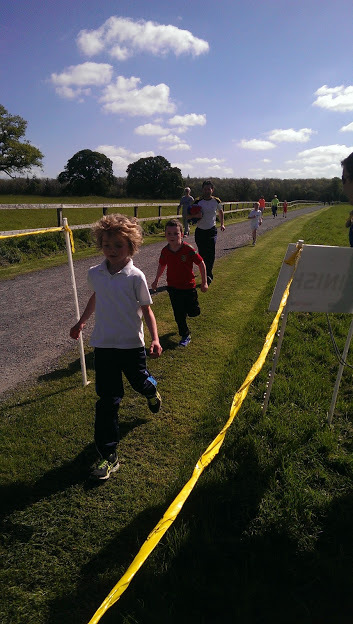 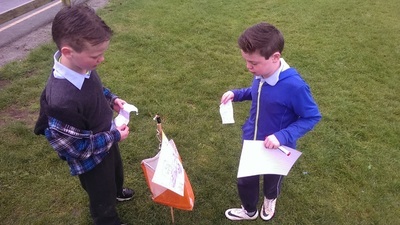 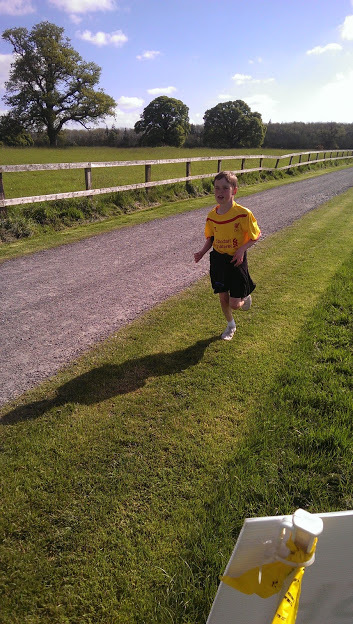 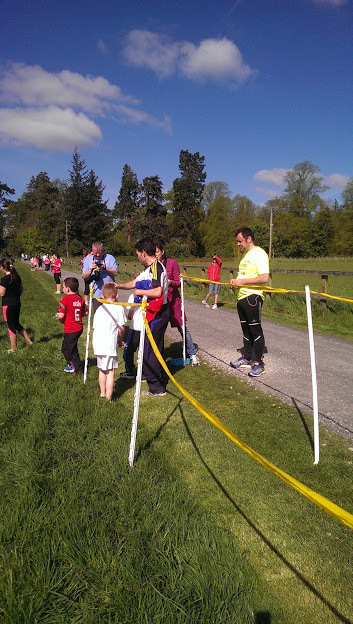 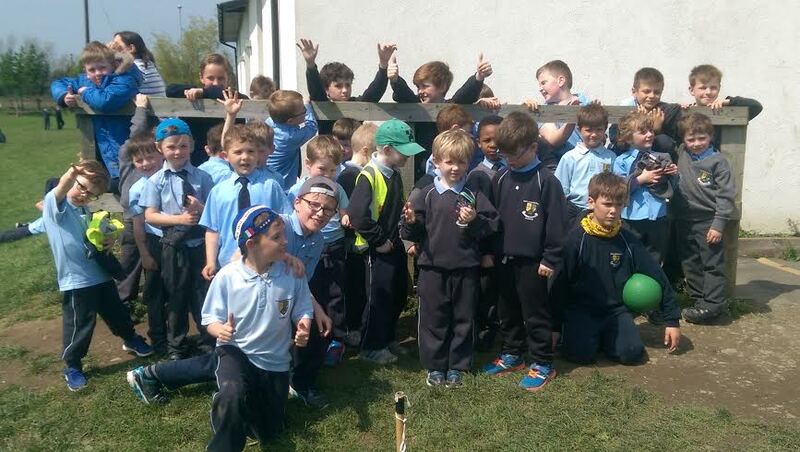 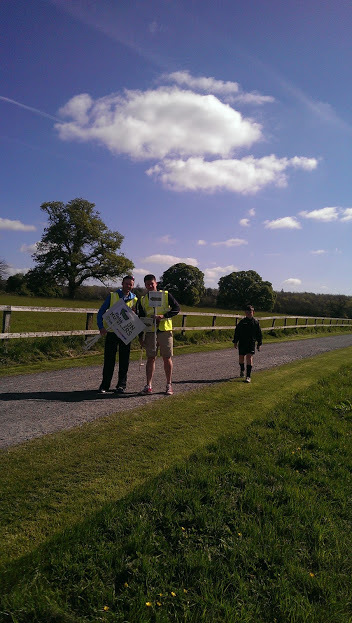 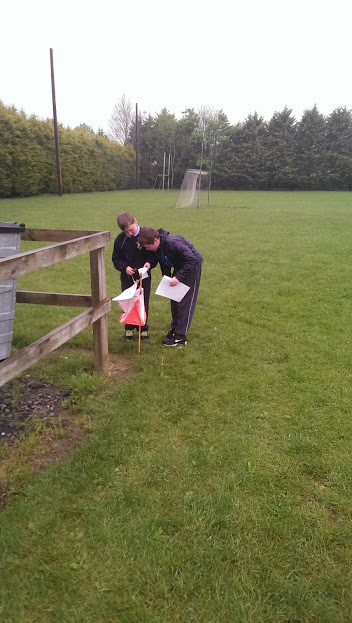 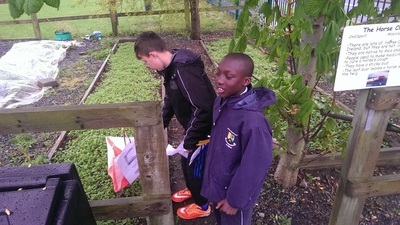 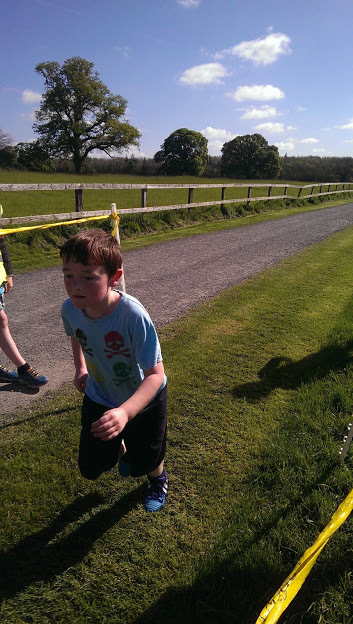 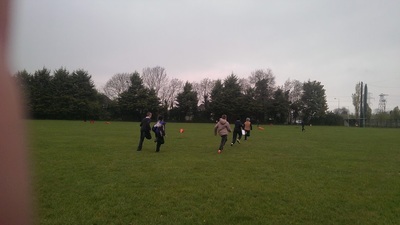 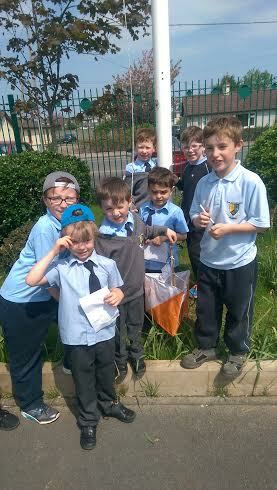 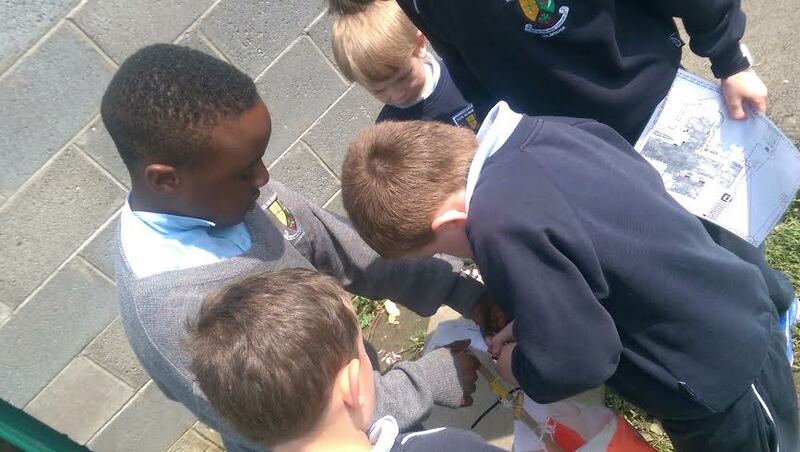 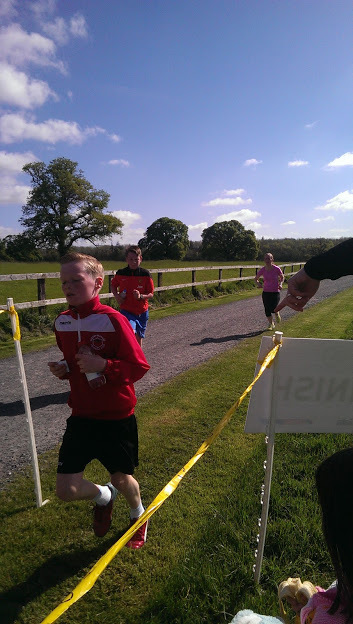 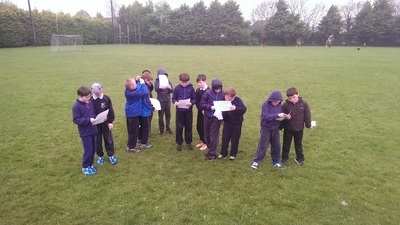 Orienteering and The Scoil Na Mainistreach Running Record will continue for all classes as they have all week. 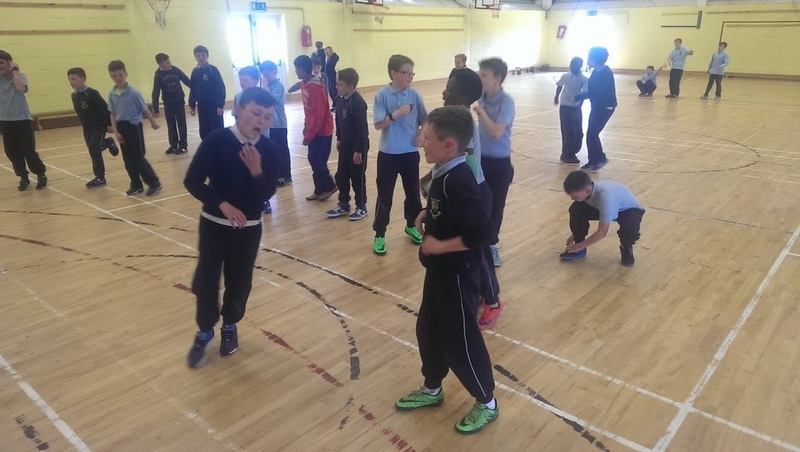 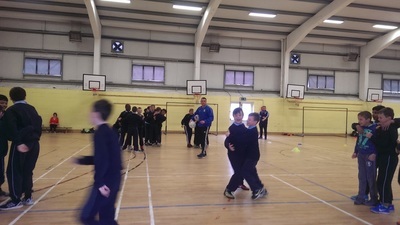 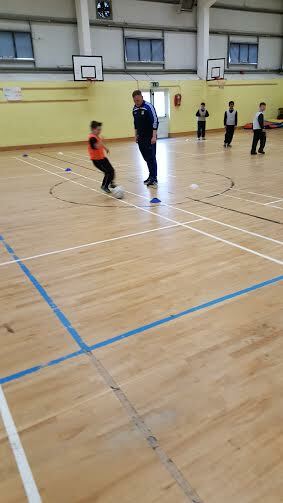 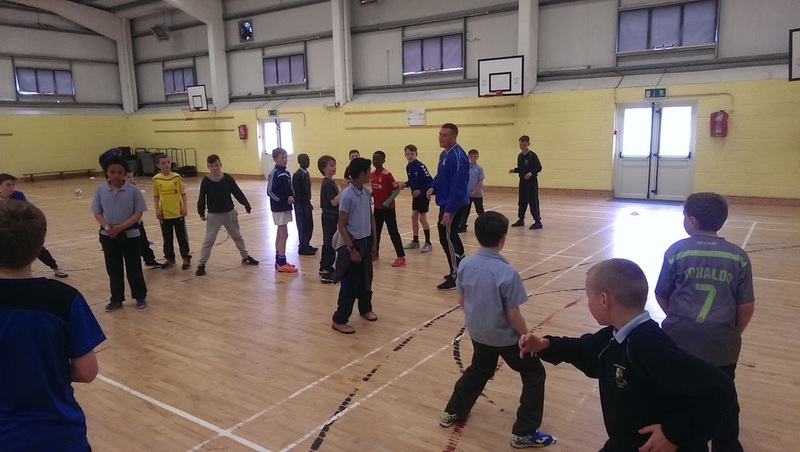 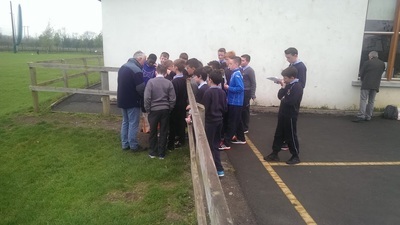 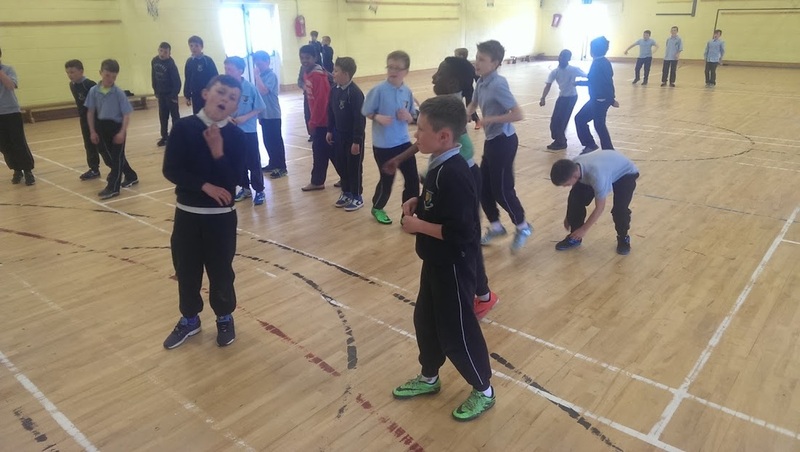 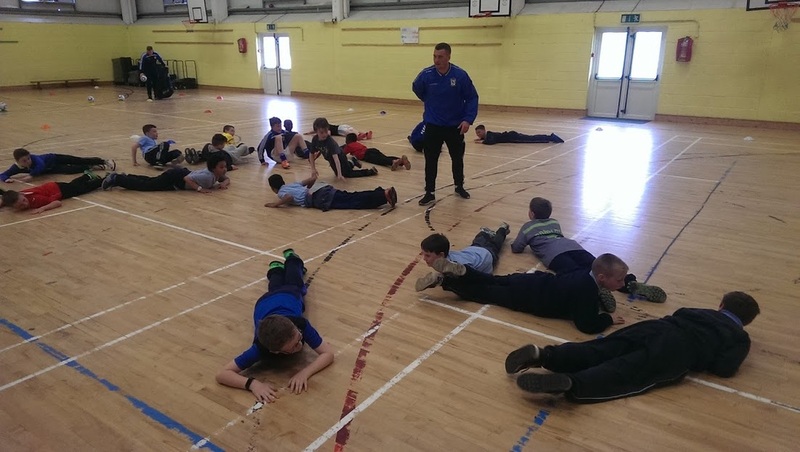 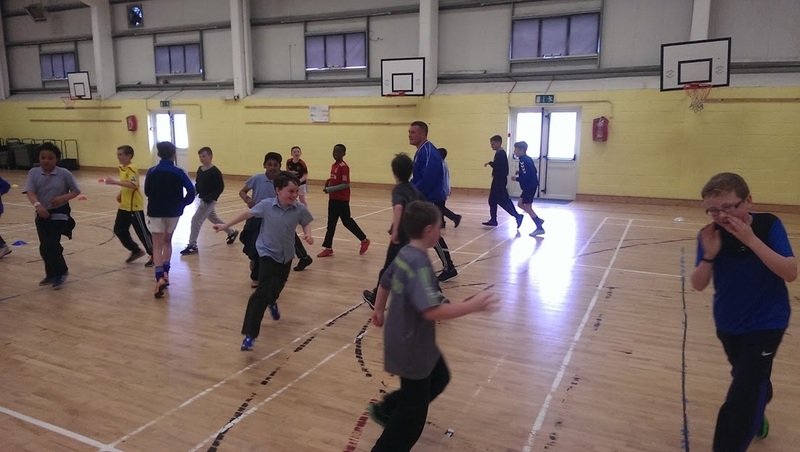 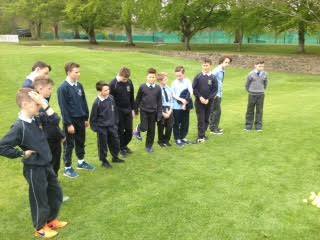 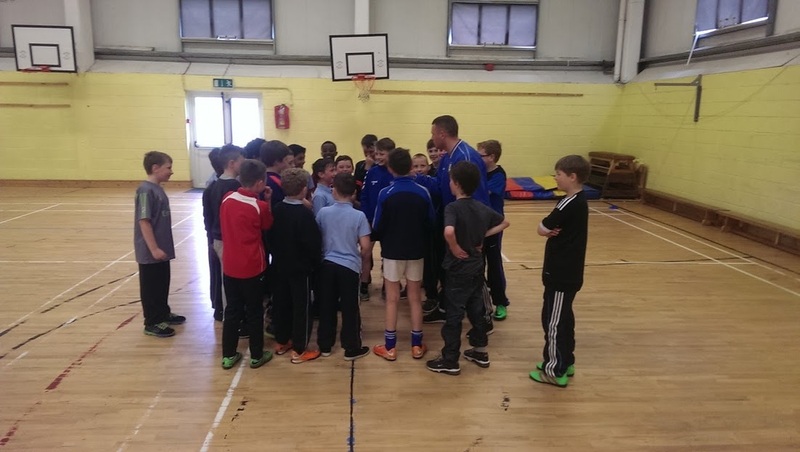 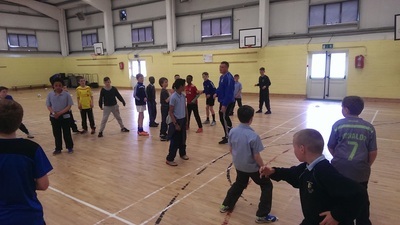 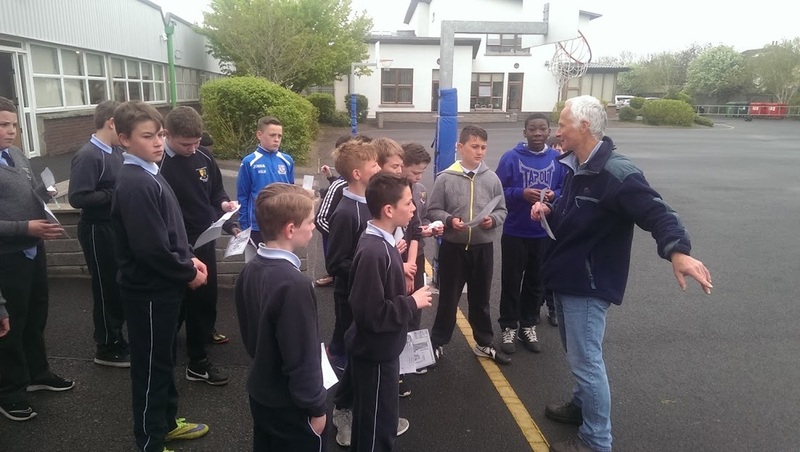 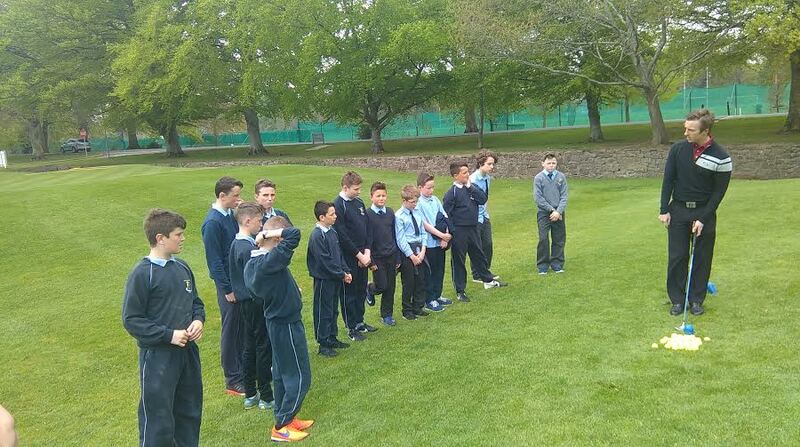 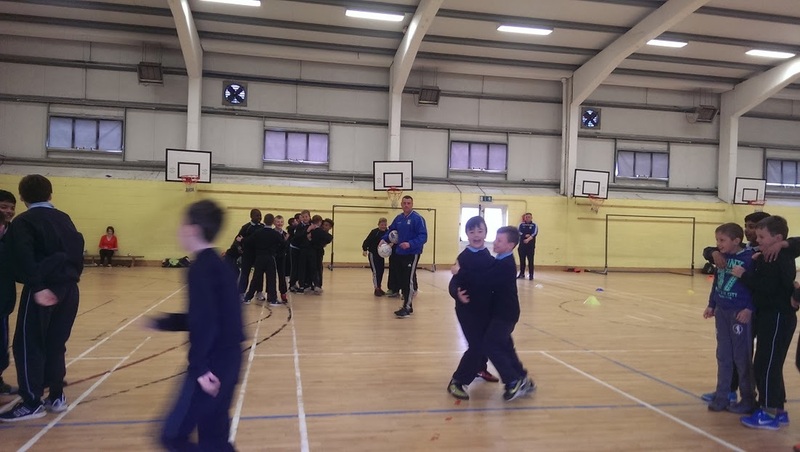 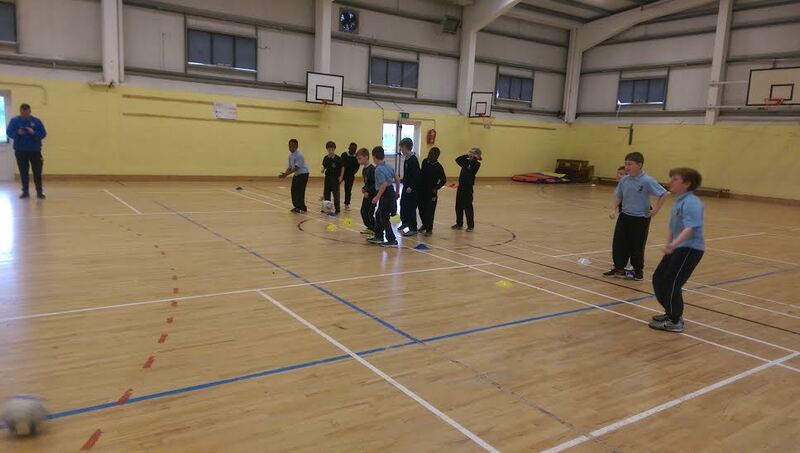 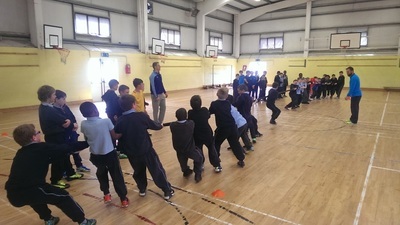 On Wednesday 11th May boys from 5th class had coaching sessions with Richard Mc Carthy from Le Chéile Athletics Club in Leixlip. There were two sessions of about 50 minutes duration and with around 21 boys taking part in each one. 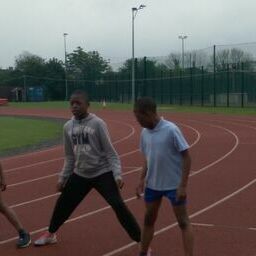 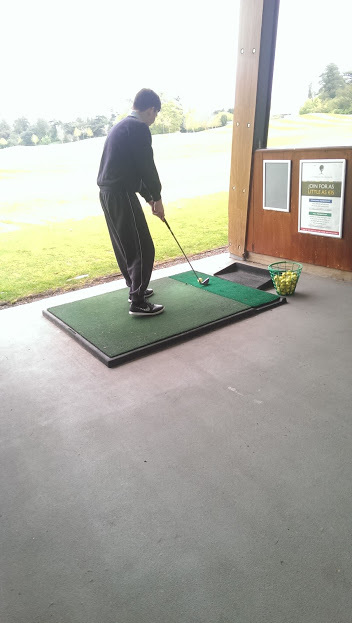 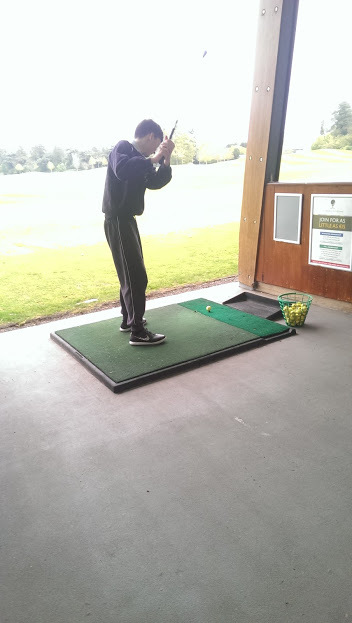 Richard is such an expert, effective coach and he really put the boys through their paces! 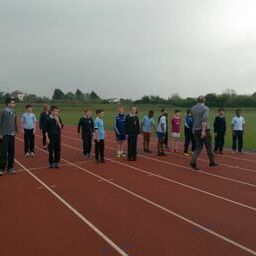 He began with a really good warm-up and stretch and he explained the importance of starting every running session like this. 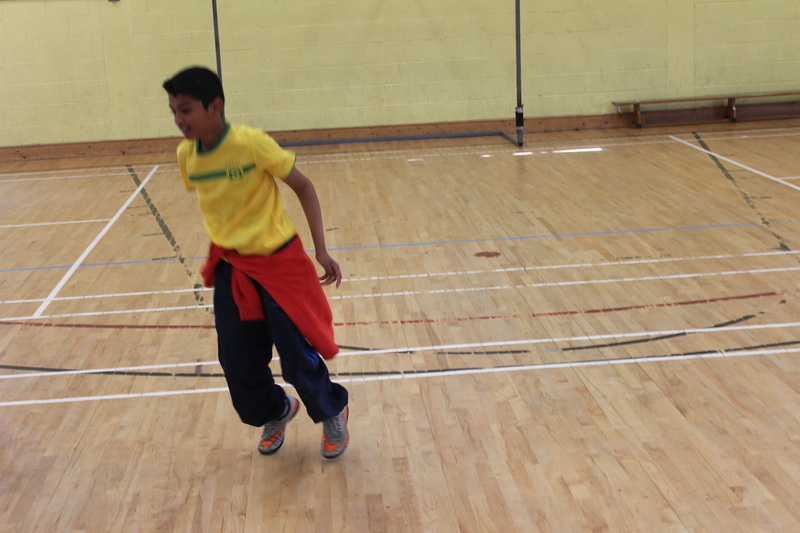 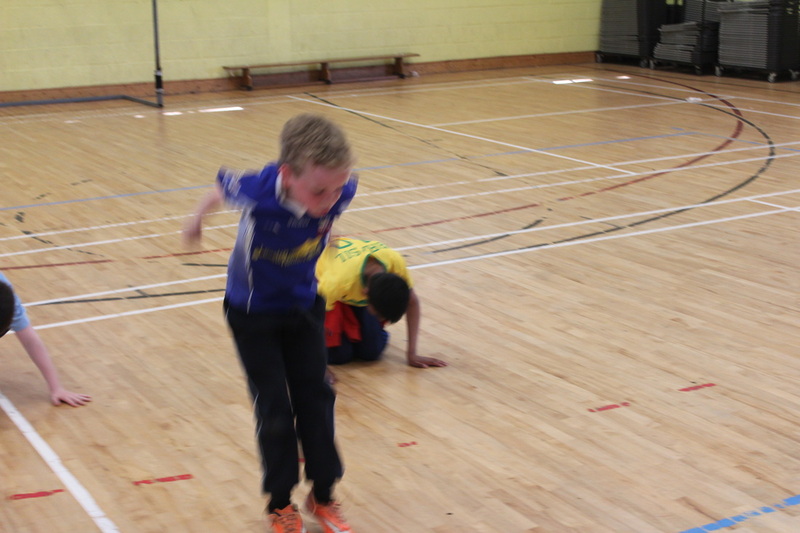 He then gave some super technique tips followed by what the boys loved the most...lots of running! 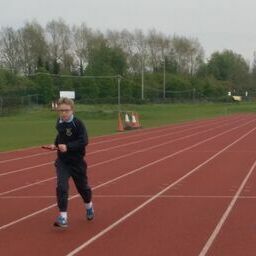 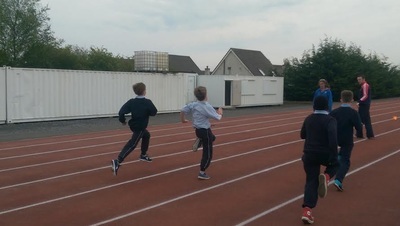 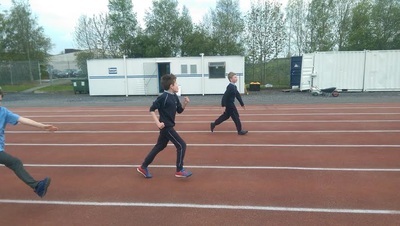 The boys also got an introduction to relays and how to pass the baton.It was a wonderful opportunity for the boys to get a chance to run on a proper state of the art running track and I have a feeling that many of them will be joining an athletics club soon. 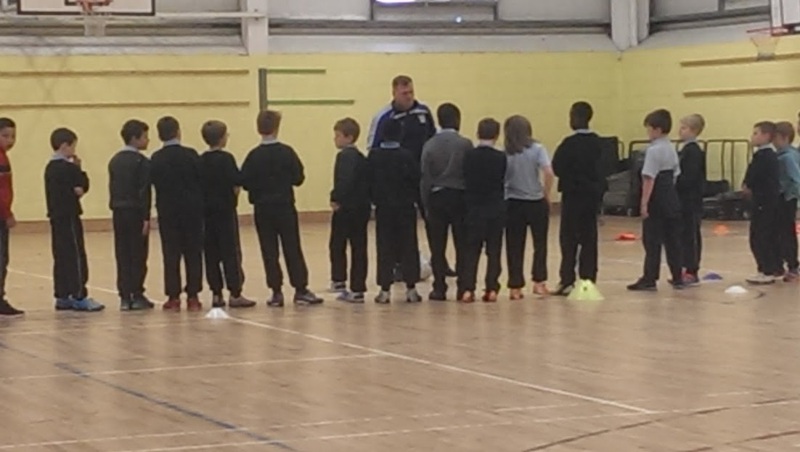 Thanks so much to Richard for his time and expertise and to the club for allowing us use their amazing facilities . 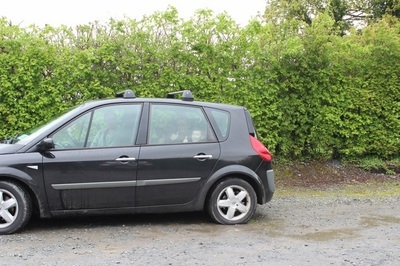 We would also like to thank all the parents who have been so generous with lifts throughout the week. 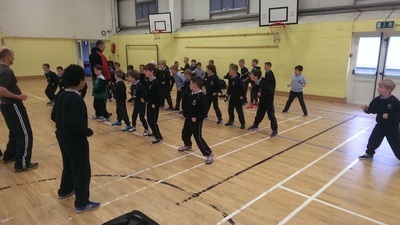 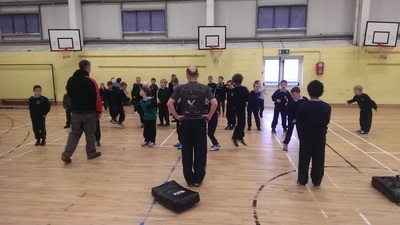 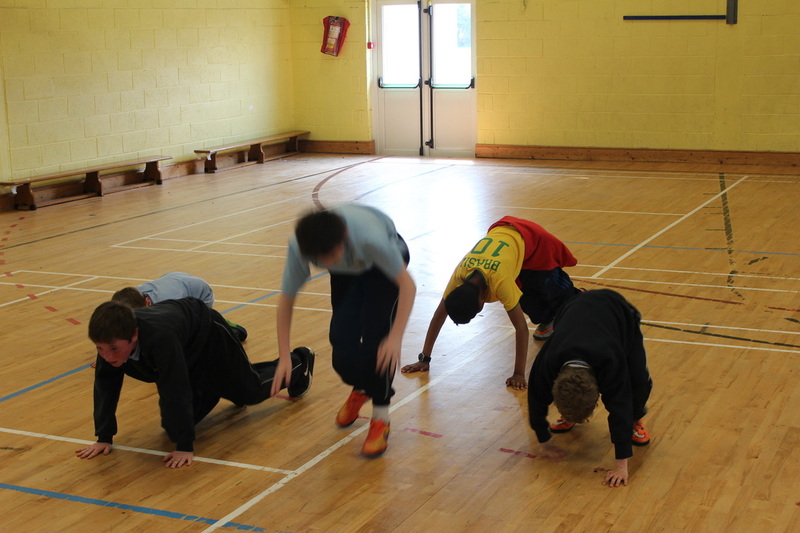 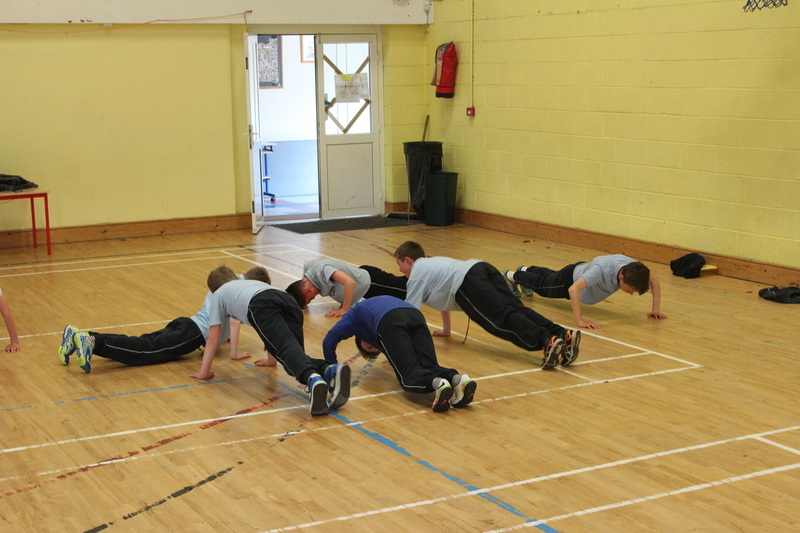 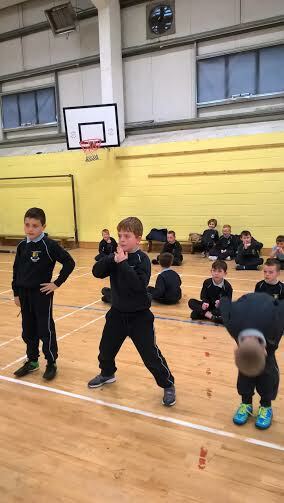 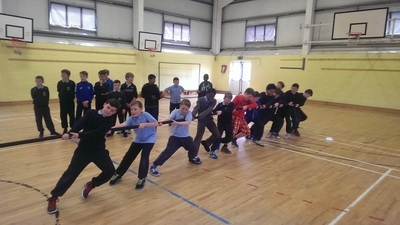 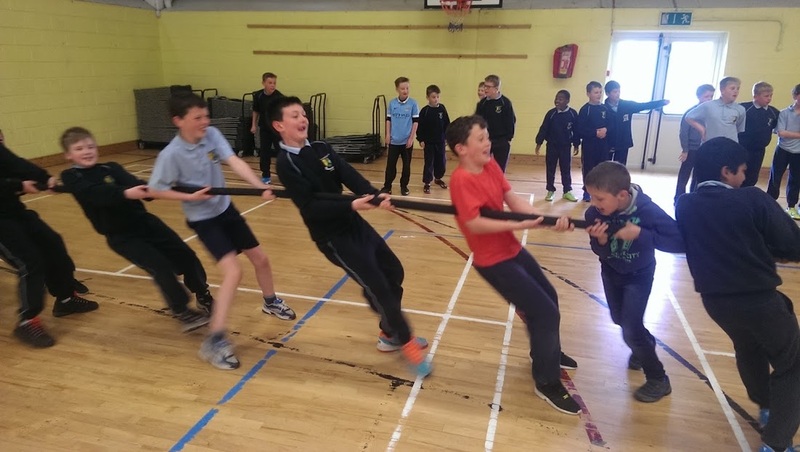 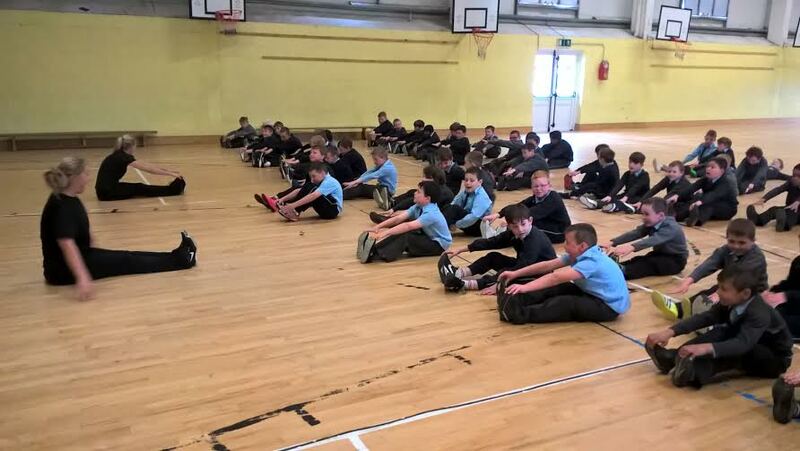 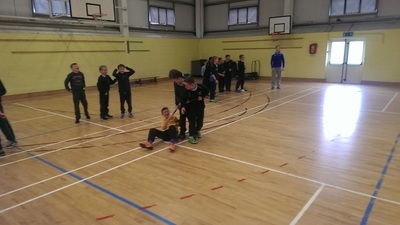 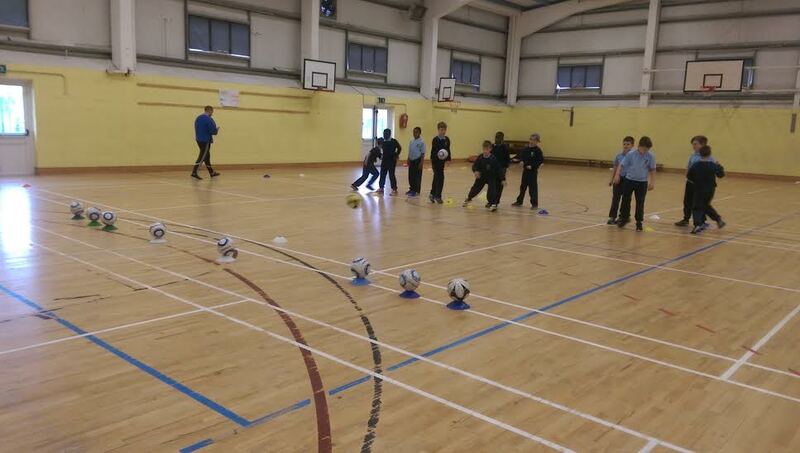 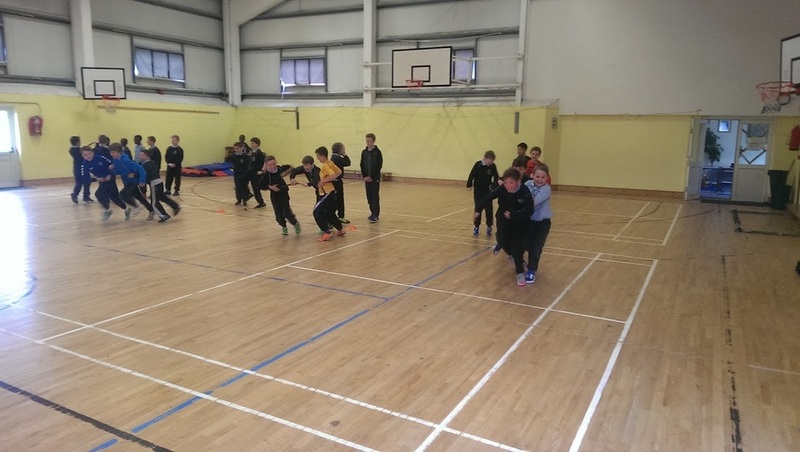 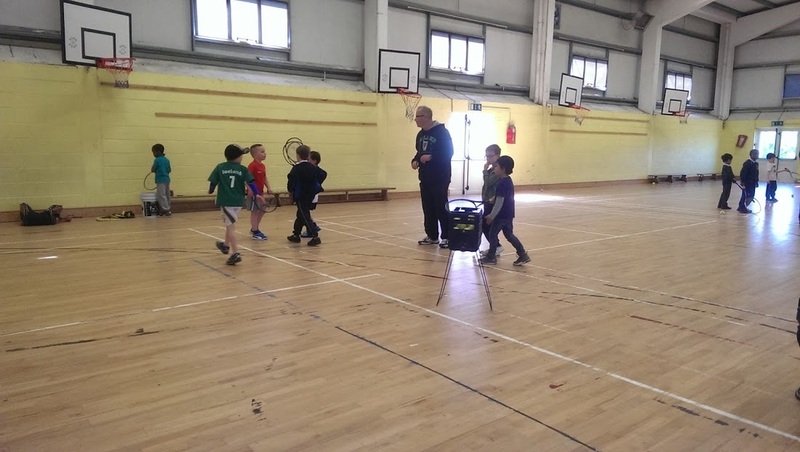 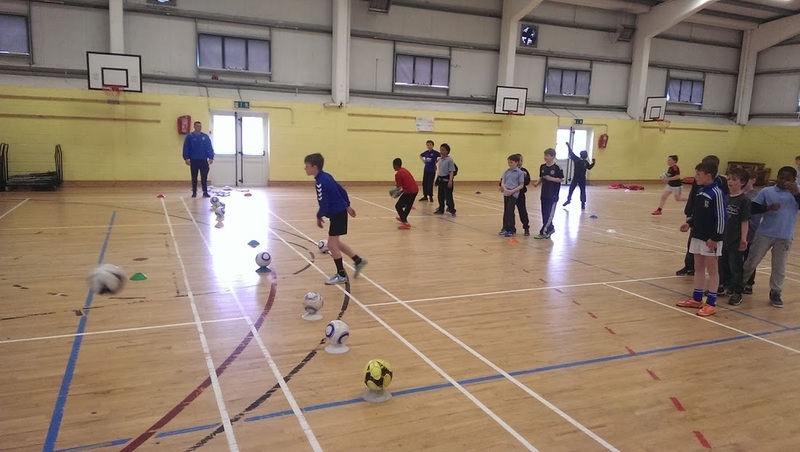 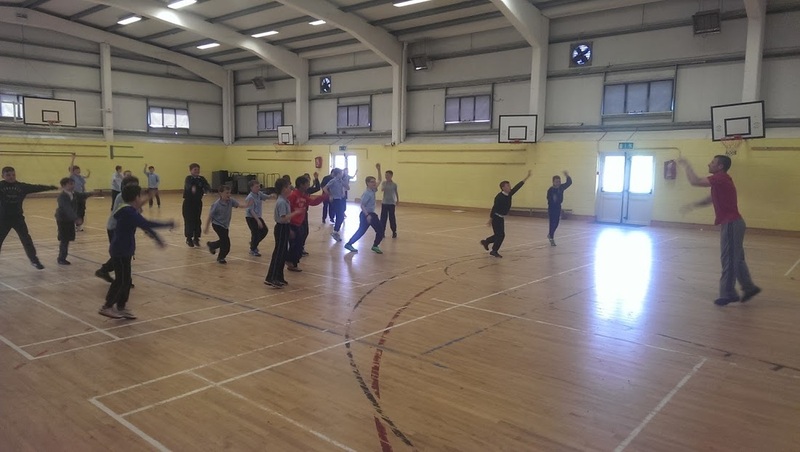 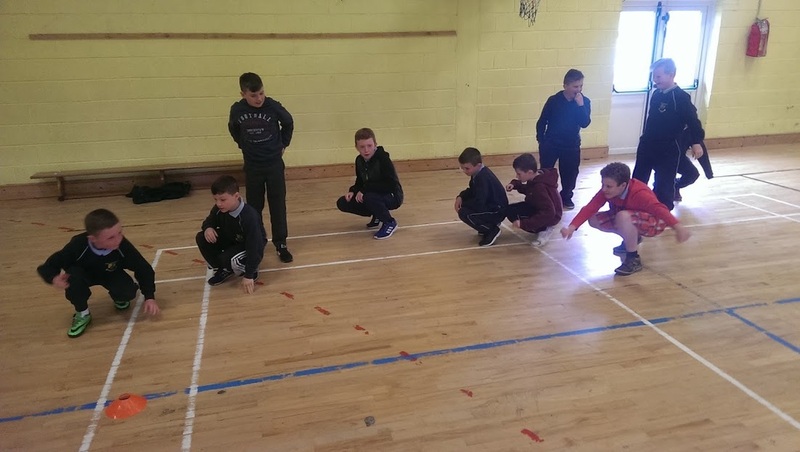 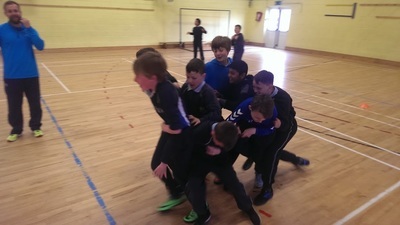 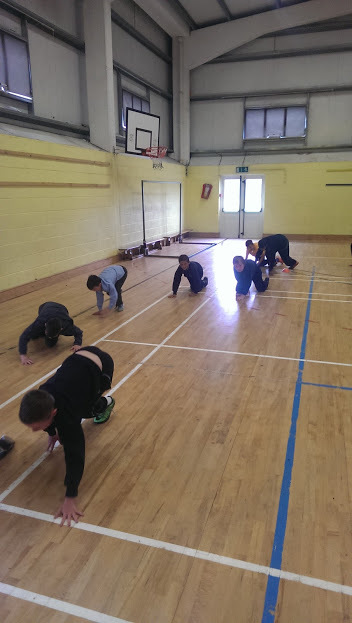 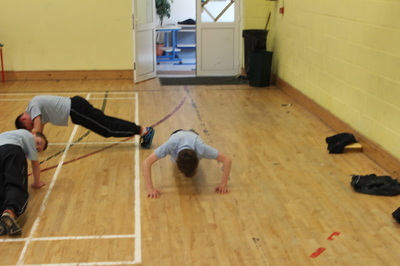 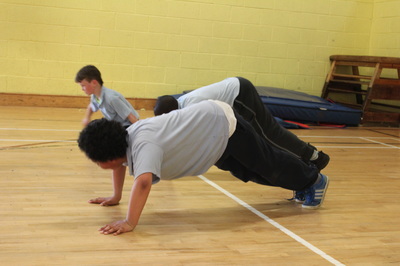 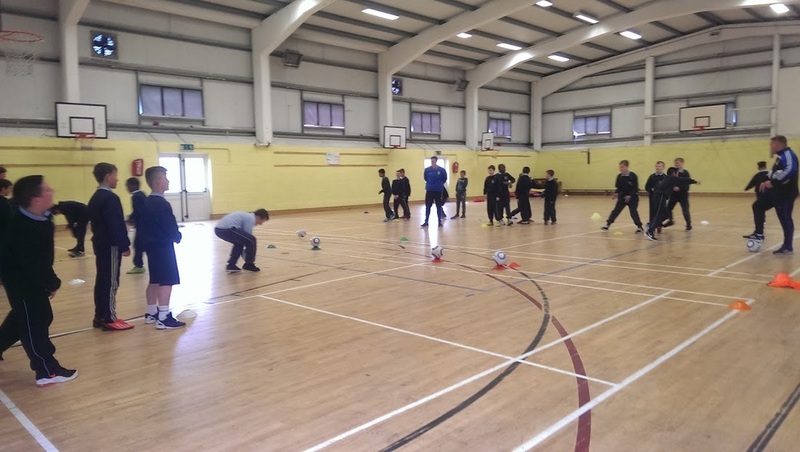 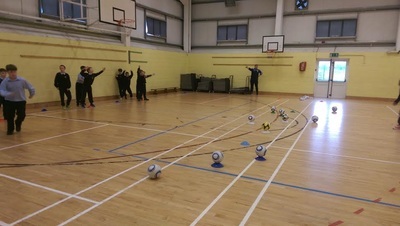 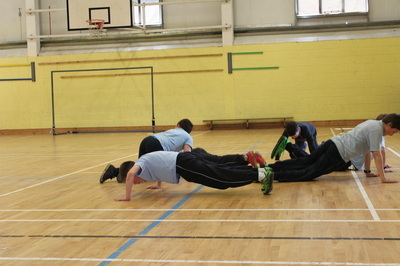 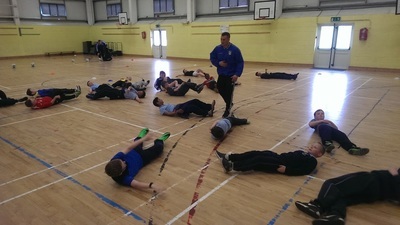 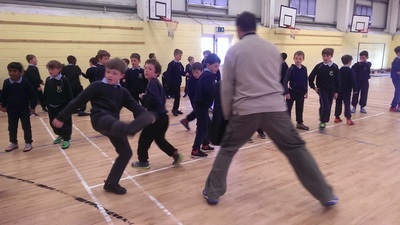 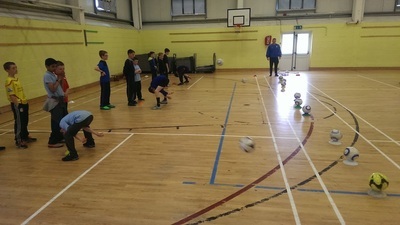 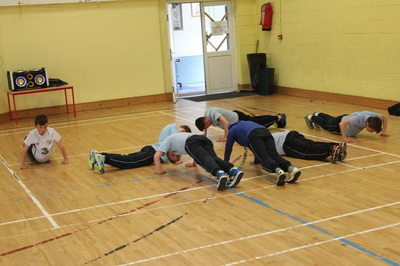 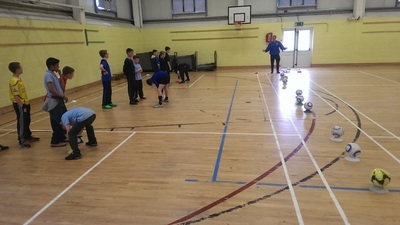 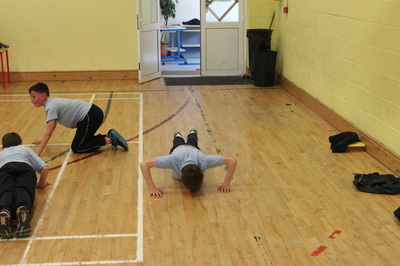 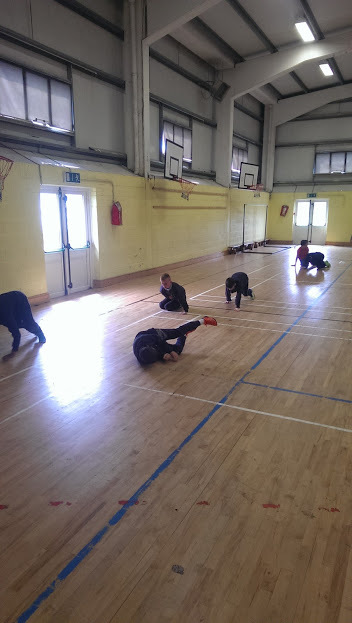 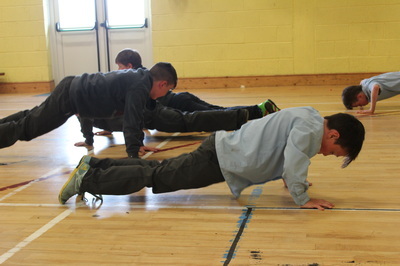 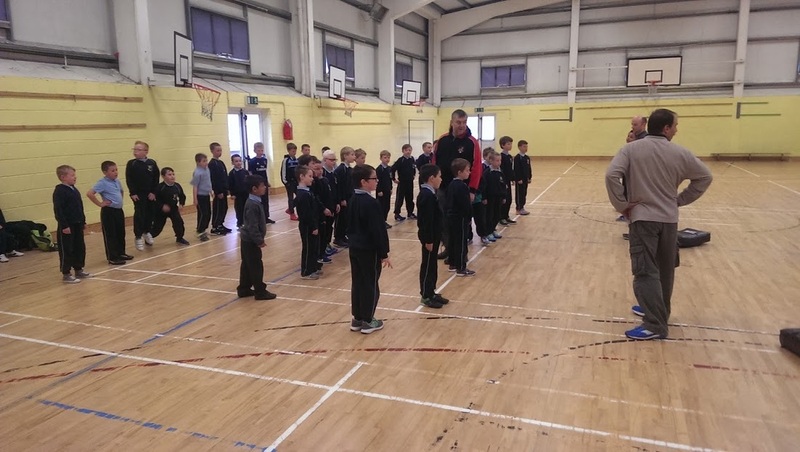 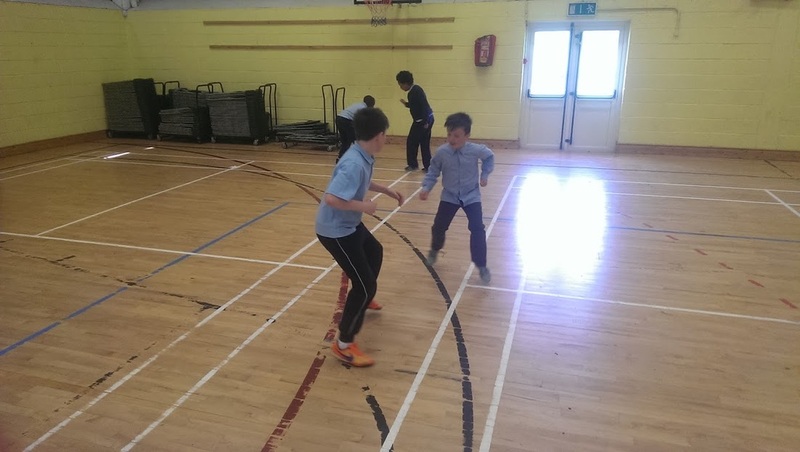 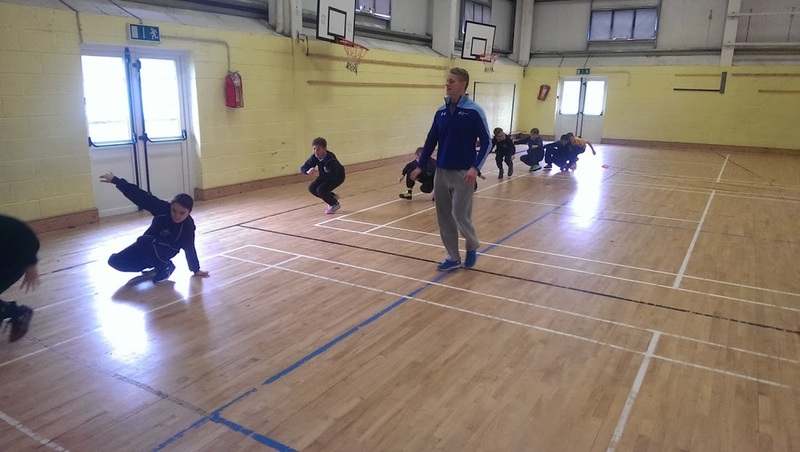 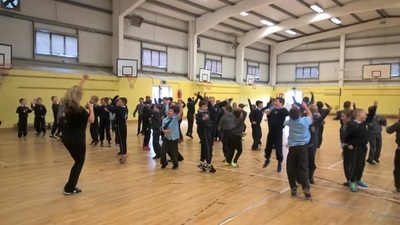 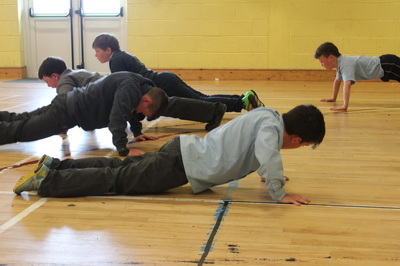 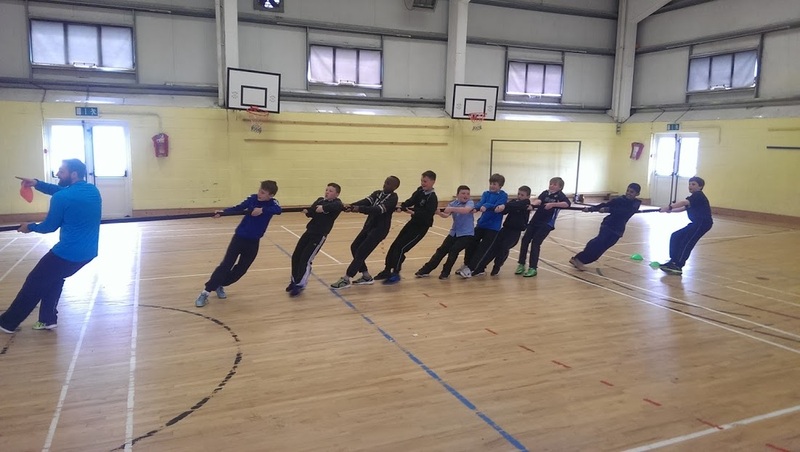 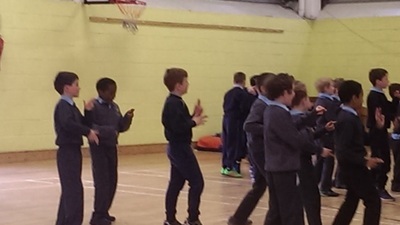 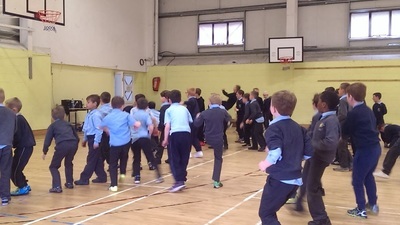 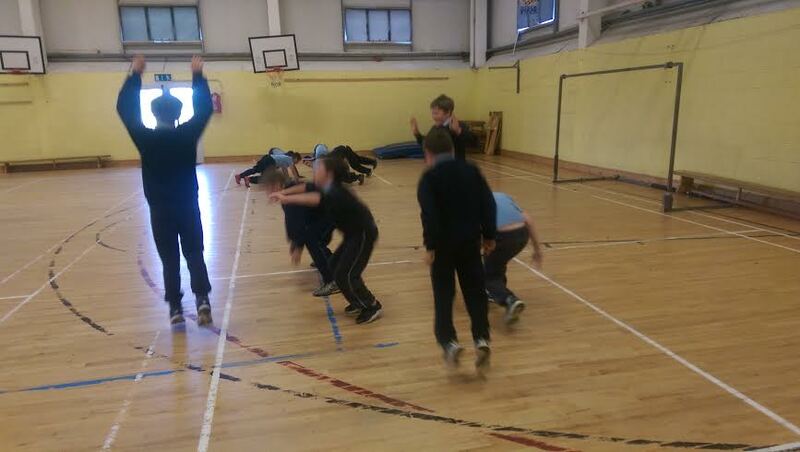 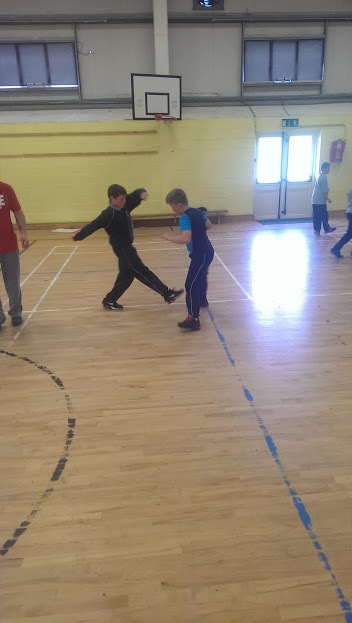 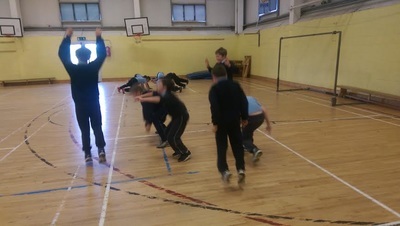 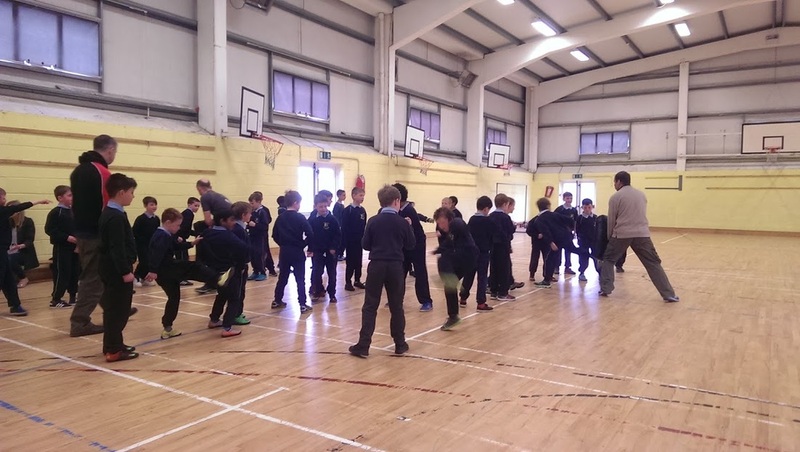 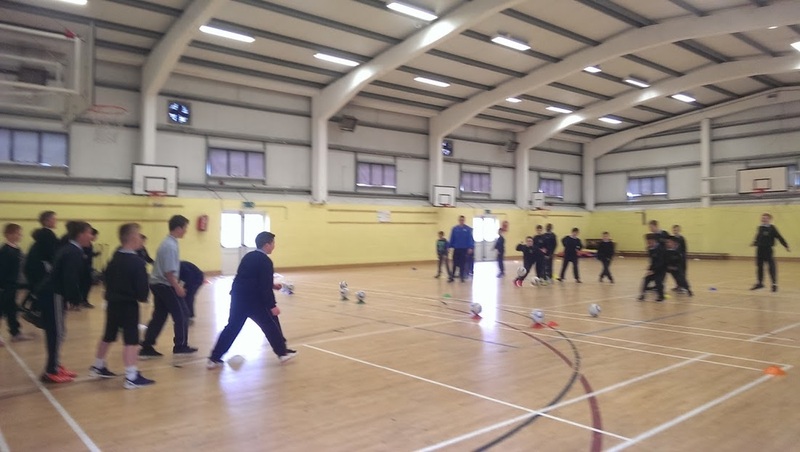 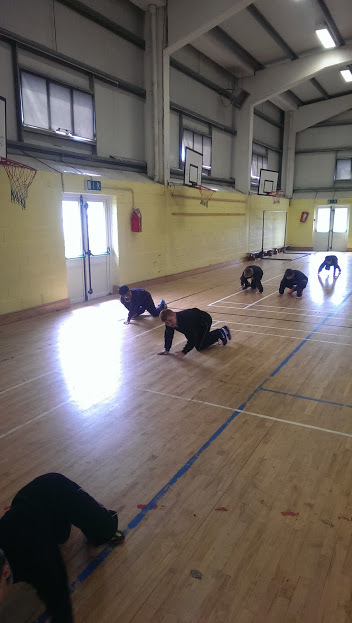 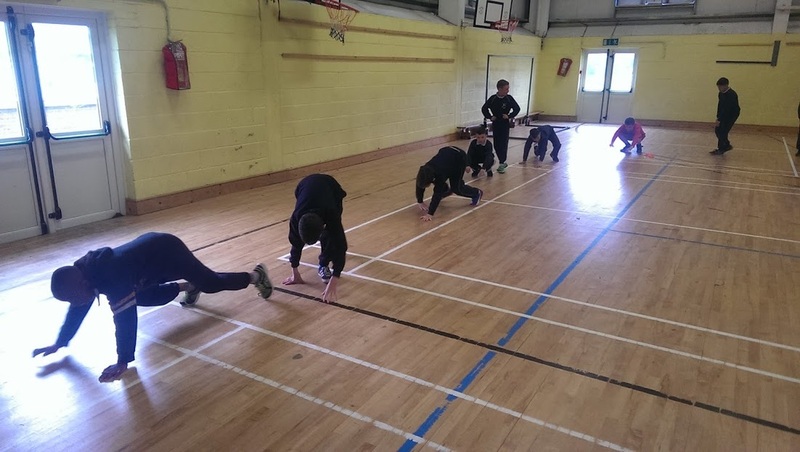 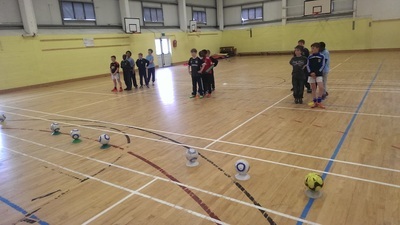 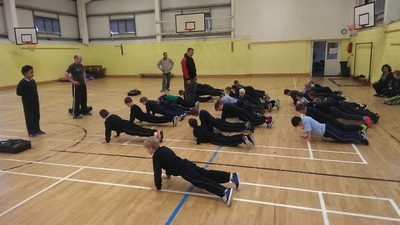 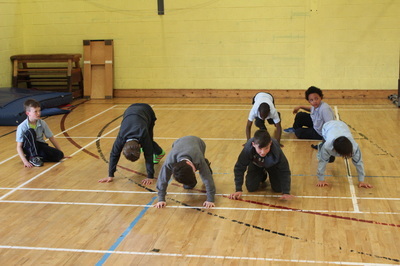 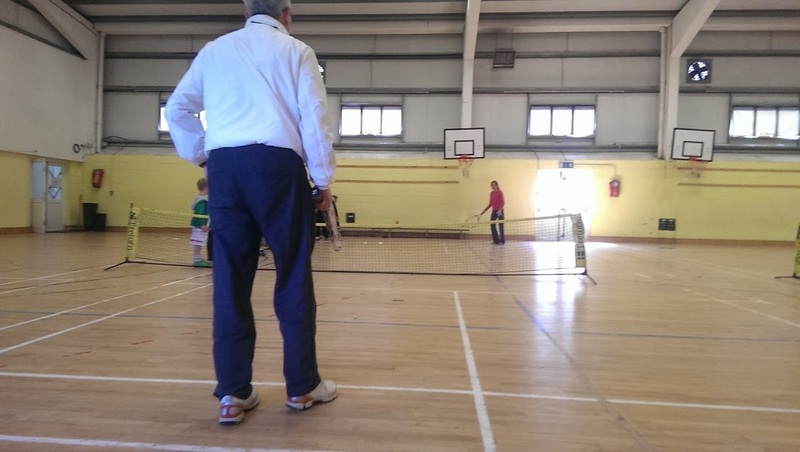 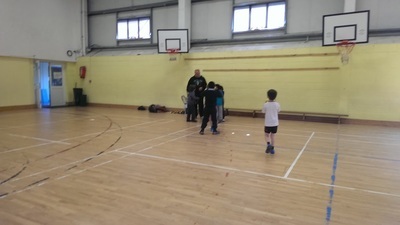 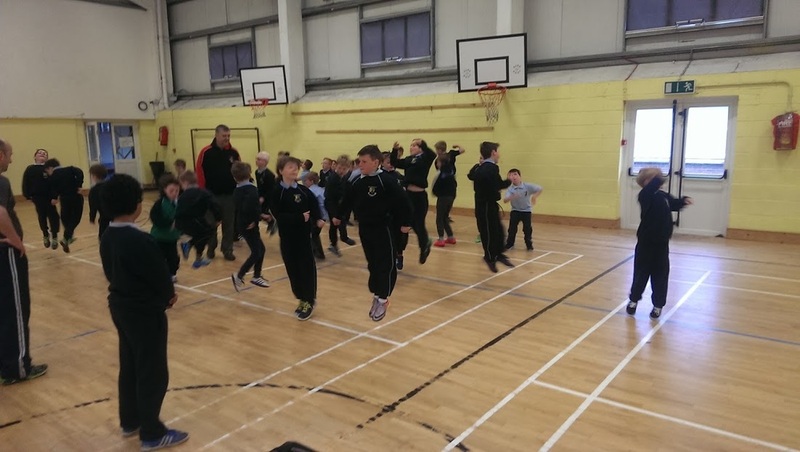 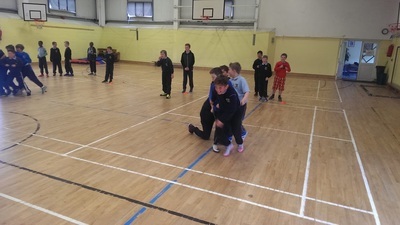 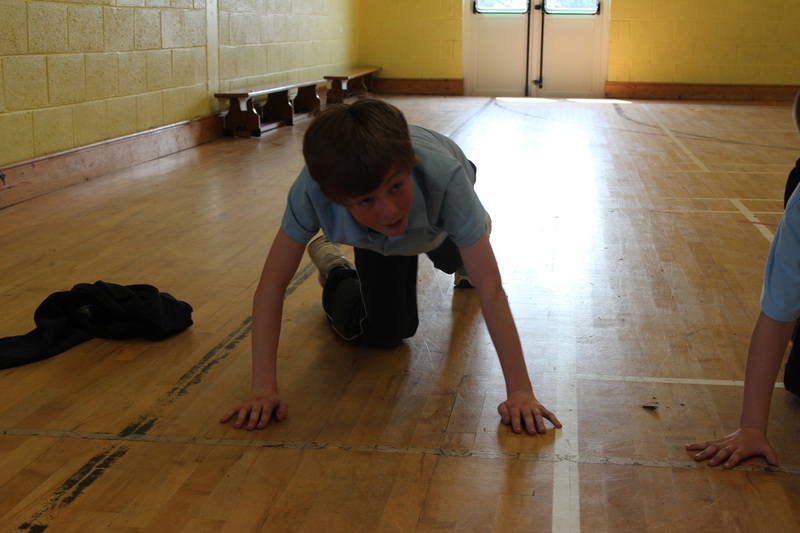 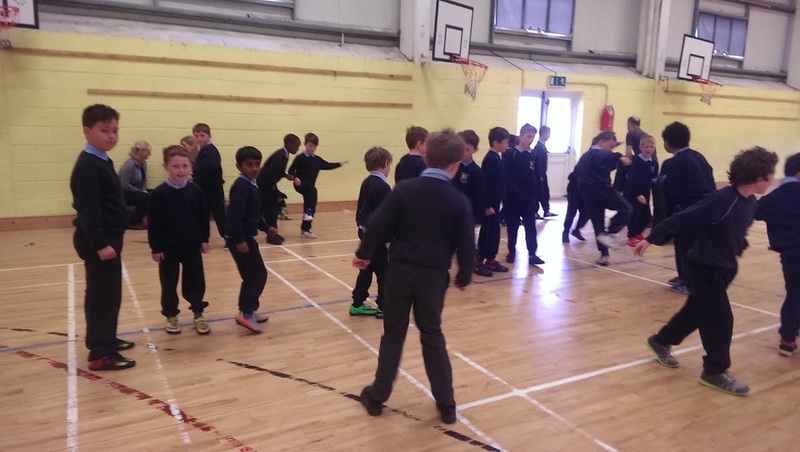 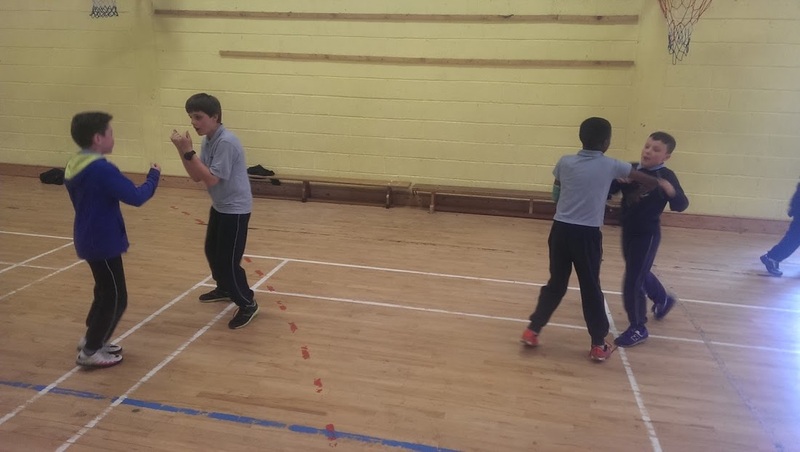 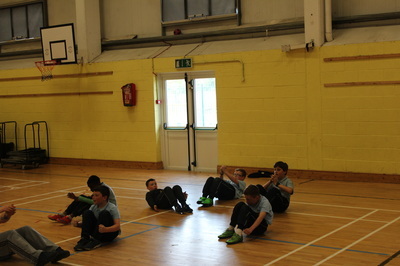 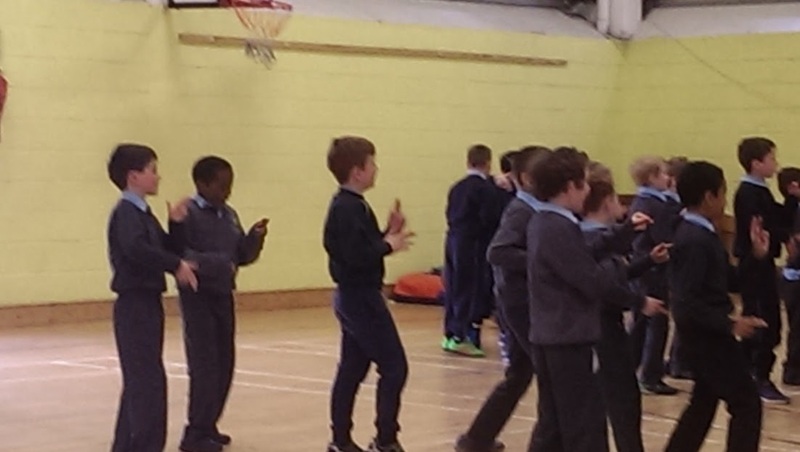 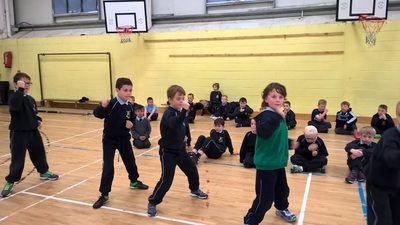 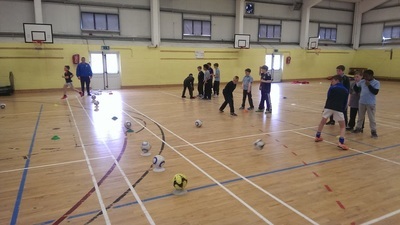 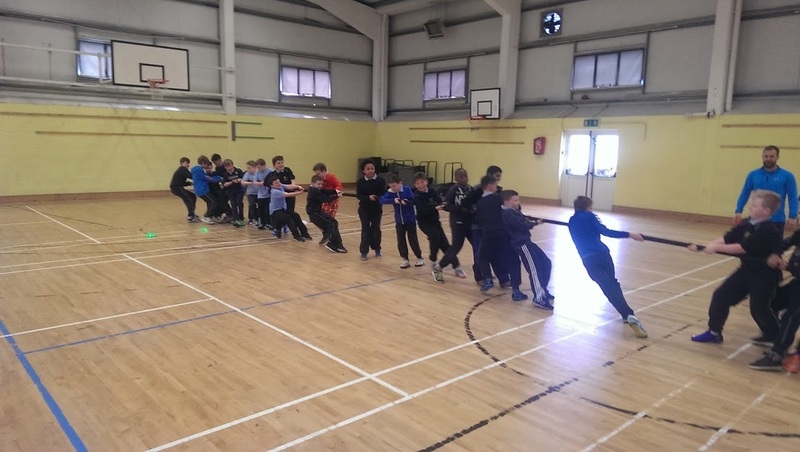 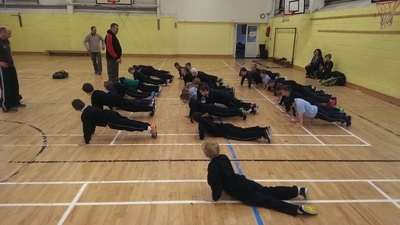 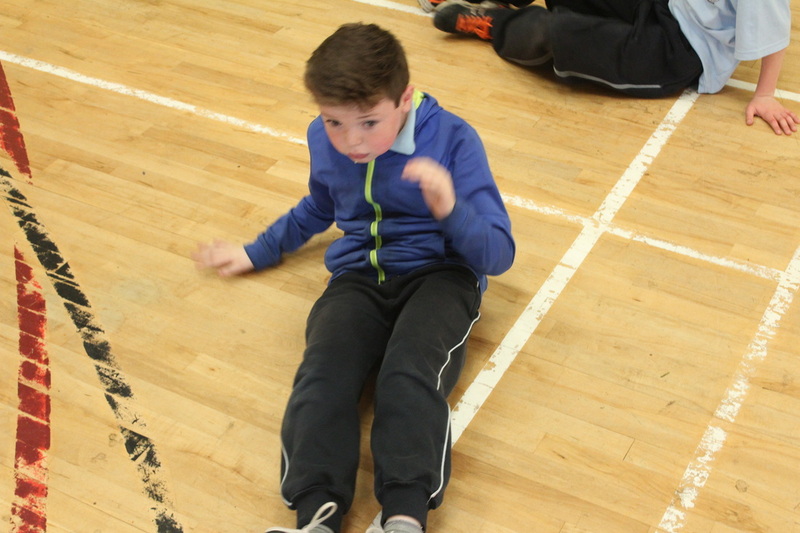 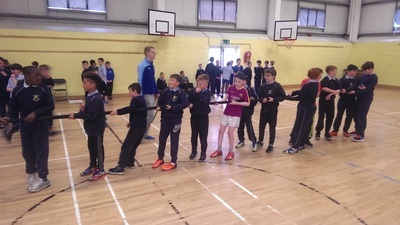 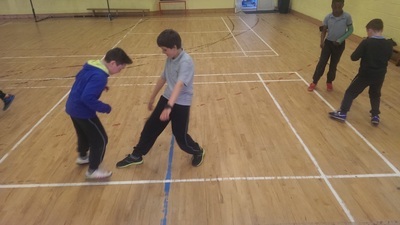 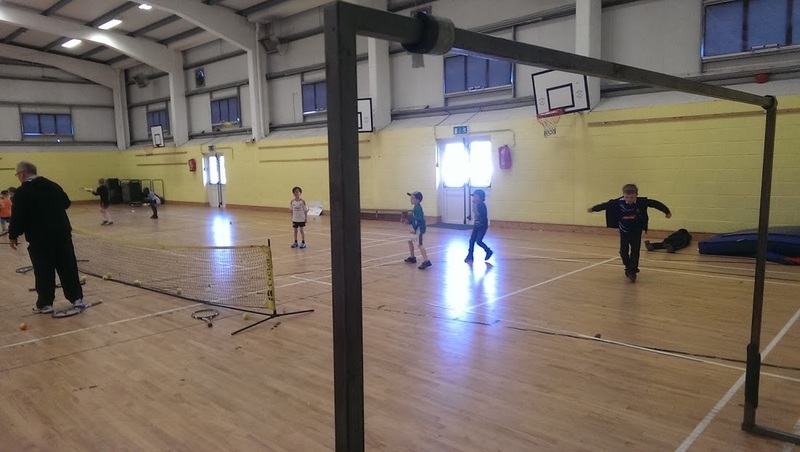 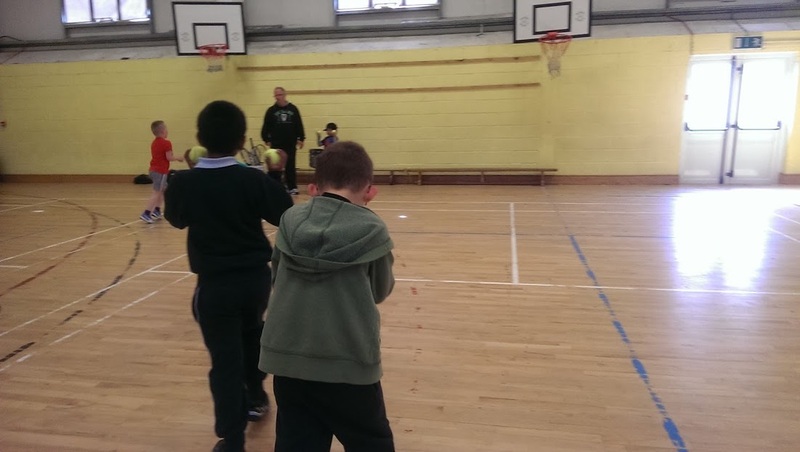 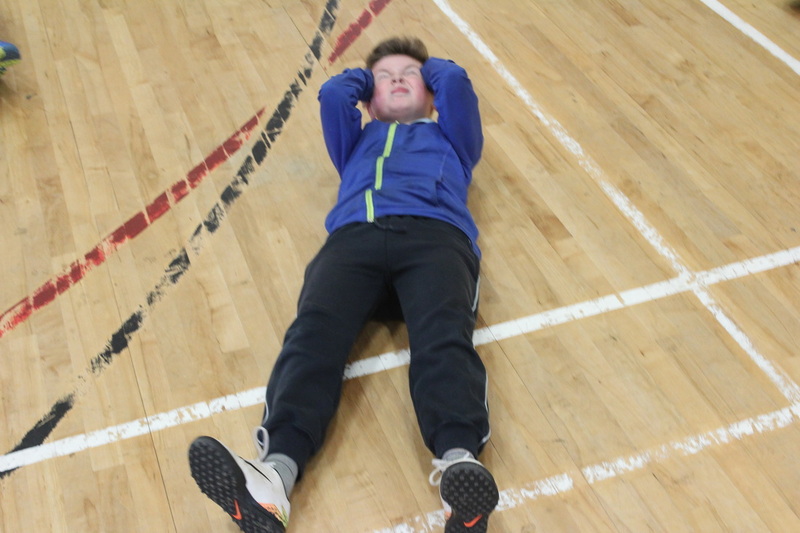 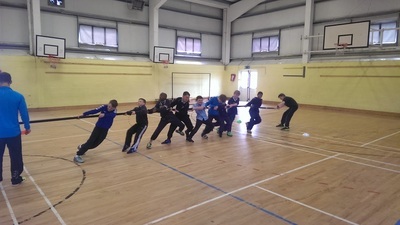 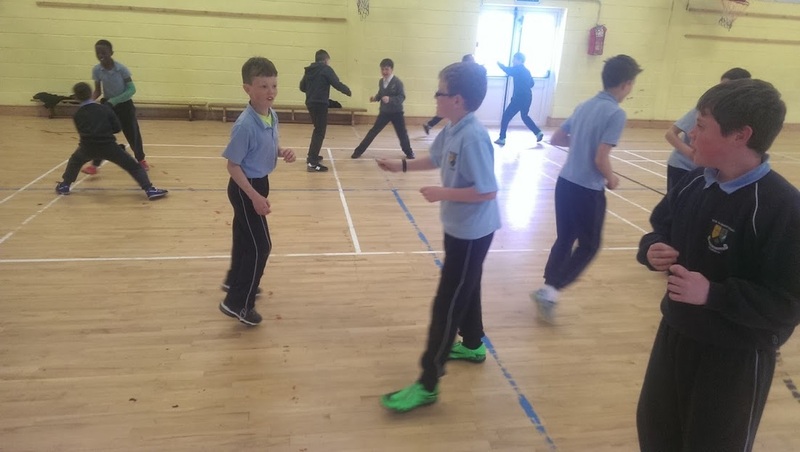 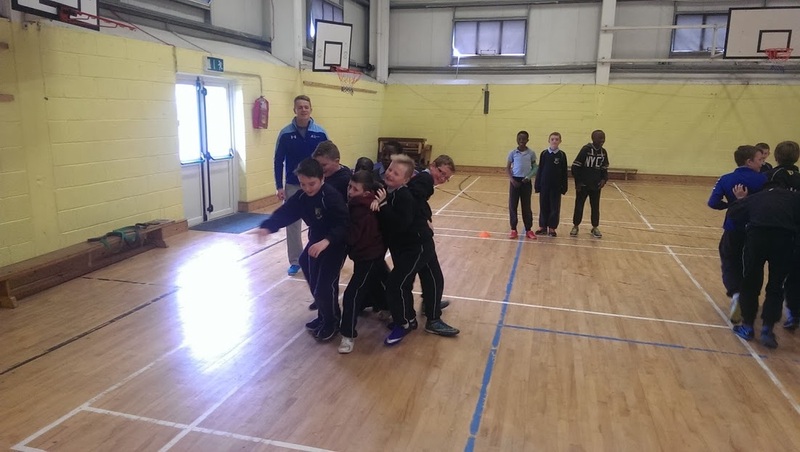 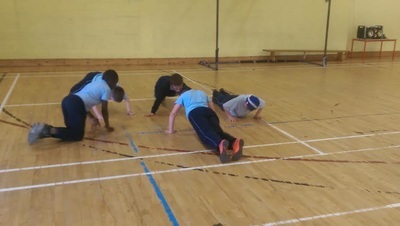 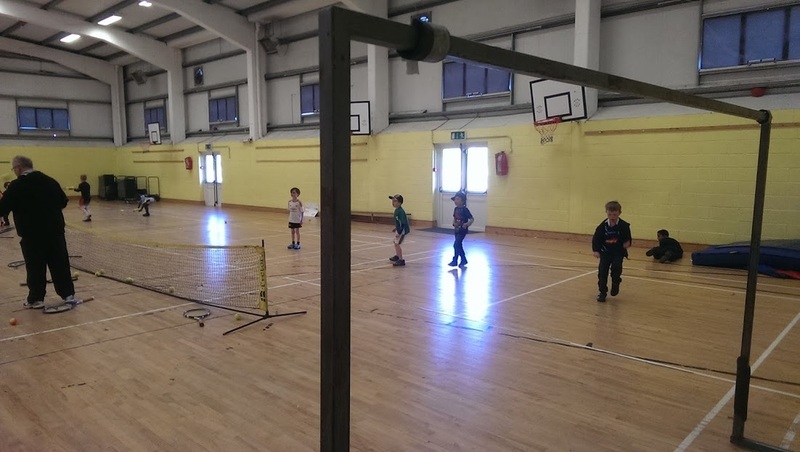 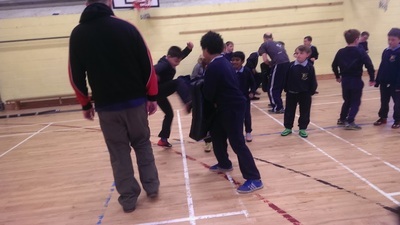 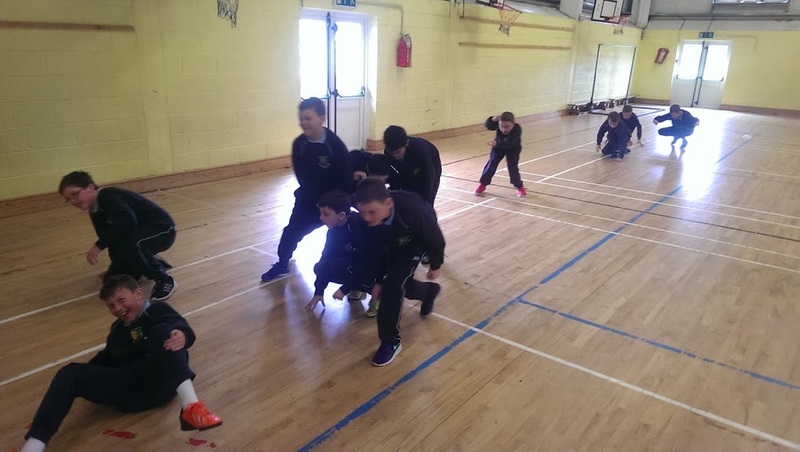 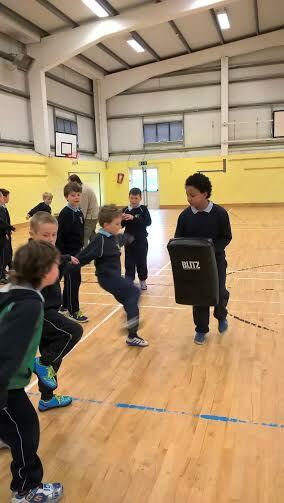 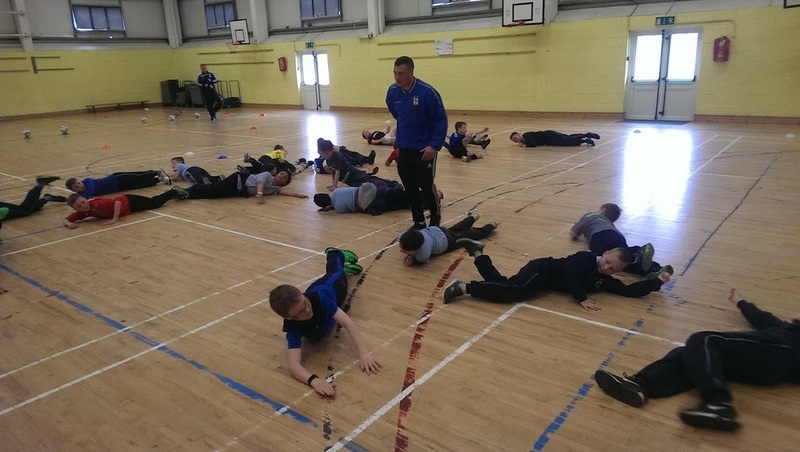 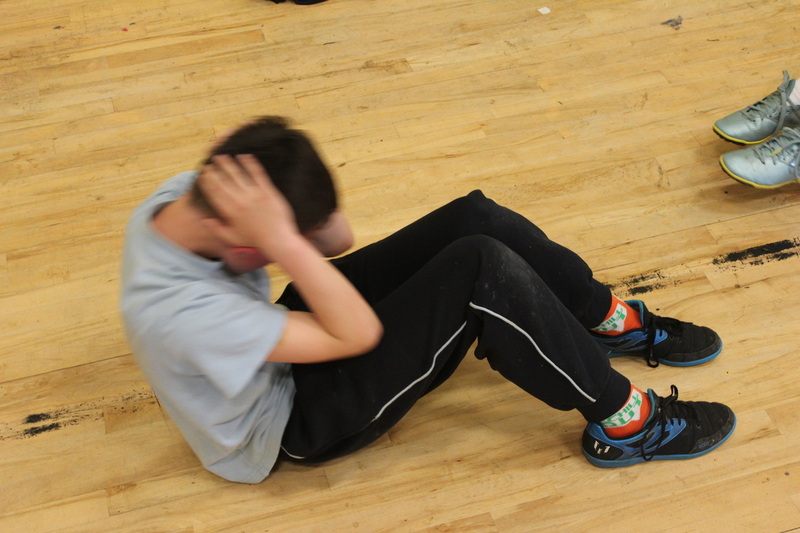 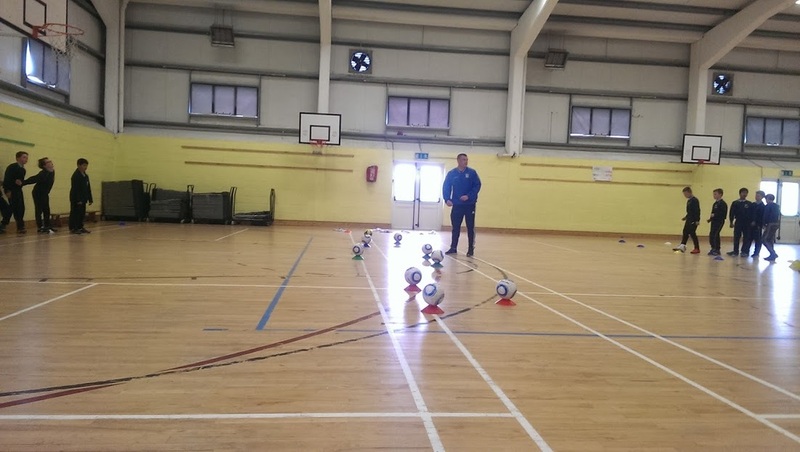 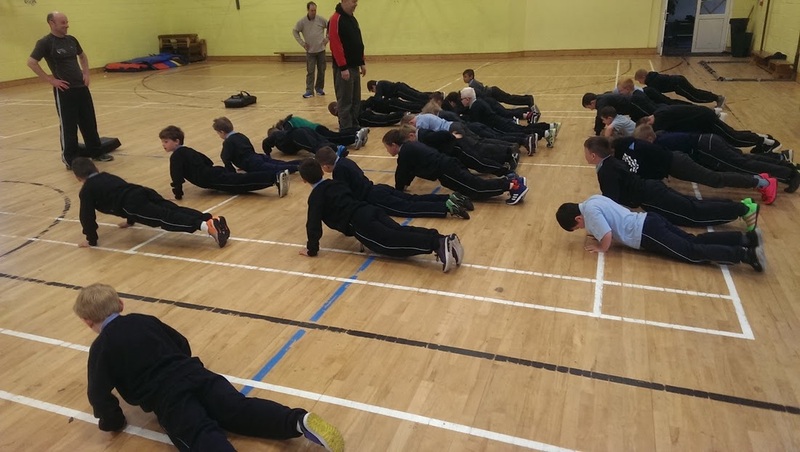 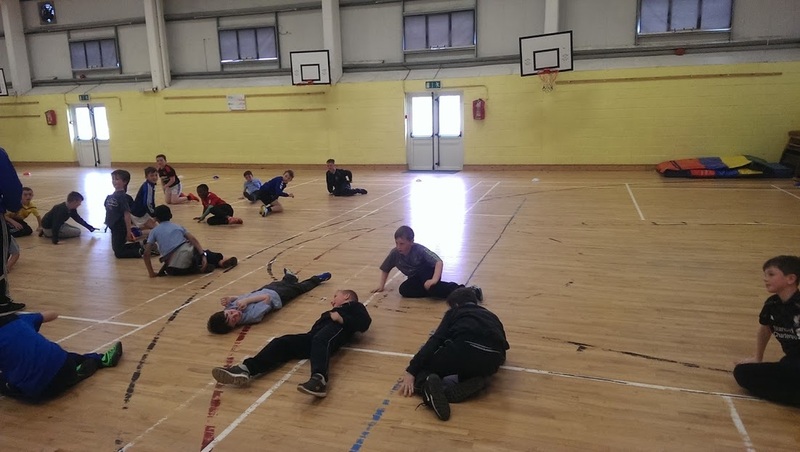 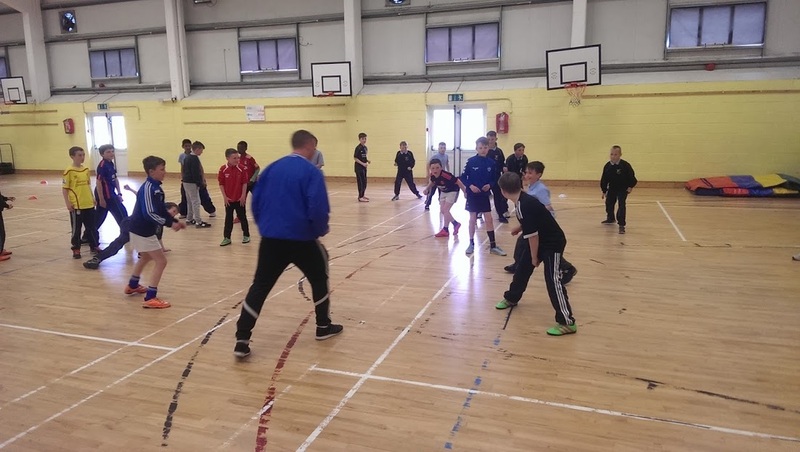 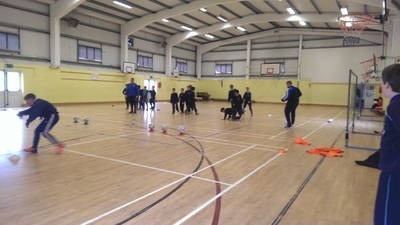 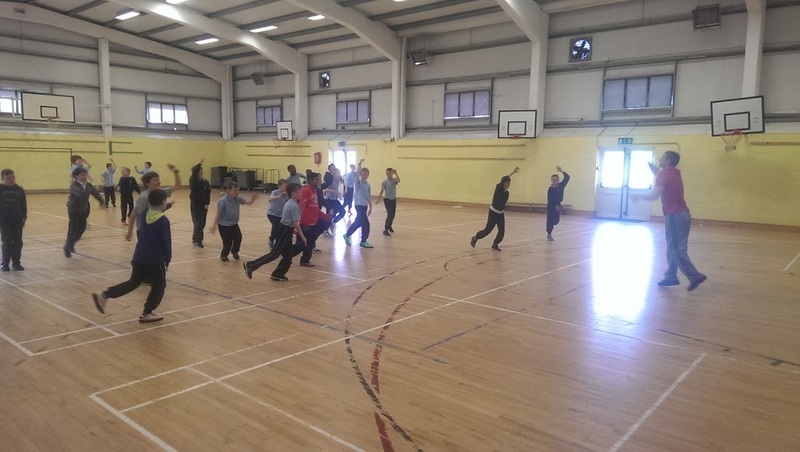 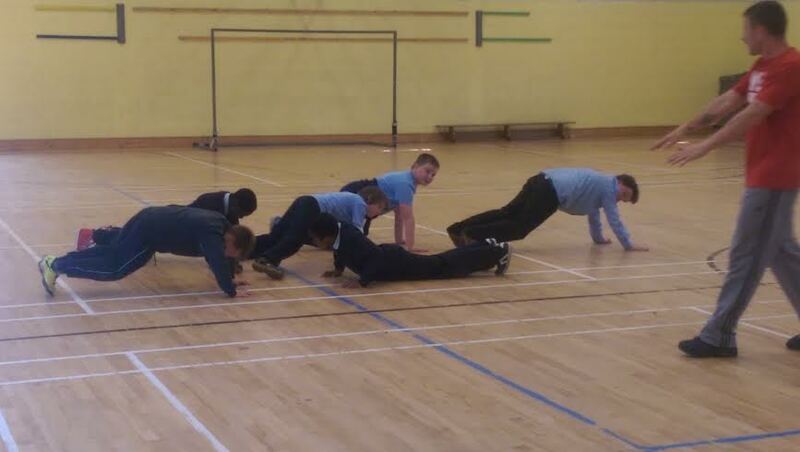 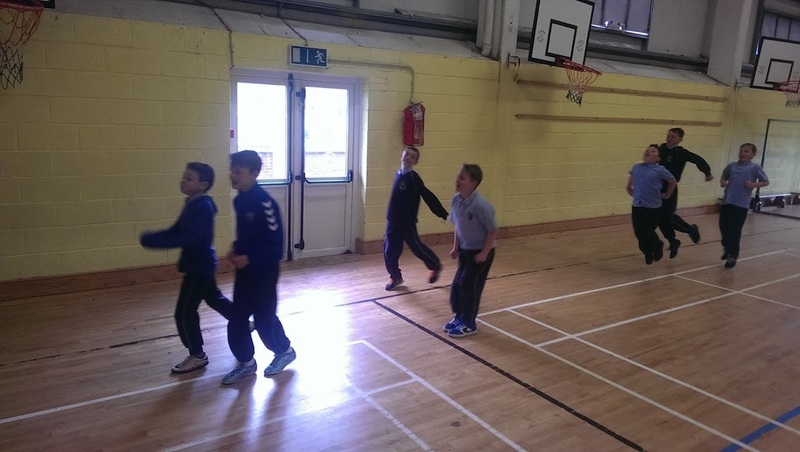 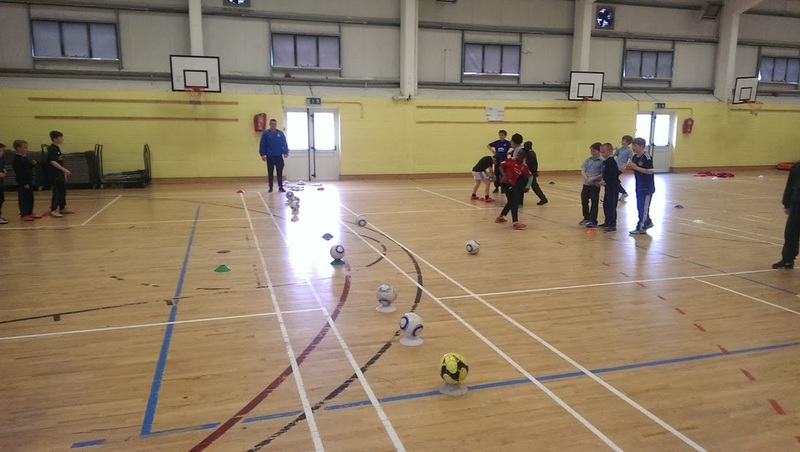 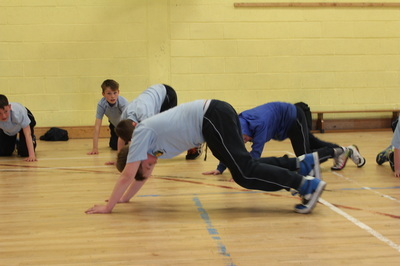 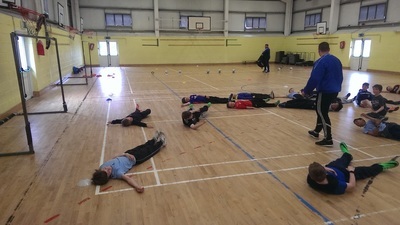 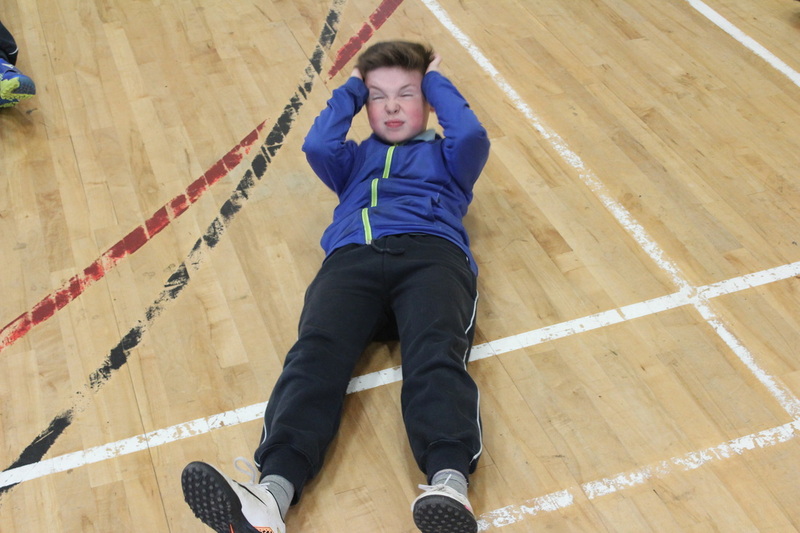 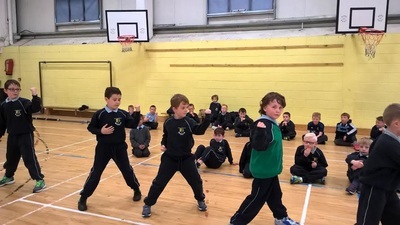 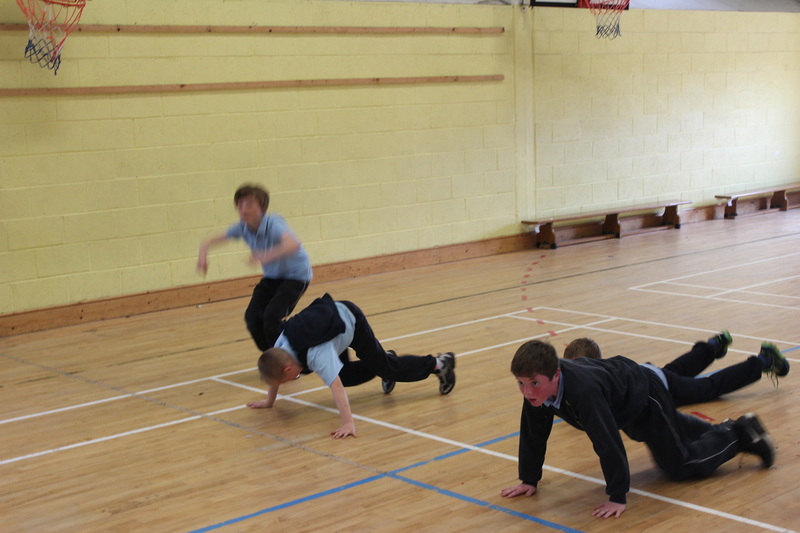 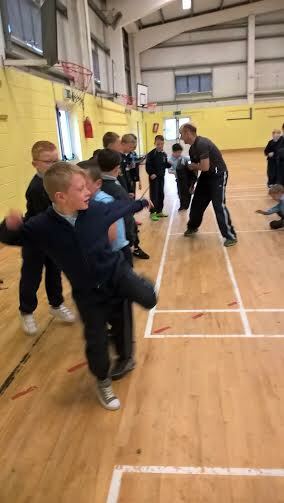 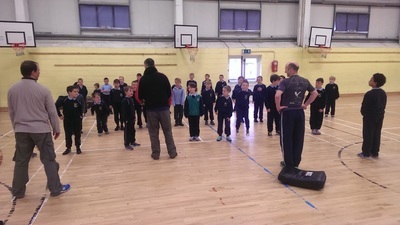 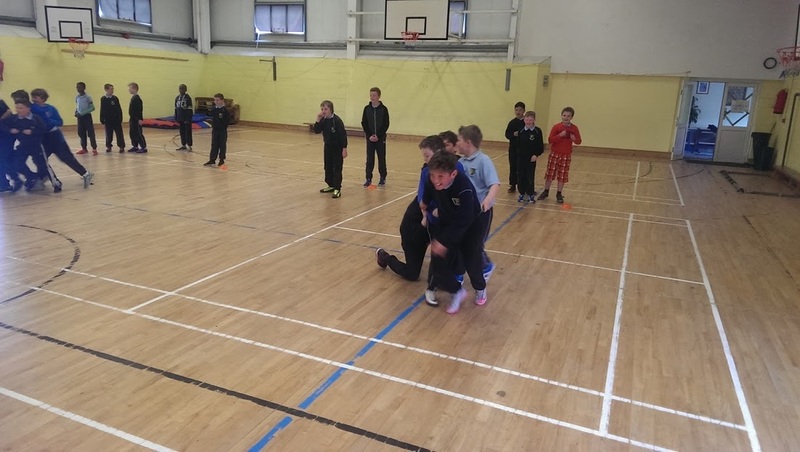 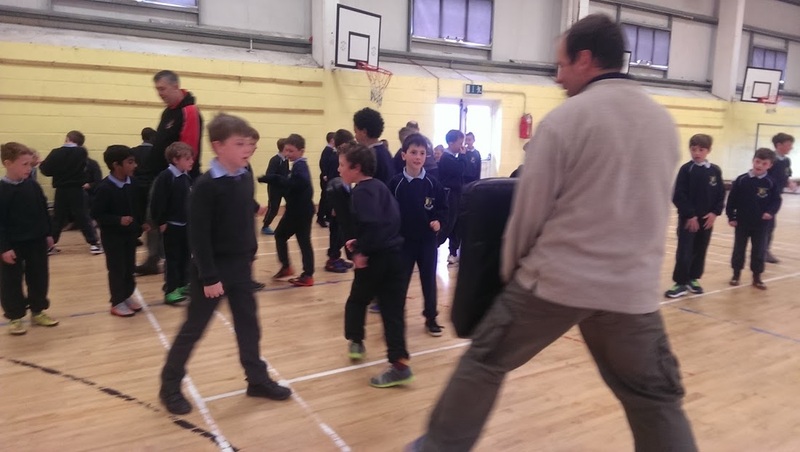 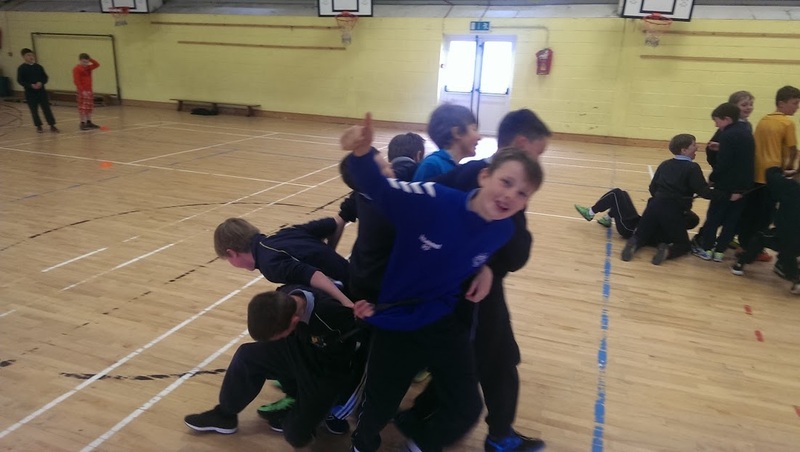 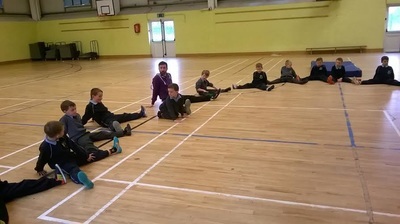 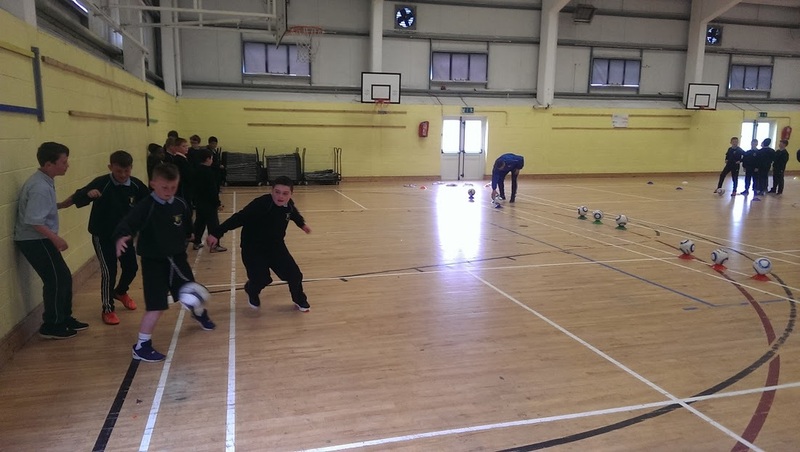 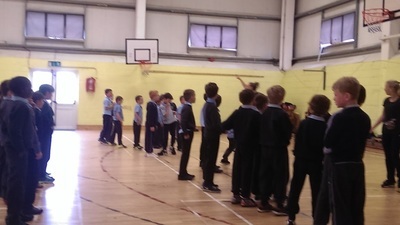 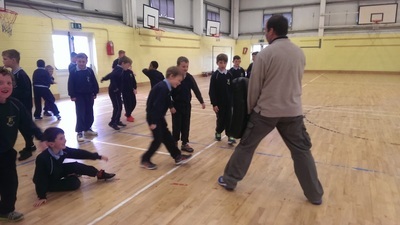 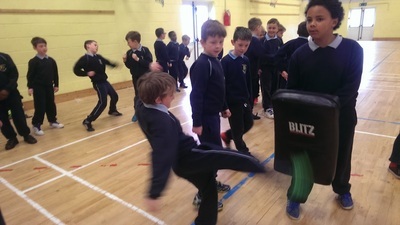 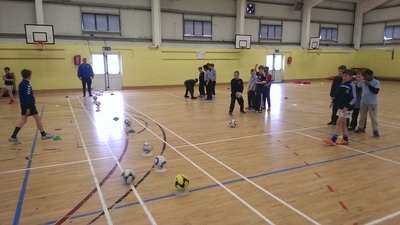 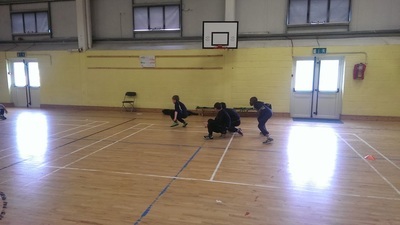 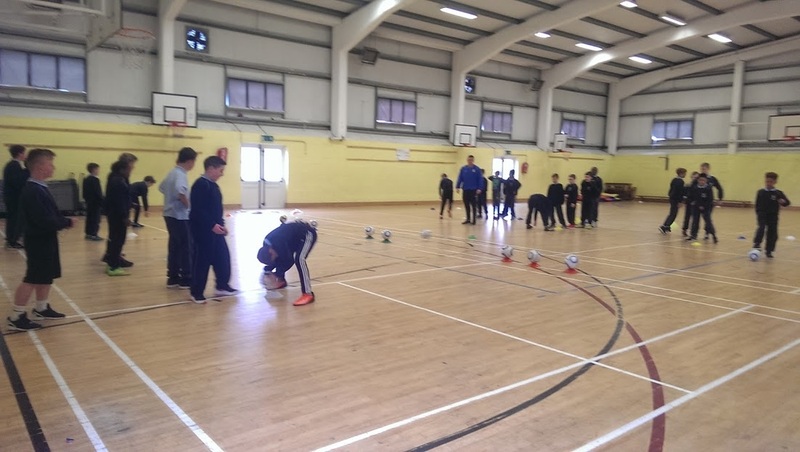 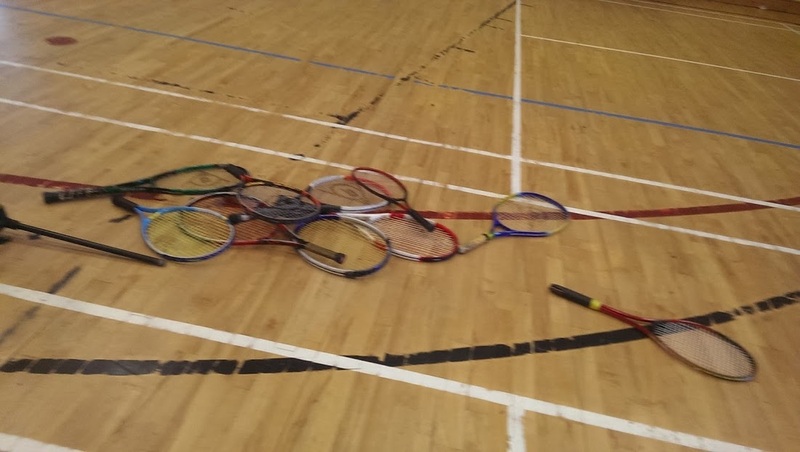 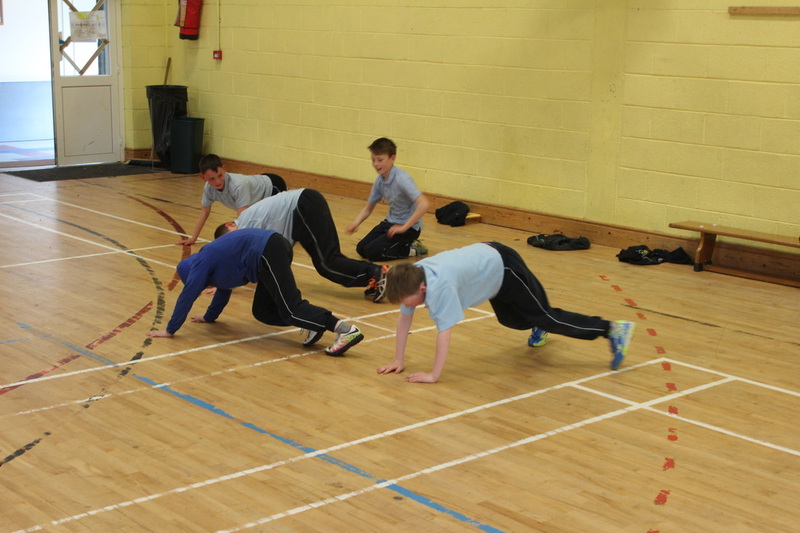 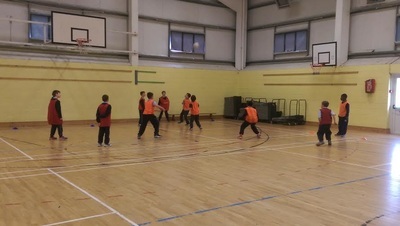 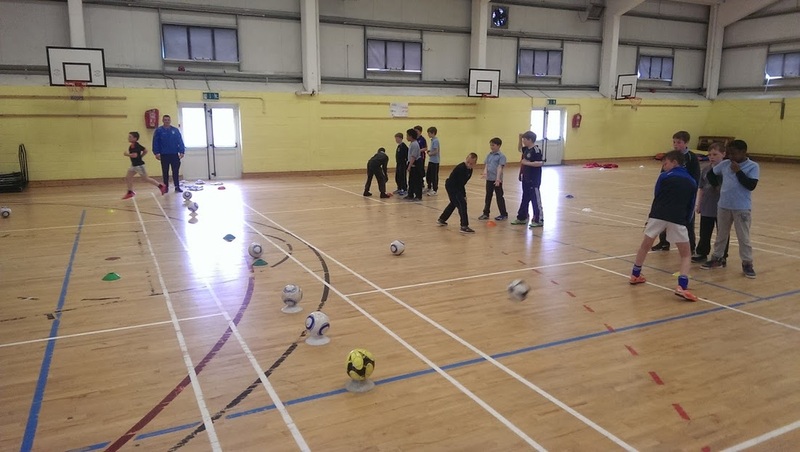 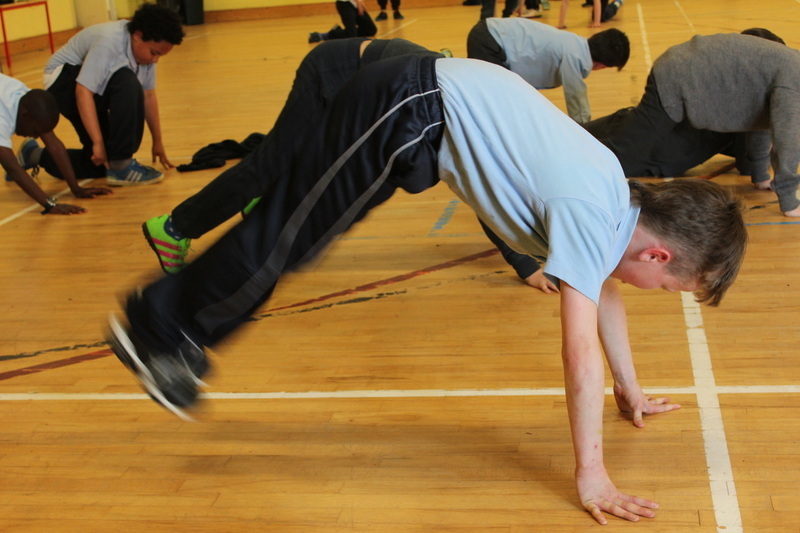 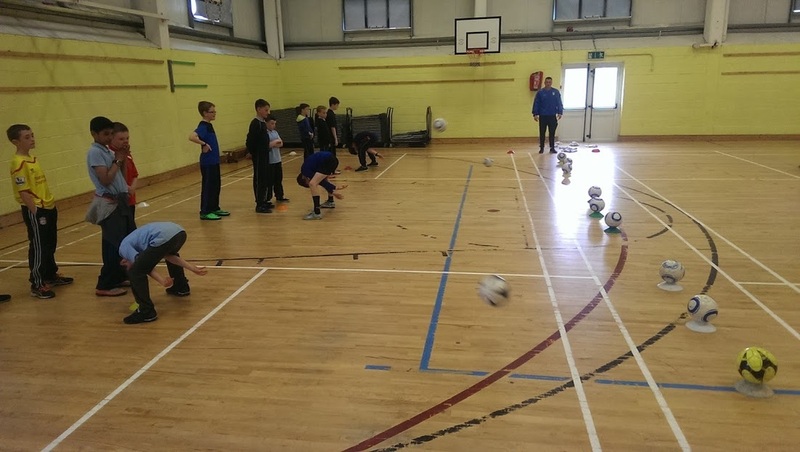 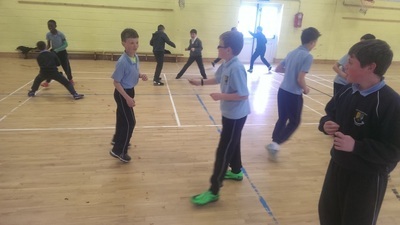 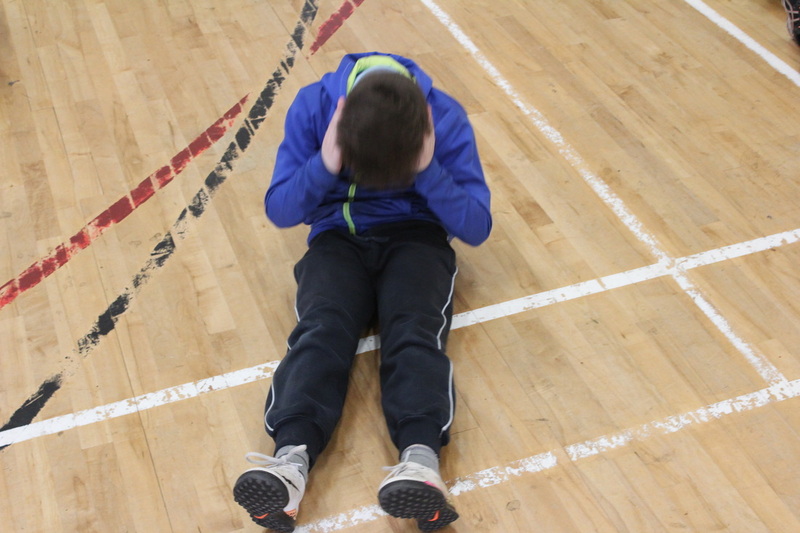 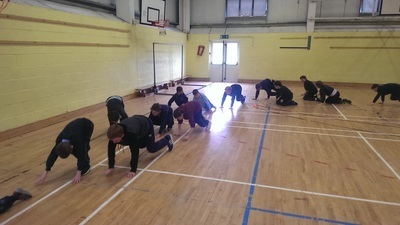 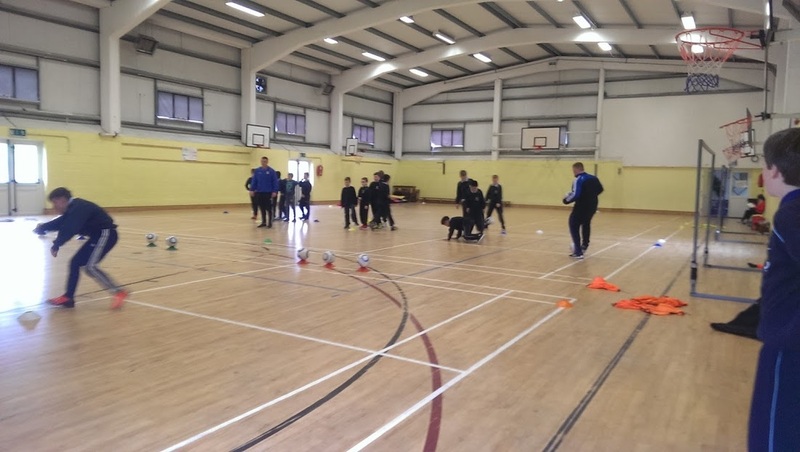 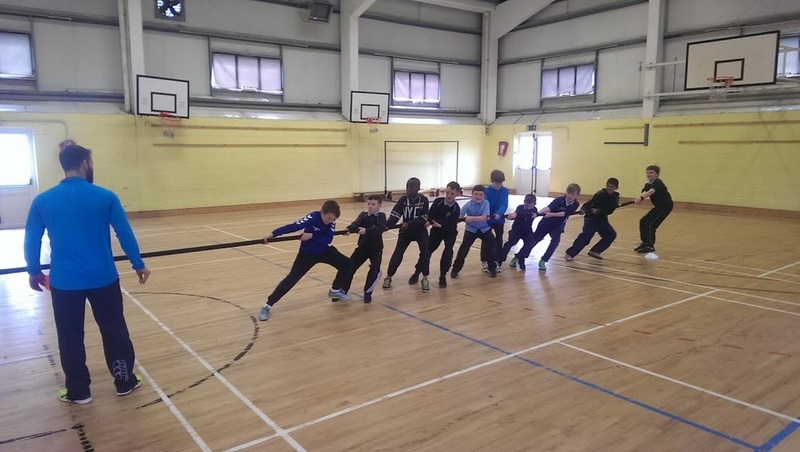 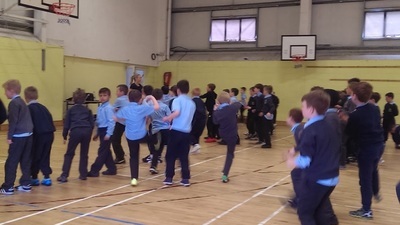 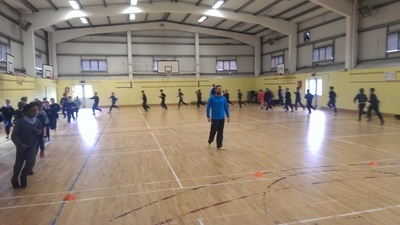 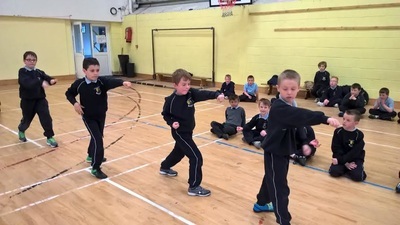 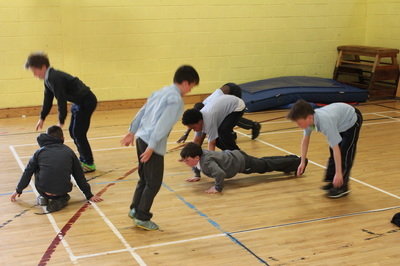 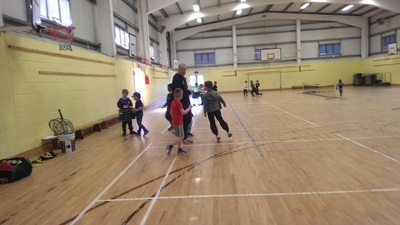 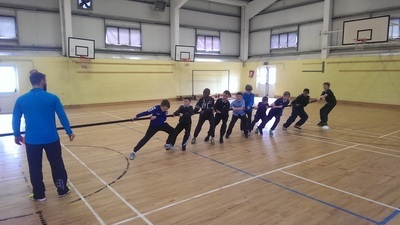 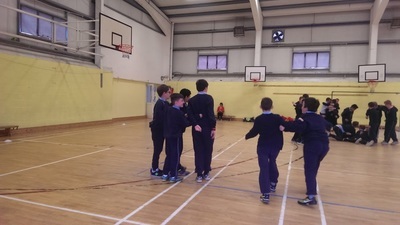 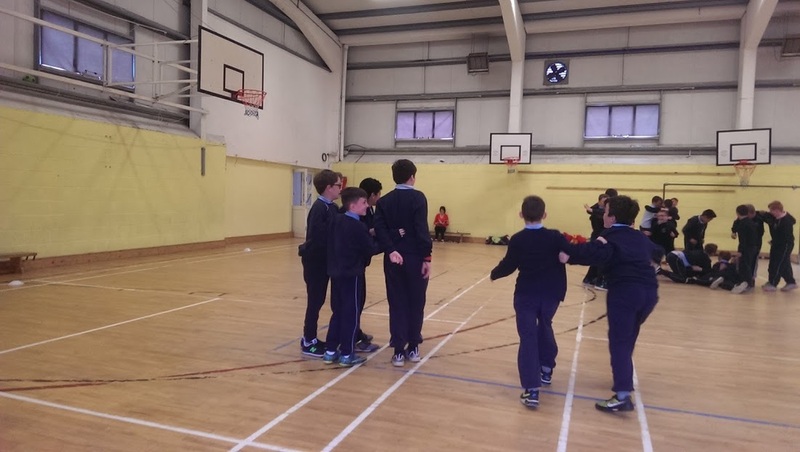 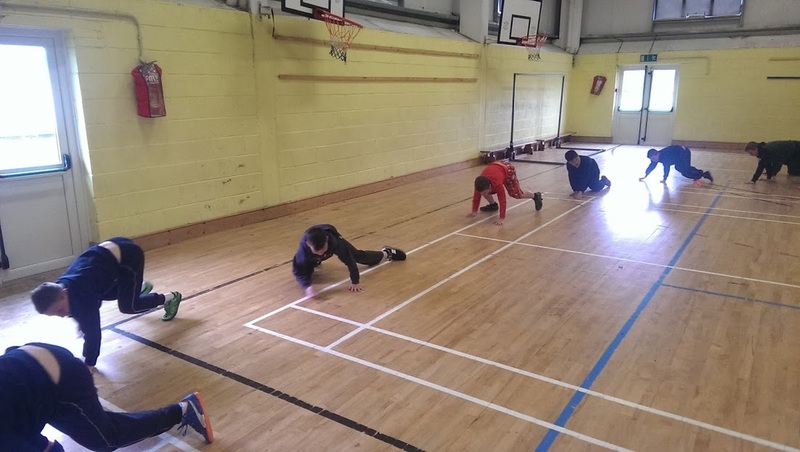 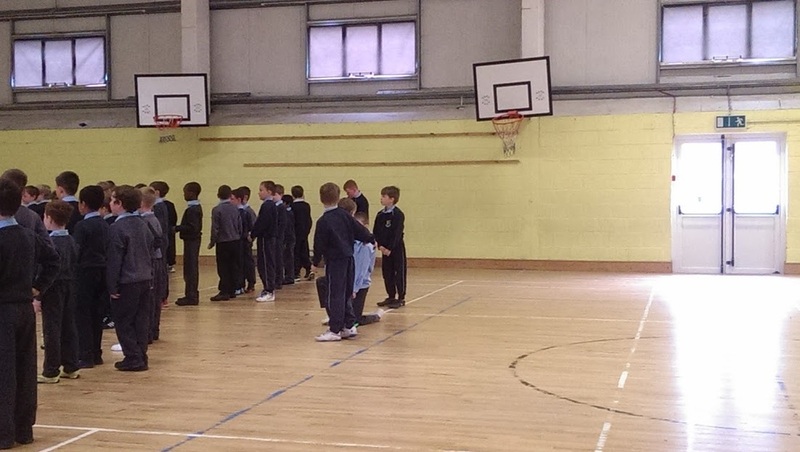 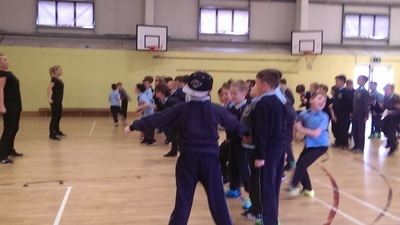 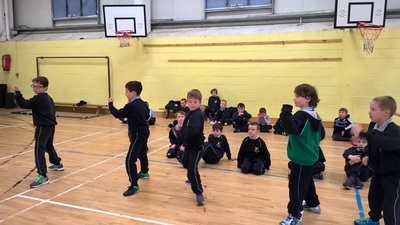 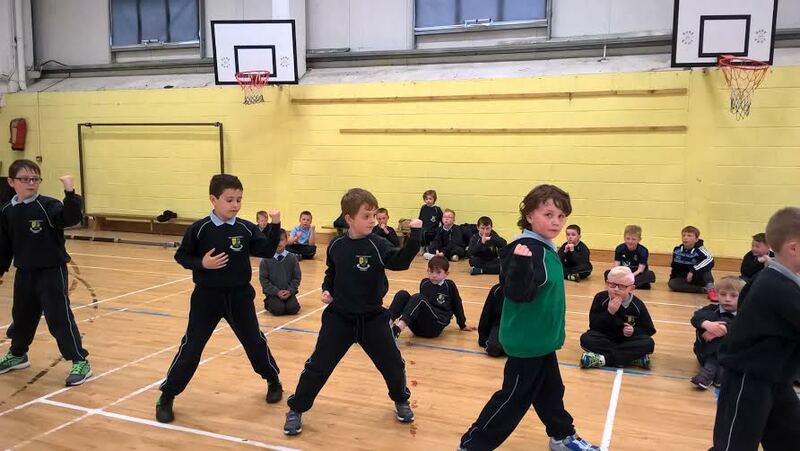 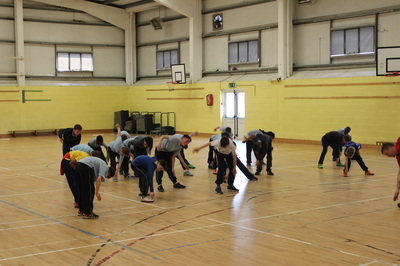 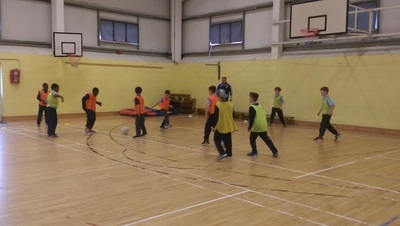 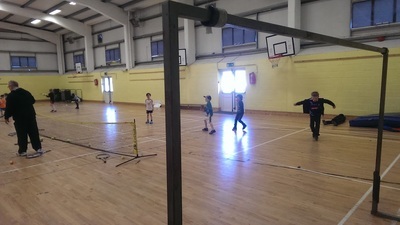 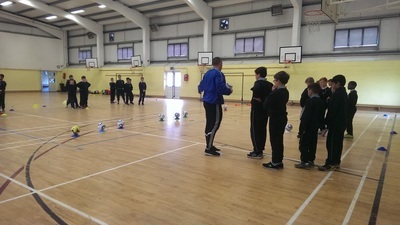 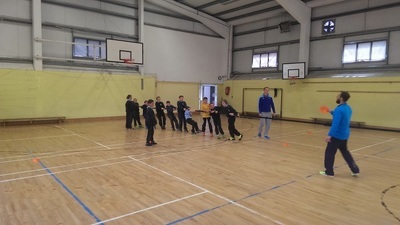 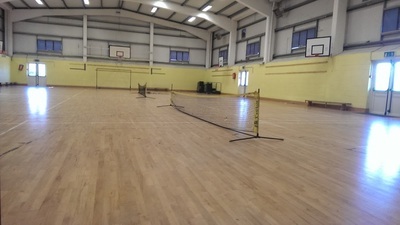 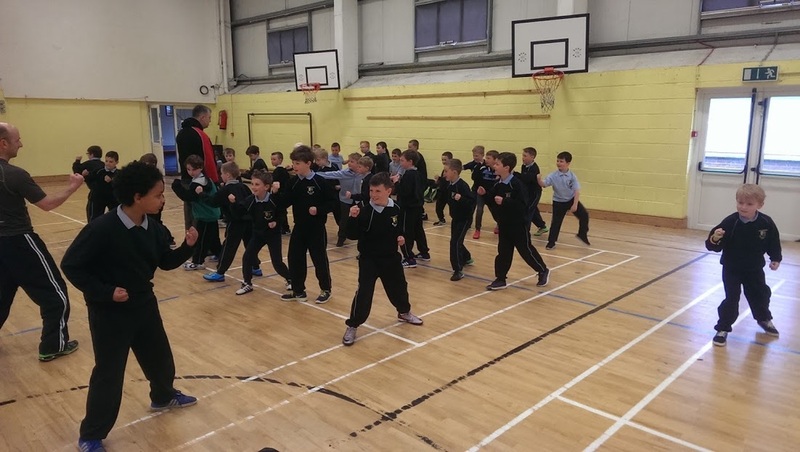 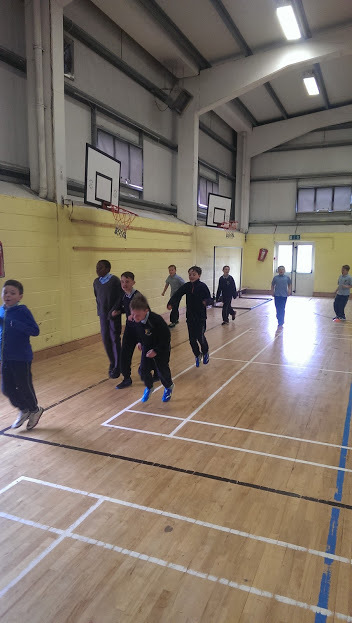 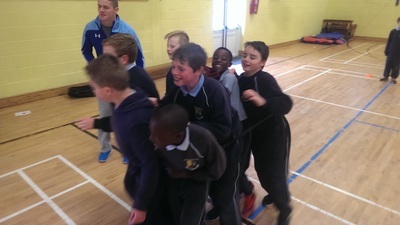 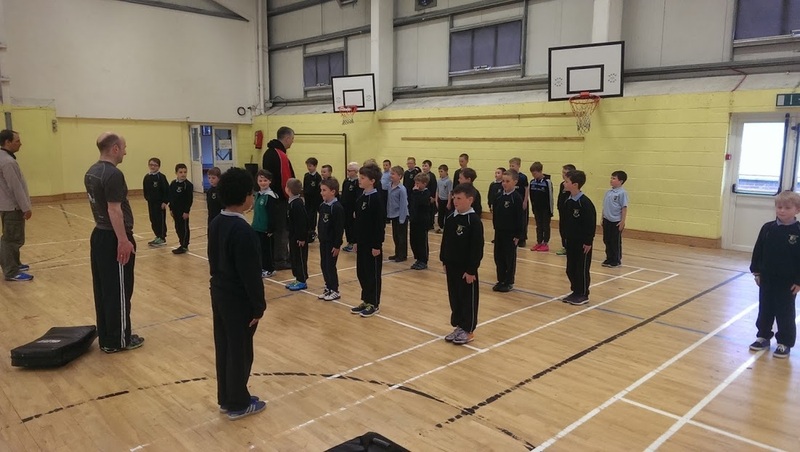 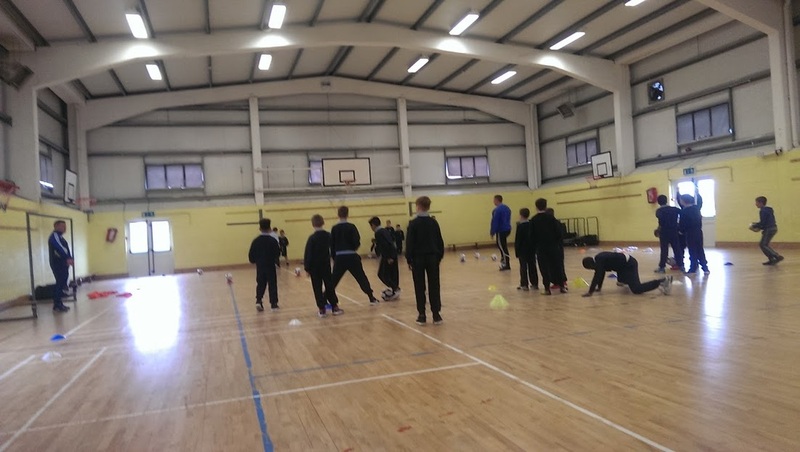 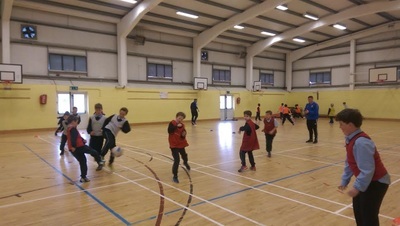 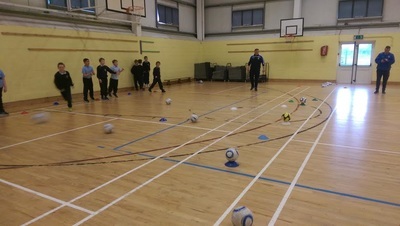 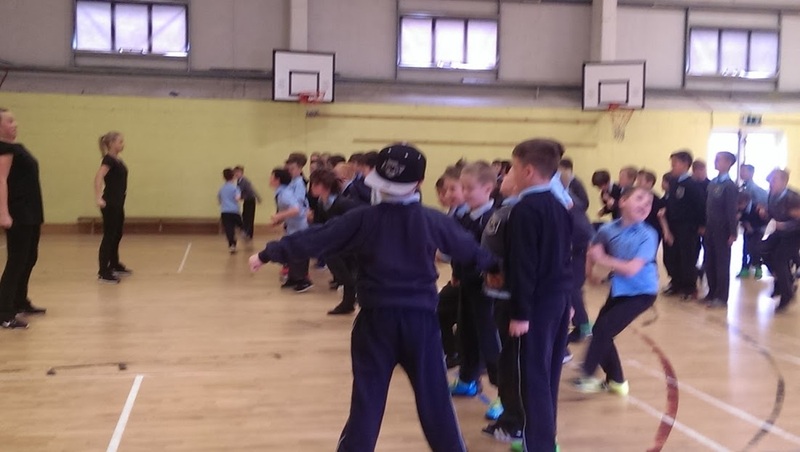 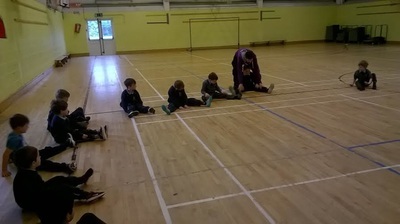 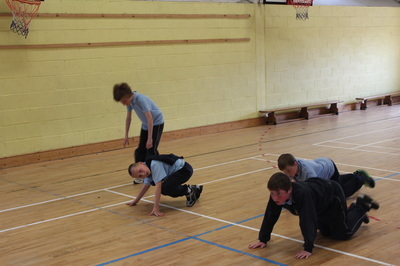 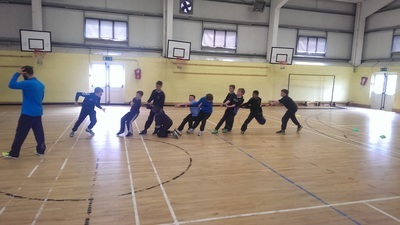 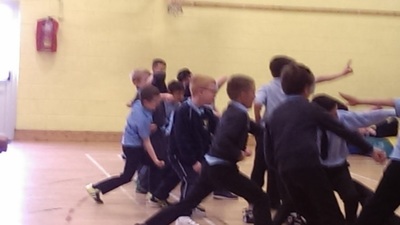 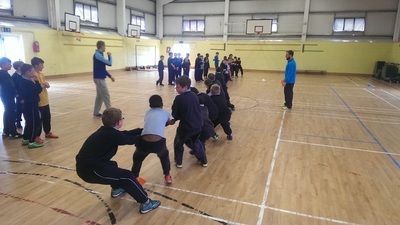 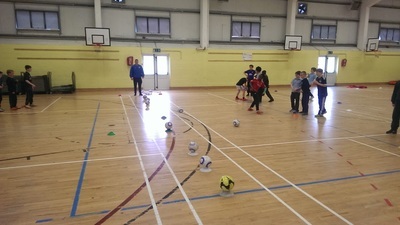 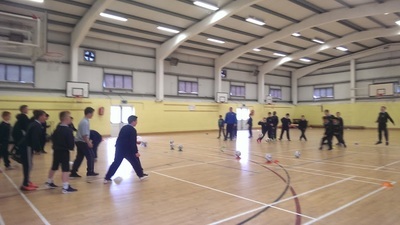 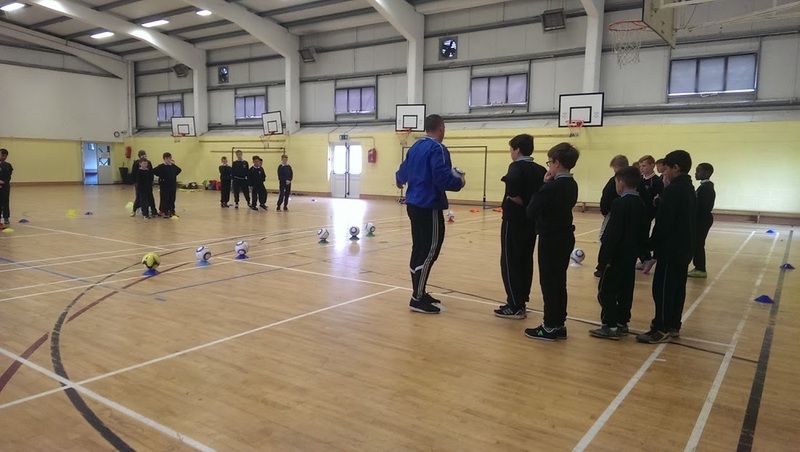 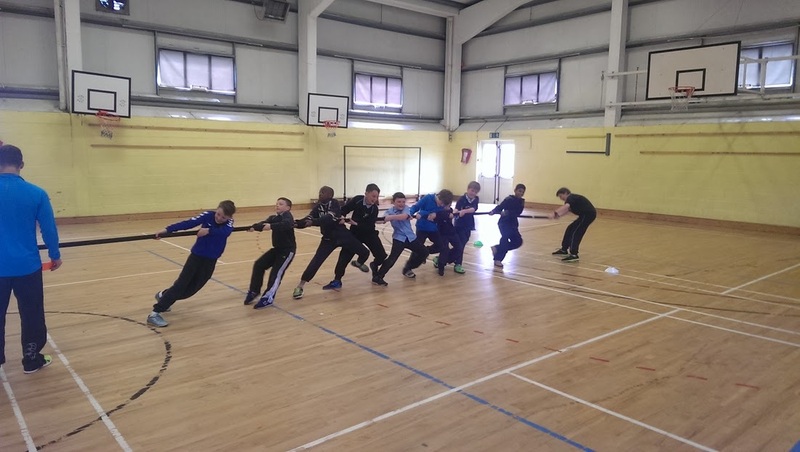 Albert Nagle who runs The Performance Clinic in Celbridge tested the fitness and endurance of the 4th and 5th class boys with some challenging tasks in the hall today. 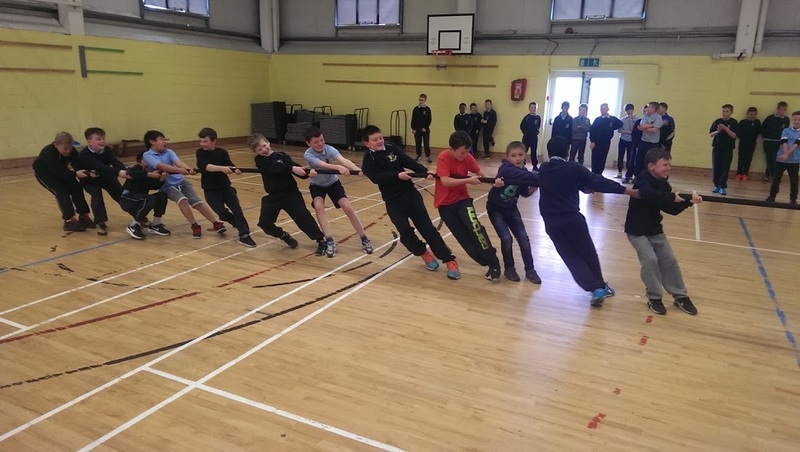 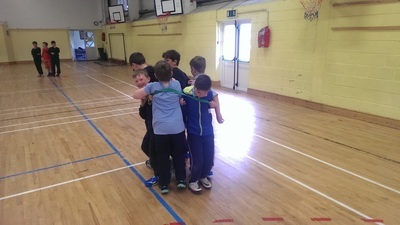 From a vigorous warm up that involved walking like a duck, team building exercises and finally the boys favourite activity Tug of War, the boys had a most enjoyable and vigorous half hour session. We are very grateful to Albert and fellow coach Patrick for taking the time to visit us and lend us their expertise. 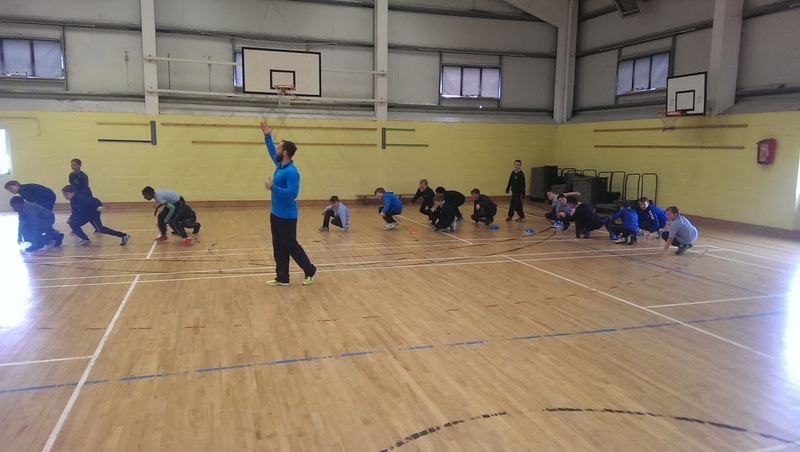 Anyone looking for more information on the performance clinic can check out their website ​http://www.performanceclinic.ie/. 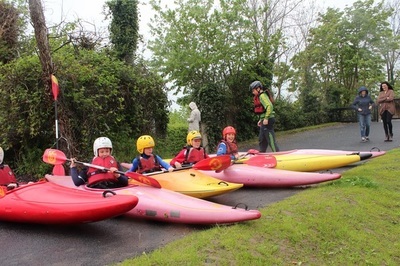 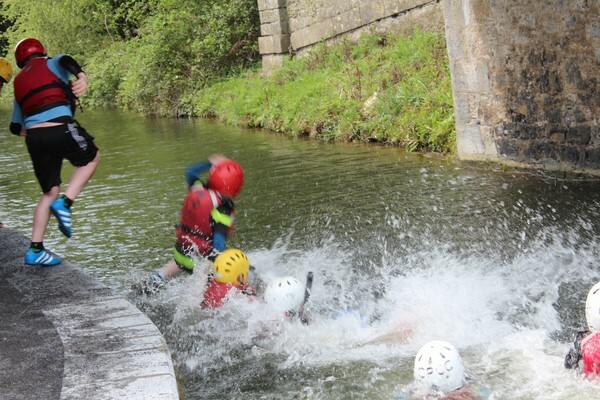 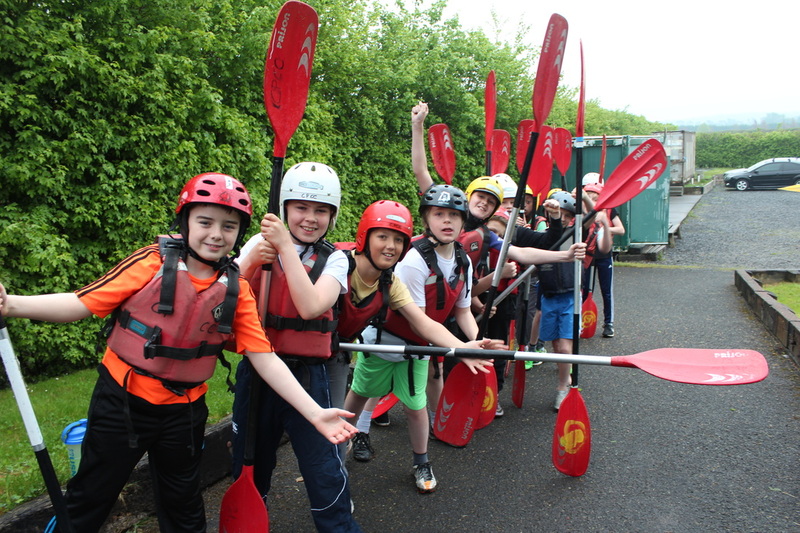 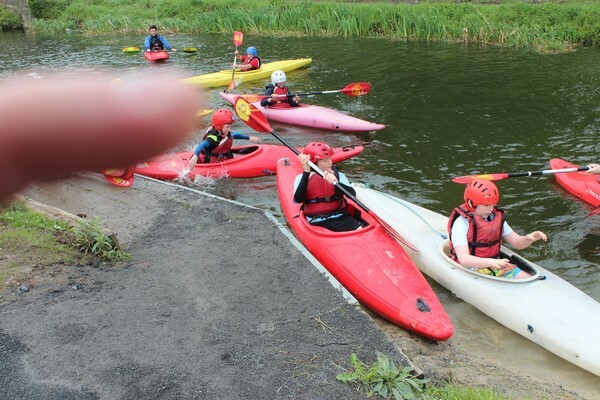 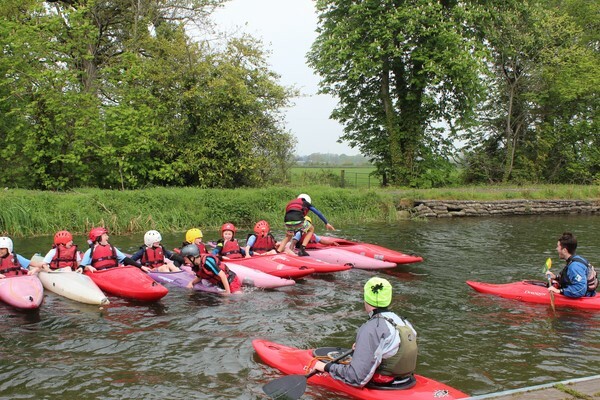 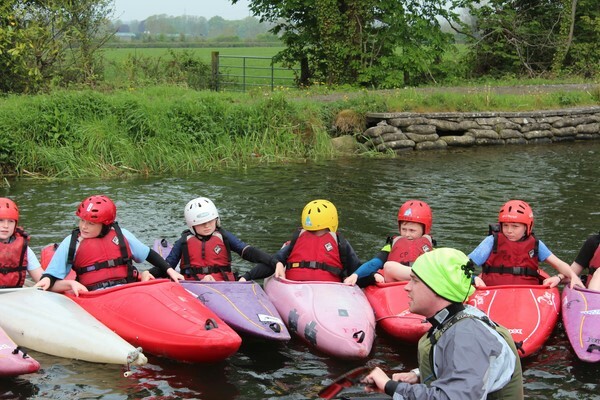 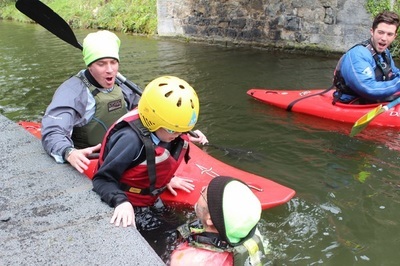 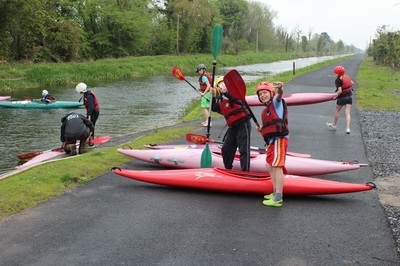 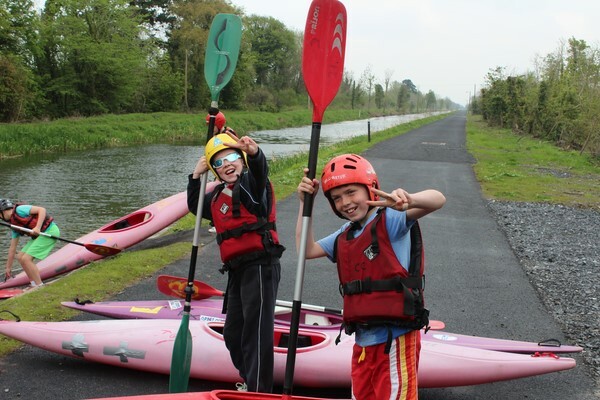 5th Class boys had a splashing time on the Grand Canal courtesy of our local Canoe Club, Celbridge Paddlers. The club goes to extraordinary lengths each year to facilitate us during Active Schools Week and we very much appreciate the members of the club taking time off work to coach the boys today. 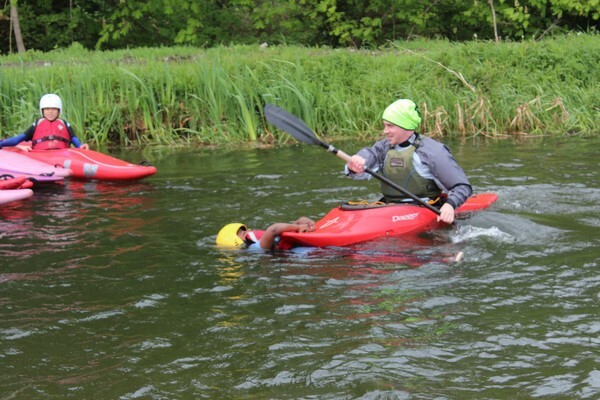 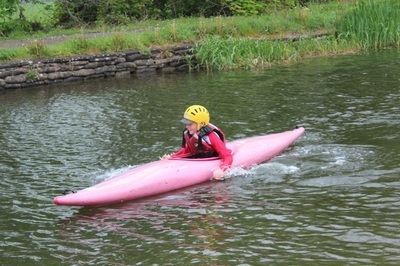 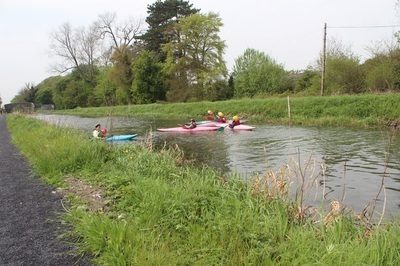 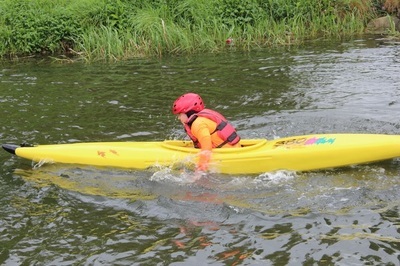 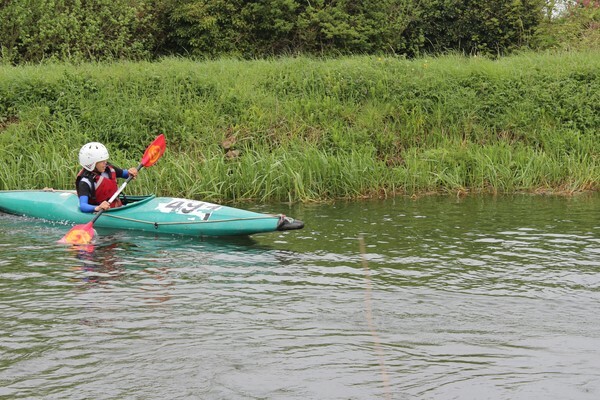 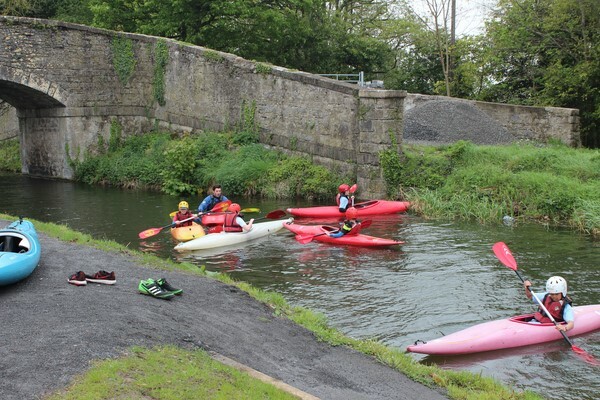 Full details of Celbridge Paddlers can be found on their website here. 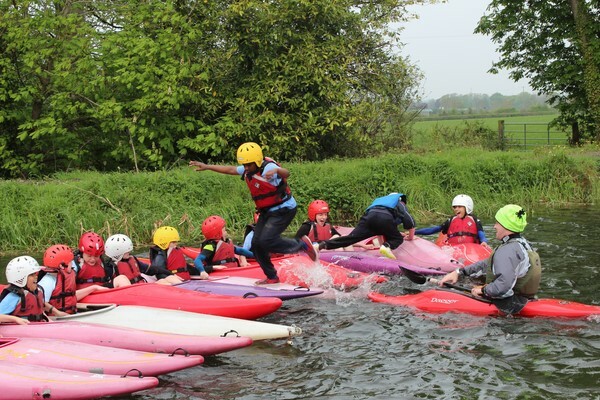 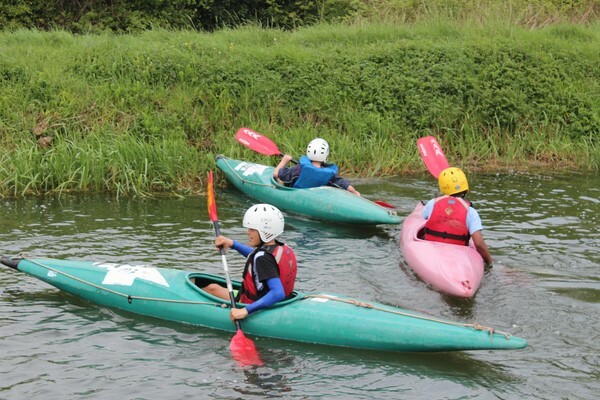 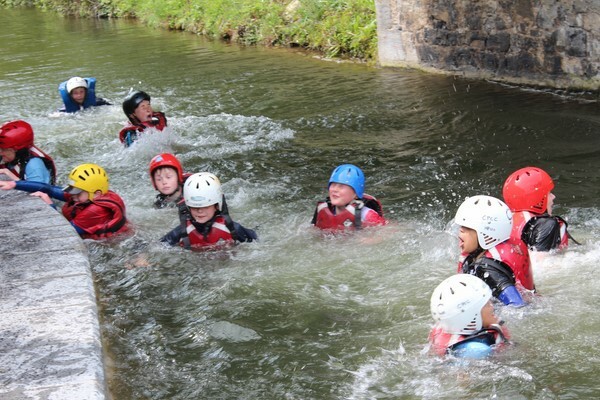 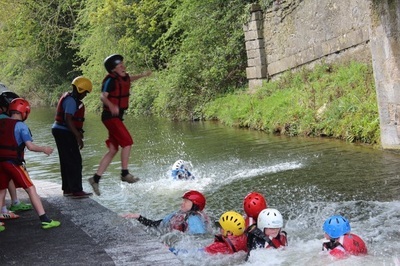 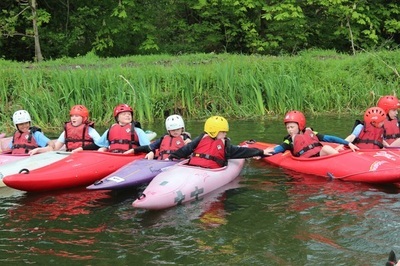 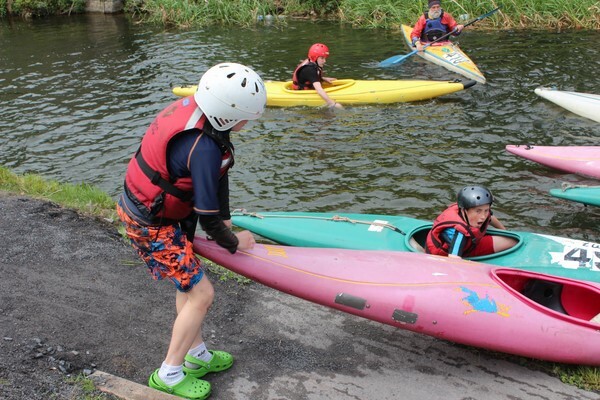 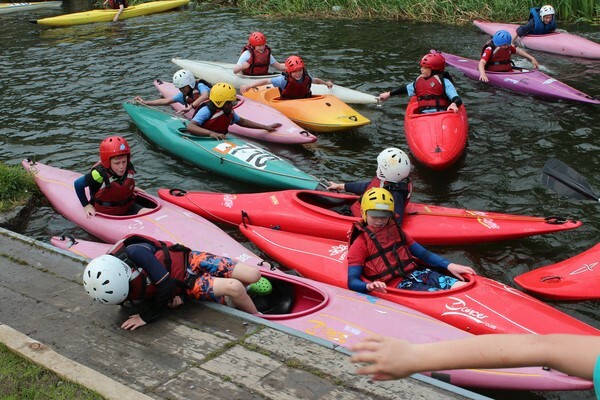 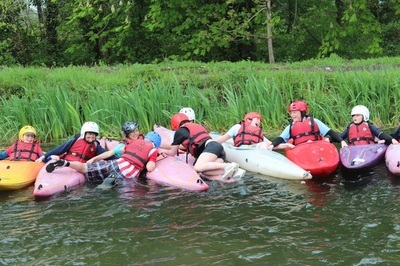 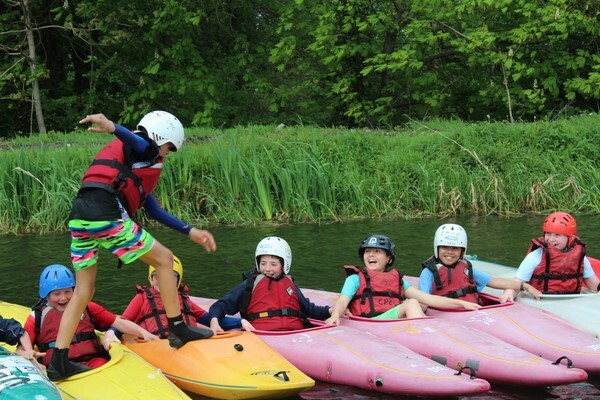 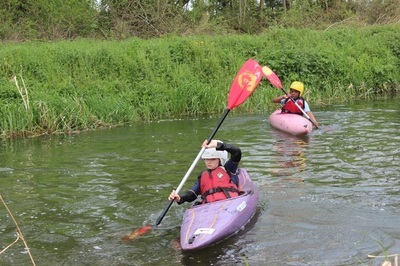 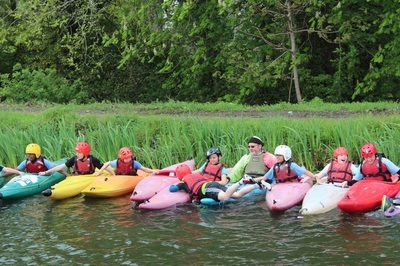 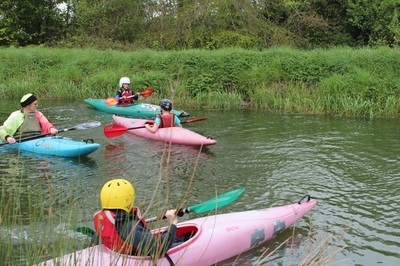 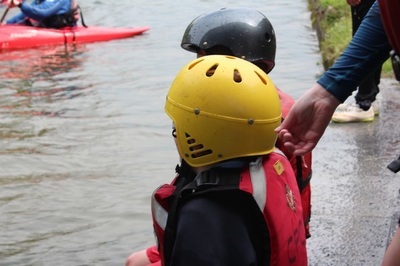 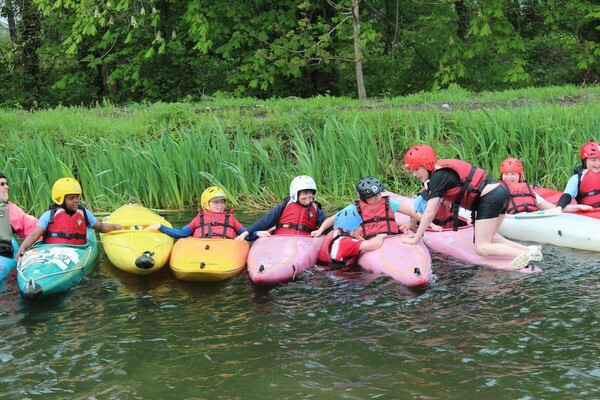 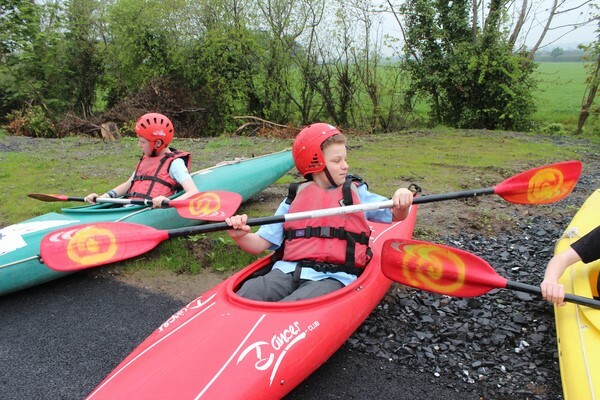 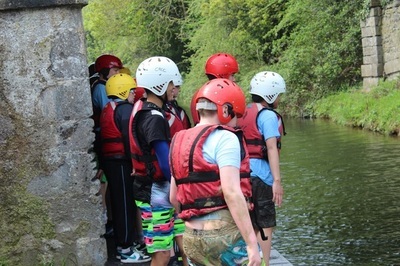 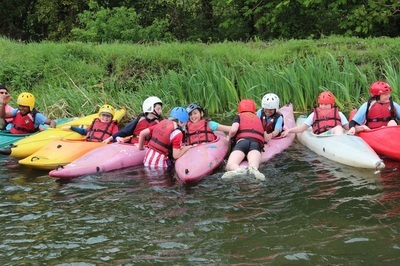 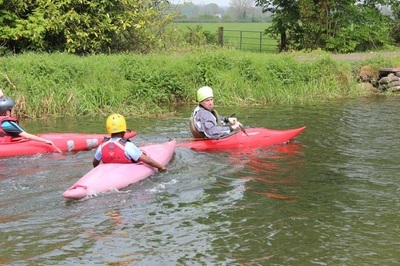 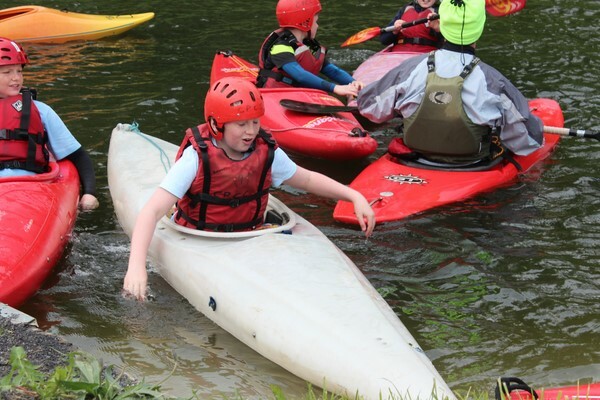 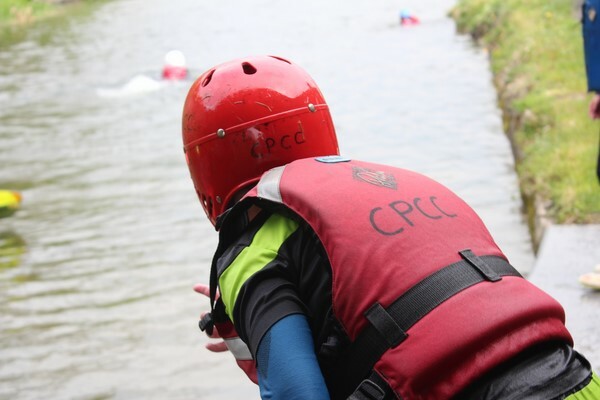 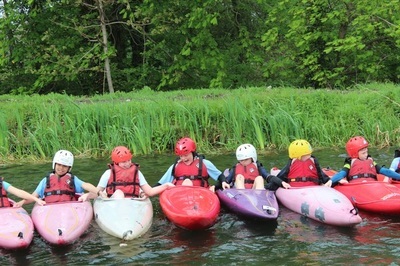 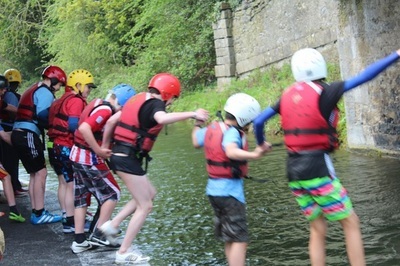 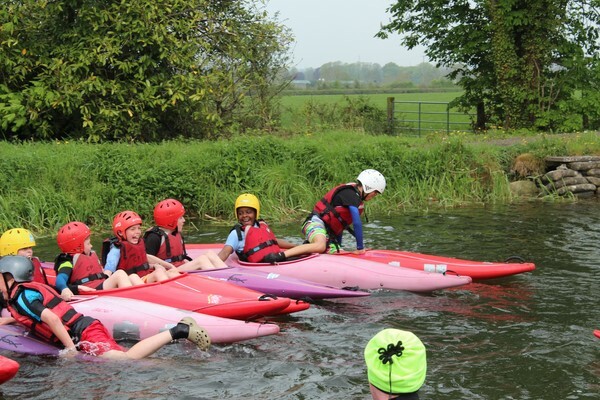 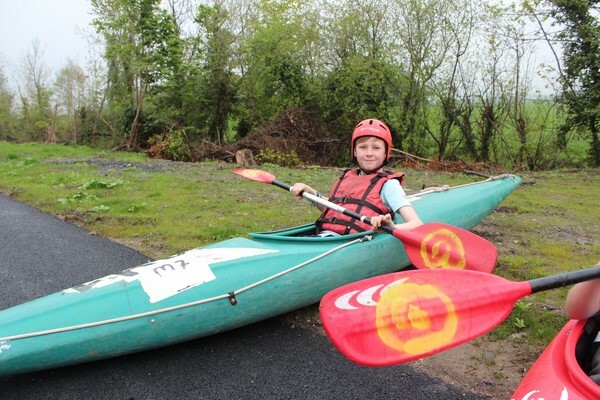 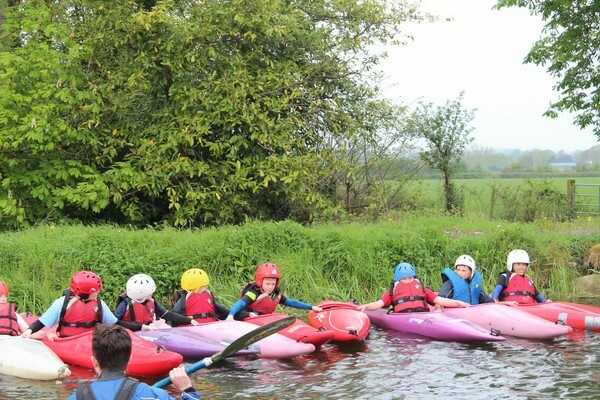 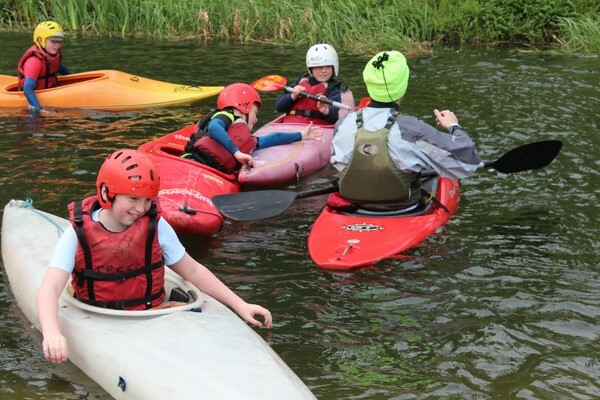 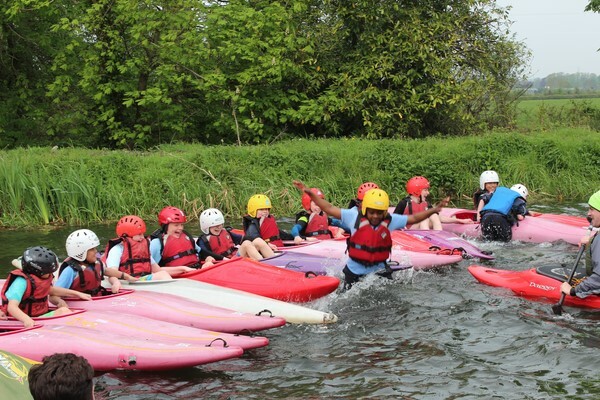 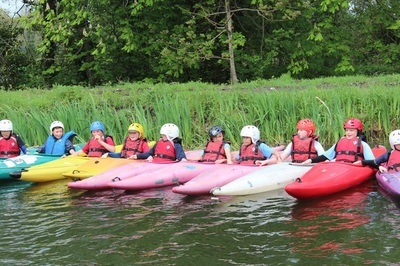 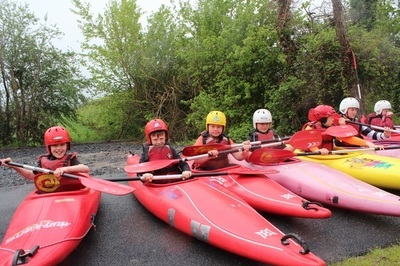 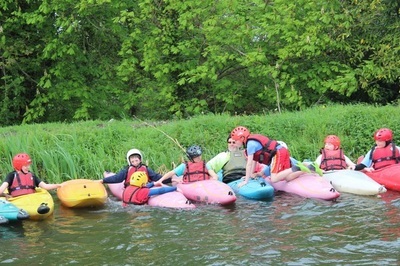 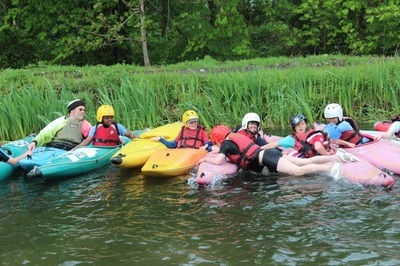 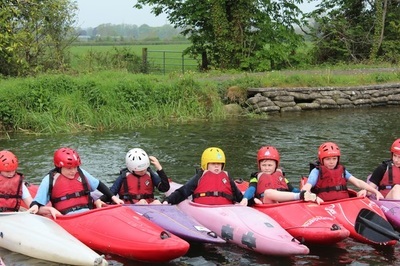 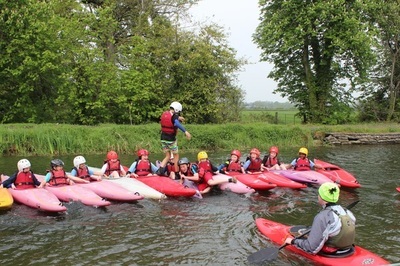 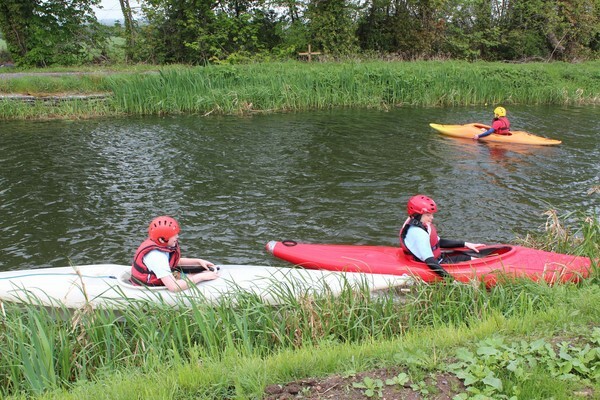 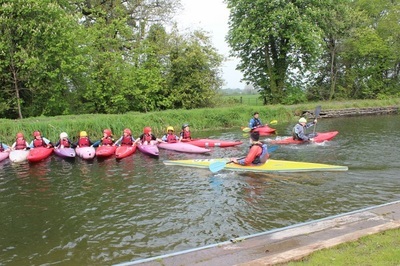 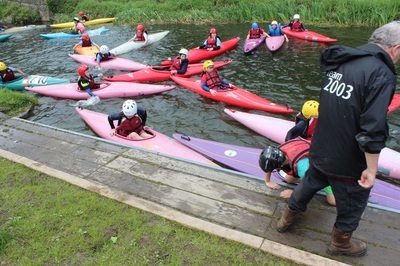 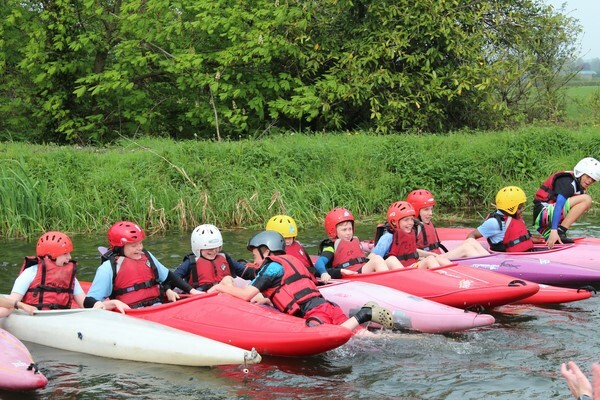 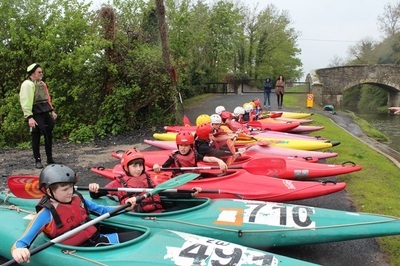 Every year boys who experienced Canoeing during Active Week return to the club for more and from talking to some 5th class boys afterwards this year will be no different. 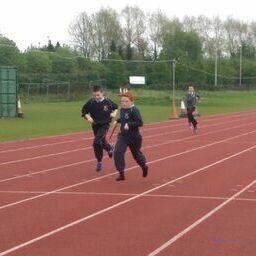 Olympics 2028 Watch Out! 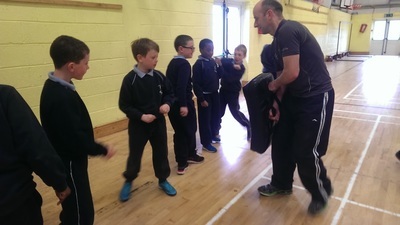 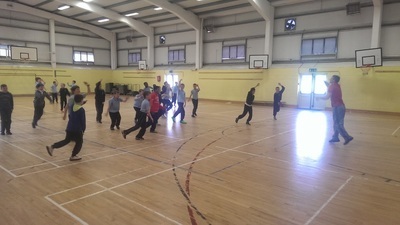 Ed Downey and his team of coaches from Celbridge Kenpo Karate kicked off proceedings on Day 3 of Active Schools Week with an introduction to Kenpo Karate. 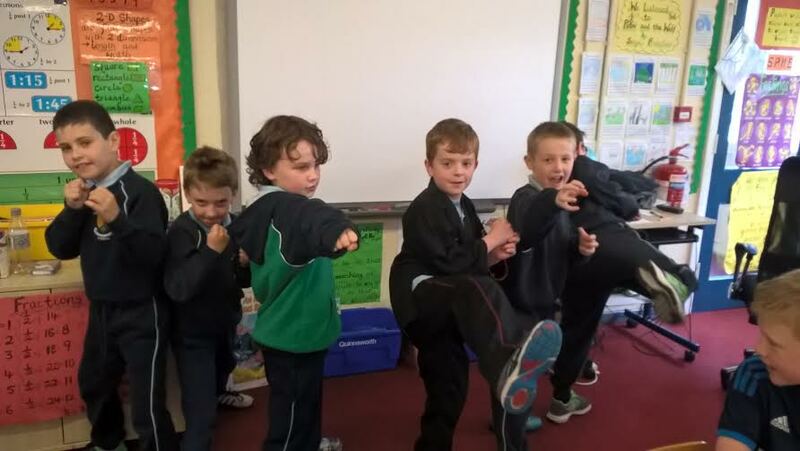 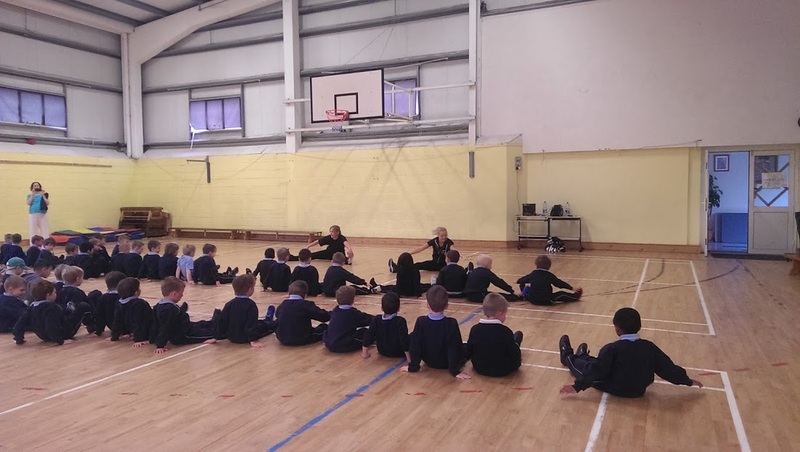 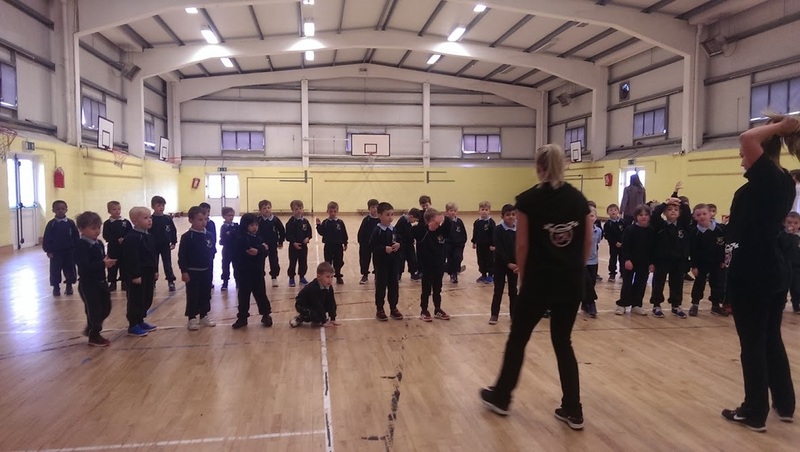 Celbridge has one of the most succesful Kenpo Karate Clubs in the world and Eds visit proved very popular with pupils in Senior Infants and Second Class. Ed has promised a return in a couple of weeks with a group of performers who will put on a special demonstration for the whole school. 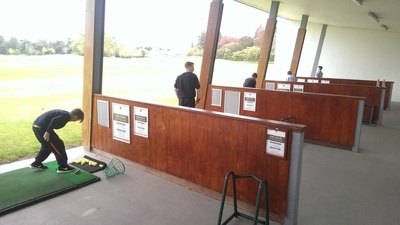 Details of the club can be found here. 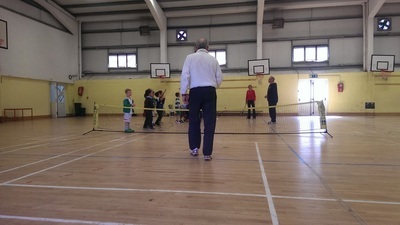 We look forward to working with Ed and his team in the future. 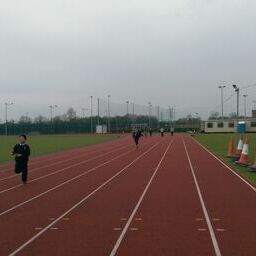 This week we have been doing a running record. 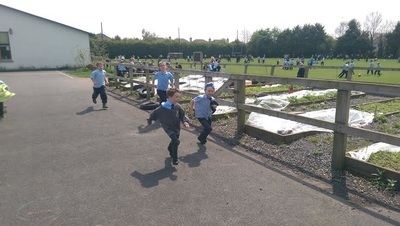 It helps us to get fit and get fresh air. 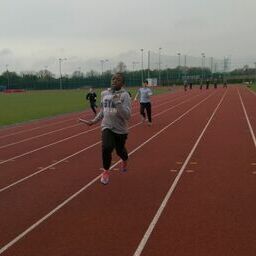 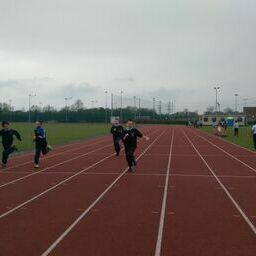 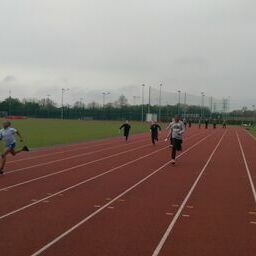 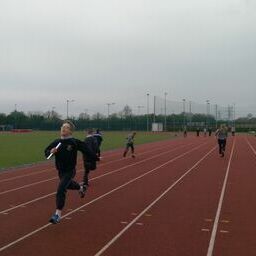 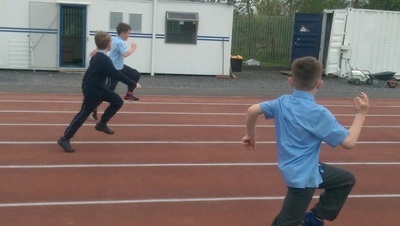 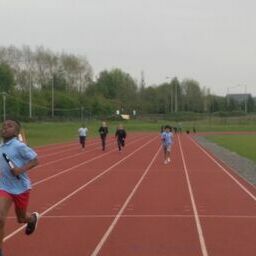 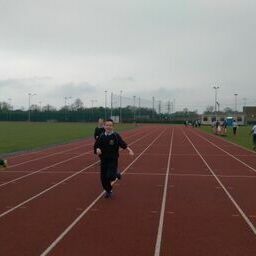 All the classes are really enjoying the running record. 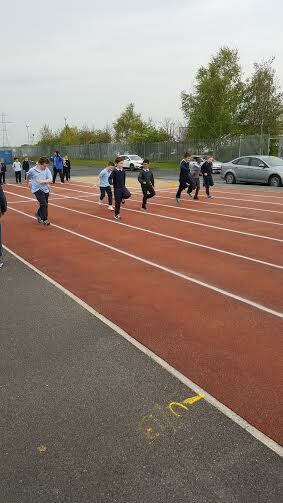 We do a new record of laps every day. At the end of the week we will add up all the laps done from Junior's - 6th Class and we will see how much kilometres we have done. 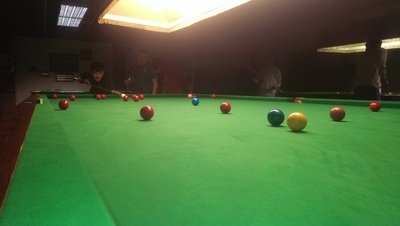 The laps are recorded below. 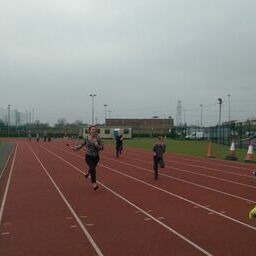 At the end of the week all the classes will get a certificate for taking part in the running record. 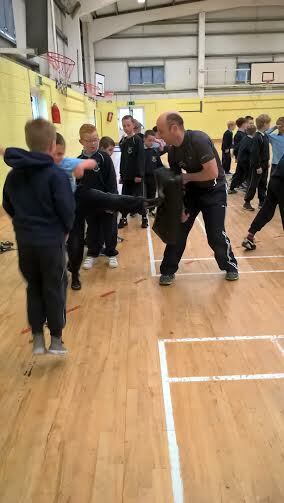 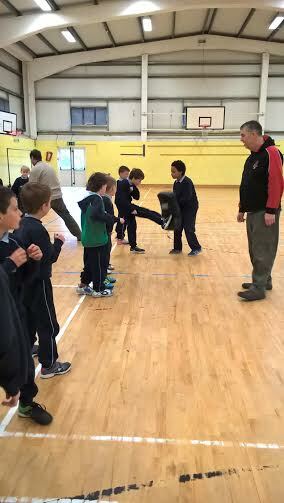 Day 3 of Active Week literally Kicks off with a visit from Ed Downey of Celbridge Kenpo Karate. 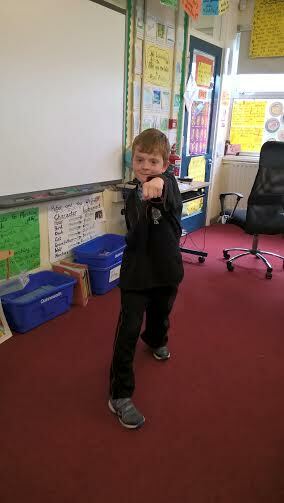 Along with some senior boys in the school he will demonstrate the skills of Kenpo Karate. 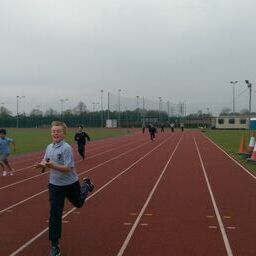 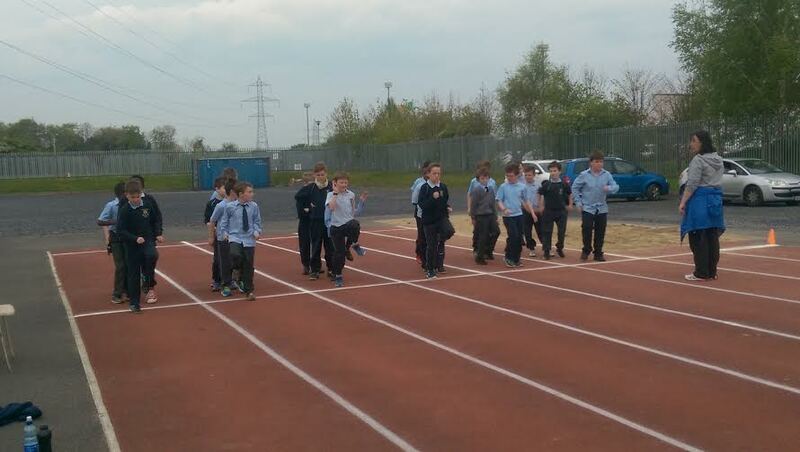 Our Running Record is growing by the day with many classes reaching combined distances of over 300 KM in total. 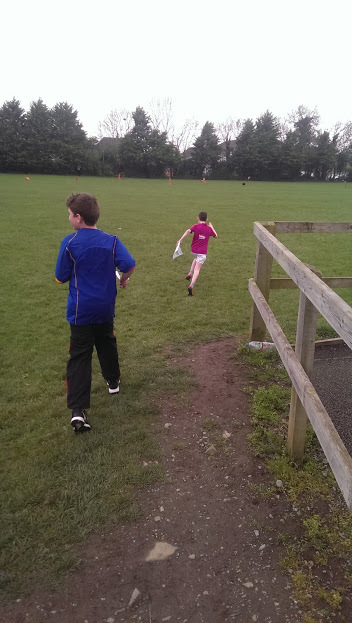 The running record is good practice for our 5K parkrun which takes place on Saturday Morning in Castletown House at 9.30 am. 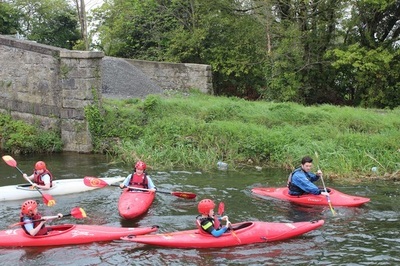 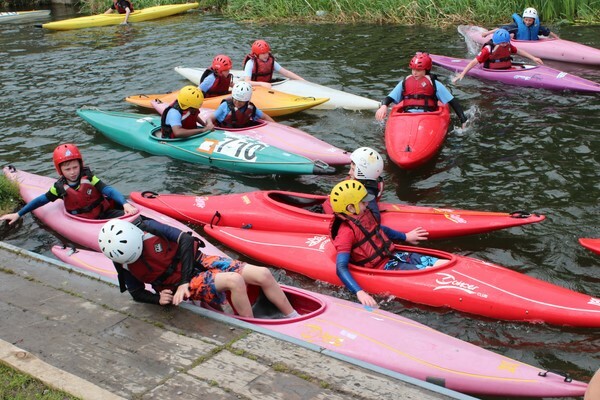 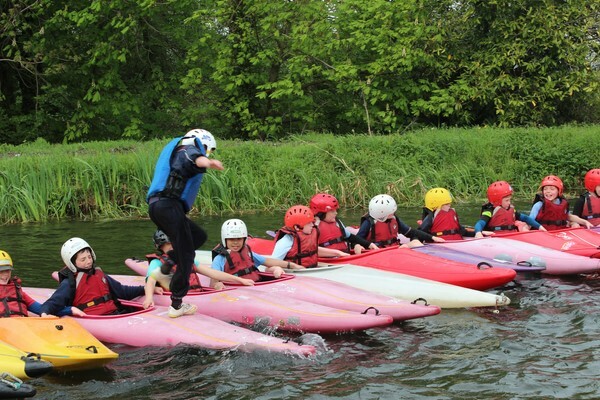 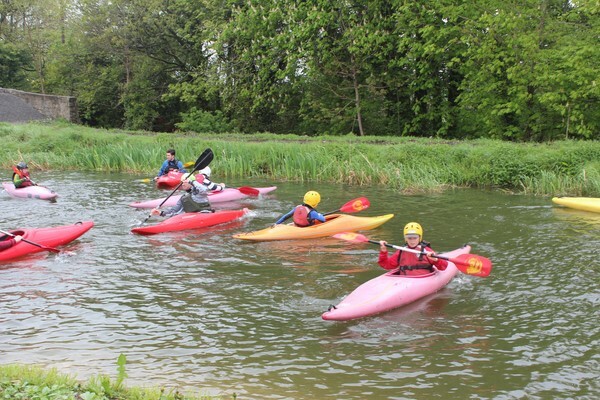 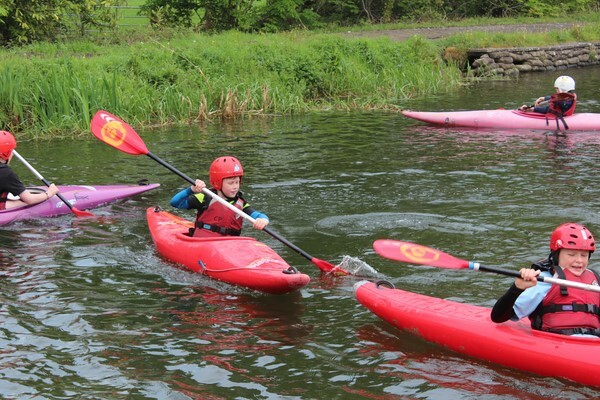 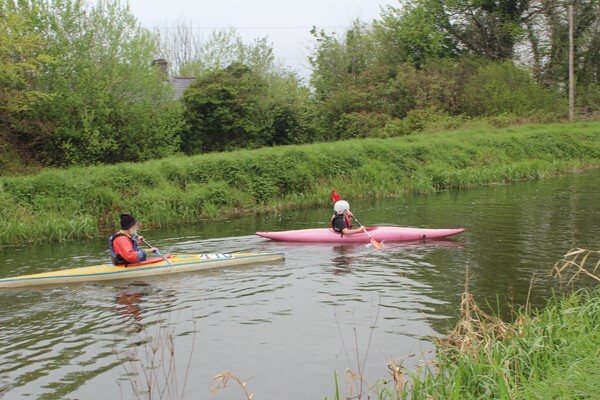 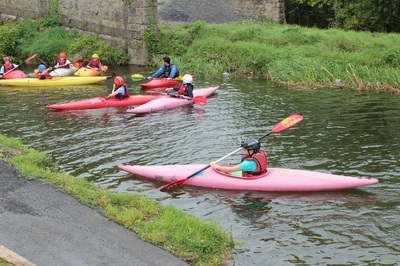 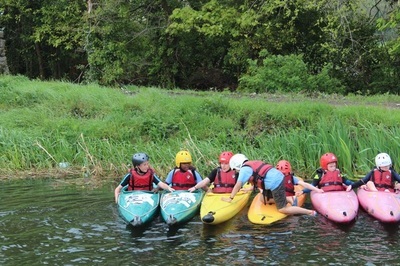 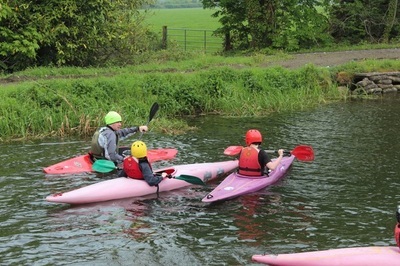 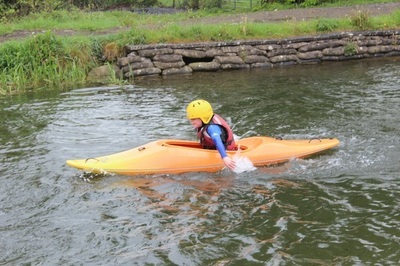 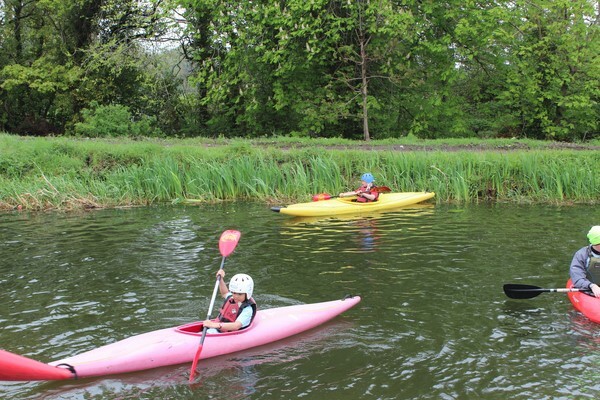 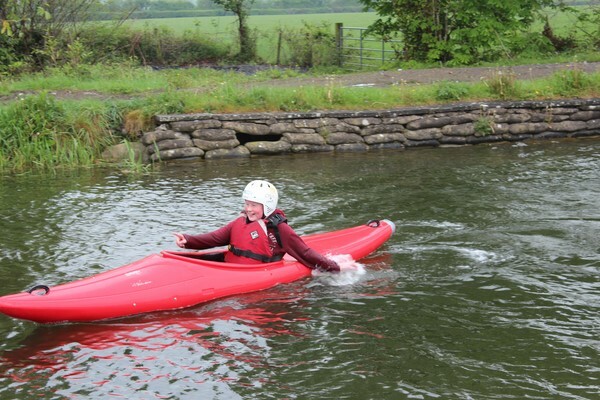 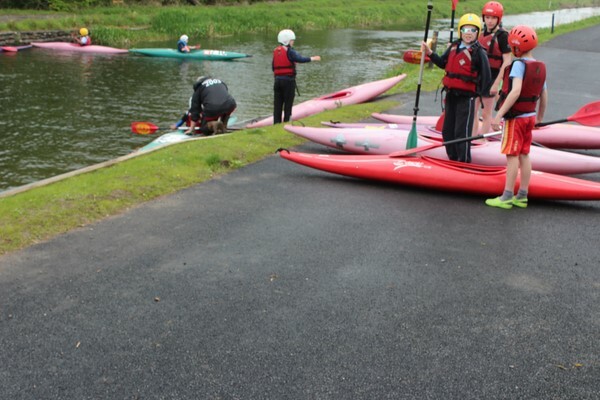 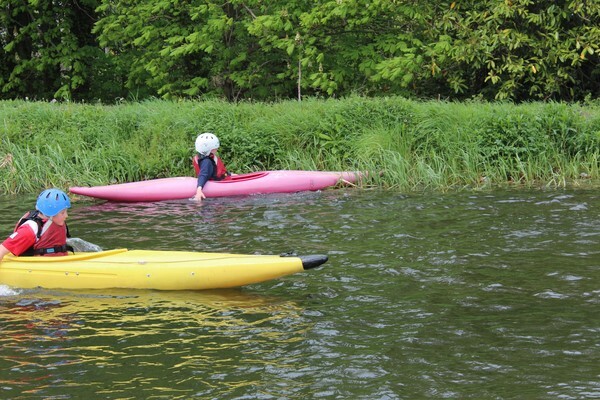 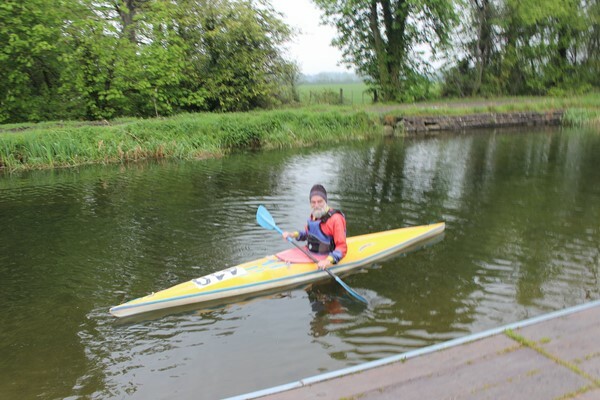 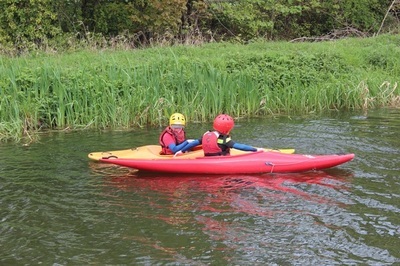 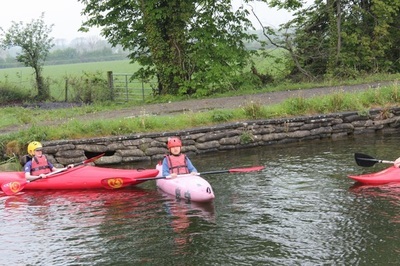 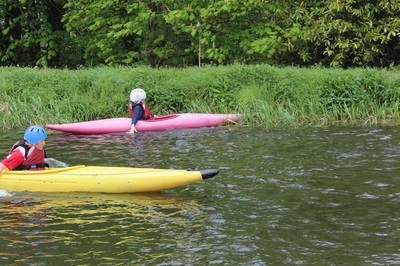 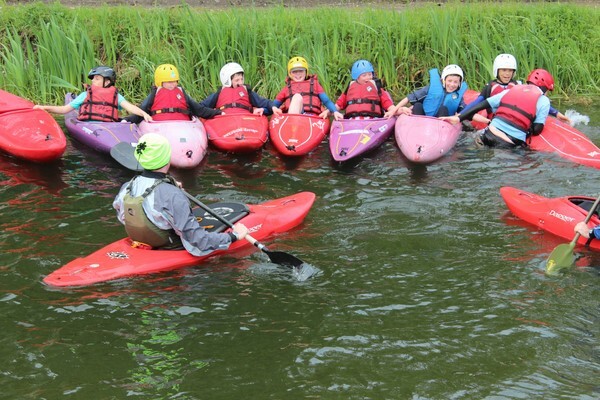 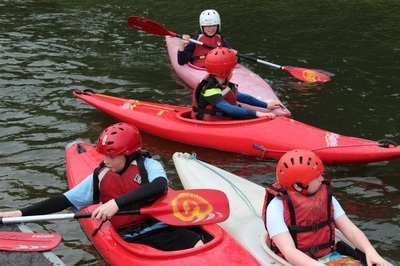 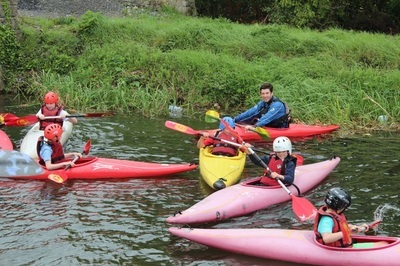 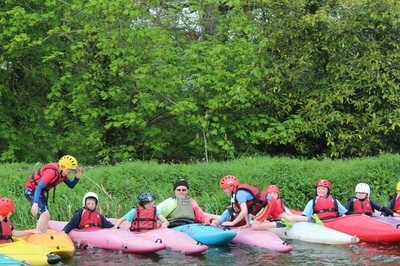 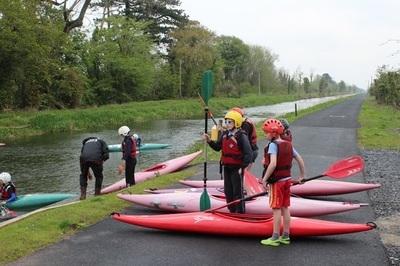 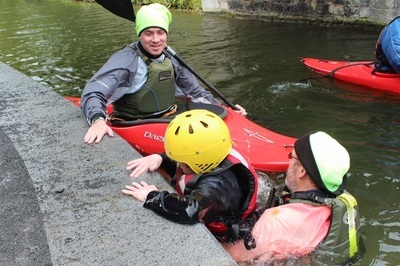 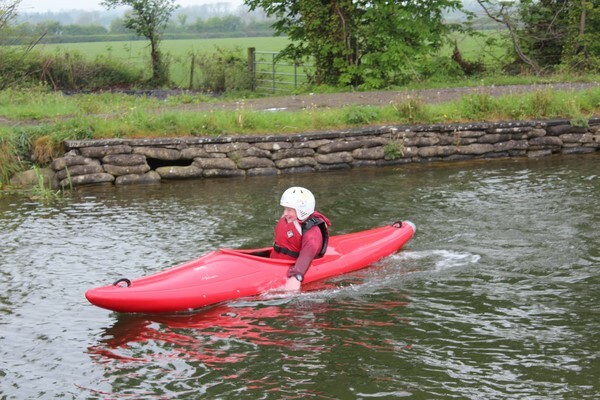 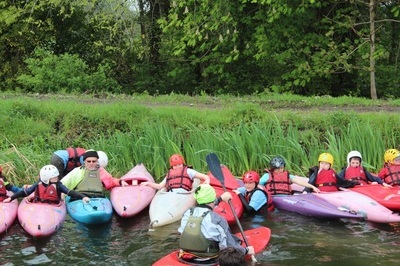 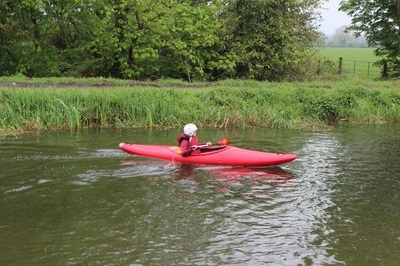 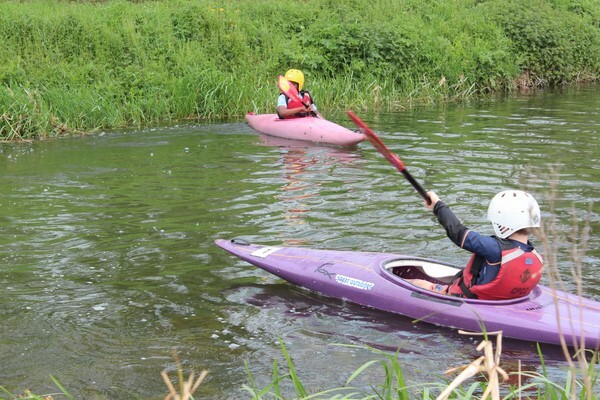 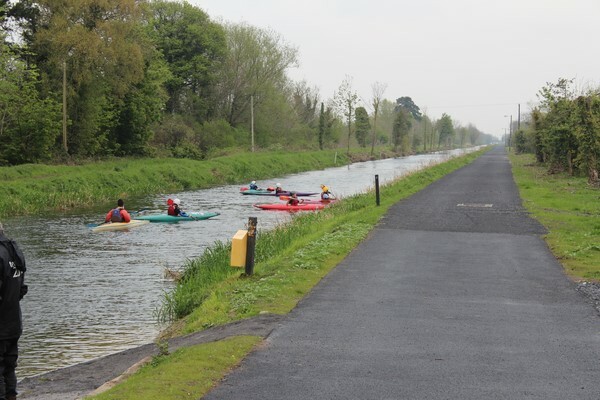 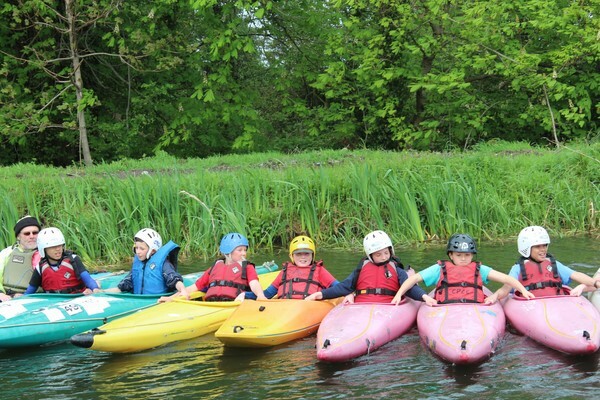 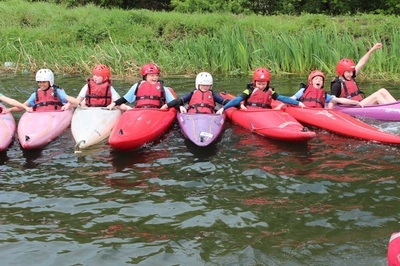 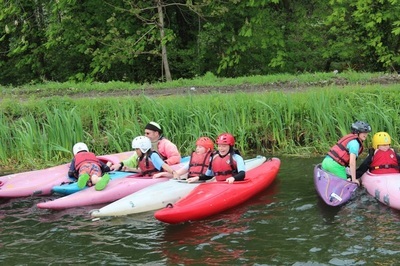 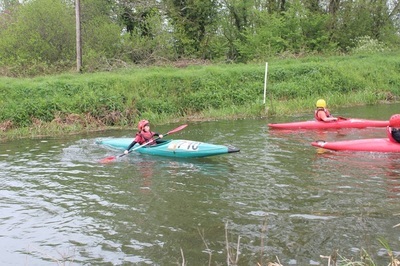 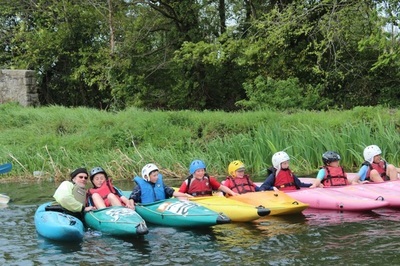 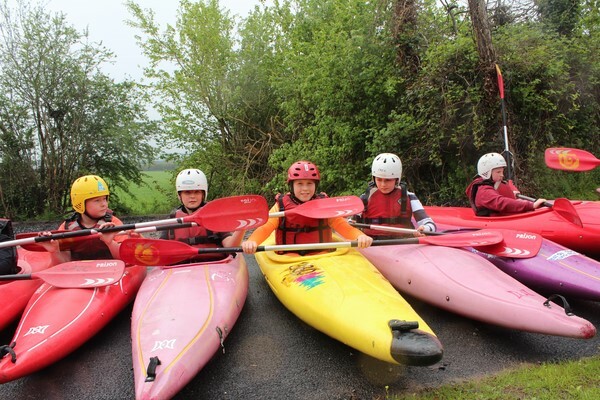 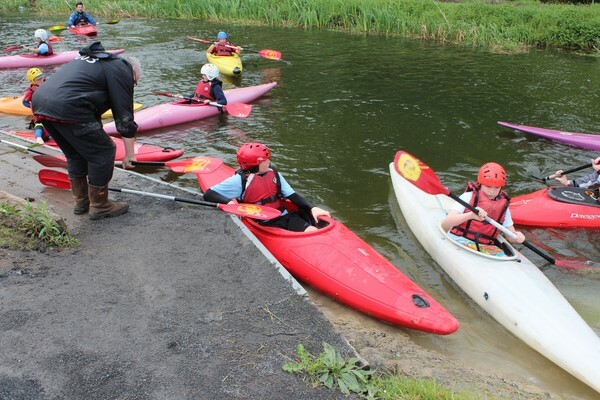 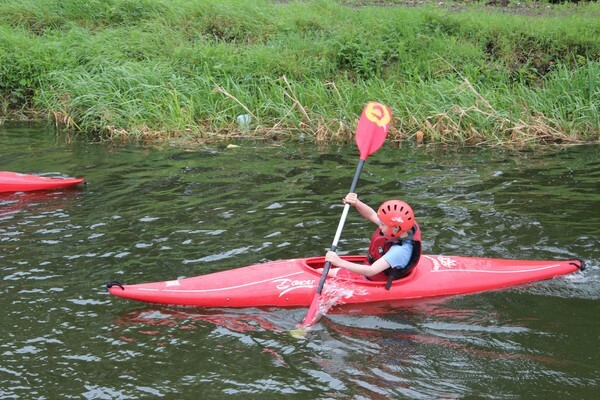 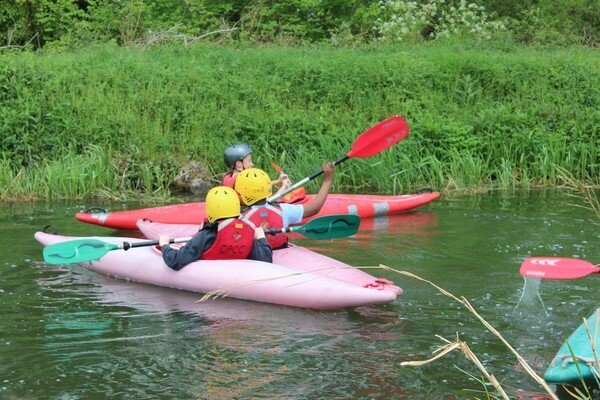 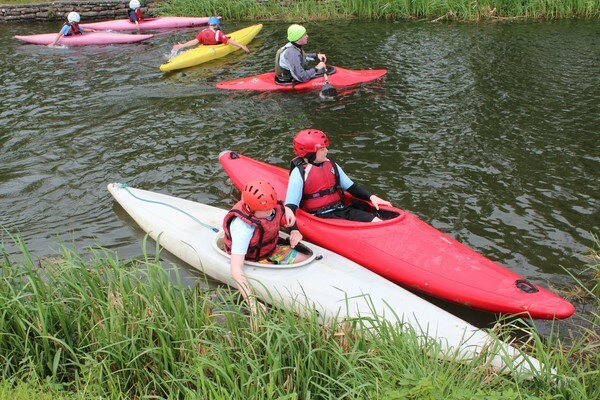 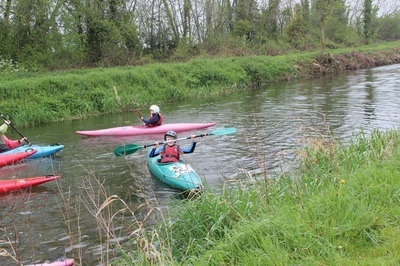 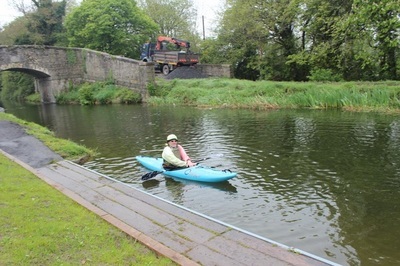 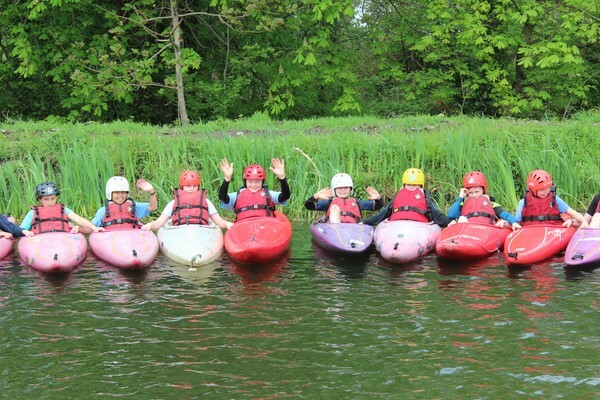 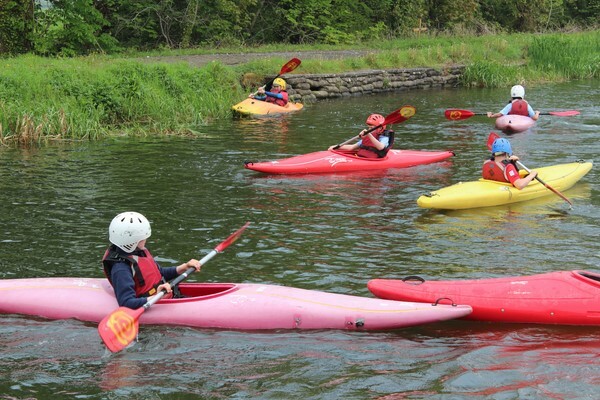 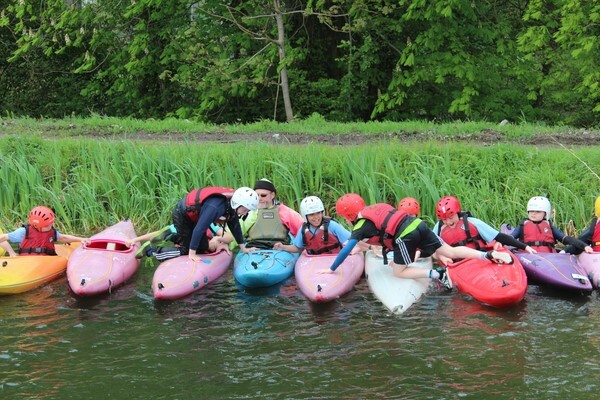 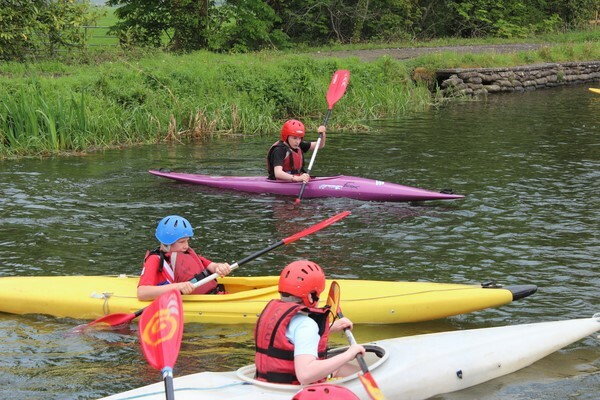 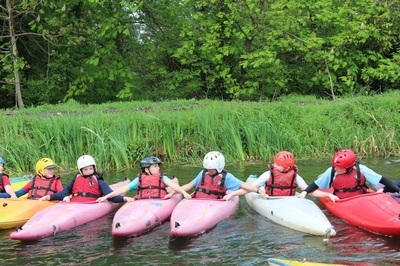 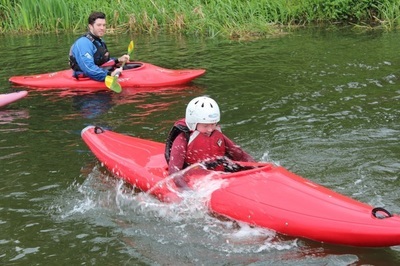 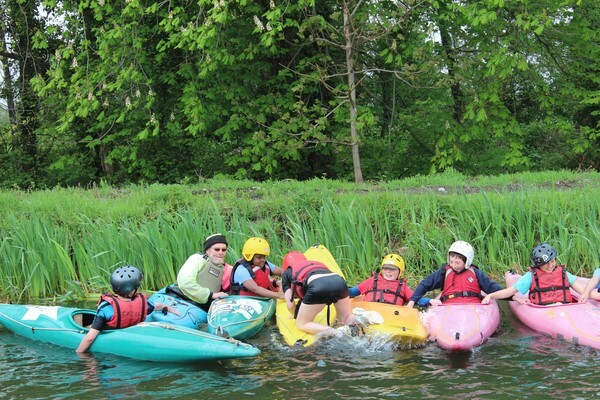 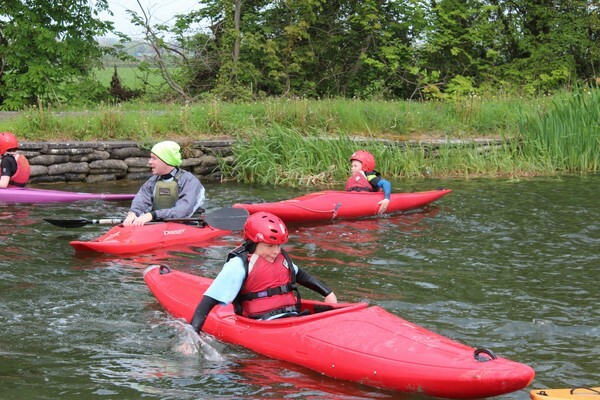 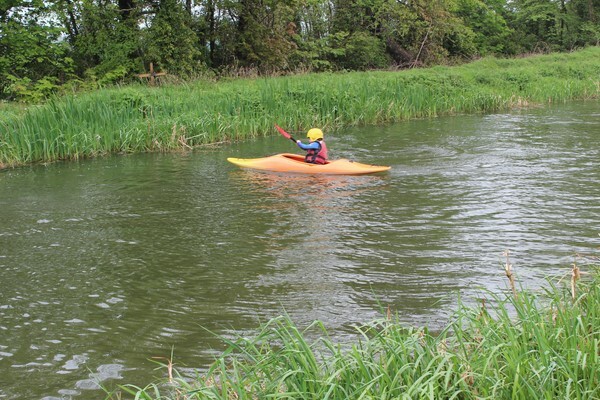 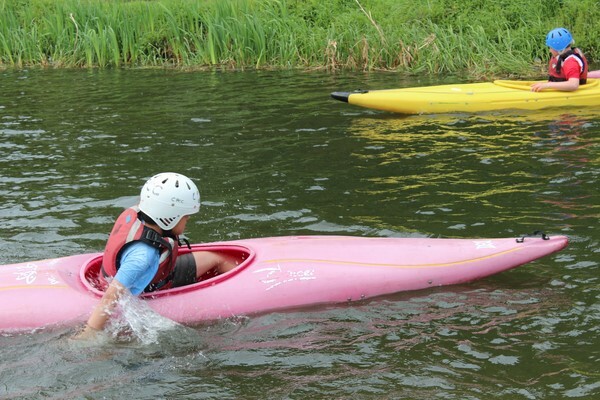 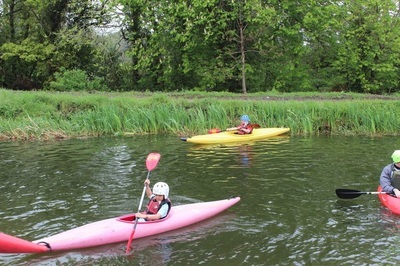 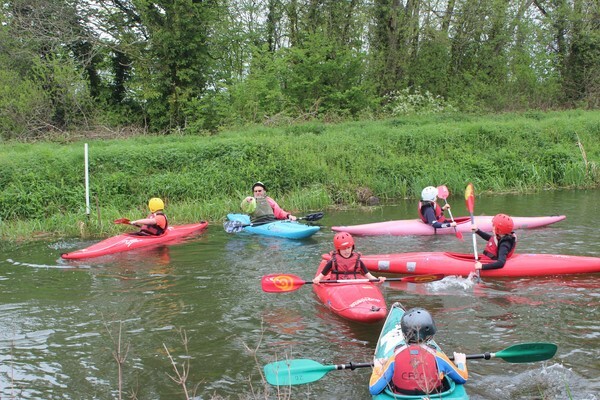 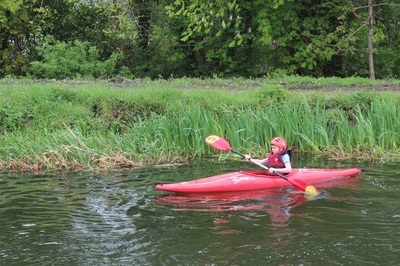 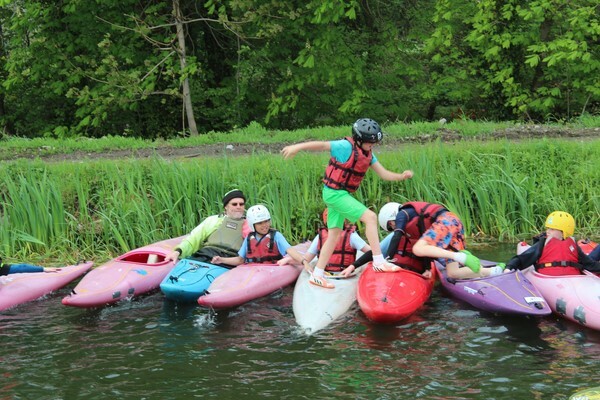 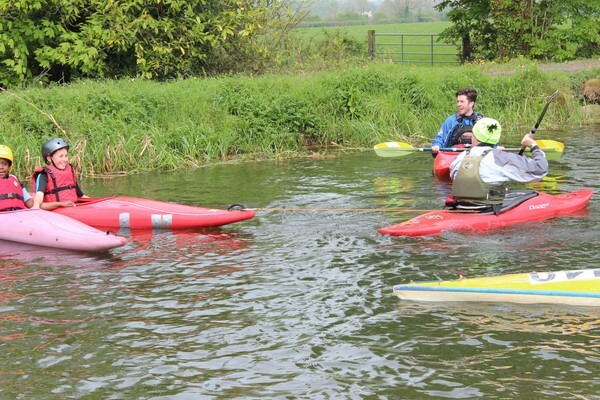 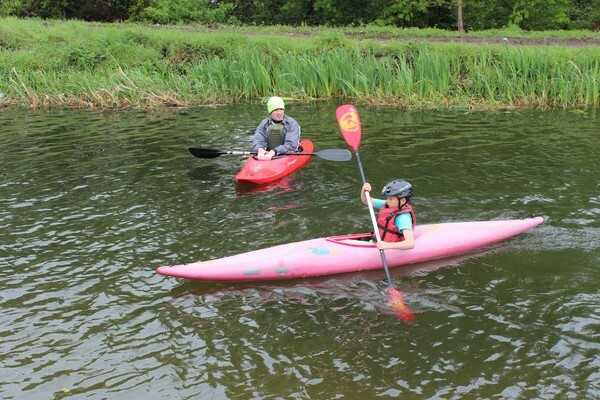 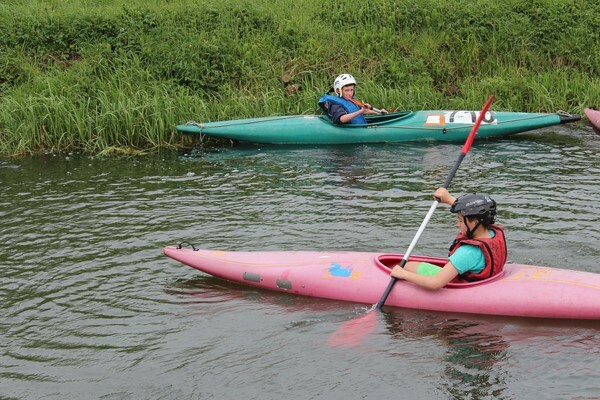 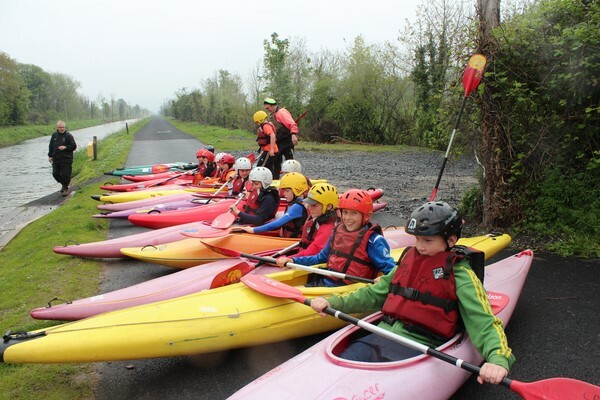 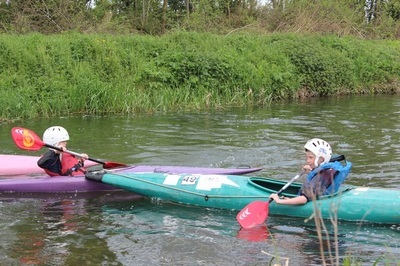 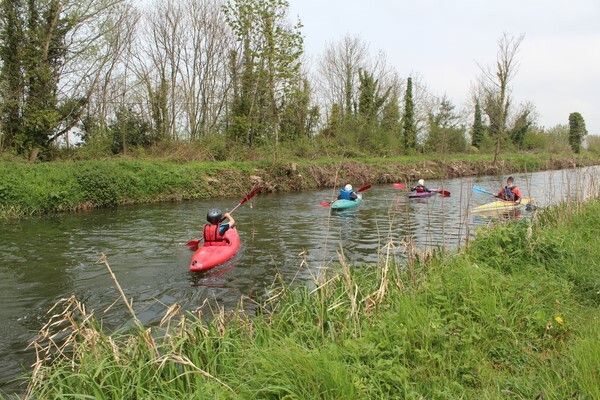 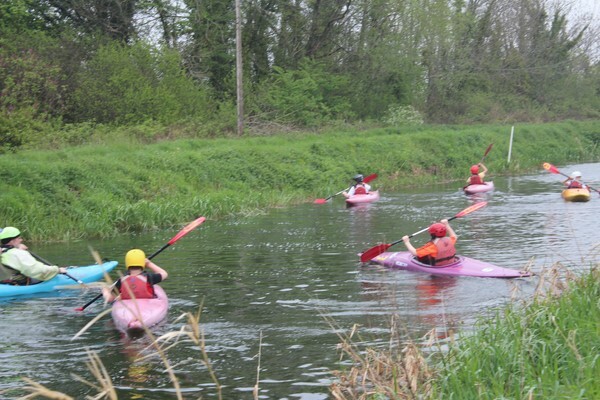 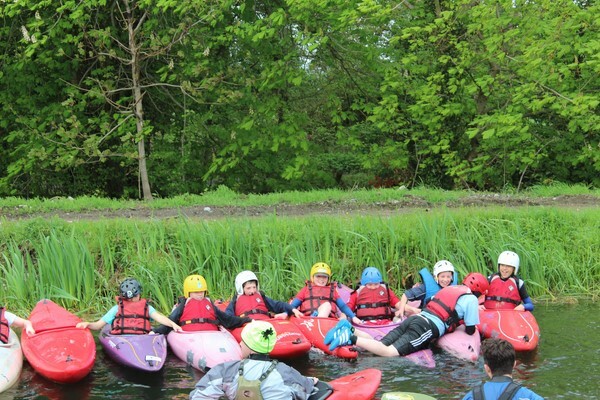 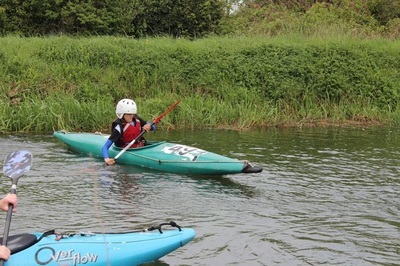 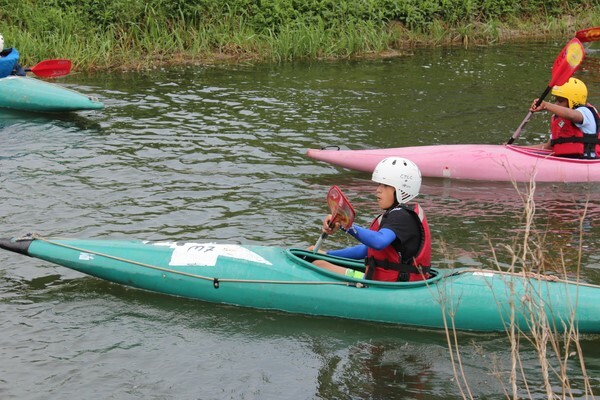 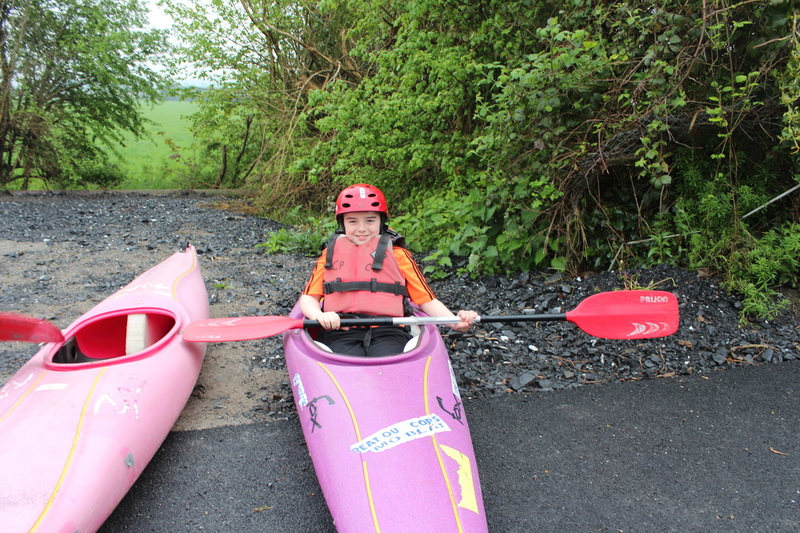 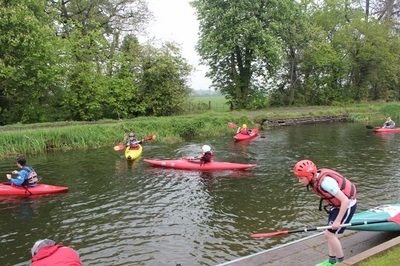 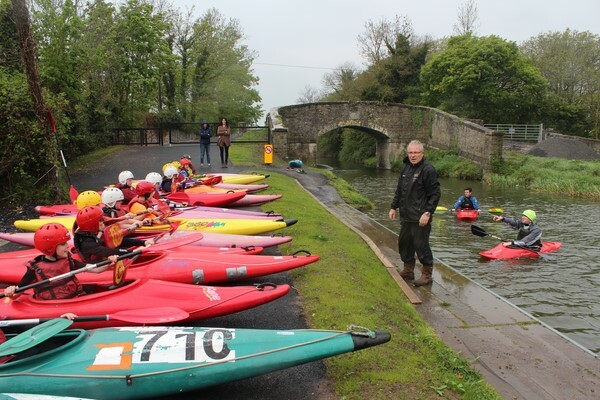 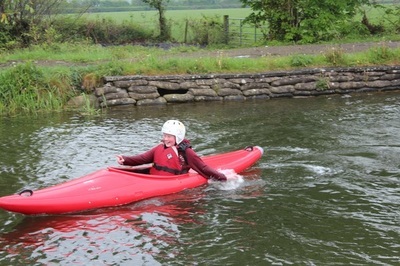 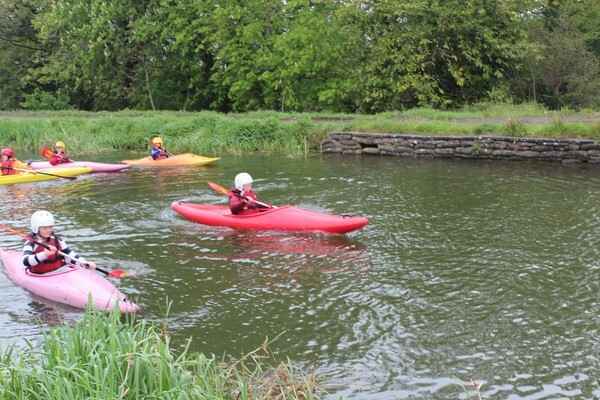 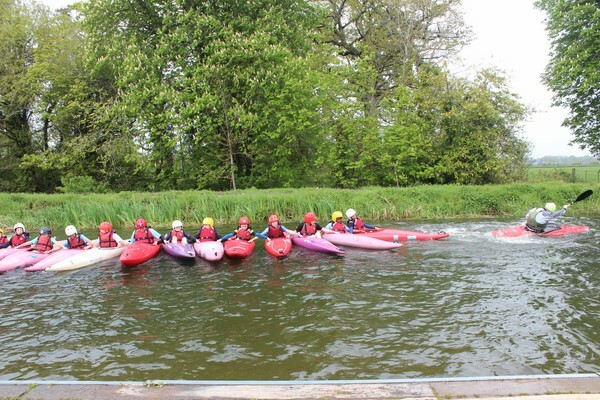 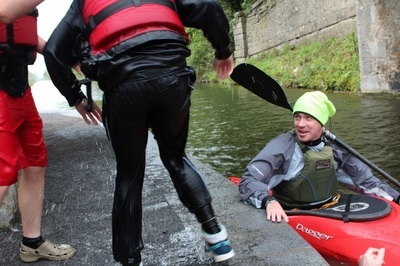 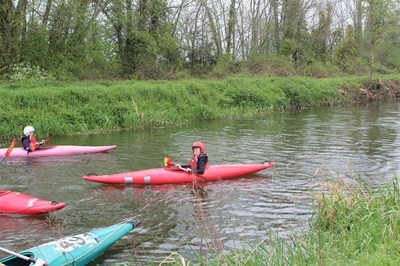 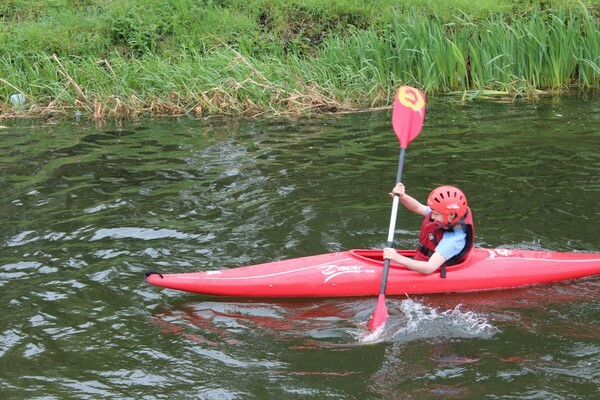 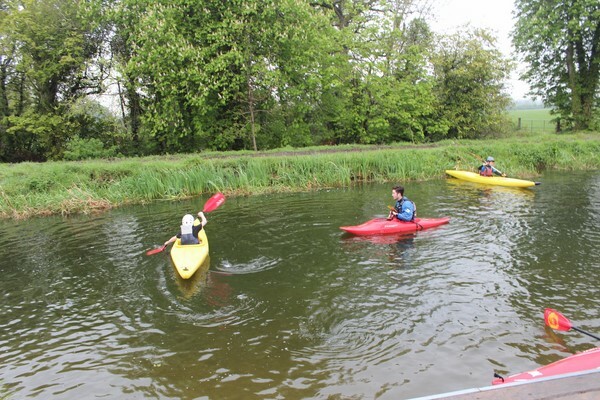 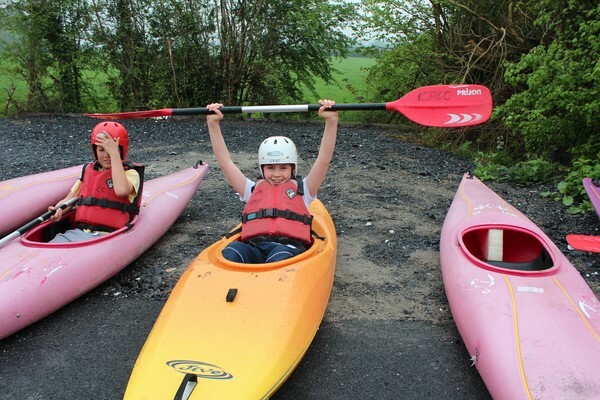 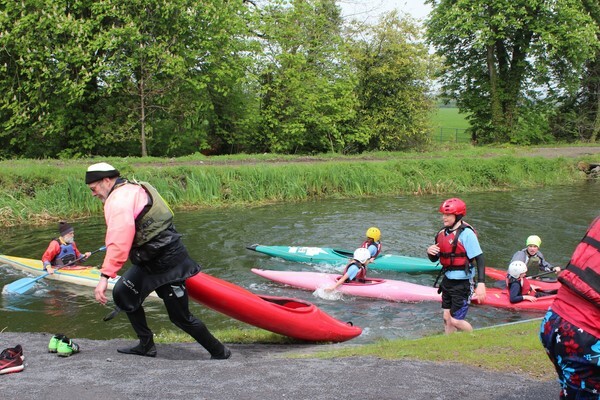 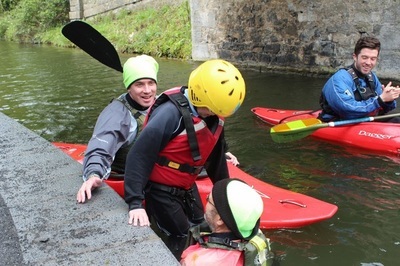 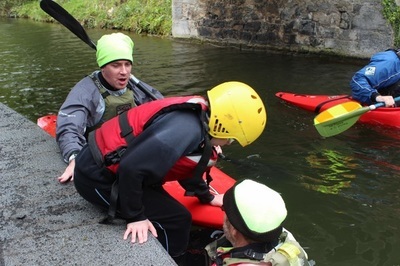 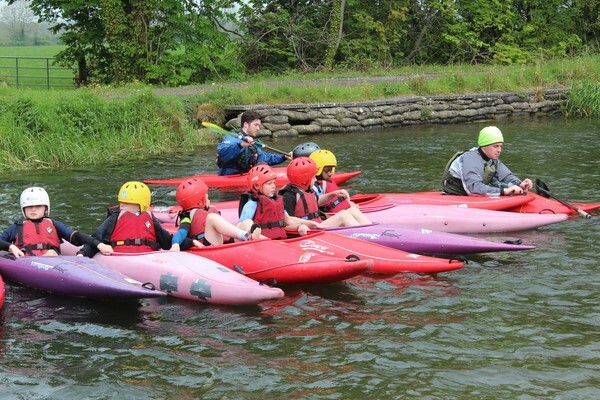 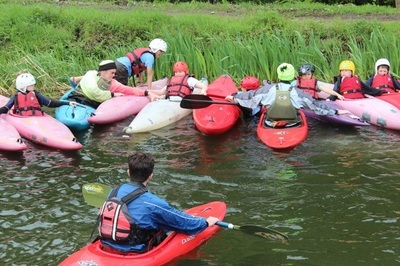 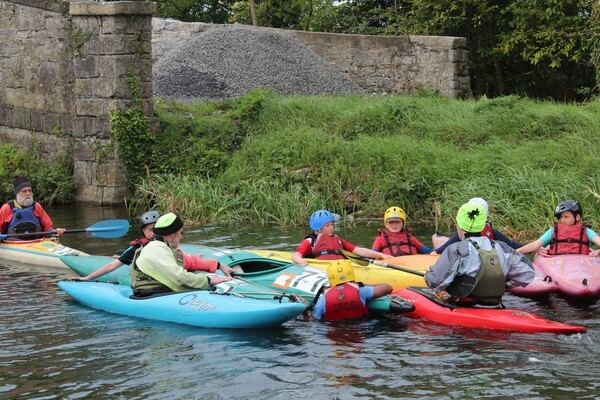 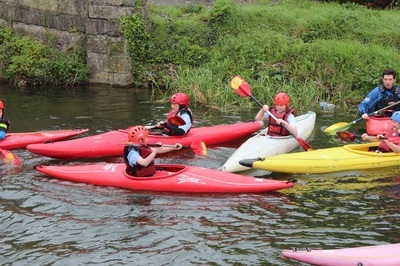 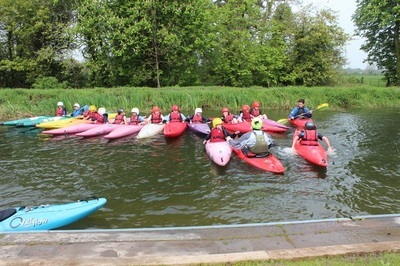 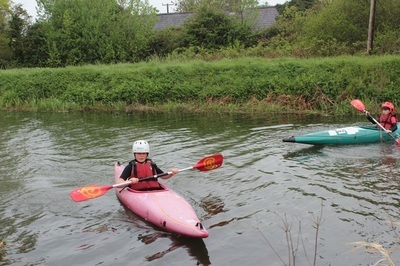 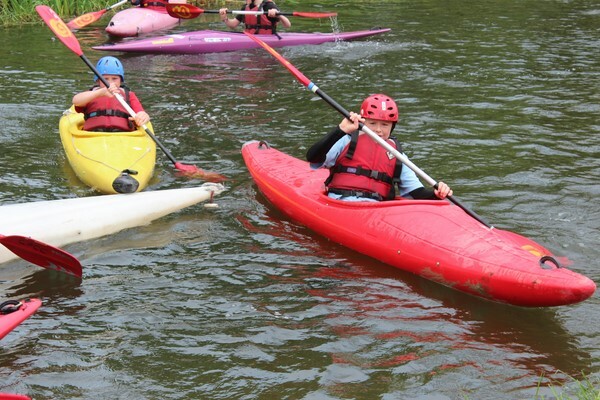 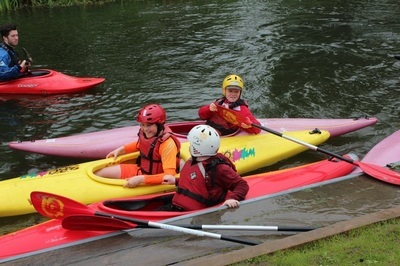 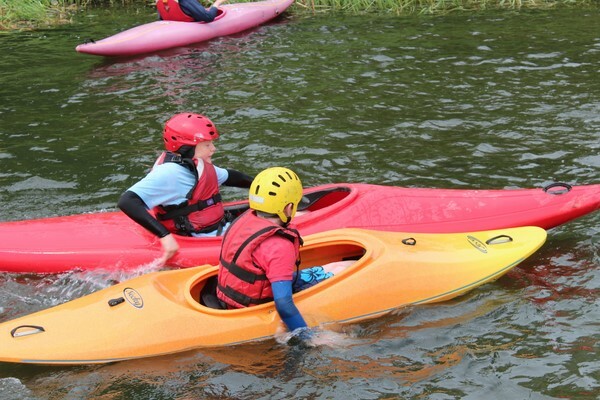 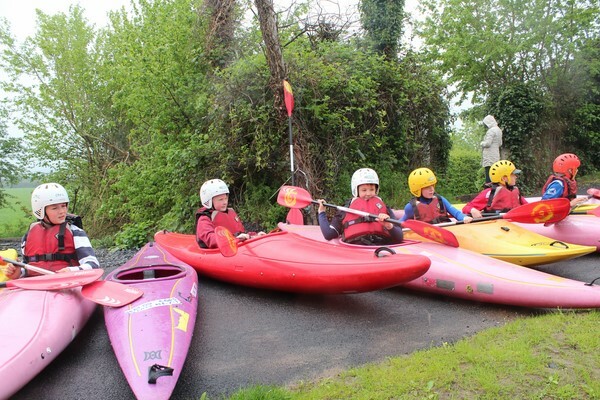 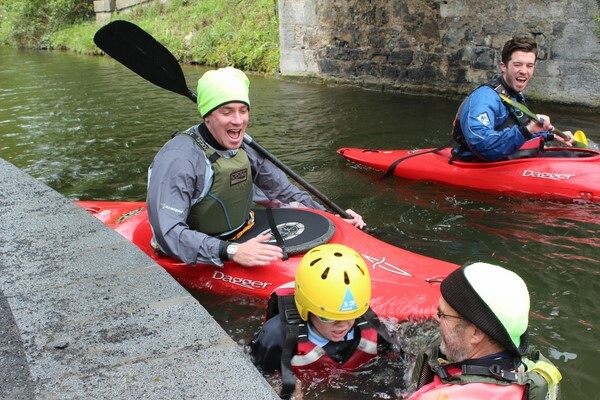 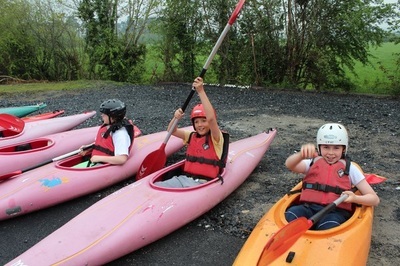 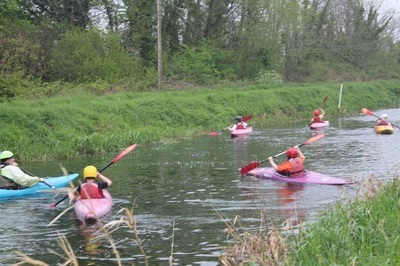 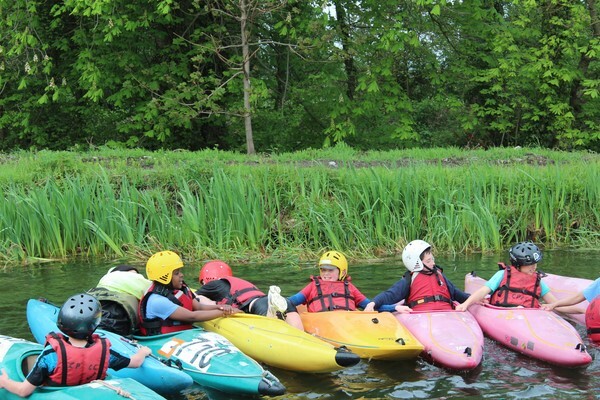 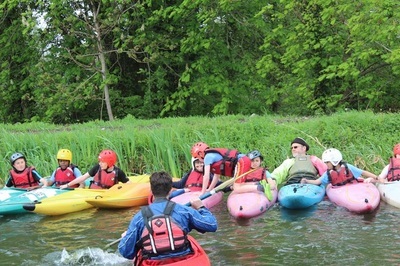 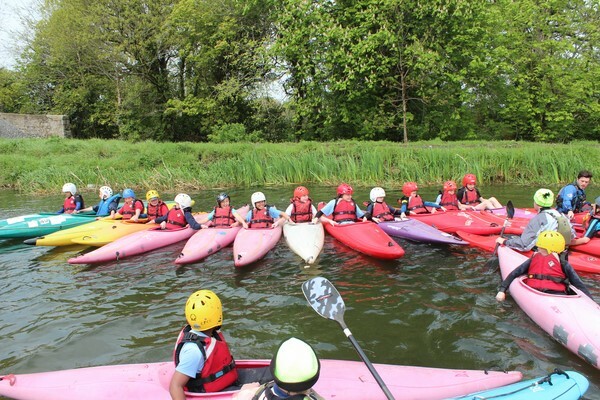 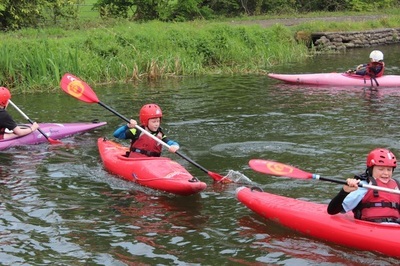 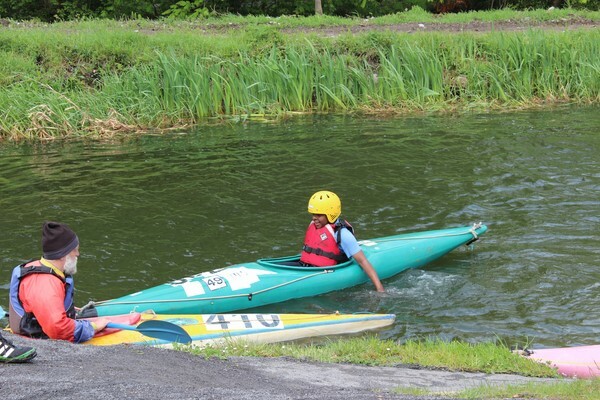 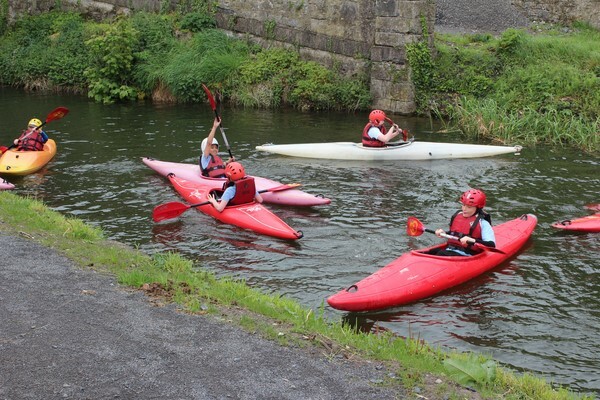 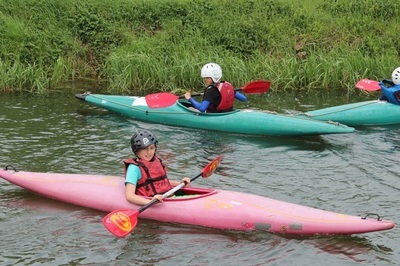 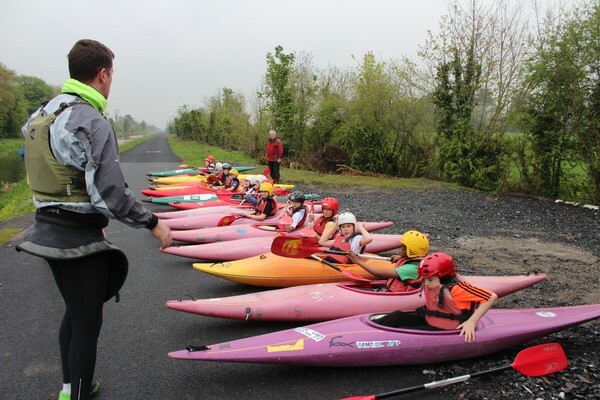 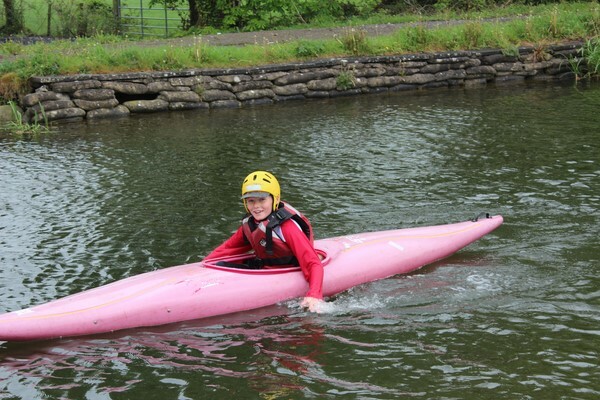 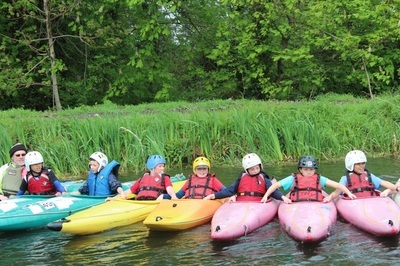 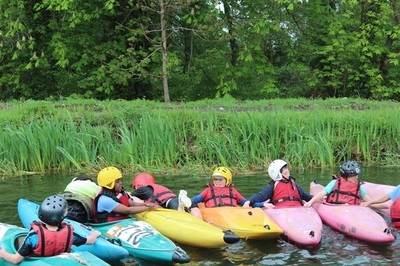 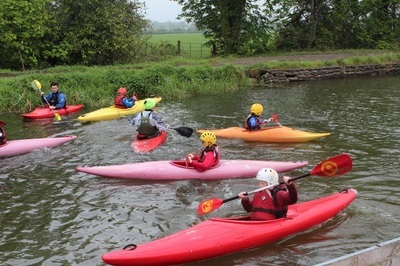 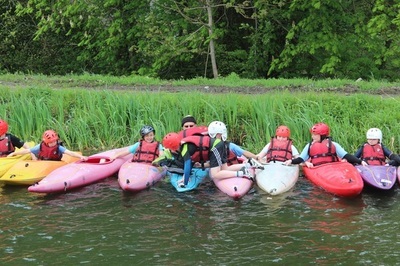 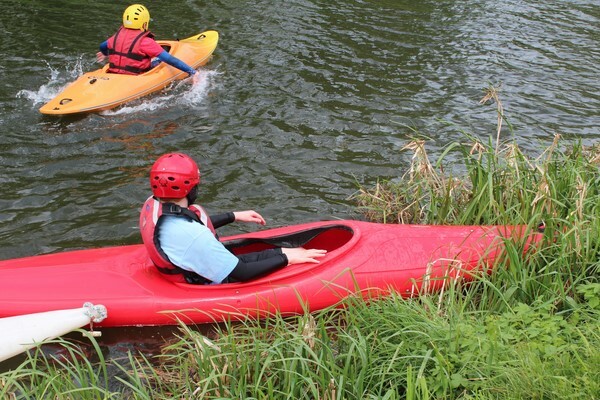 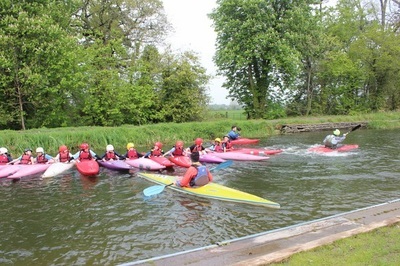 ​The highlight for many is the annual trip to Celbridge Paddlers Canoe Club on the Grand Canal. There 45 boys from 5th class will be introduced to canoeing with coaches from the club many who have taken time off from their work to be there for the boys. 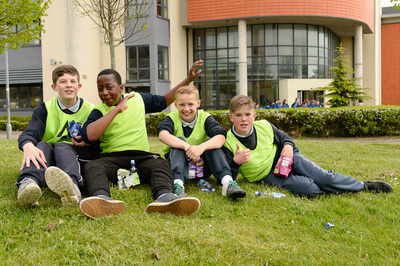 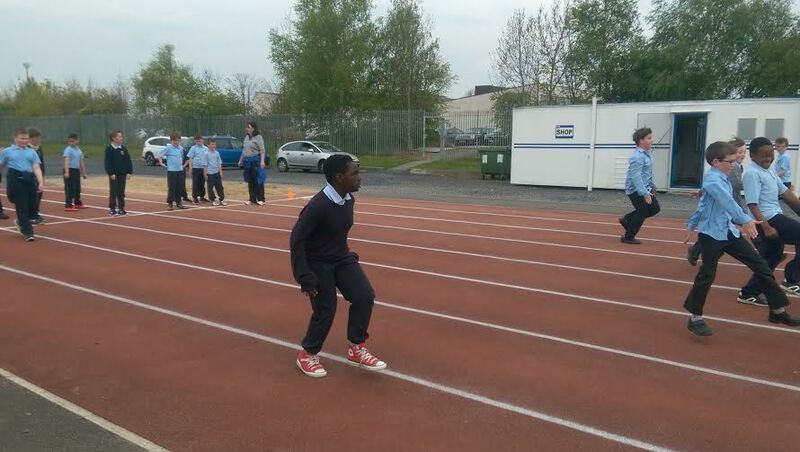 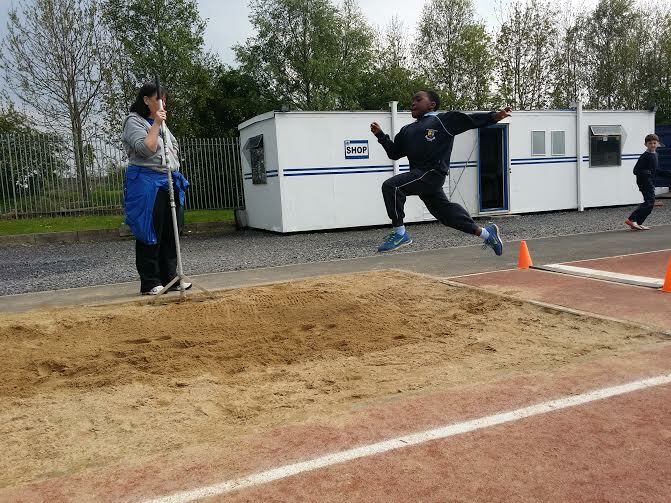 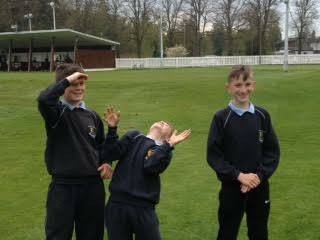 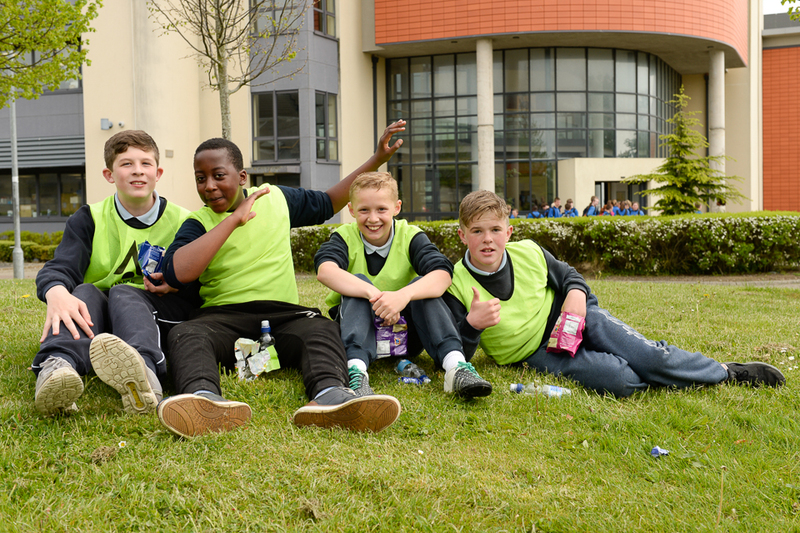 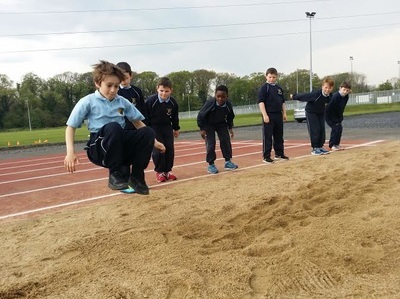 5th class boys will attend Le Chéile AC in Leixlip for Athletics coaching. 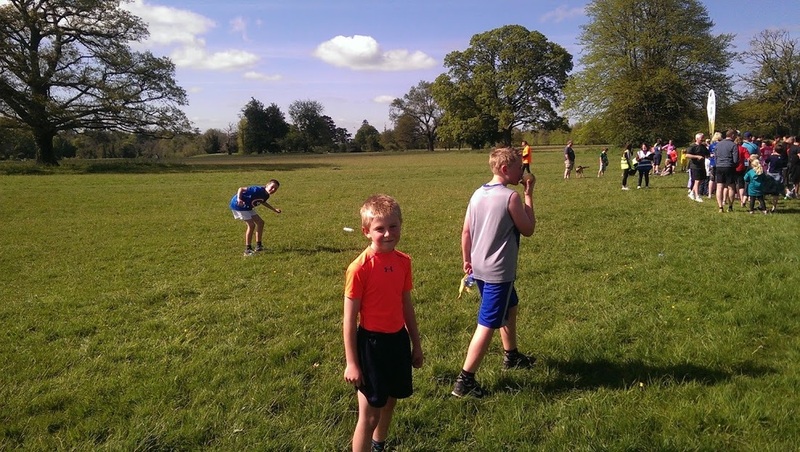 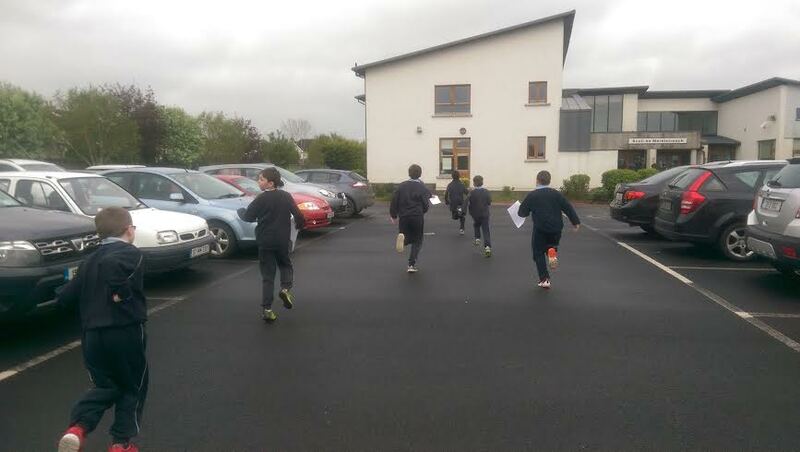 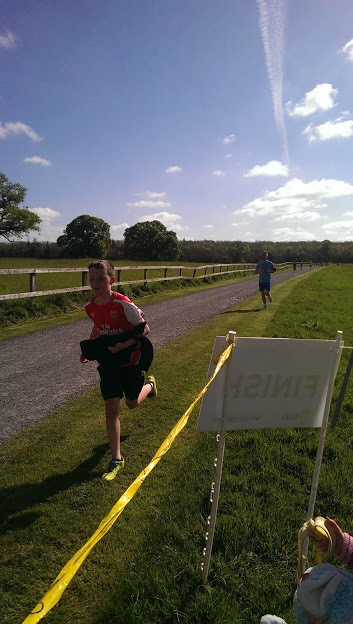 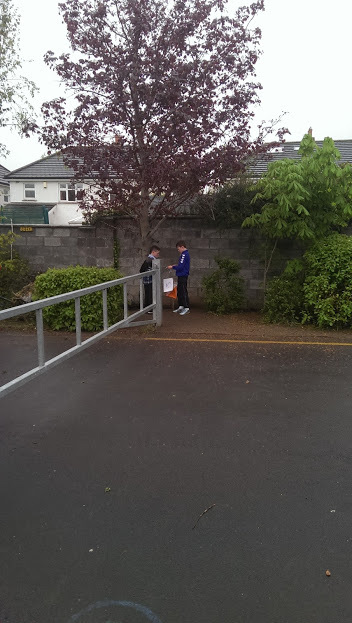 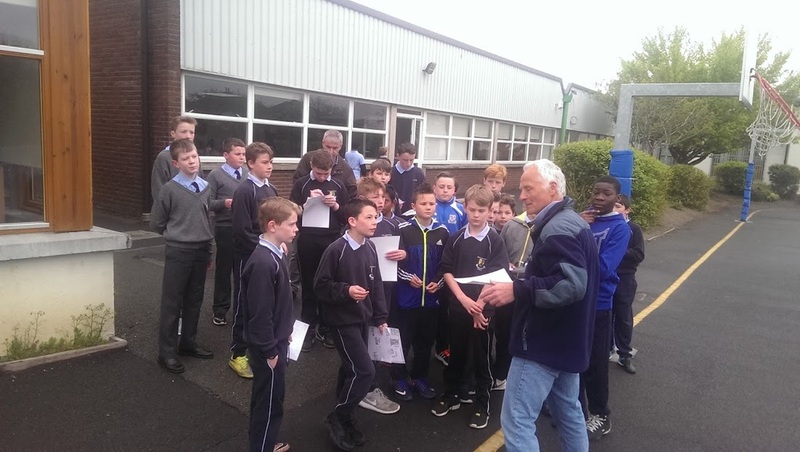 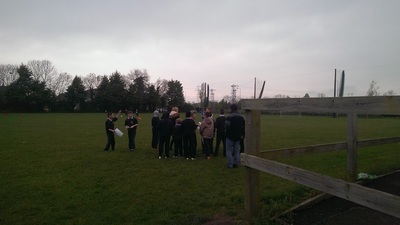 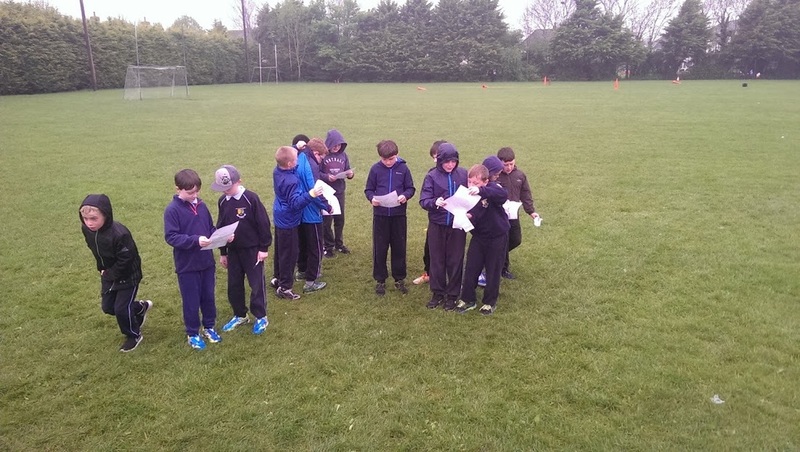 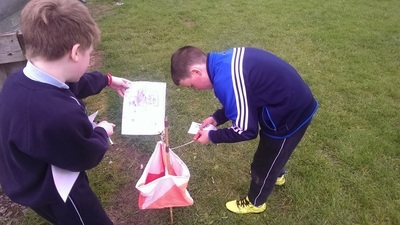 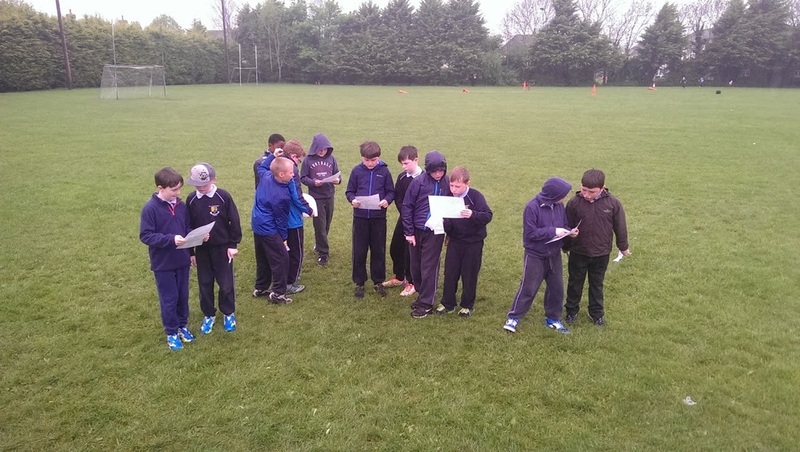 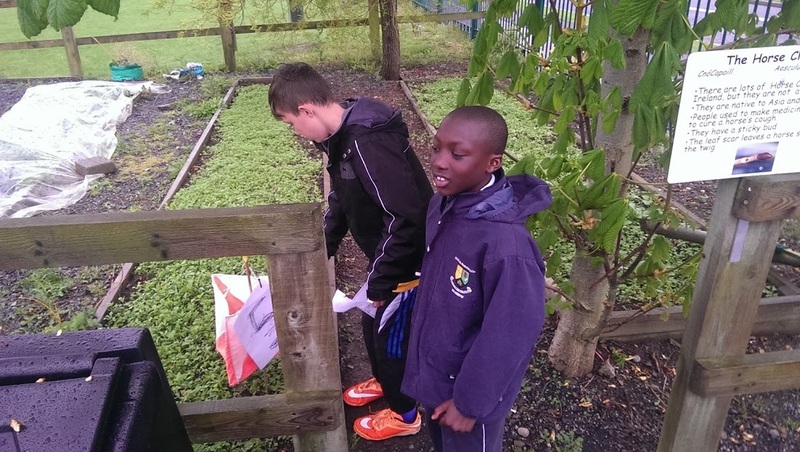 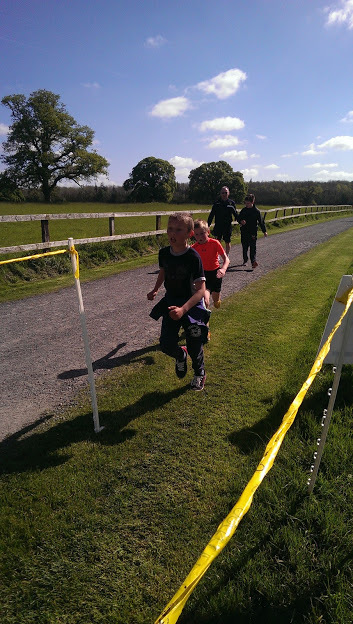 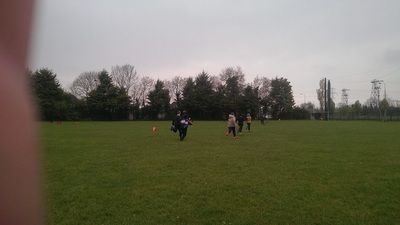 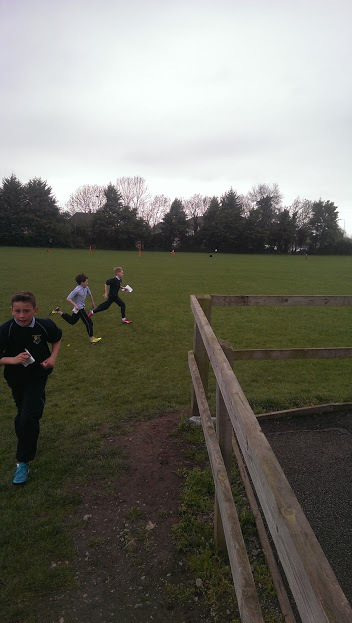 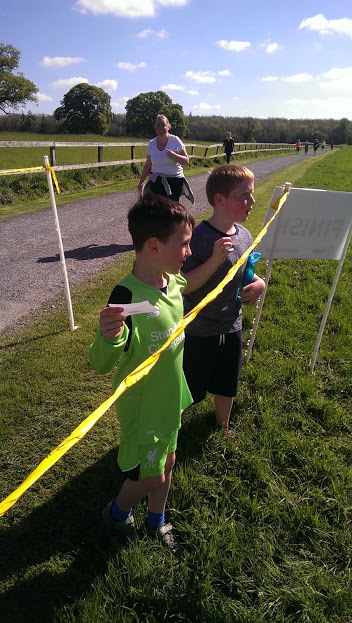 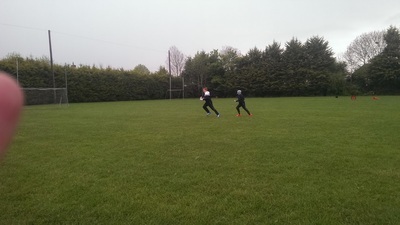 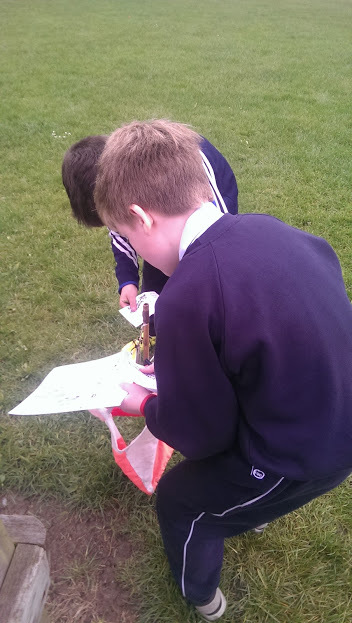 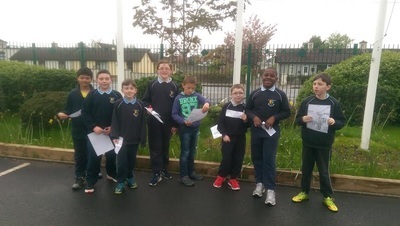 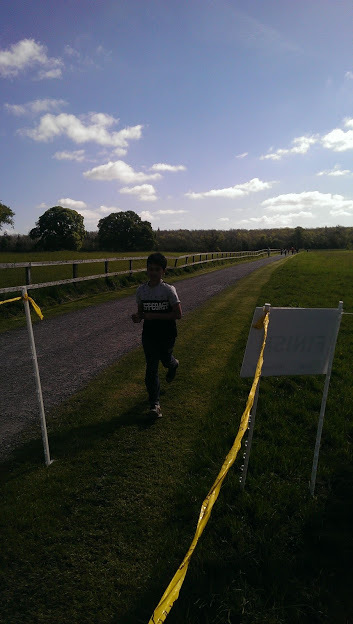 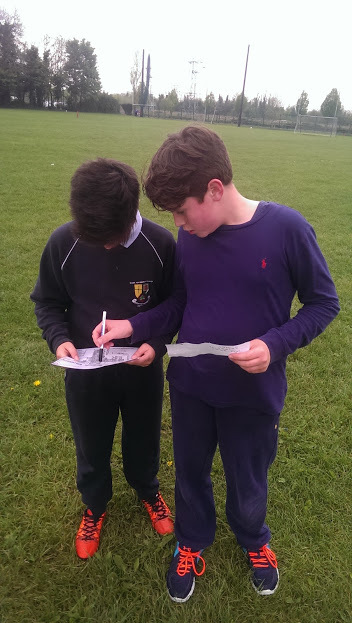 Orienteering which started on Tuesday continues again for 2nd, 3rd and 4th classes while Albert from The Performance Clinic in Celbridge will put 4th class boys through their paces with a half our workout. Finally the day will conclude with the Buddy Bench Dance. 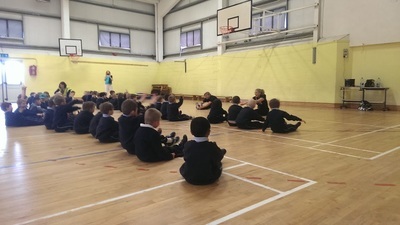 The Buddy Bench is a new initiative being brought in to the school and it will be launched with a special dance which will be taught to all boys in the hall at 1.00pm. To top it all off many classes have Active Homework for the week thats in it! 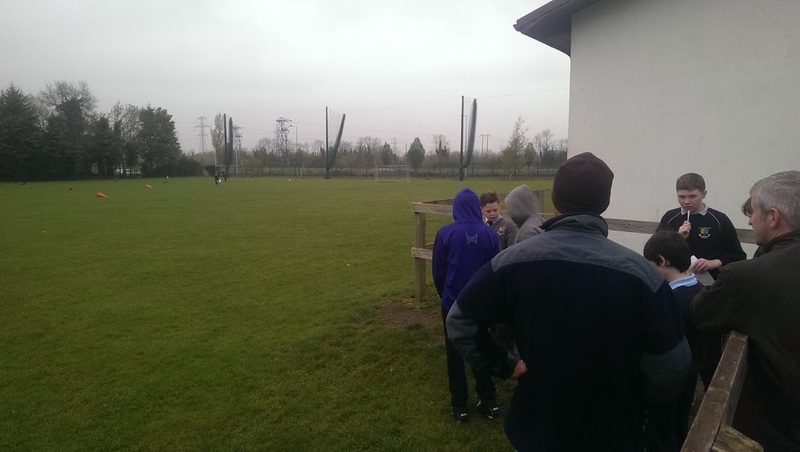 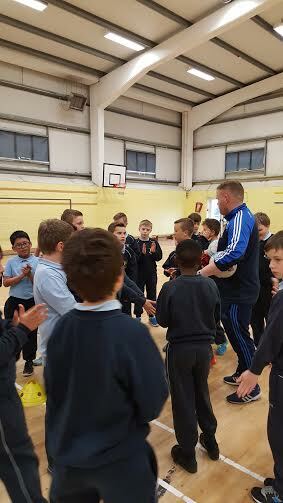 Coaches Gavin and Matthew Kinsella proved to be very popular with the boys in 3rd and 4th class today when they arrived for some football coaching. 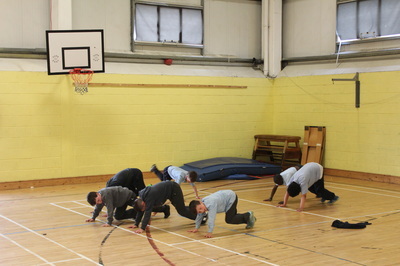 The coaching session began with some fun warm-up activities which will definitely be used again by teachers. 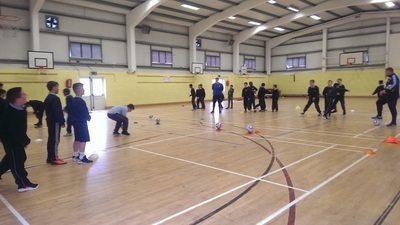 They introduced some skills to the boys and finished with a game. 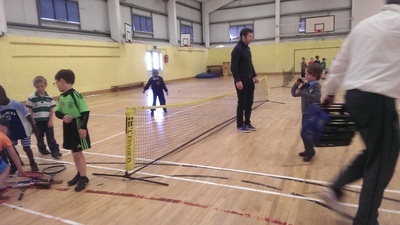 This is the first of many visits from Gavin as today we arranged a longer term arrangement which will see Gavin provide blocks of coaching throughout the year to various classes beginning with some infant classes between now and the summer holidays. 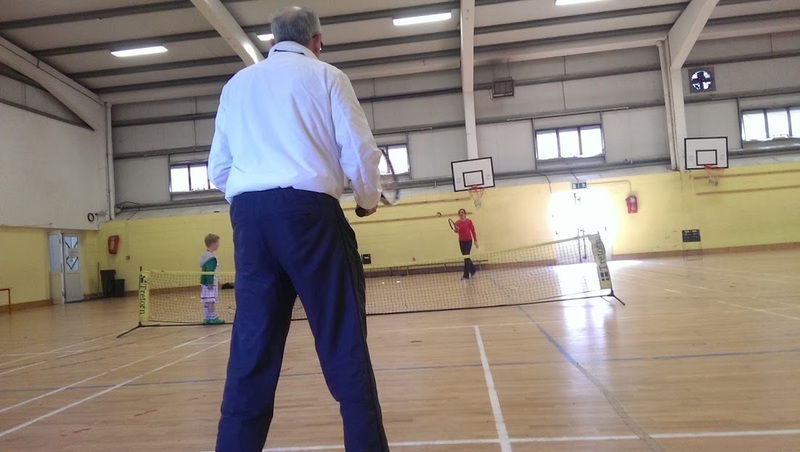 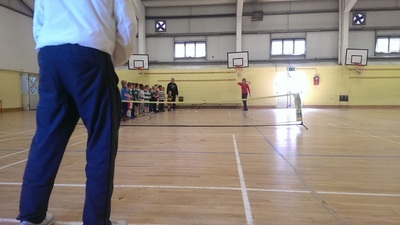 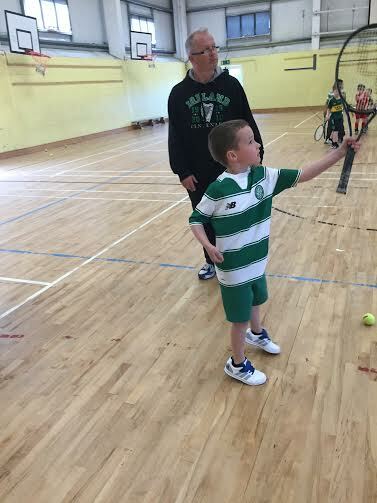 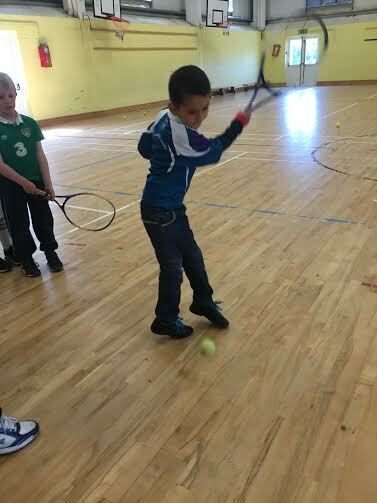 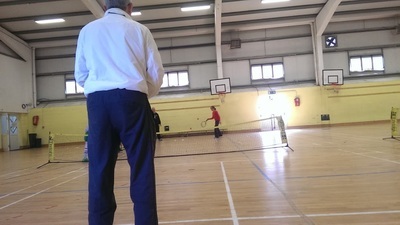 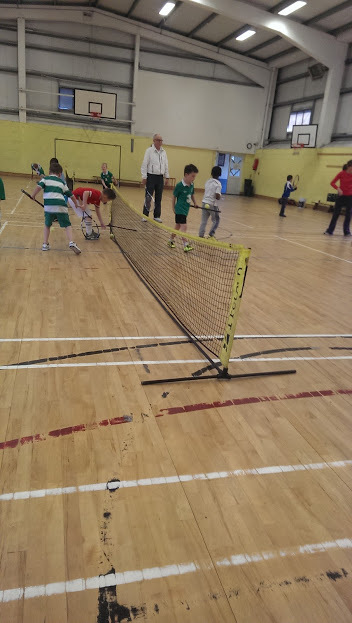 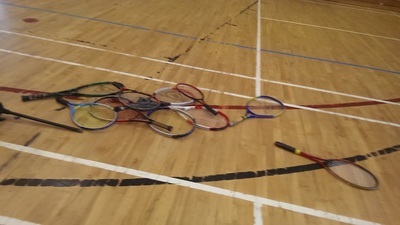 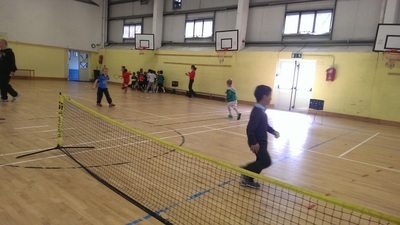 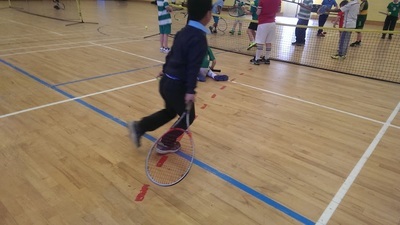 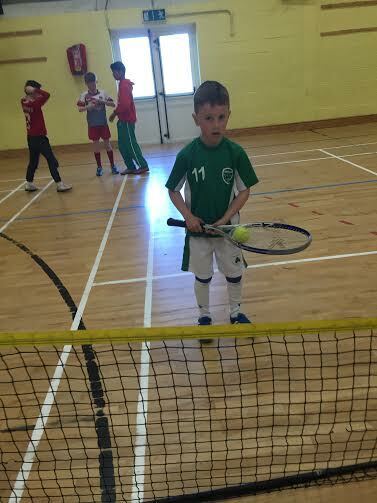 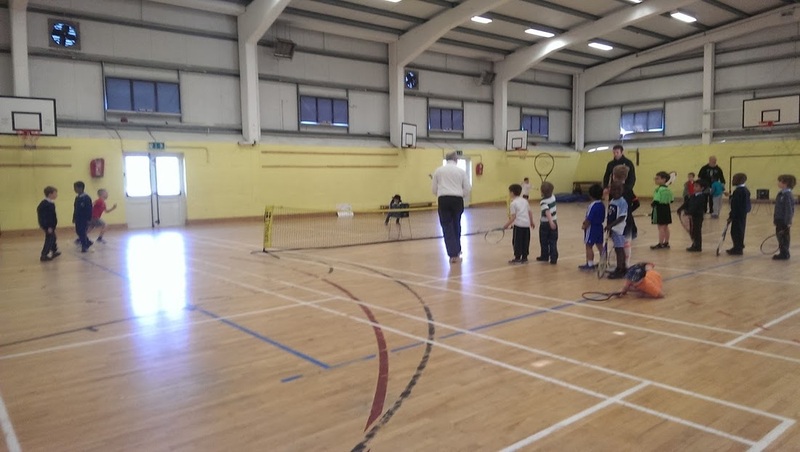 Tennis lessons for Senior Infants and First Class had to be postponed at the last minute. 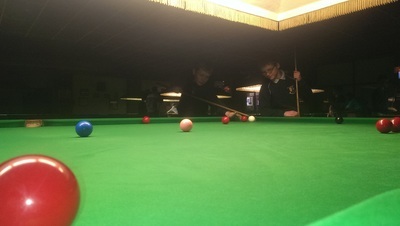 Michael and Ed have kindly agreed to rearrange the lessons for Friday morning which everyone is looking forward to. 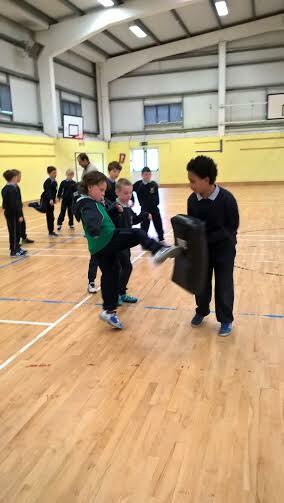 Tuesday of Active Week promises to be another action packed day. 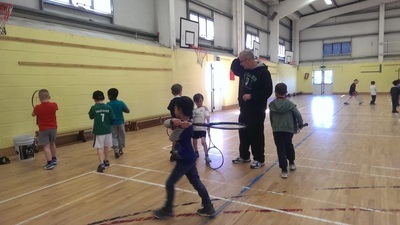 We welcome Michael and Ed back from Celbridge Tennis Club for Tennis coaching with Senior Infants and 3rd Class. 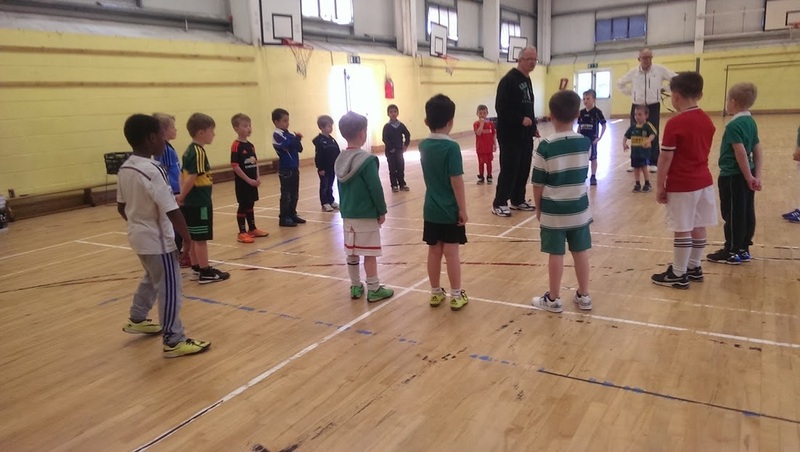 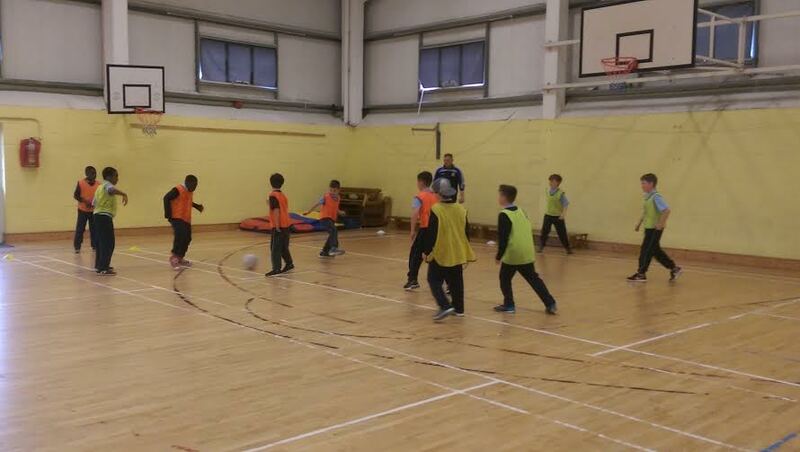 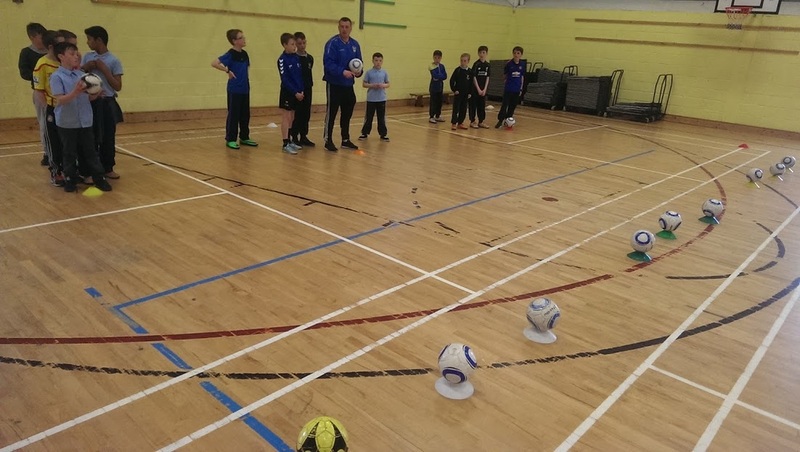 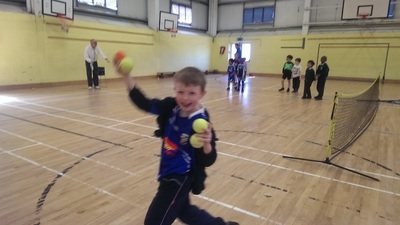 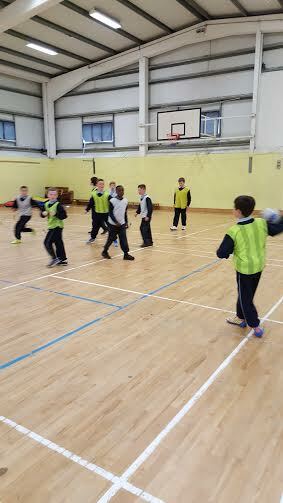 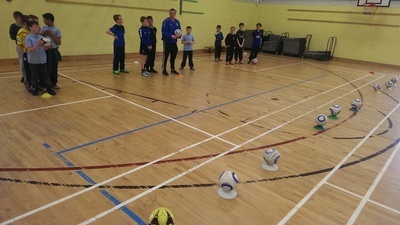 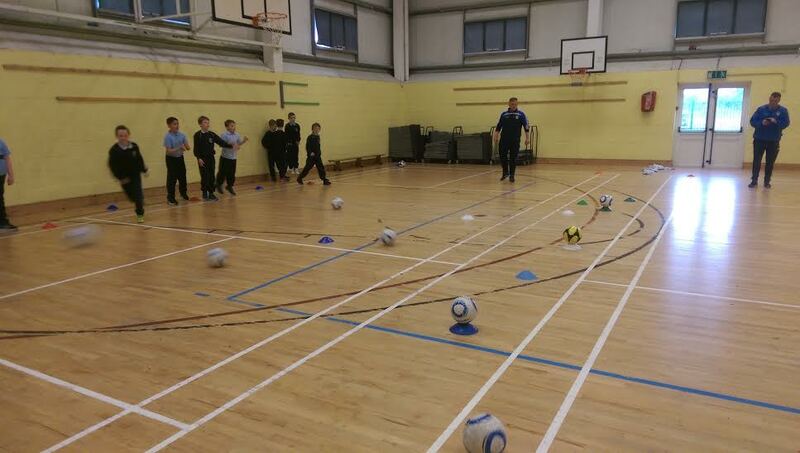 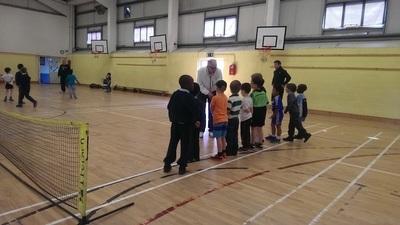 Gavin from Ballyoulster will coach pupils in 3rd and 4th Classes. 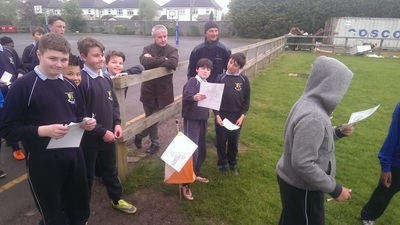 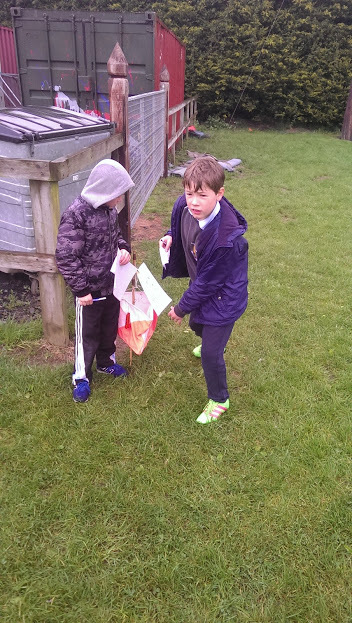 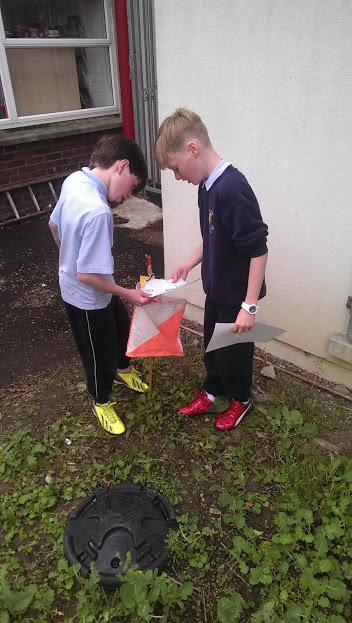 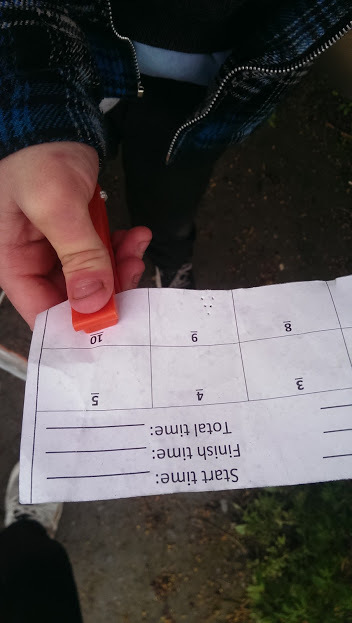 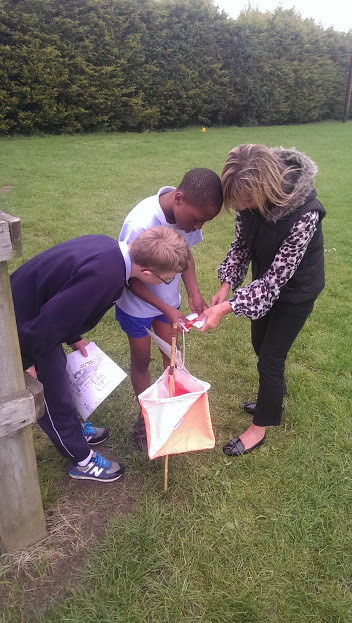 A new orienteering course around the school will be launched. 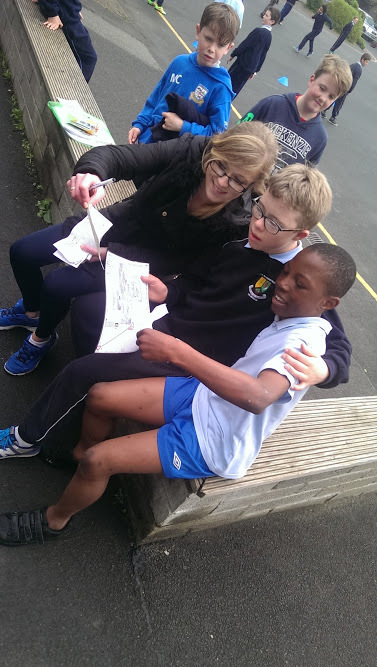 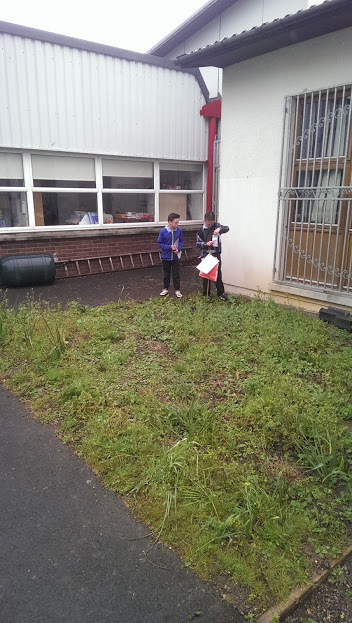 Ms O Brien and 3rd class parent Justin May have worked hard over the last few weeks designing, planning, mapping and laying out a course on the school grounds. It will be launched tomorrow with the senior classes and will continue over the next few days for all classes. 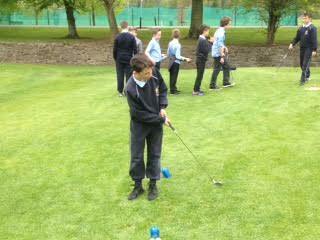 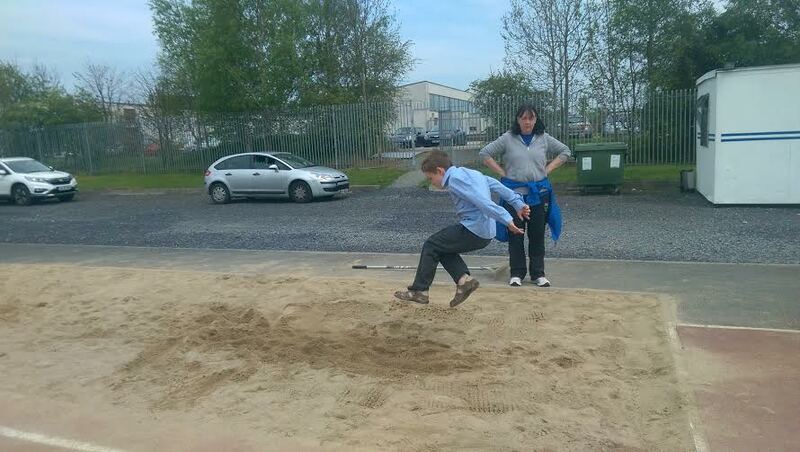 Finally pupils in the Droichead and 3rd classes will join up with our friends in St. Raphaels for Bocce. 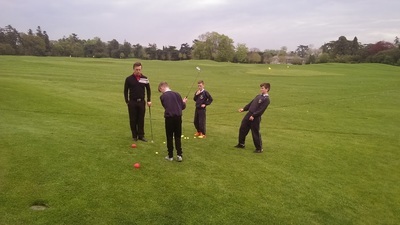 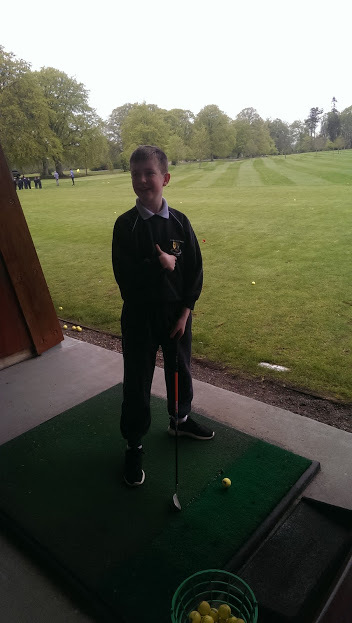 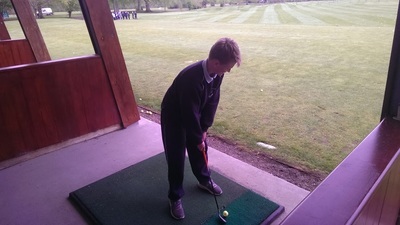 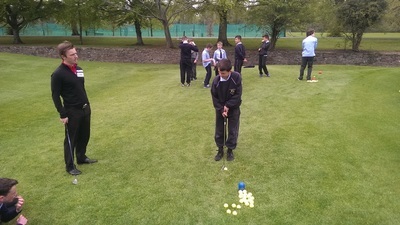 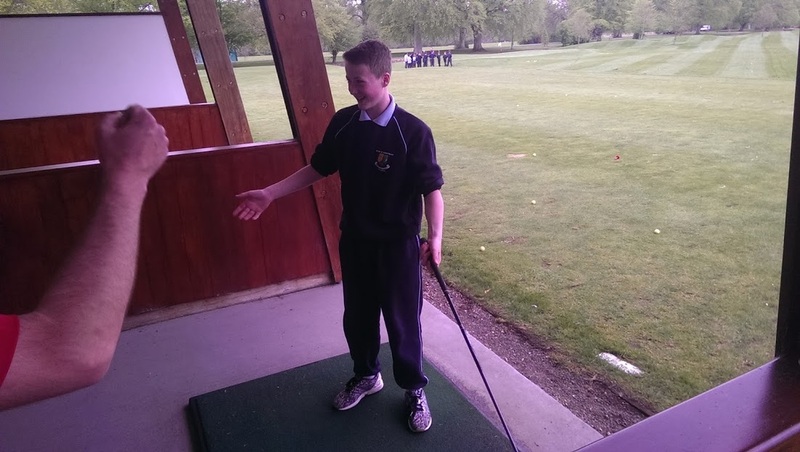 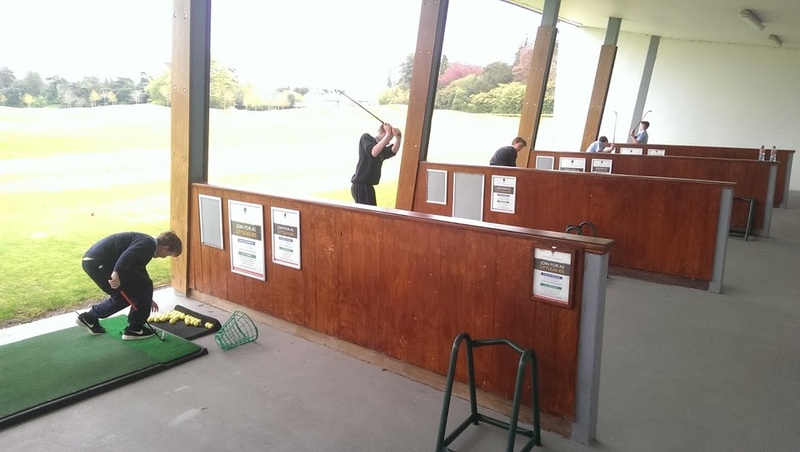 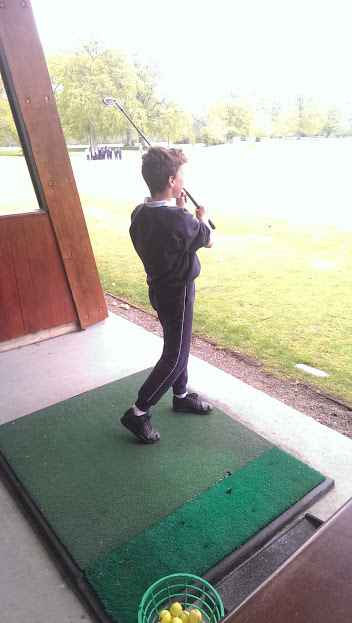 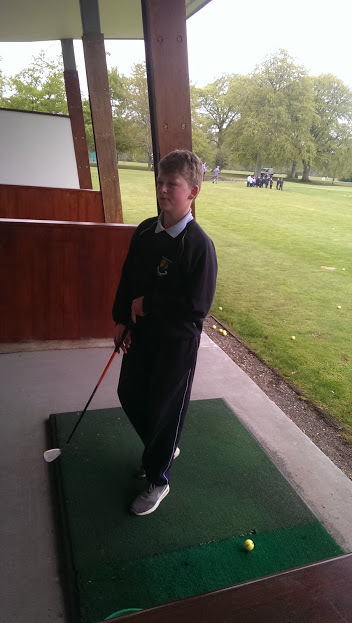 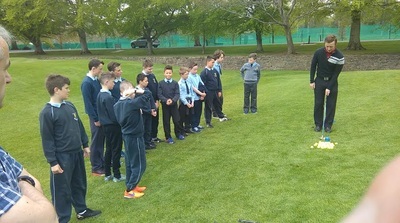 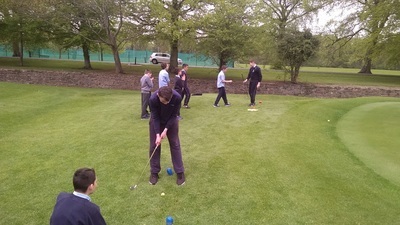 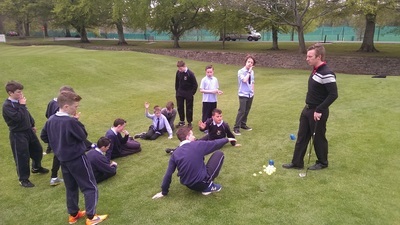 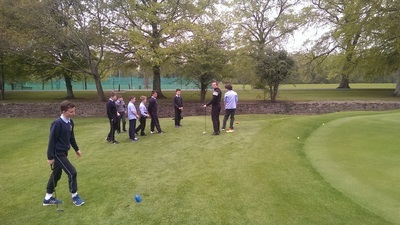 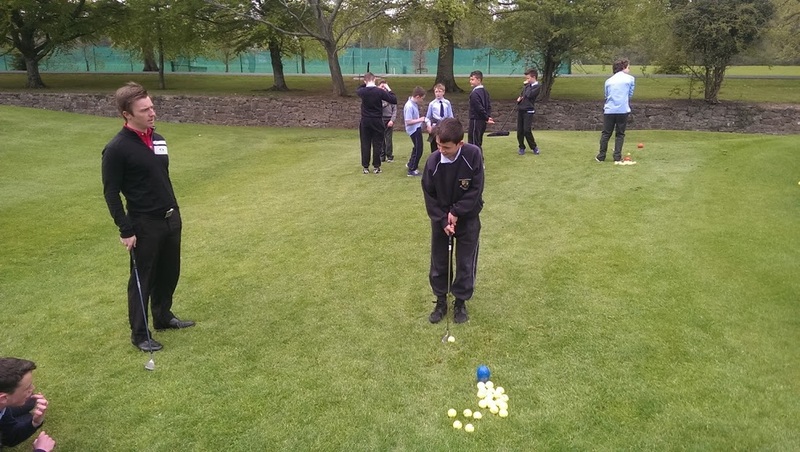 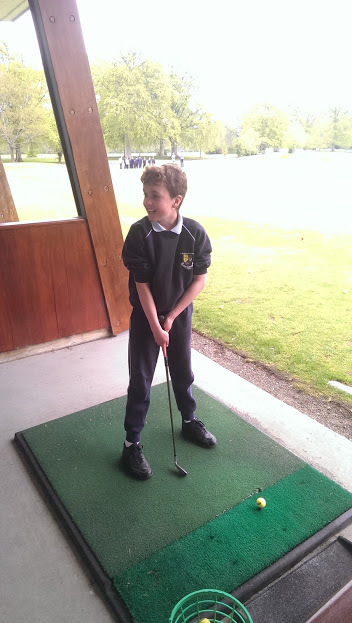 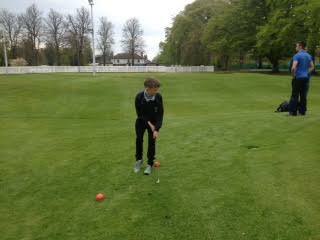 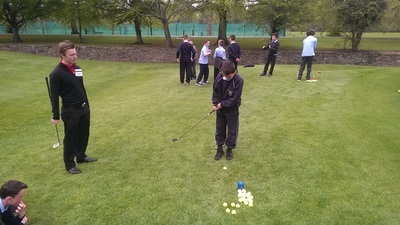 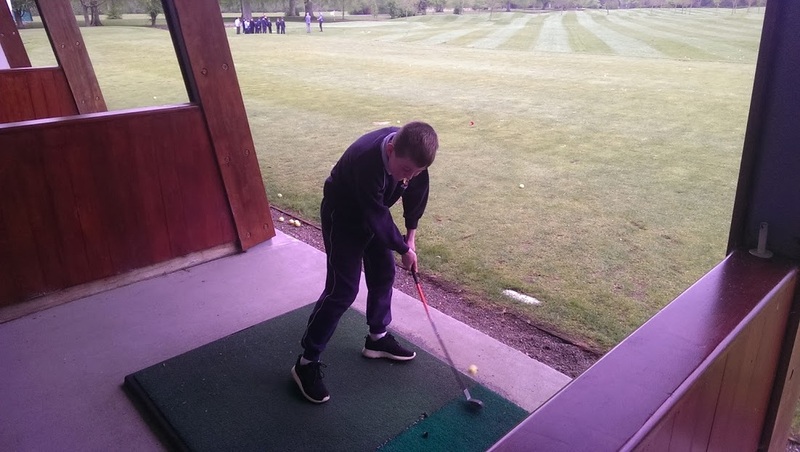 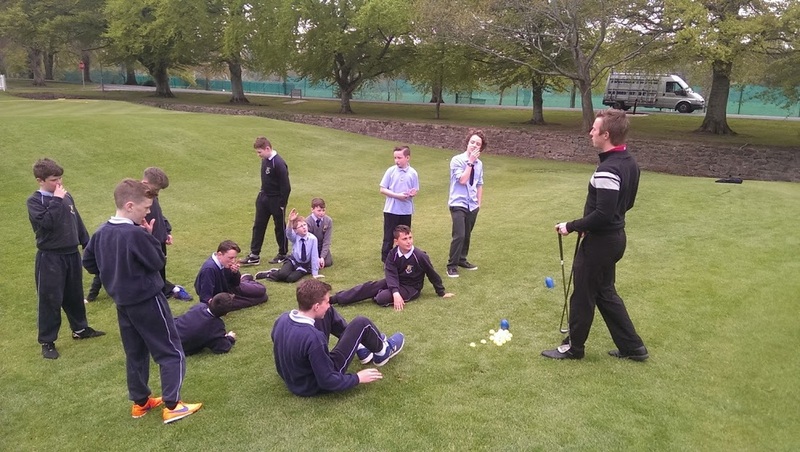 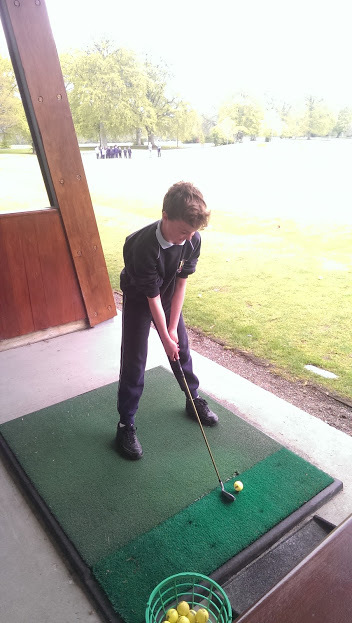 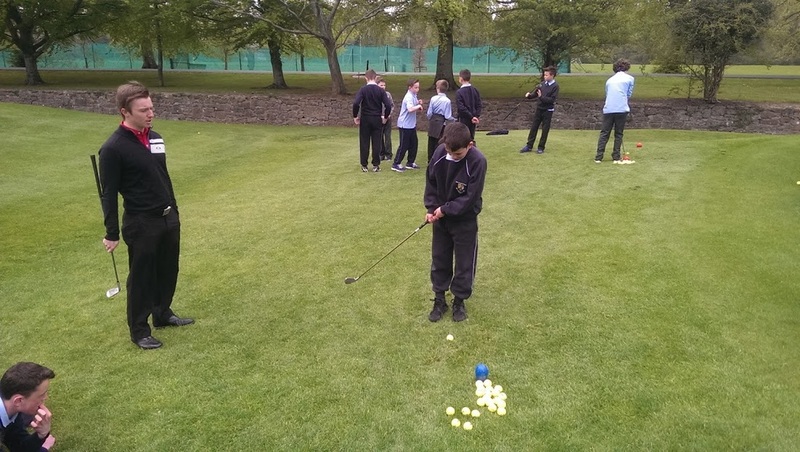 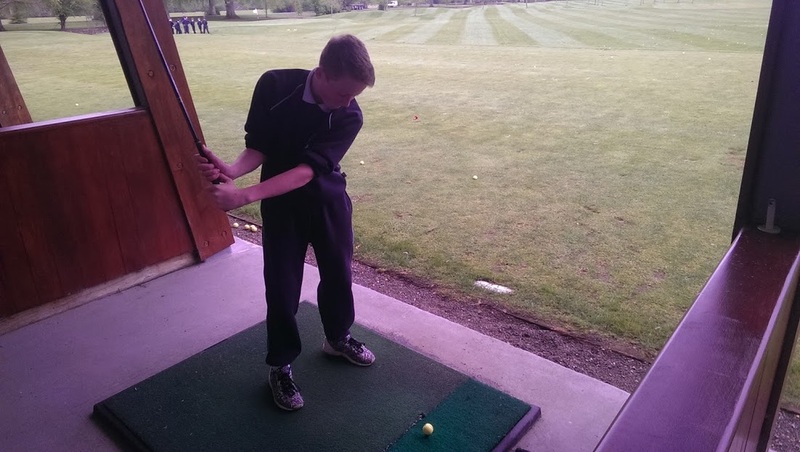 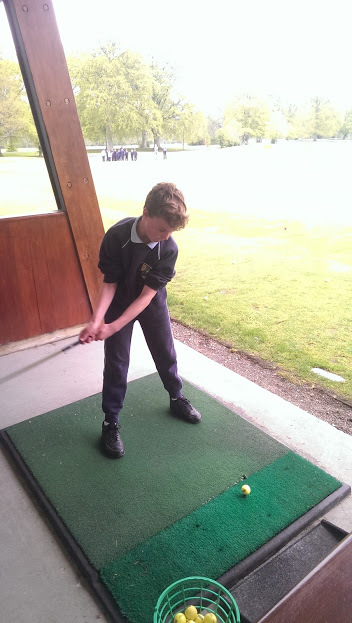 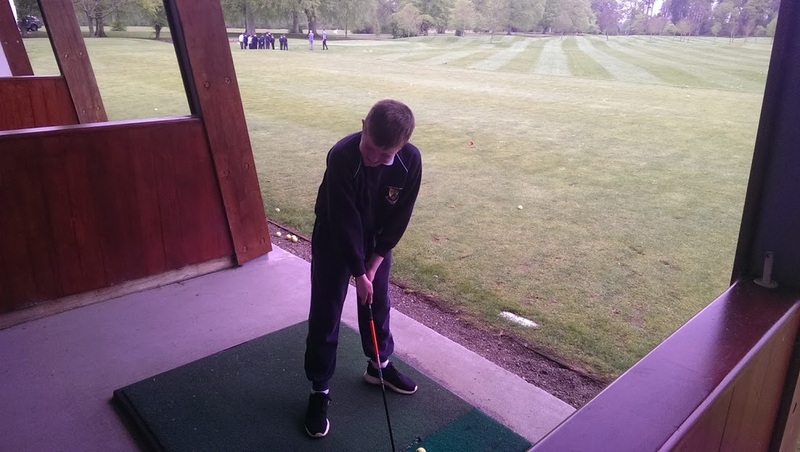 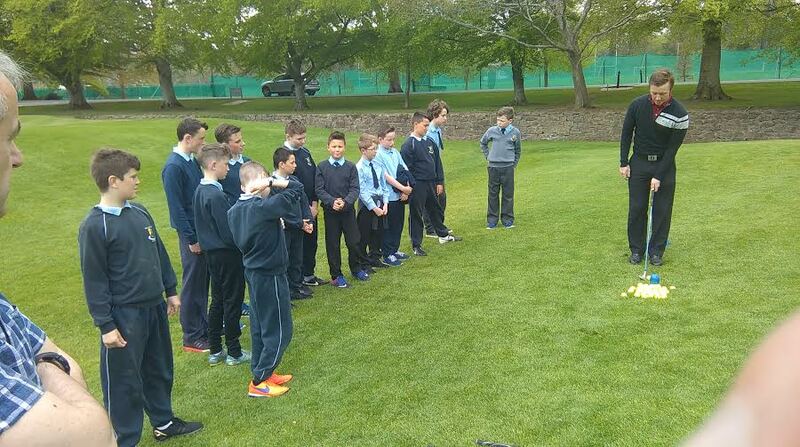 Kenny Fahey and his team provided the coaching, Carton House was the venue for a top class introduction to Golfing for the 6th class boys. Confidence was the name of the game and the boys left believing they were the best golfers in the world. 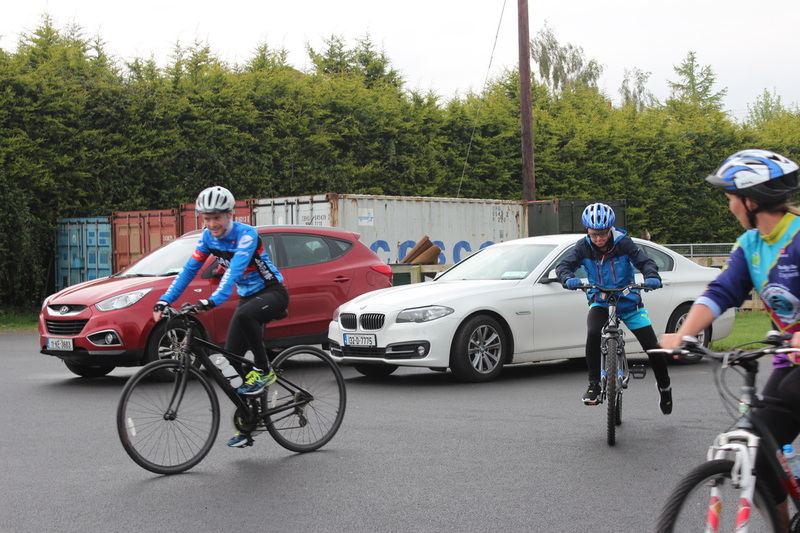 A full report will follow from the boys but for now chek out the pictures in our gallery below. 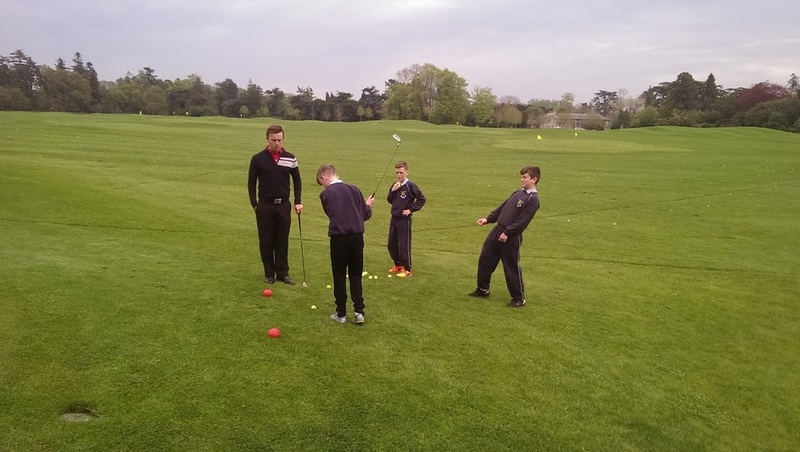 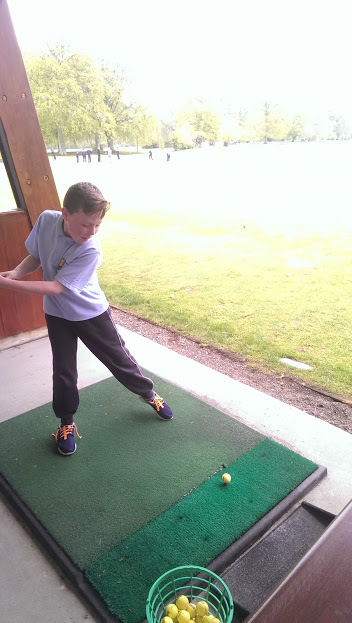 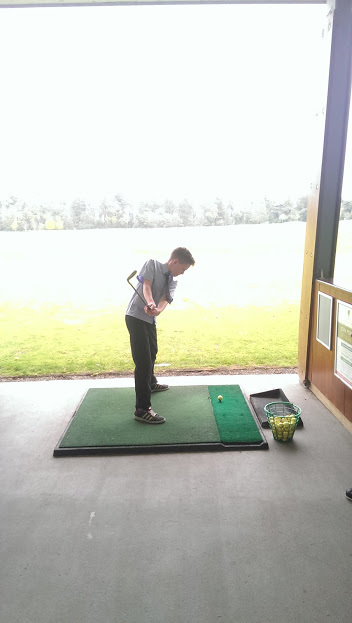 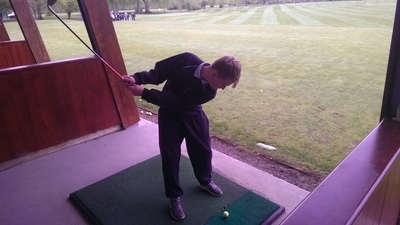 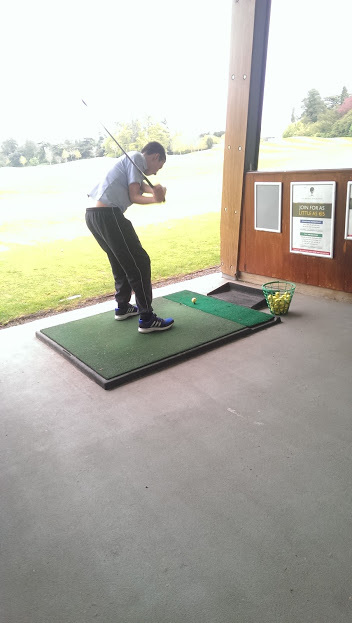 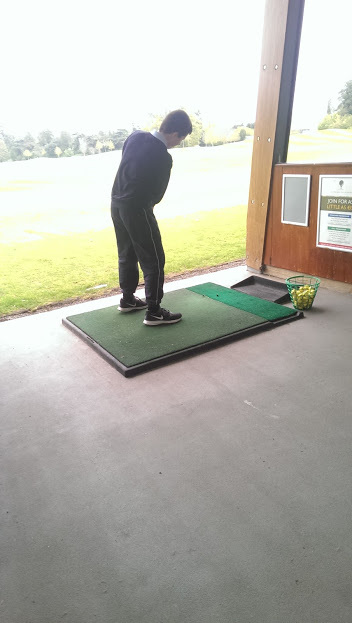 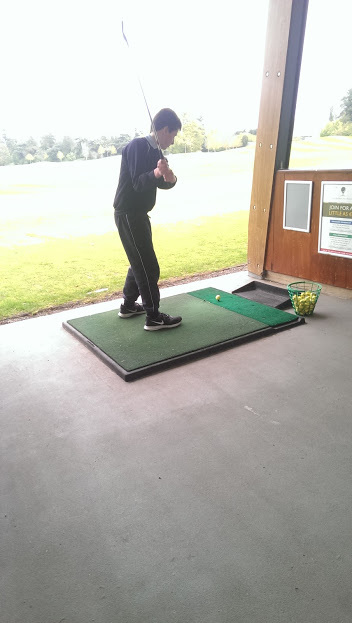 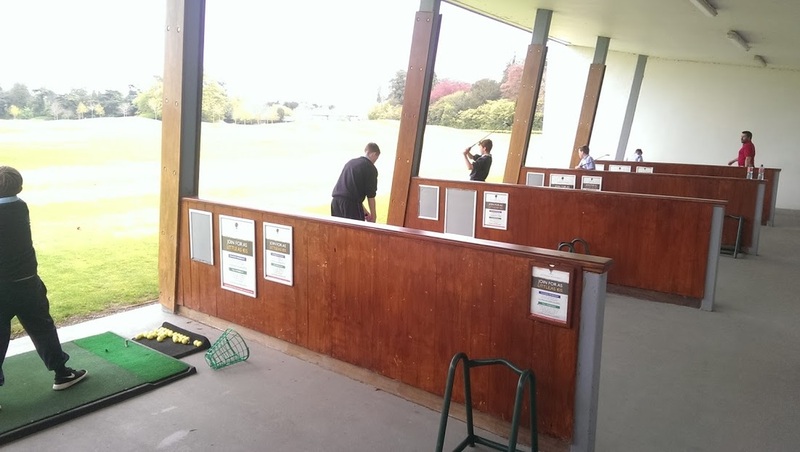 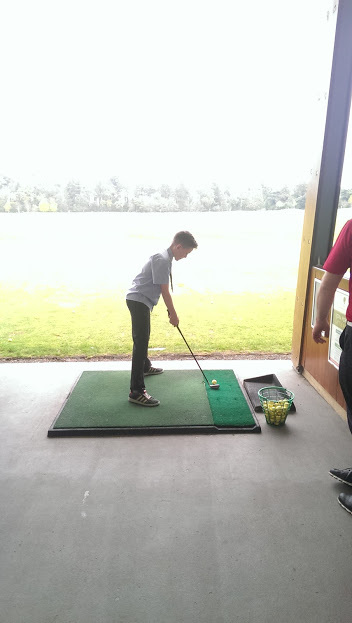 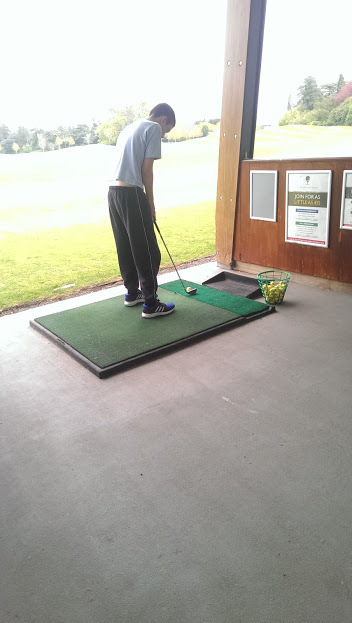 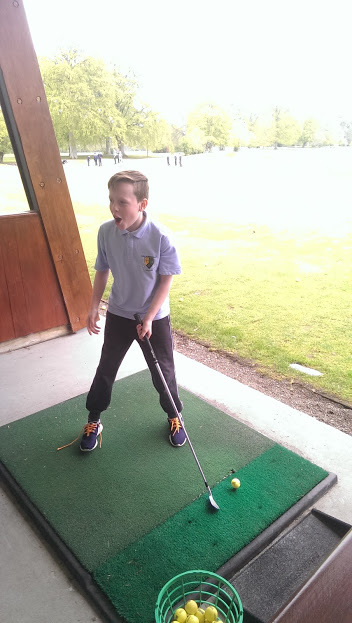 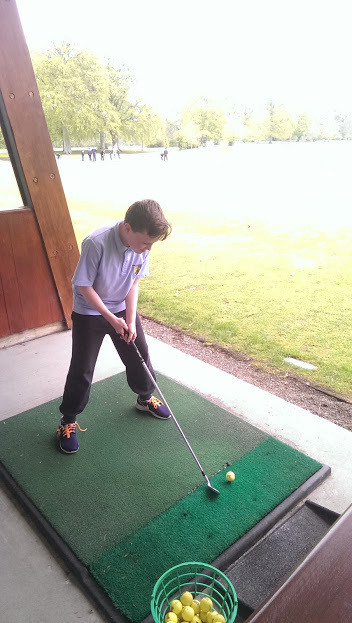 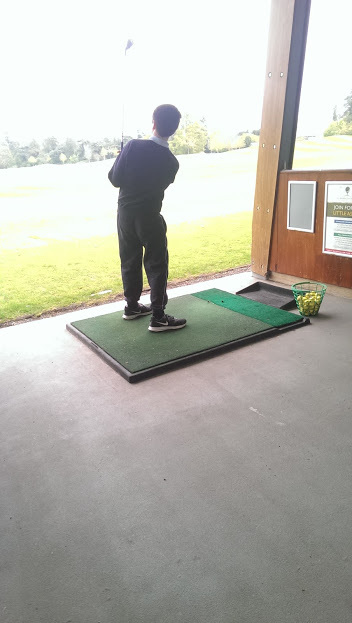 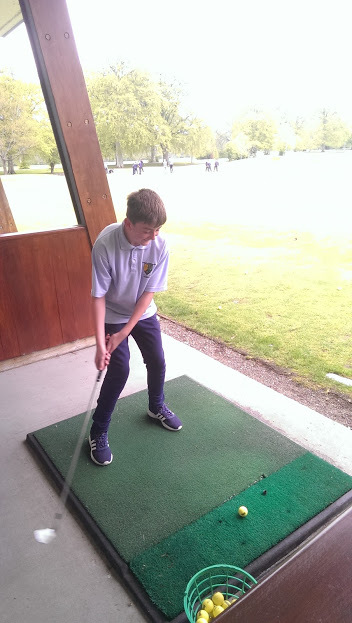 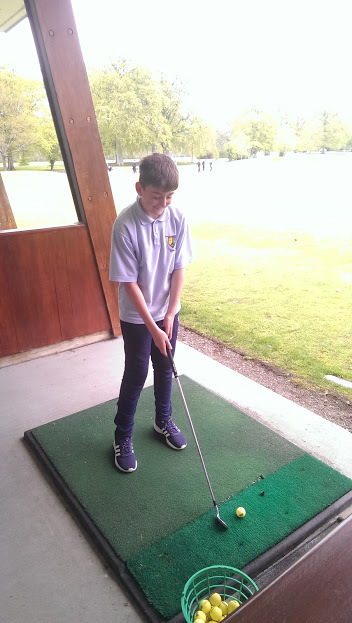 At the GUI National Golf Academy Weekly Junior Golf Classes commence next week on Tuesday, Wednesday & Thursday, and will run until the end of June. 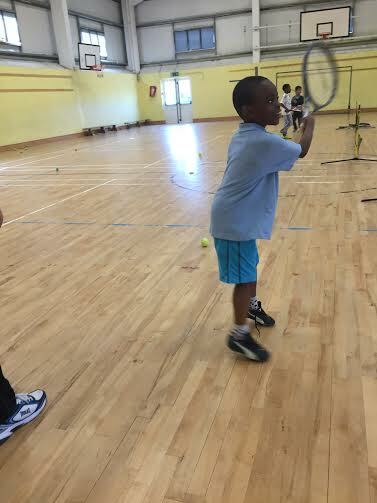 Summer Camps commence on July 4th, 11th, and 25th and also throughout August. Golf clubs provided, if required. 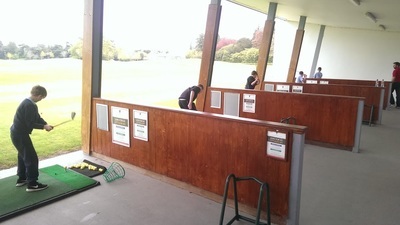 For further information, please visit www.bettergolf.ie/booking or call 01-5054040. 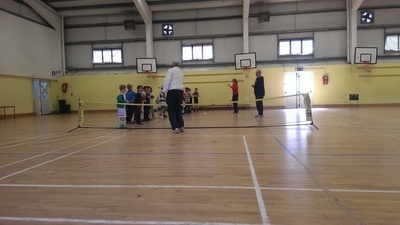 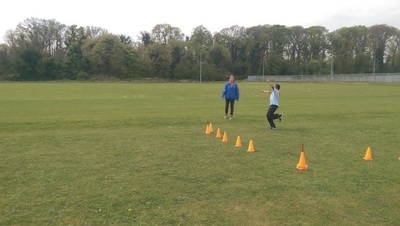 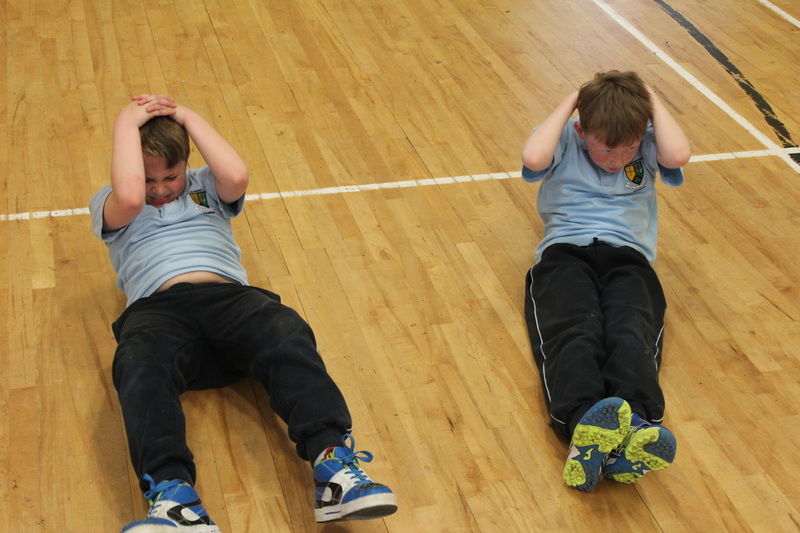 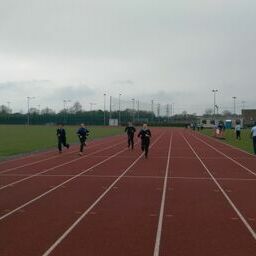 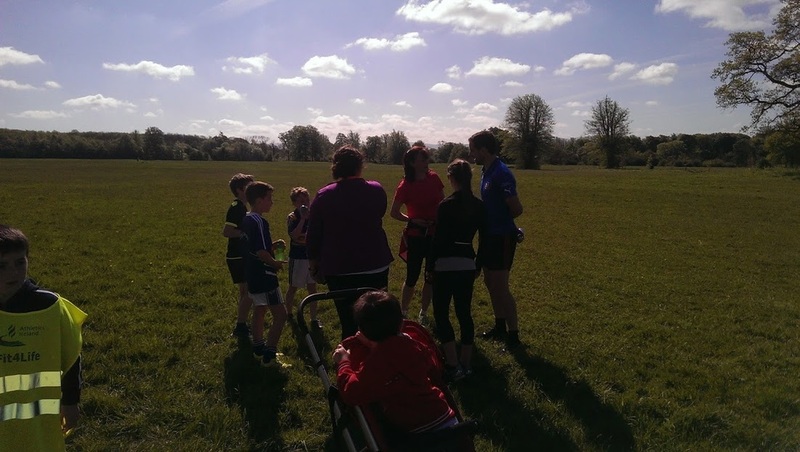 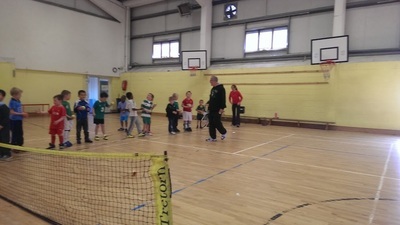 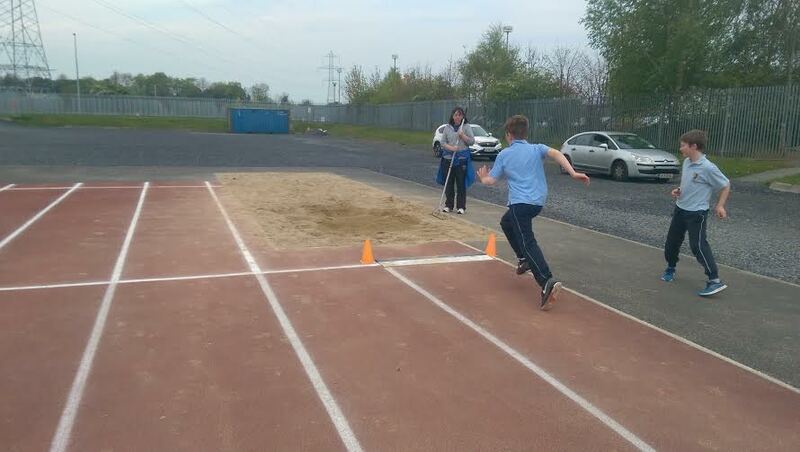 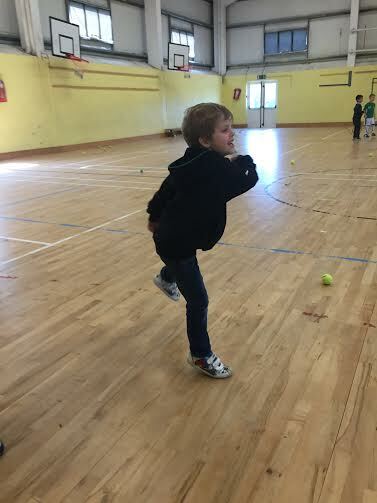 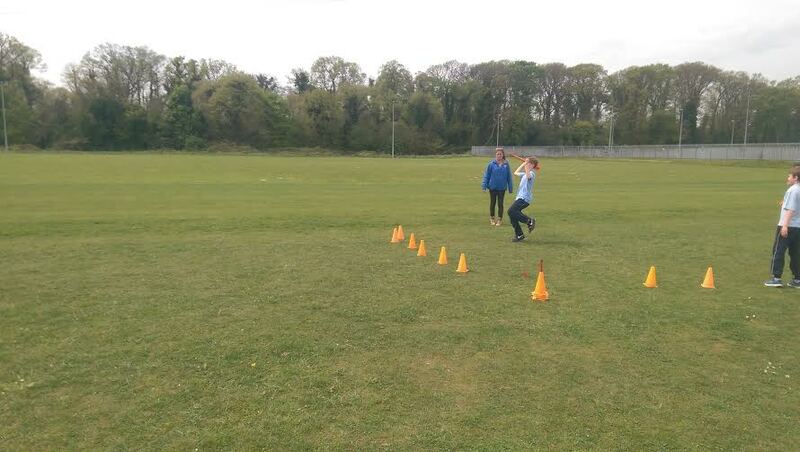 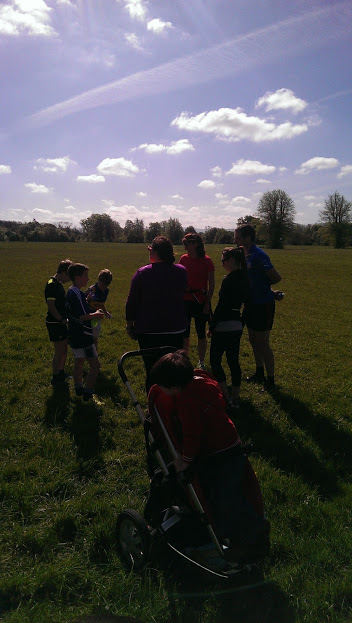 Third Classes spent an hour each in Celbridge Athletic Club being coached by Club Coaches, Tracy, Mary and Sandra. 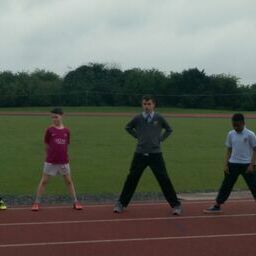 We very much appreciate the time and expertise they shared with the boys. 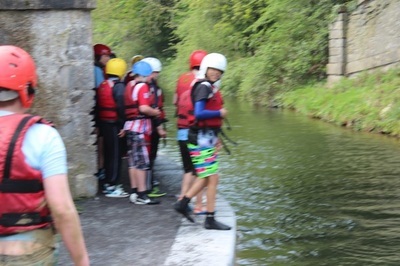 It was a most enjoyable experience for them all as you can see from the pictures below. 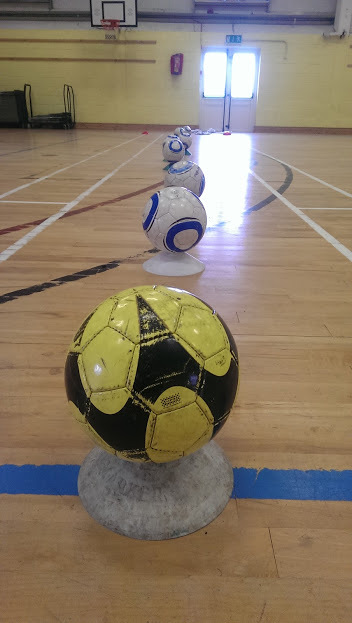 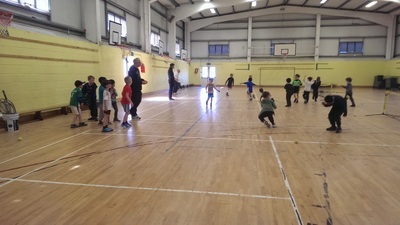 Junior Infants – 6 year olds Thursday 6.30- 7.15pm. 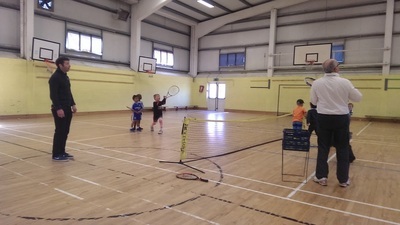 7-10 year olds Tues & Thurs 6.30-7.30. 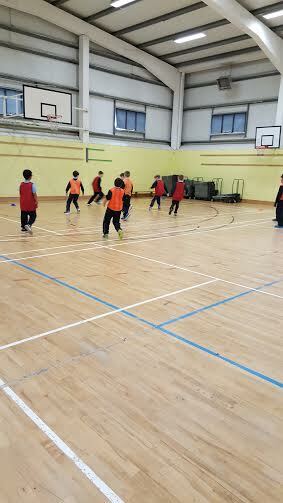 Age 11+ Tues & Thurs 7.30-8.30pm. The club are also hosting the Celbridge Community Games Finals next Monday May 16th from 5.30 pm. 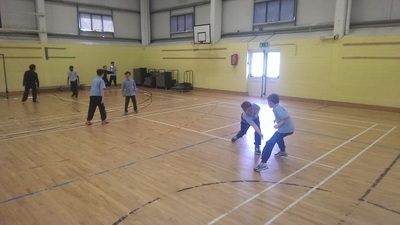 Full details are available Here on the Community Games Site. 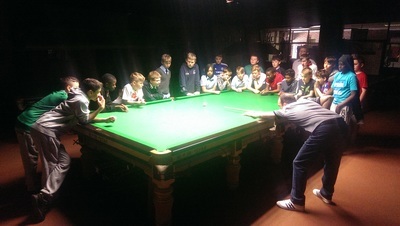 An entry form Available Here lists the age categories, the events taking place and other relevant information for anyone who thinks they might be interested. 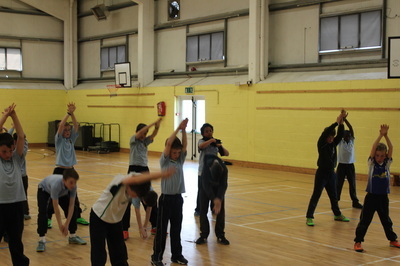 Active week began with a bang with the most enjoyable Dance Lessons provided by Lorna and Adele of Dance LA. The boys had a blast. 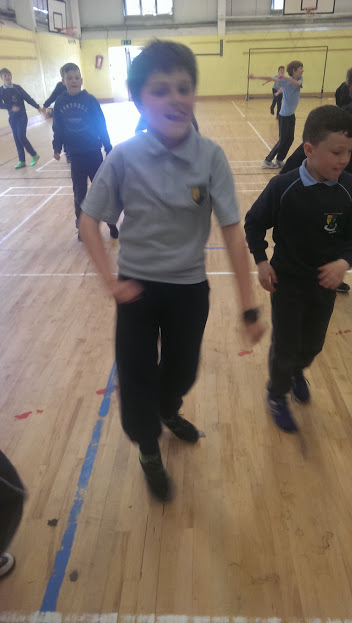 The smiles on their faces as they left the hall said it all. The gallery below contains images of the action with more to follow. 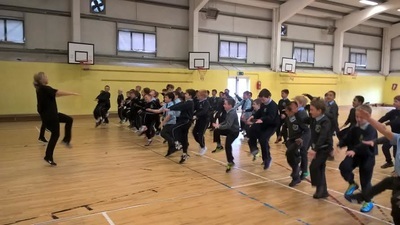 Above are some details of a Summer Camp run by Dance LA during the summer holidays. If anybody is interested the girls asked us to announce they have a special early bird offer this year and they contacted at the email address or phone numbers above. 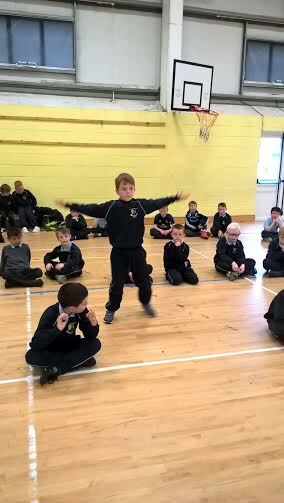 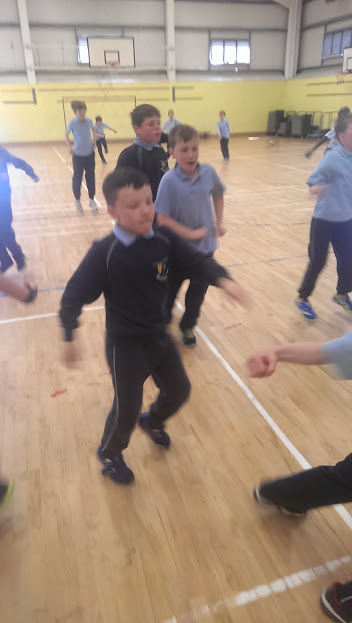 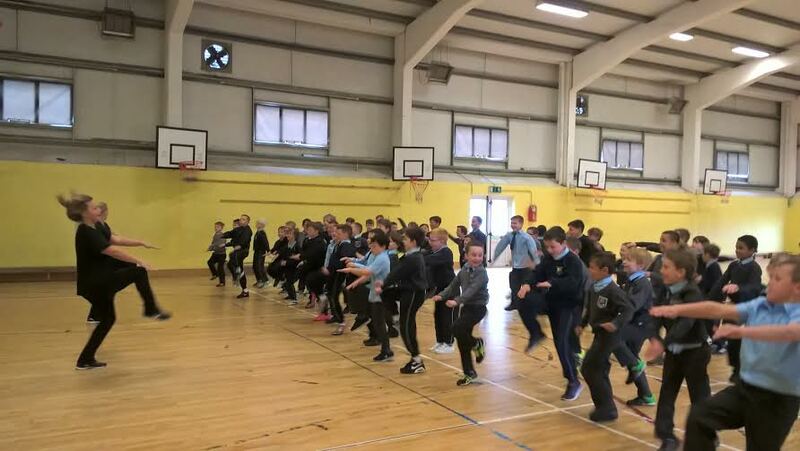 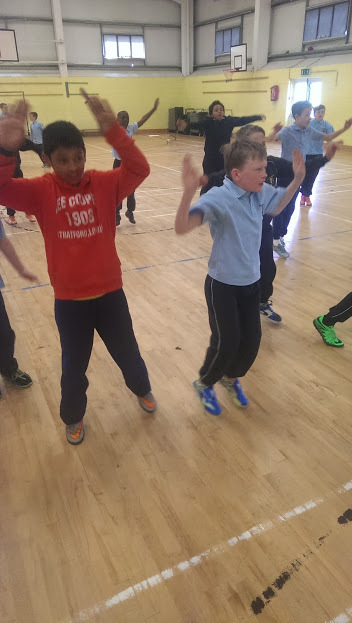 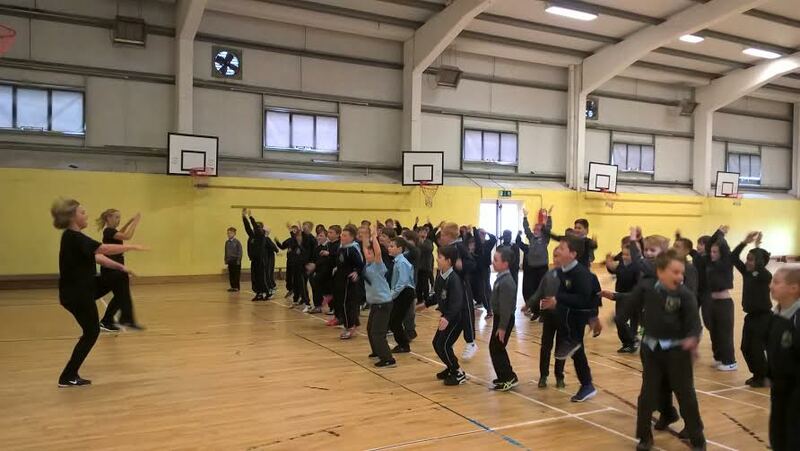 Active Week will kick off in Scoil Na Mainistreach with dance on Monday morning for Junior Infants and Second Class. 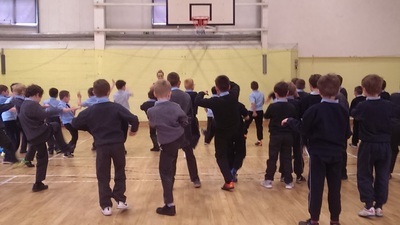 We welcome local dance specialists Dance LA to the school to work with the boys. 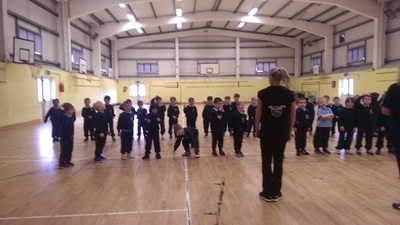 Dance LA specialises in Hip hop, jazz, modern and contemporary dance, musical theatre, singing, drama, theatre skills, audition technique and stage presence. 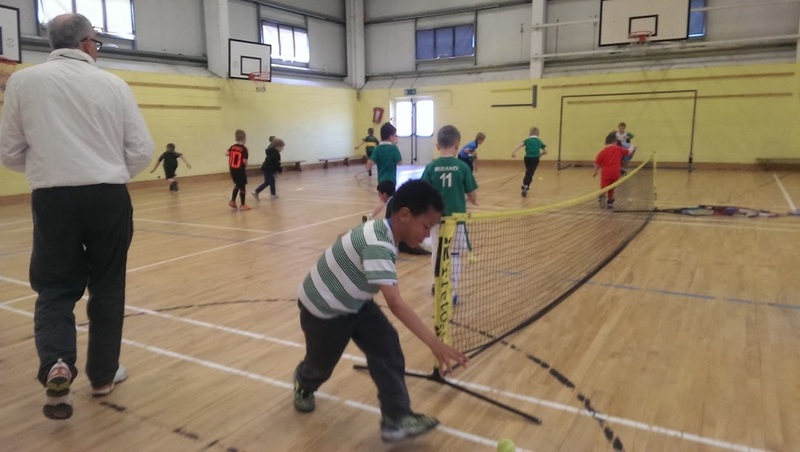 They believe it is most important to teach and encourage their students in a fun filled atmosphere and to enhance their social skills and self-confidence. We very much look forward to welcoming Lorna and Adele to the school for what promises to be an action packed morning. 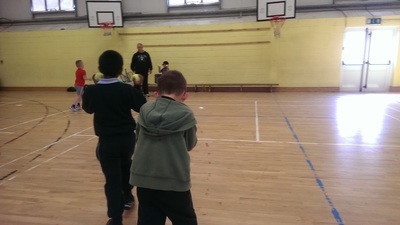 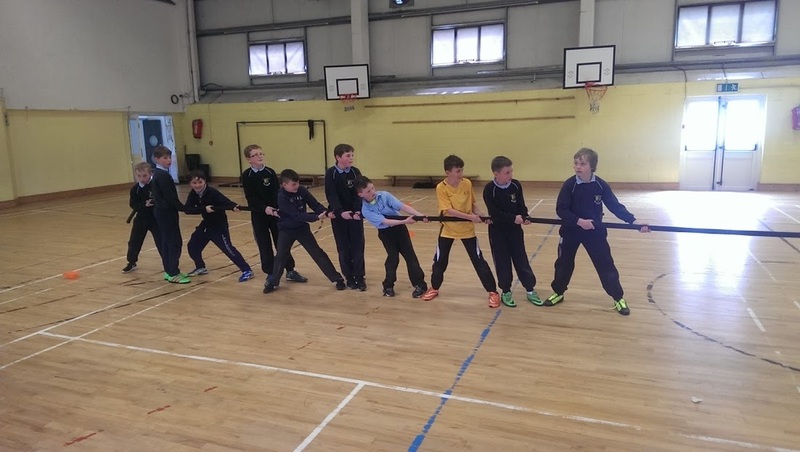 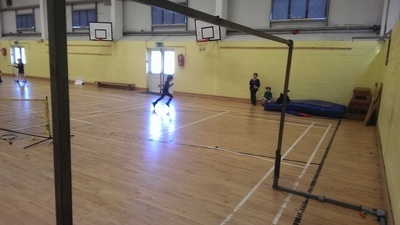 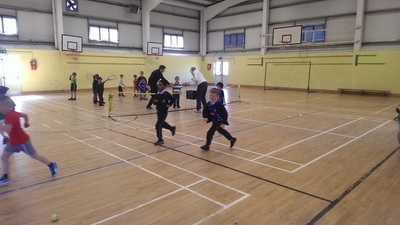 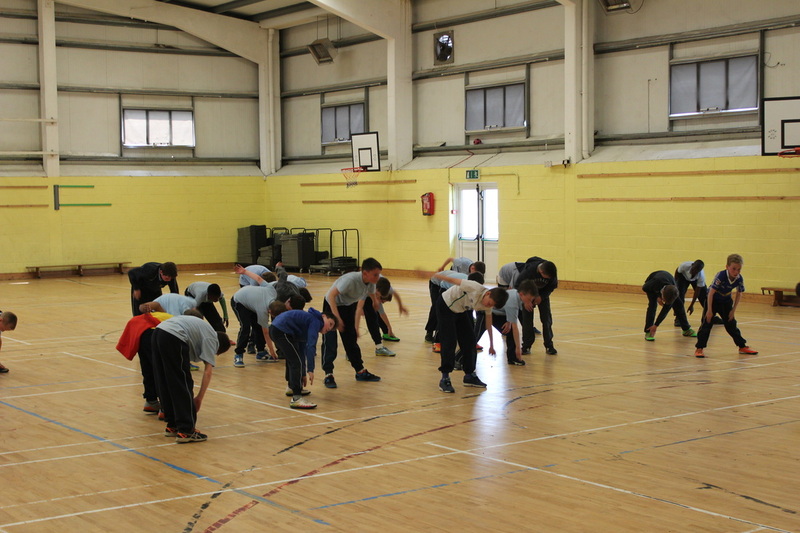 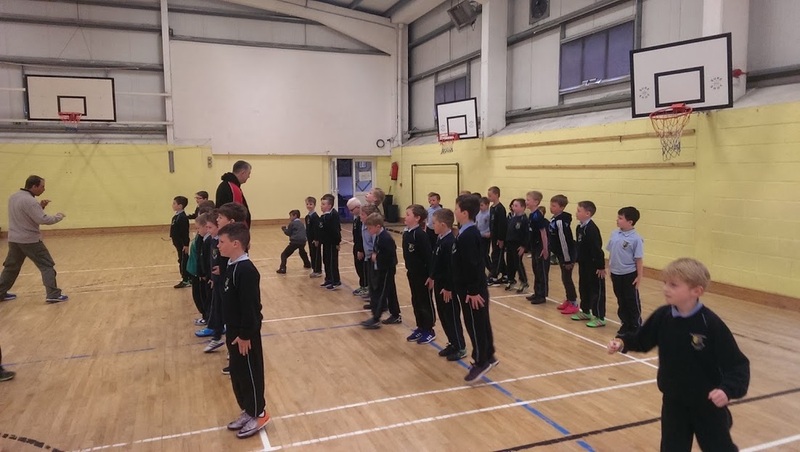 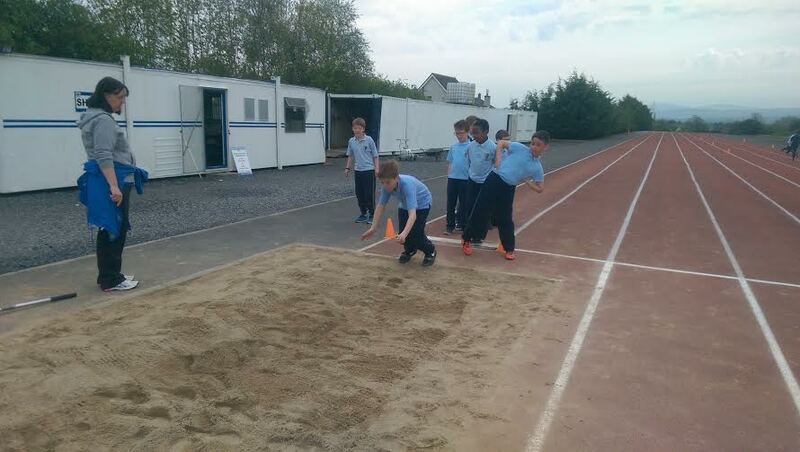 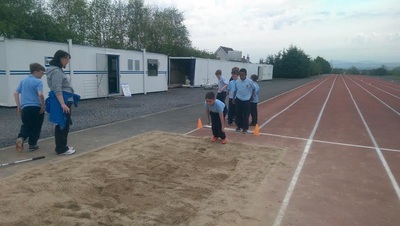 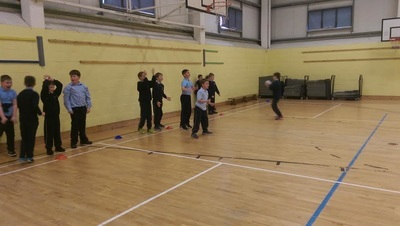 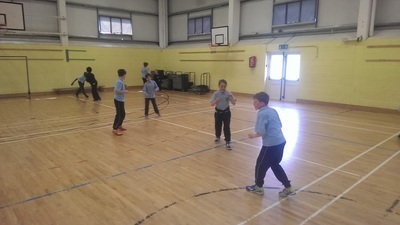 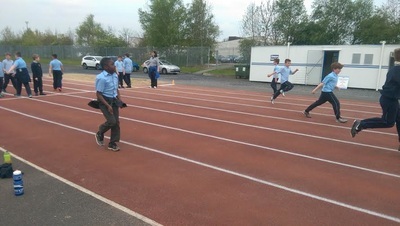 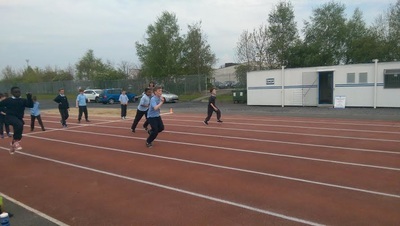 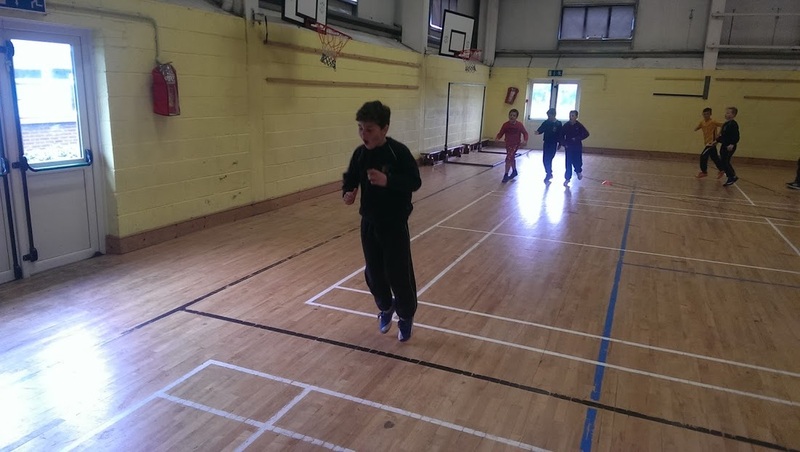 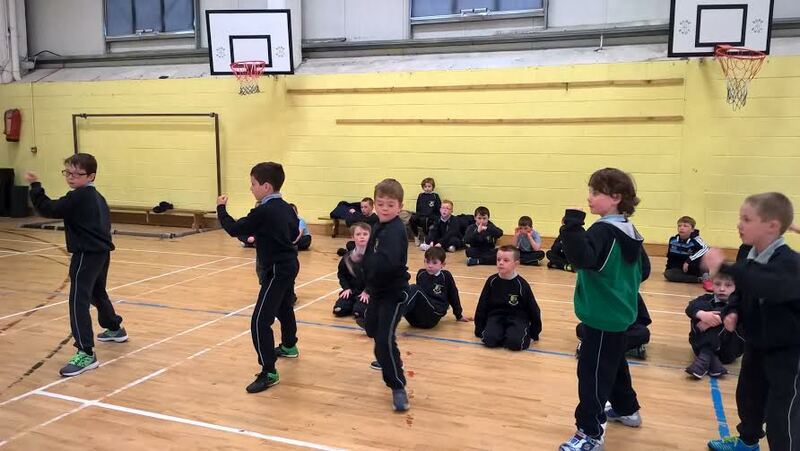 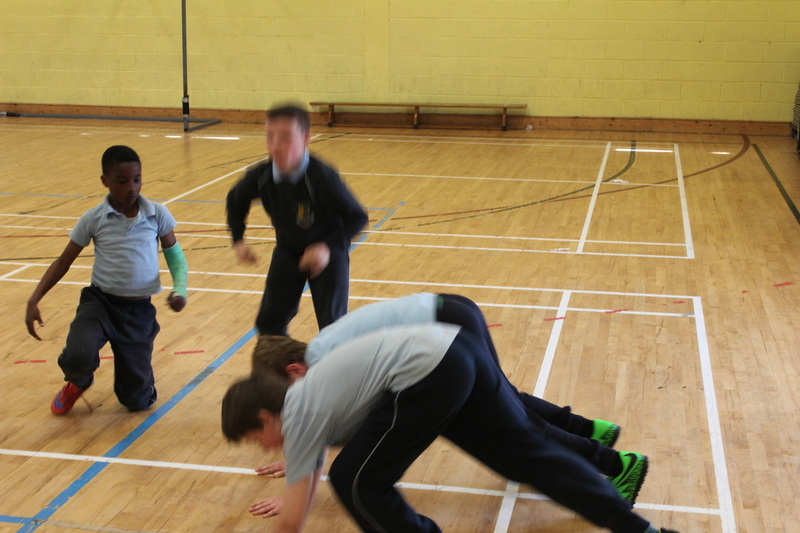 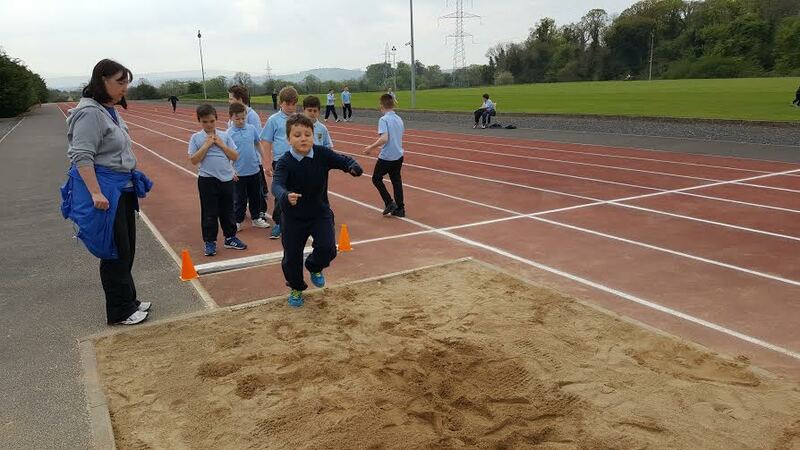 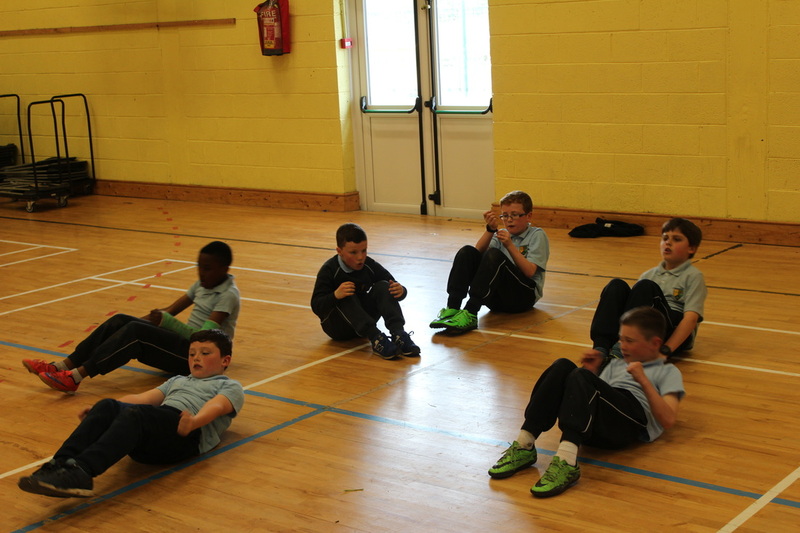 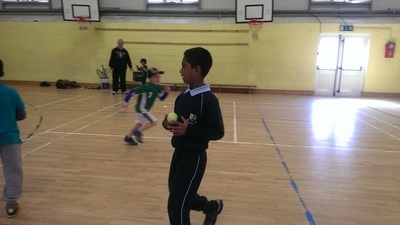 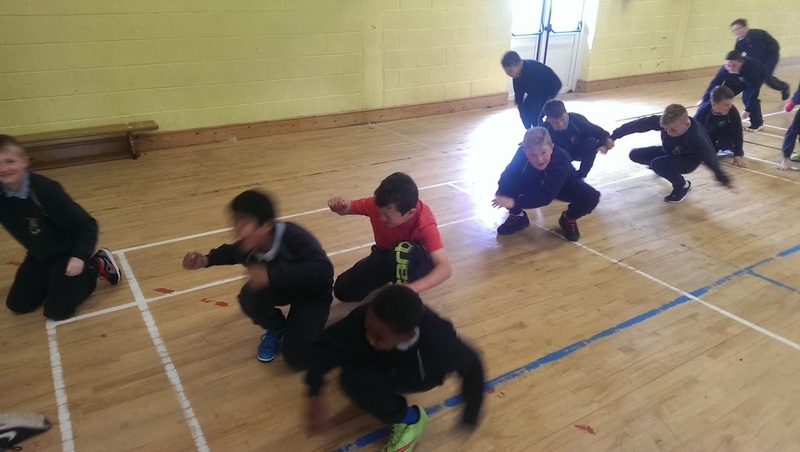 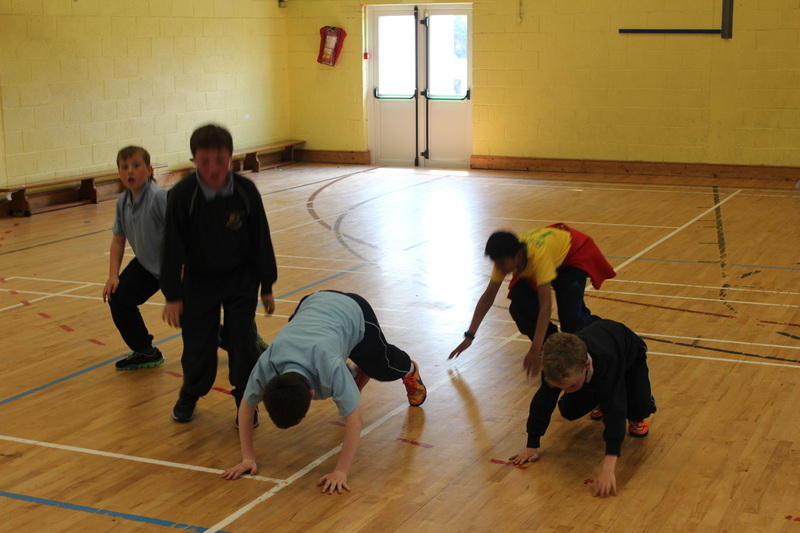 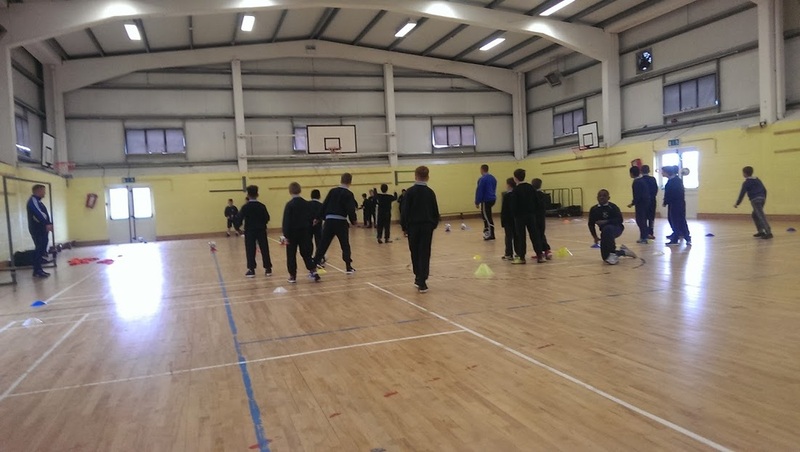 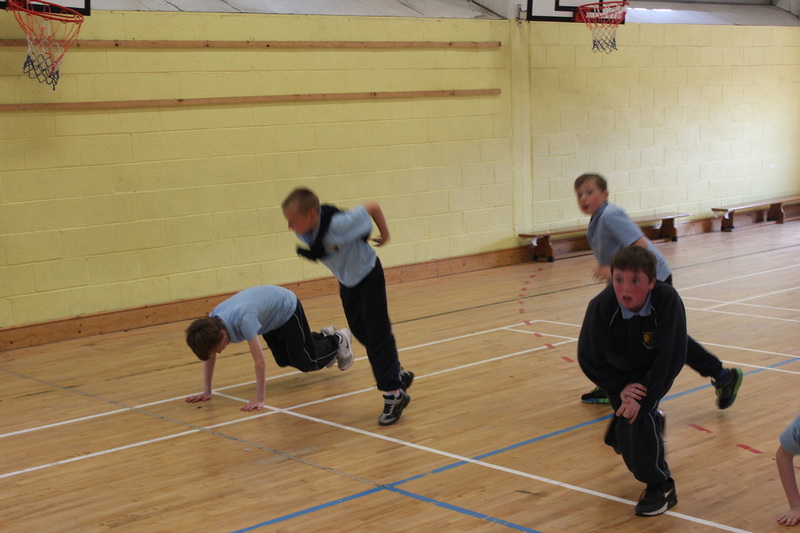 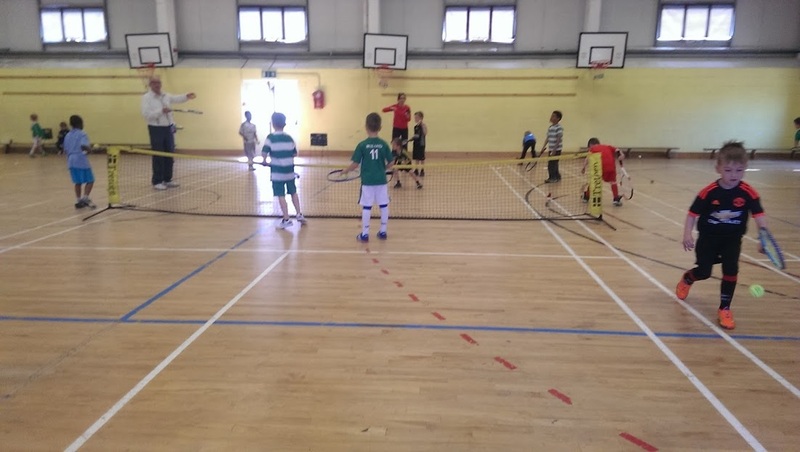 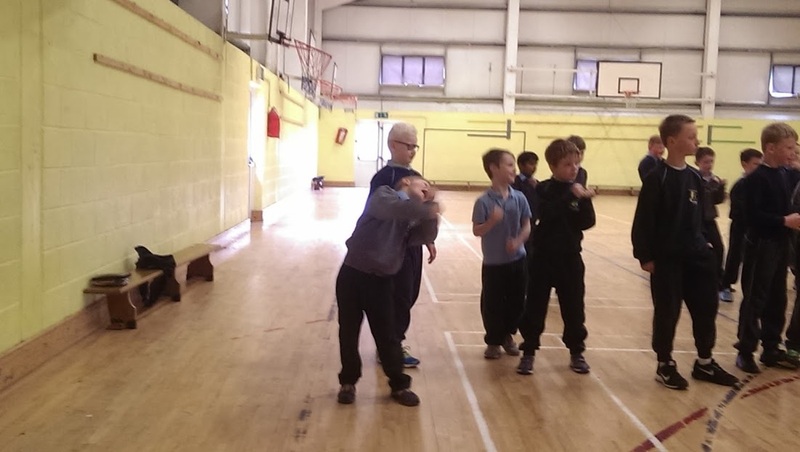 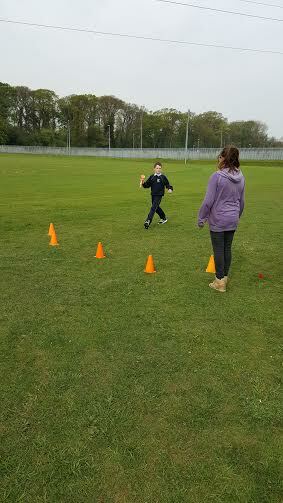 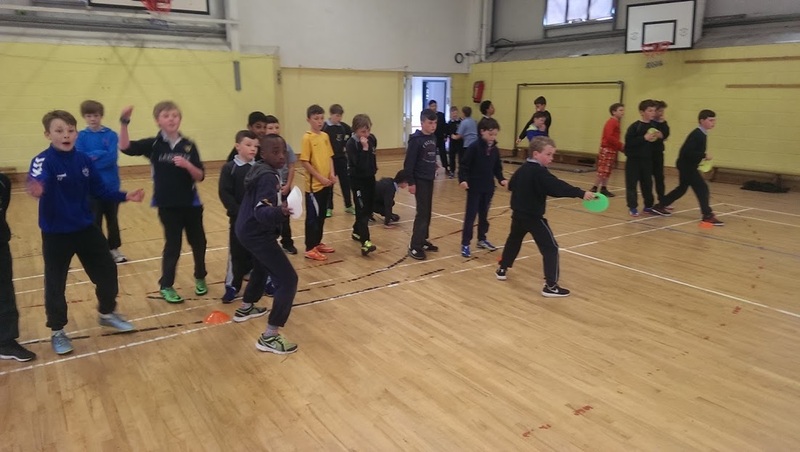 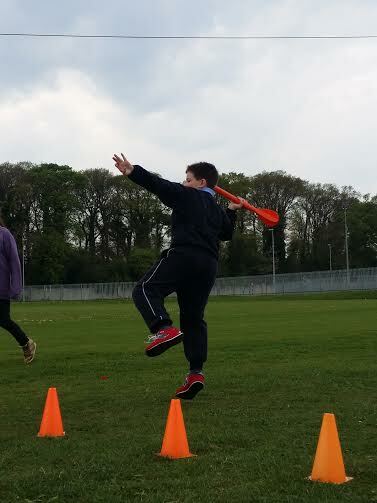 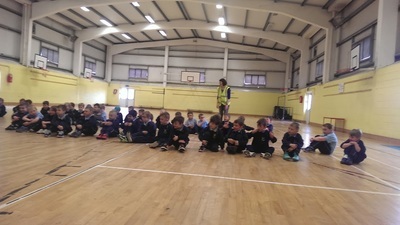 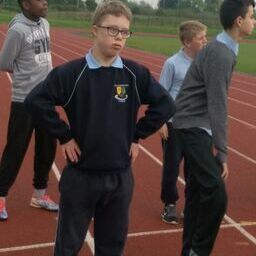 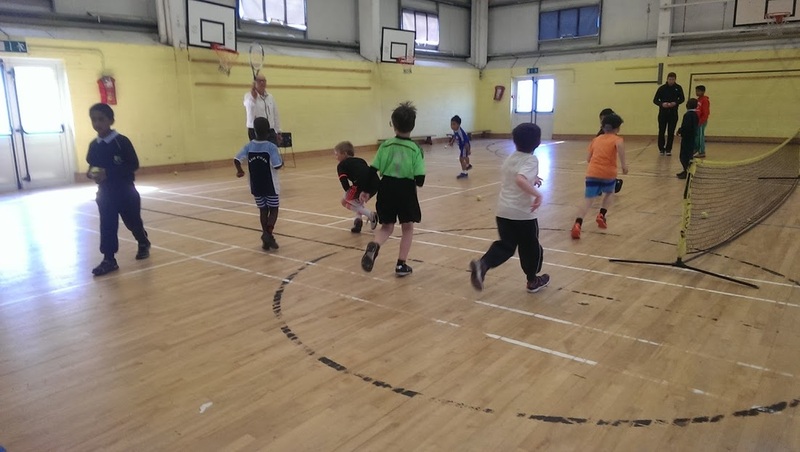 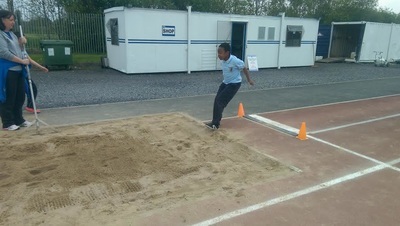 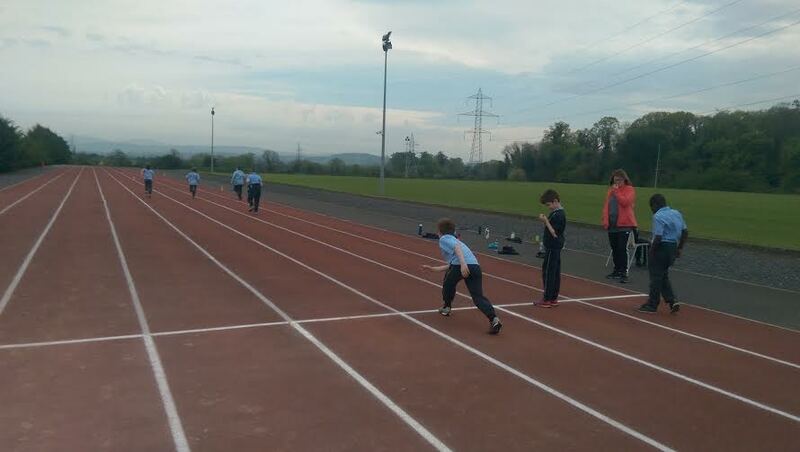 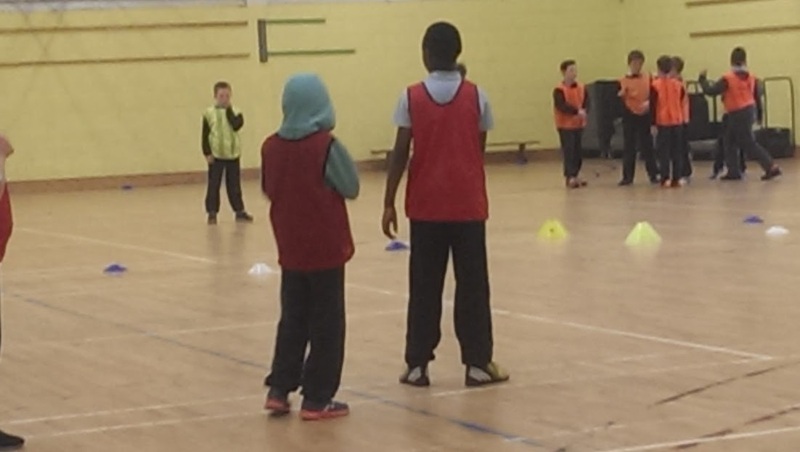 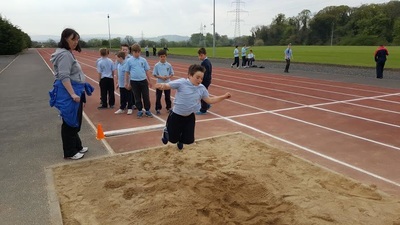 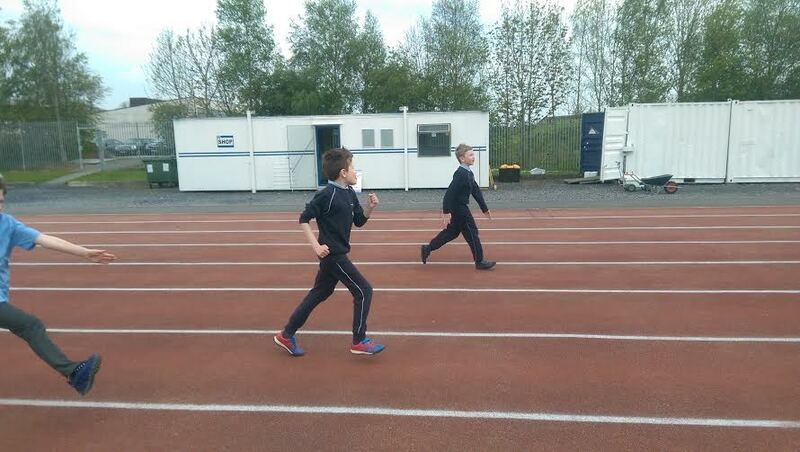 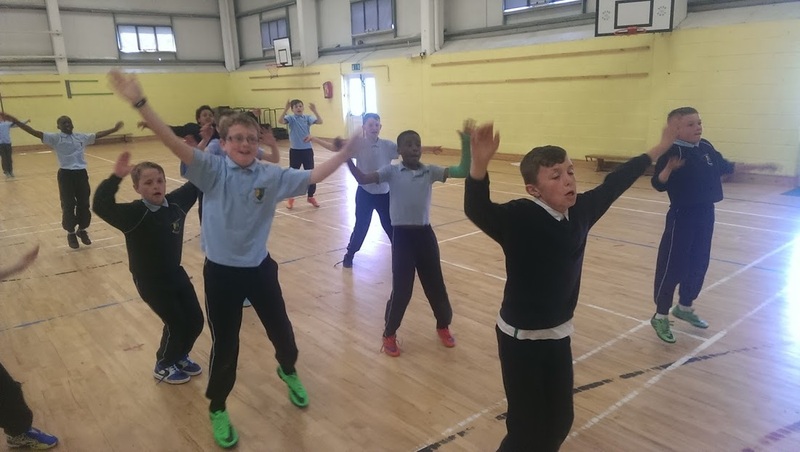 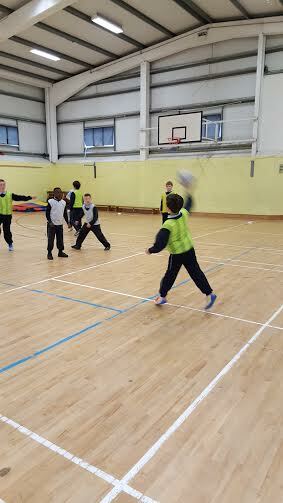 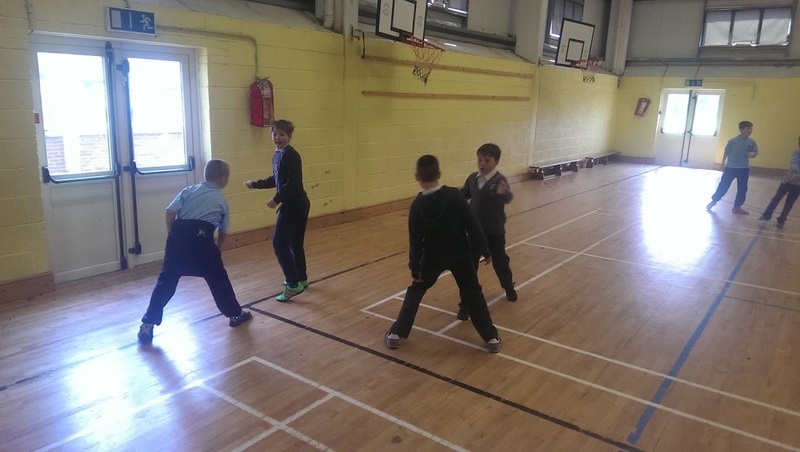 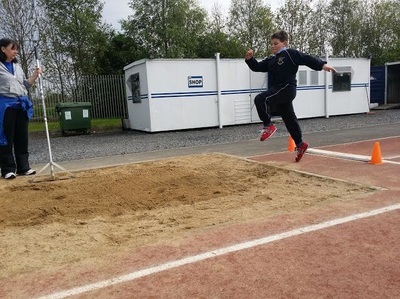 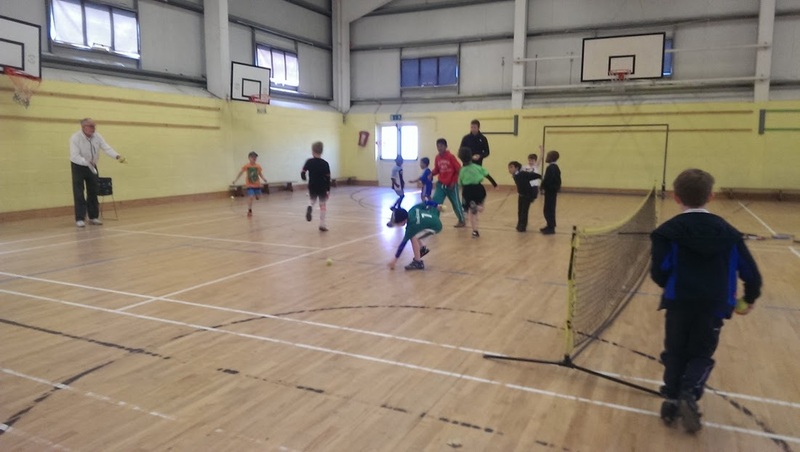 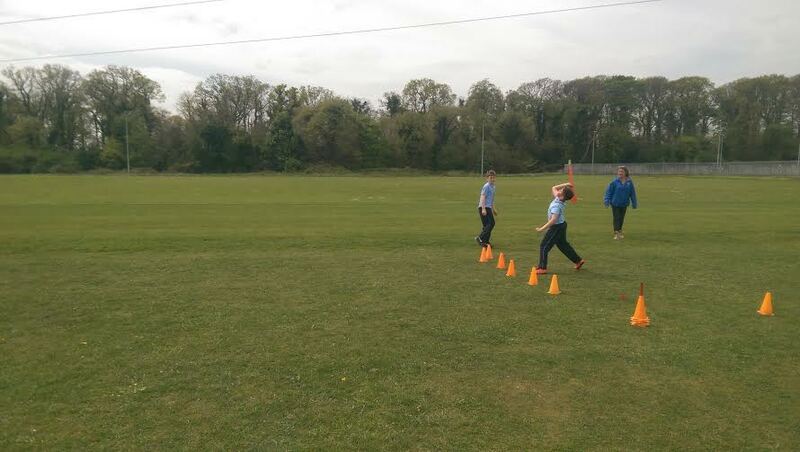 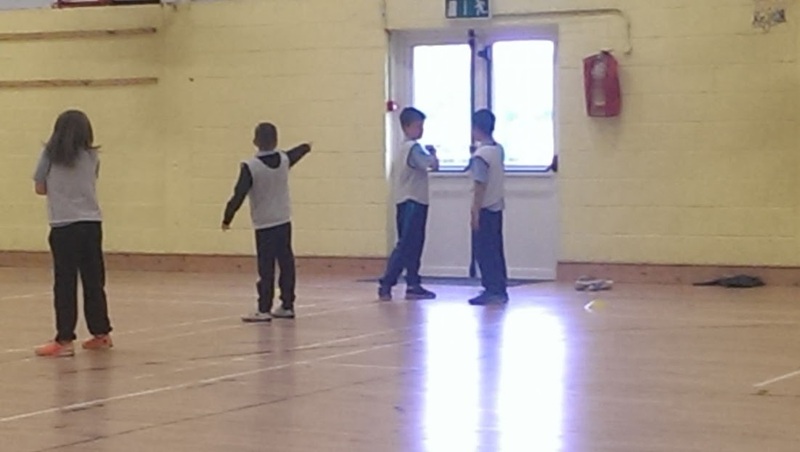 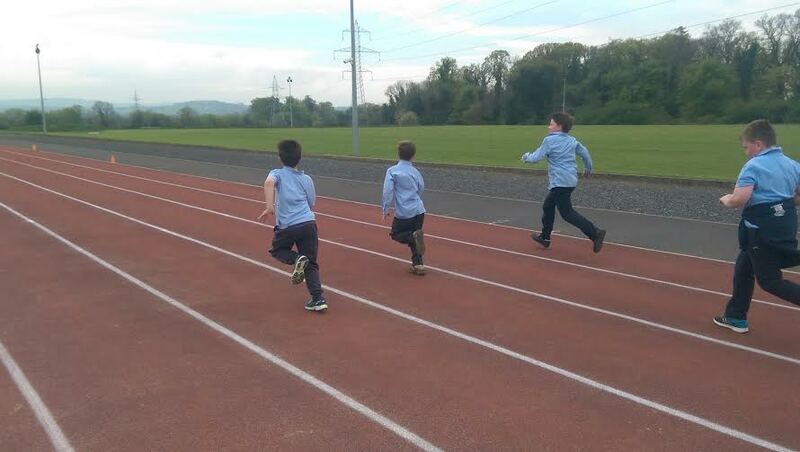 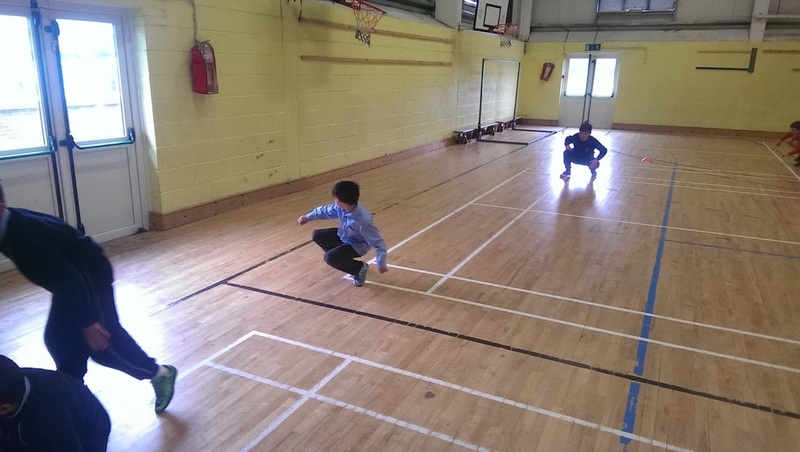 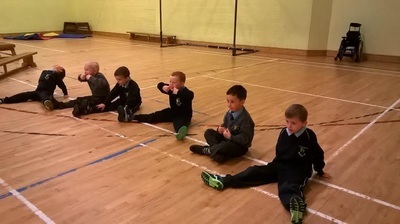 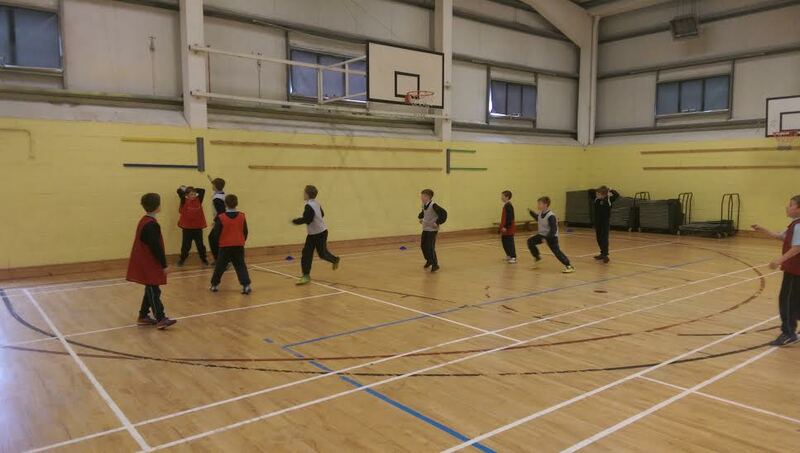 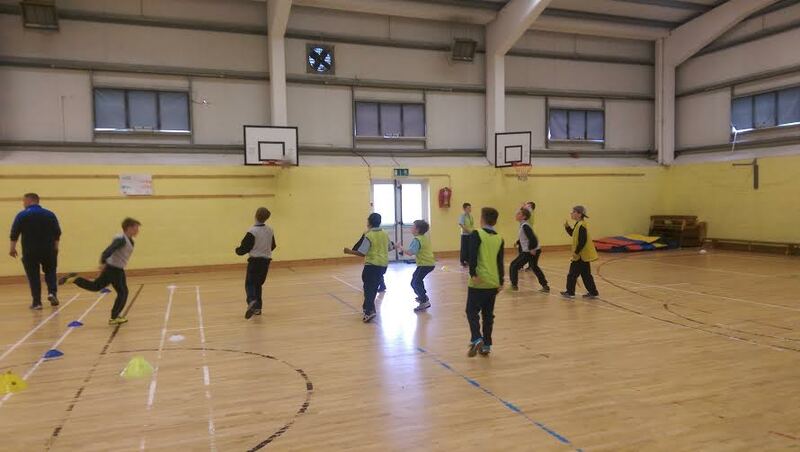 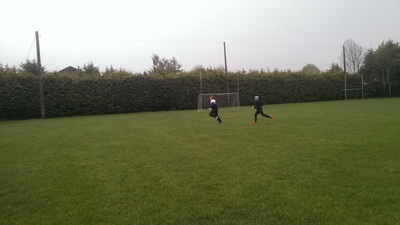 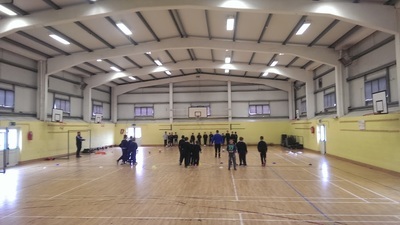 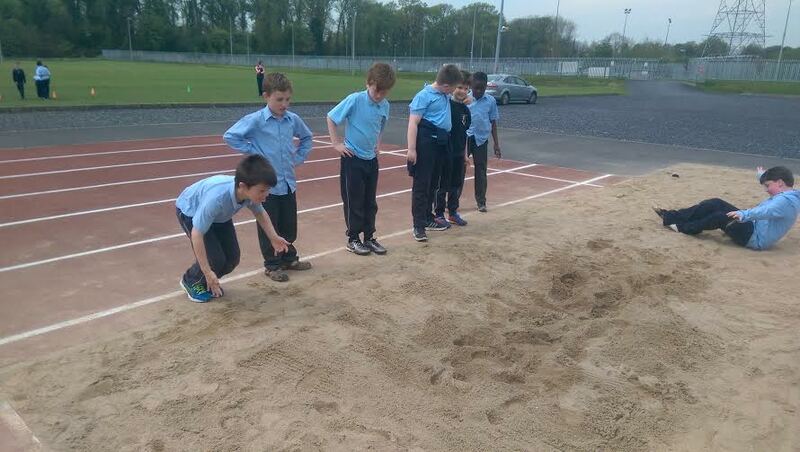 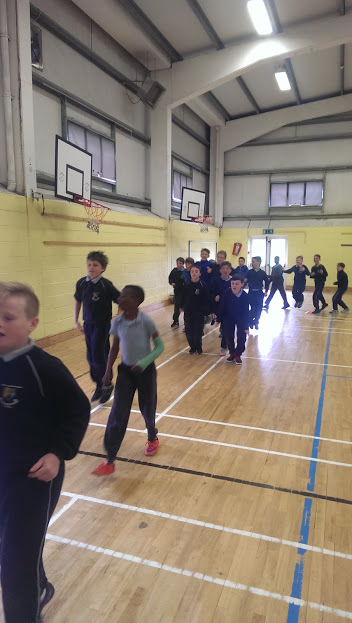 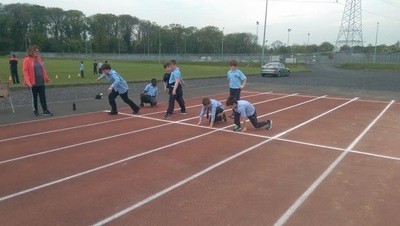 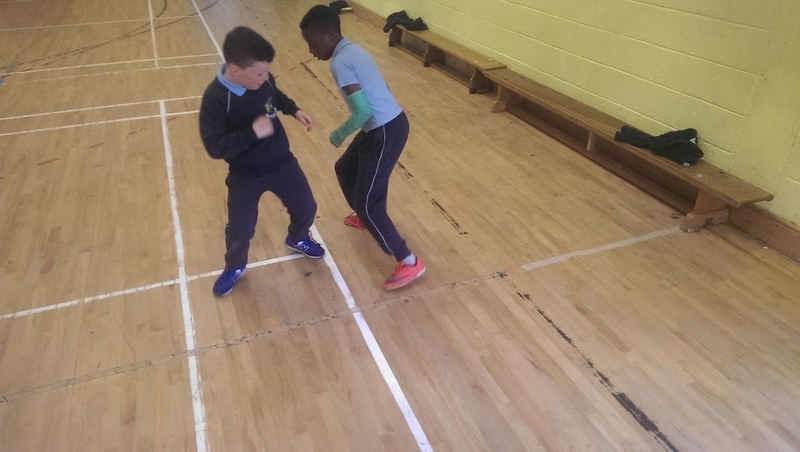 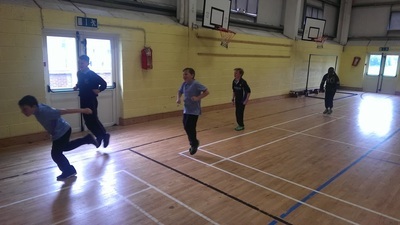 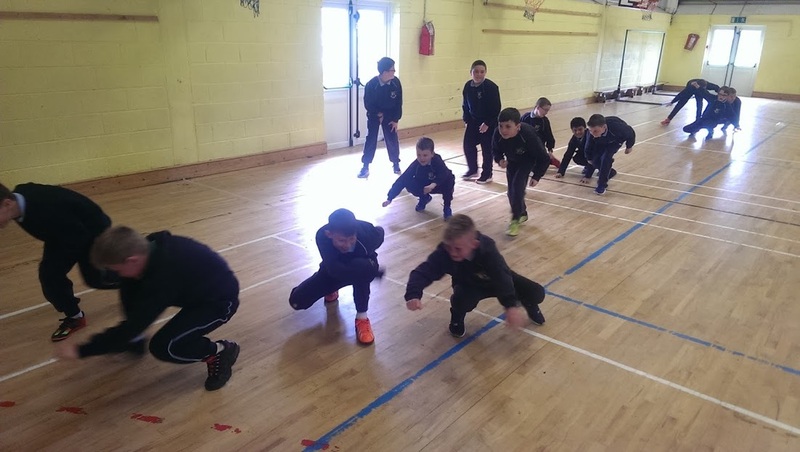 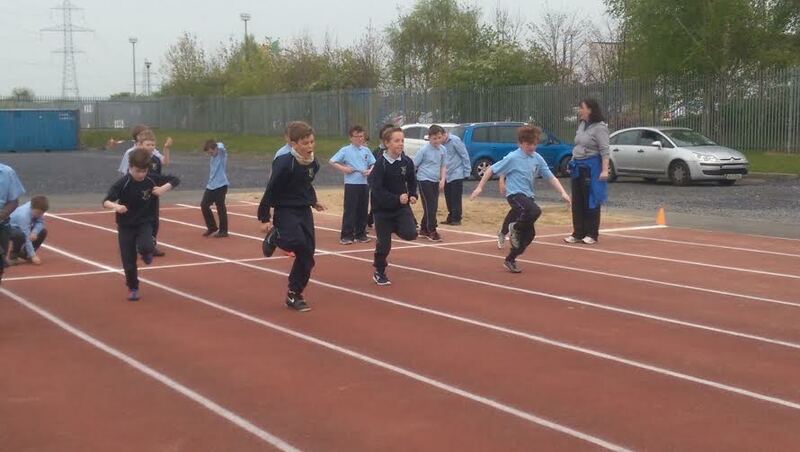 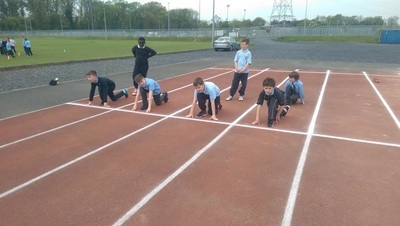 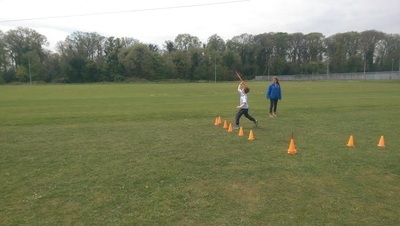 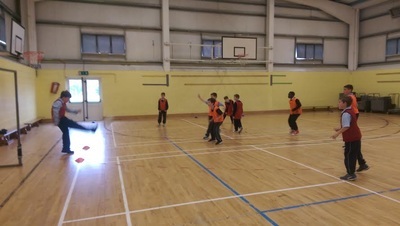 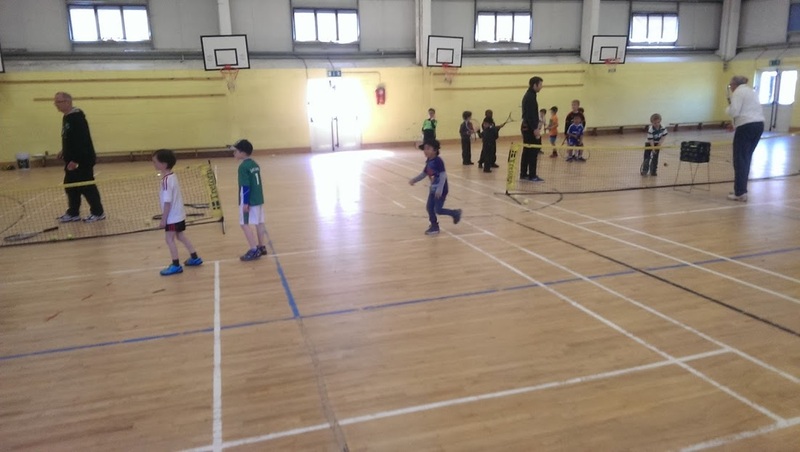 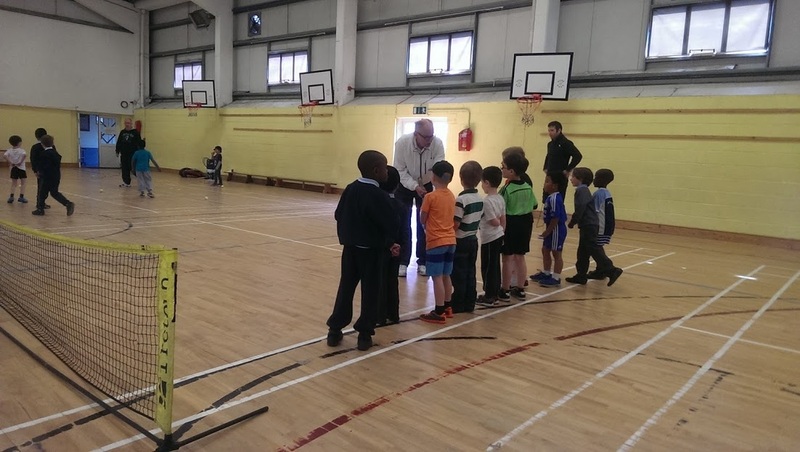 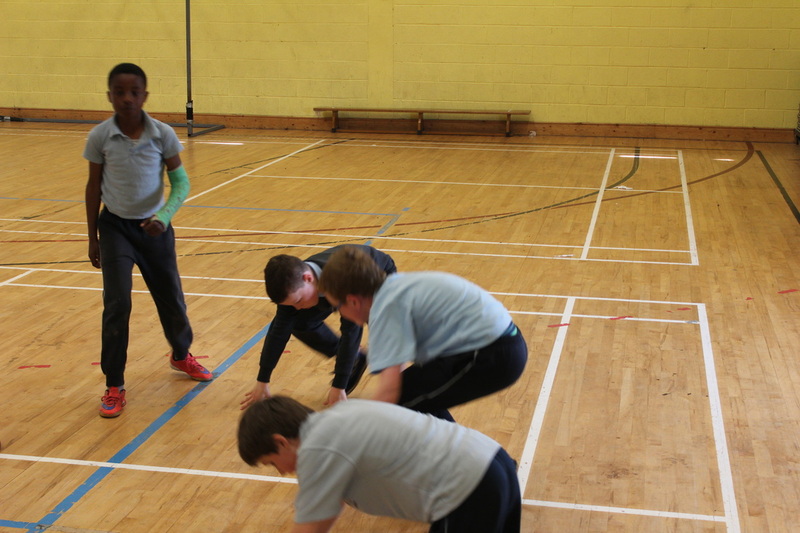 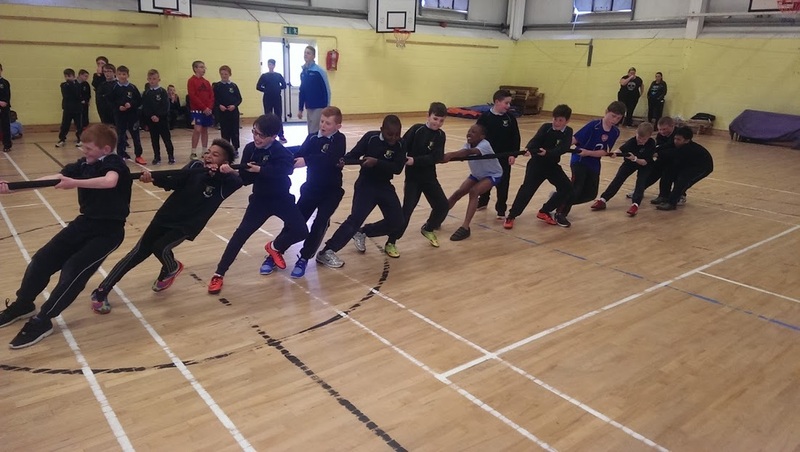 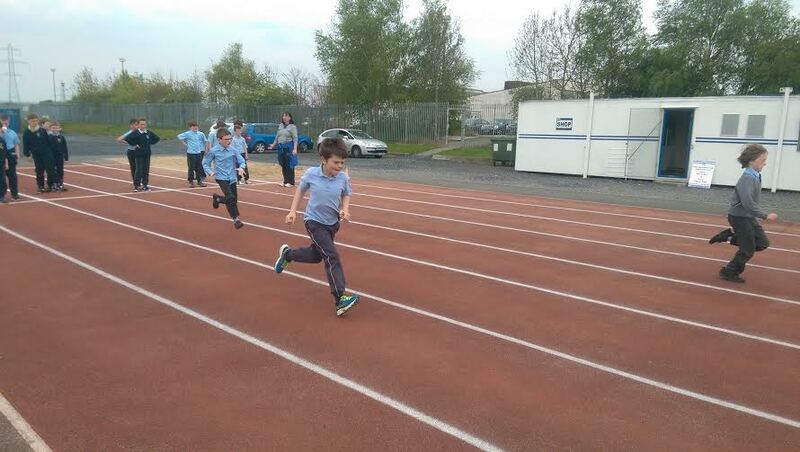 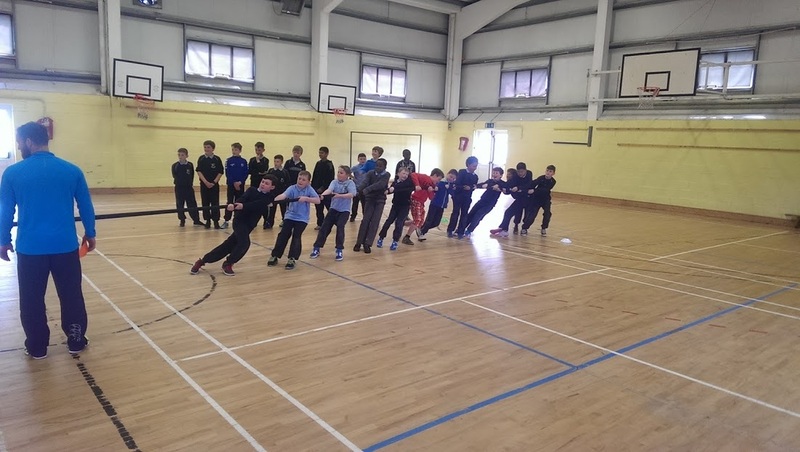 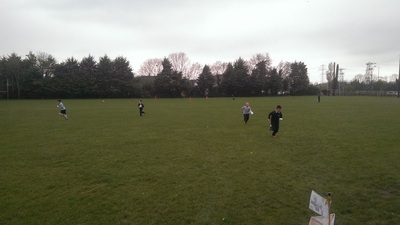 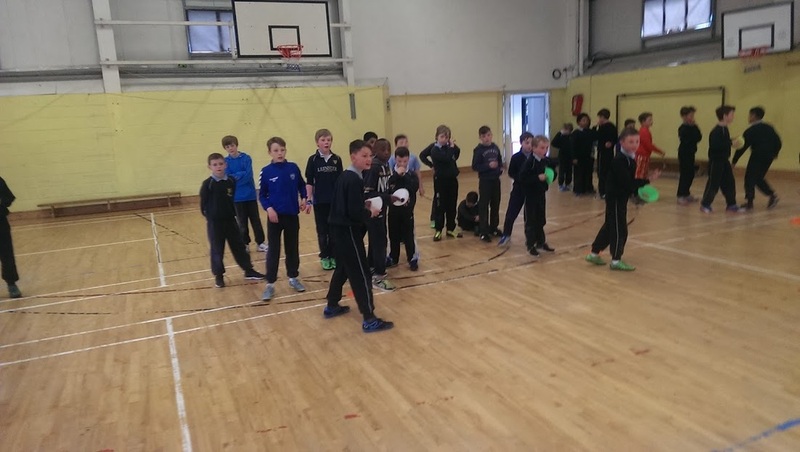 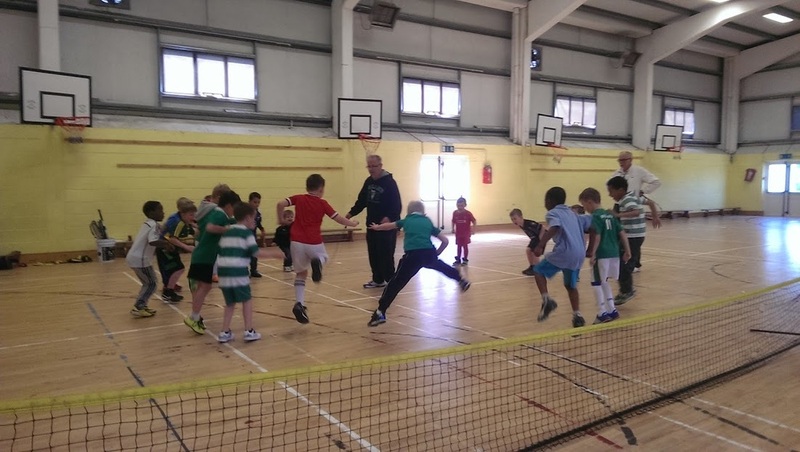 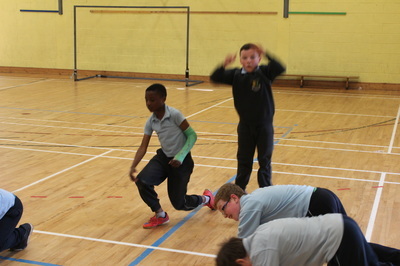 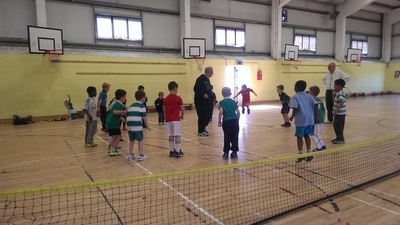 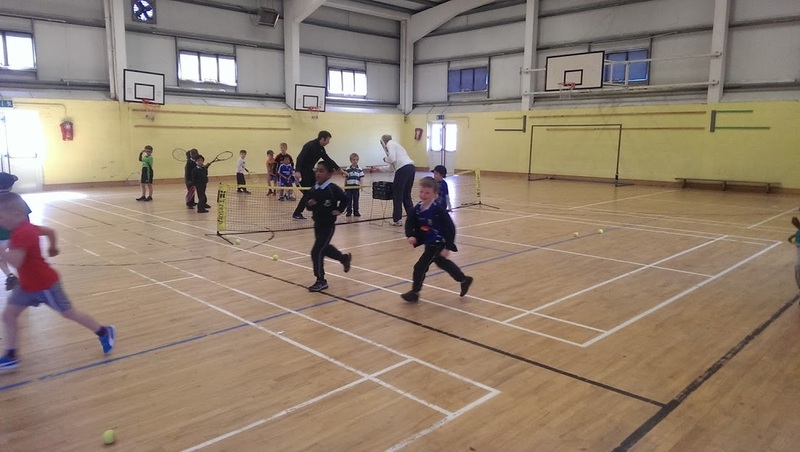 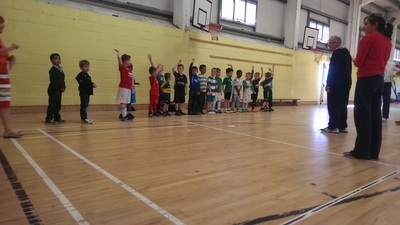 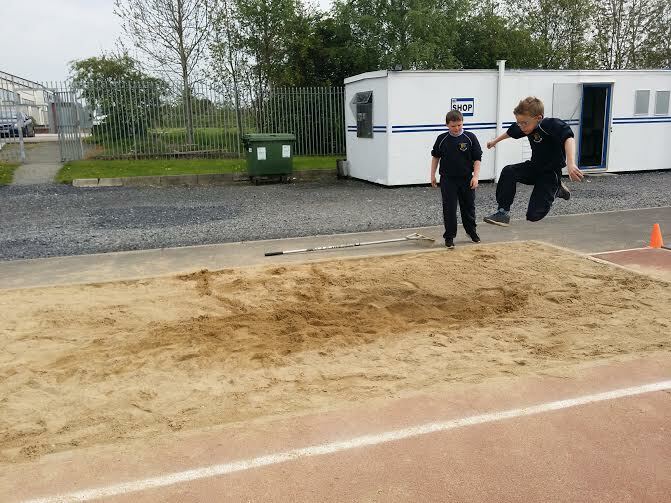 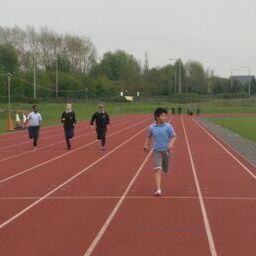 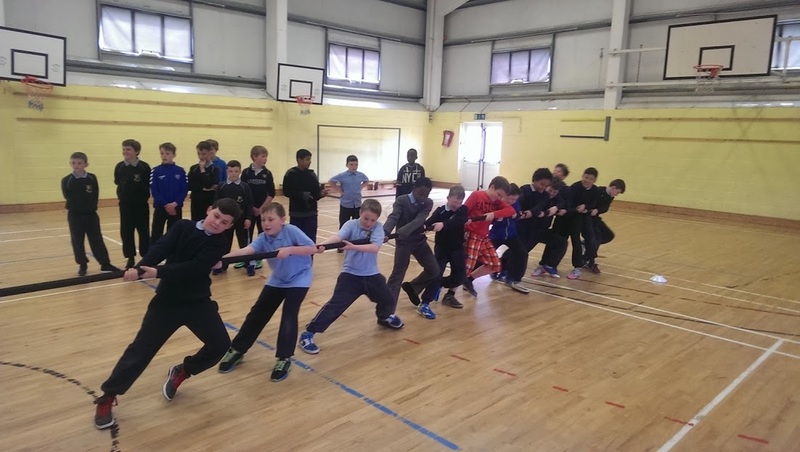 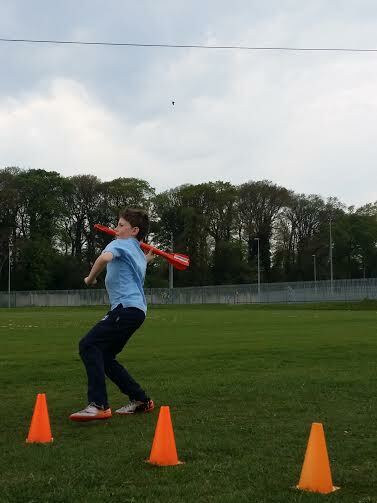 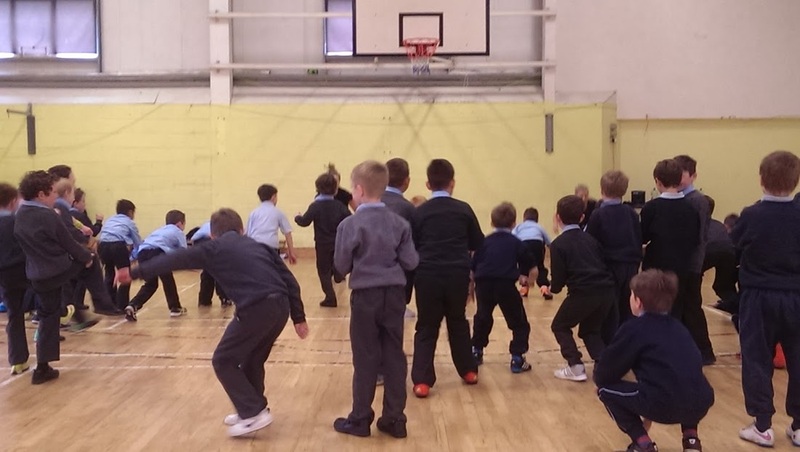 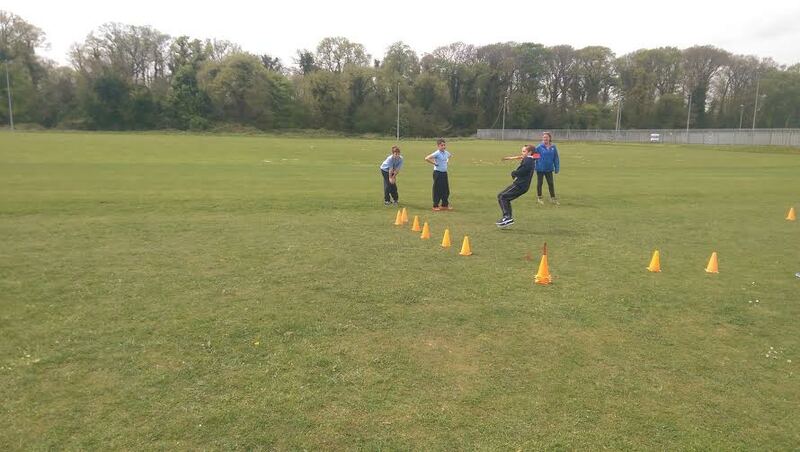 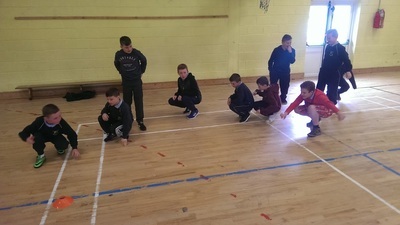 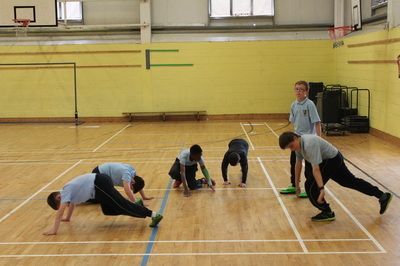 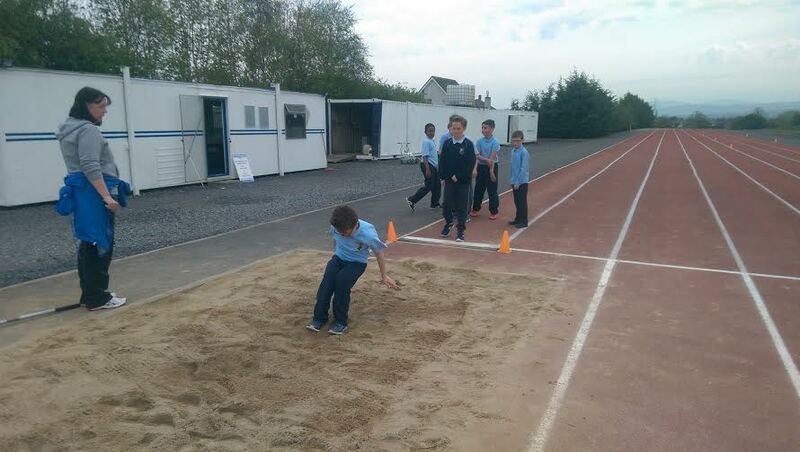 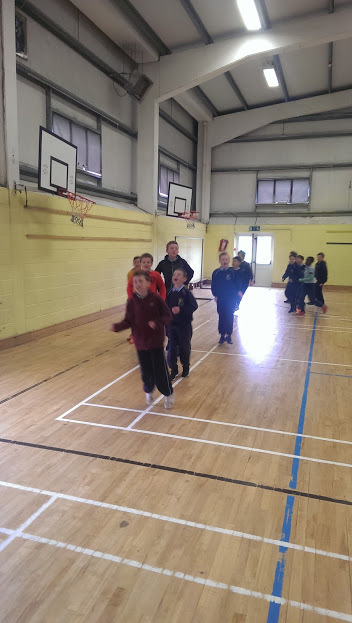 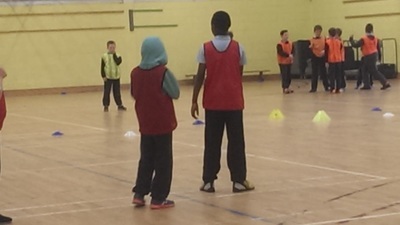 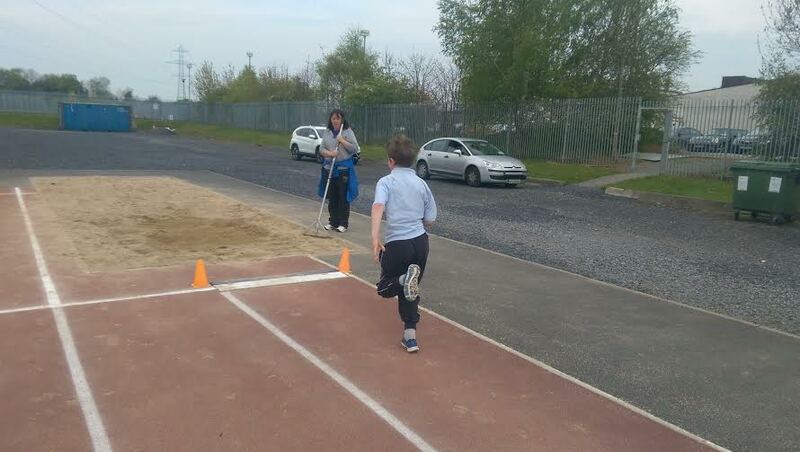 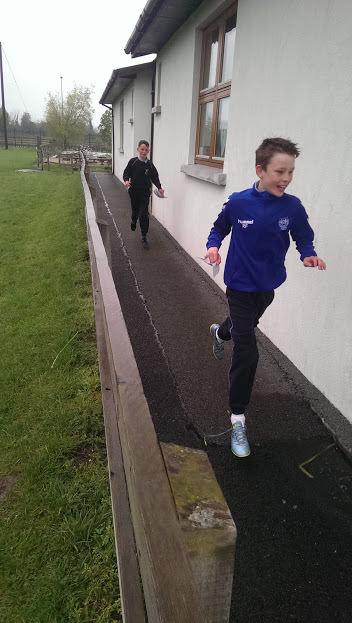 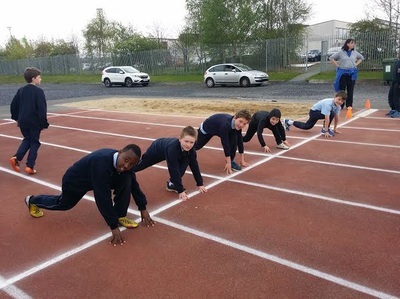 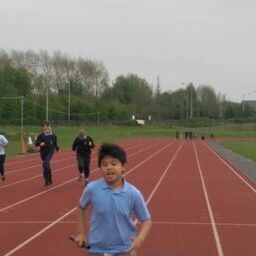 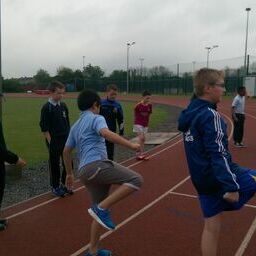 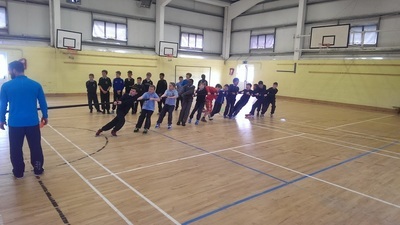 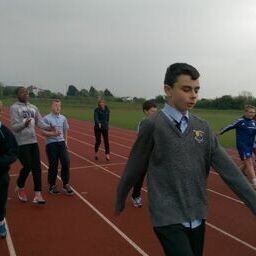 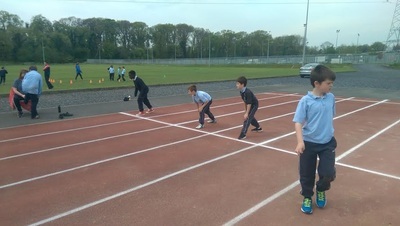 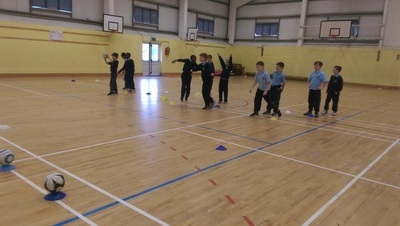 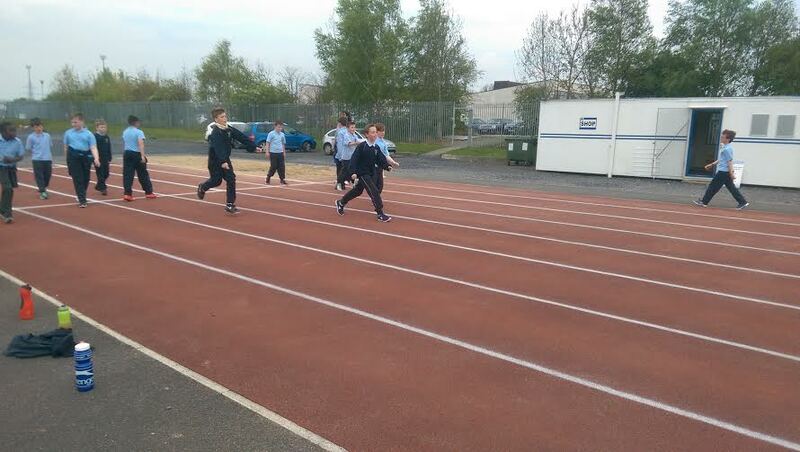 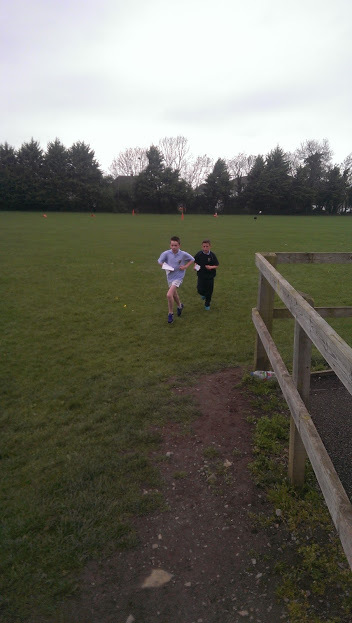 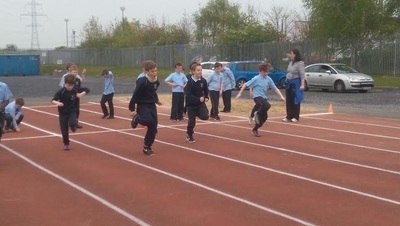 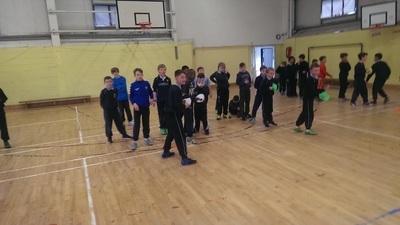 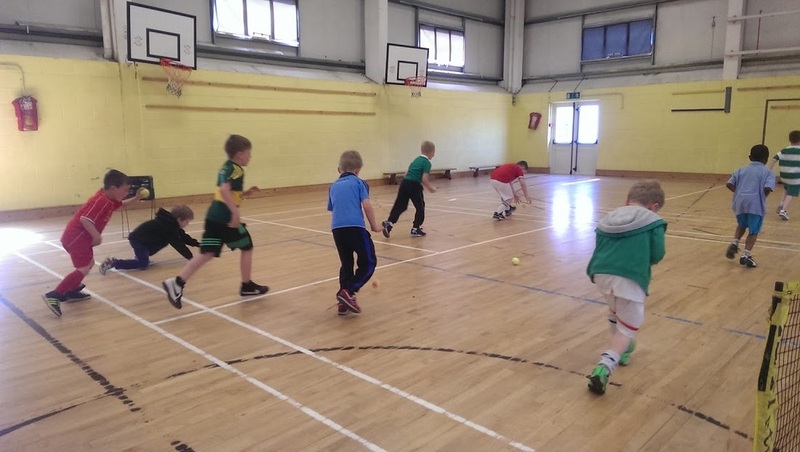 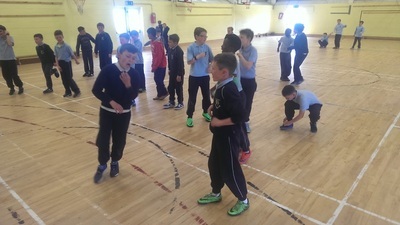 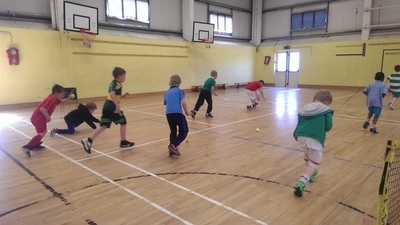 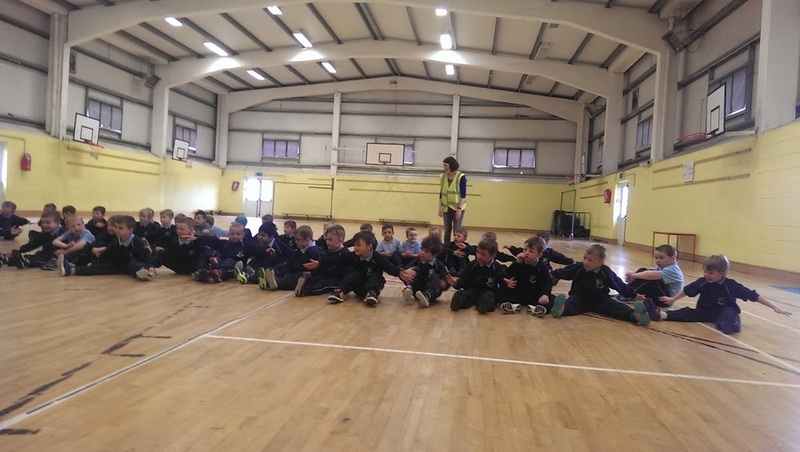 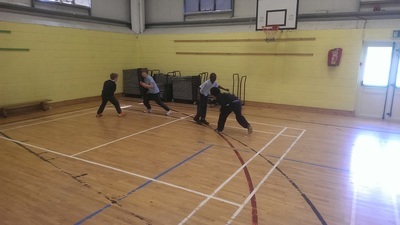 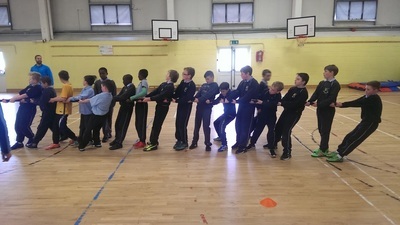 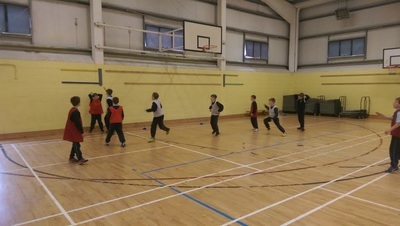 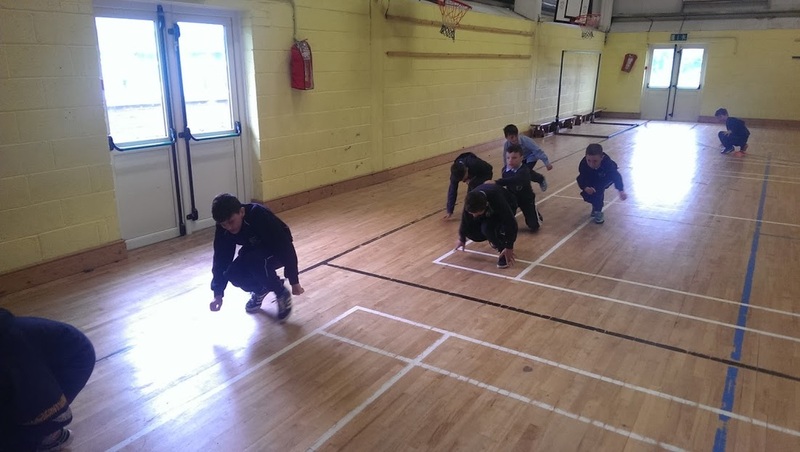 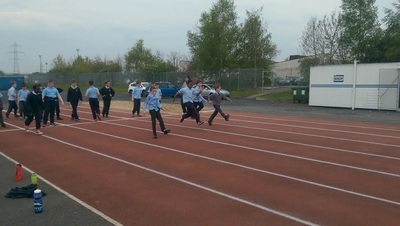 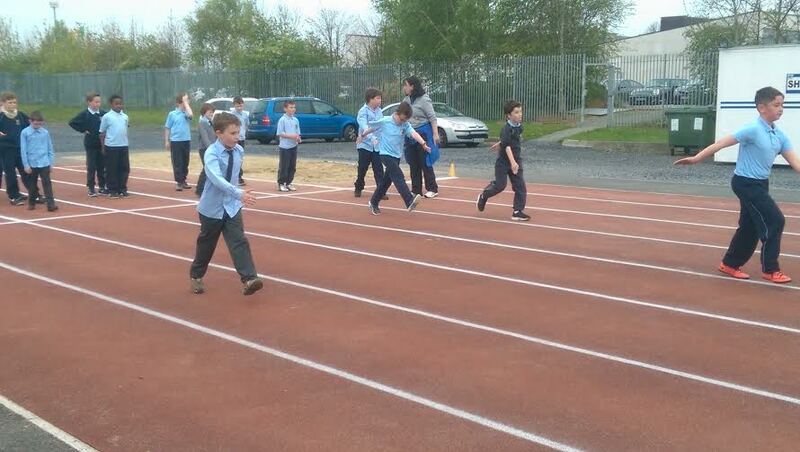 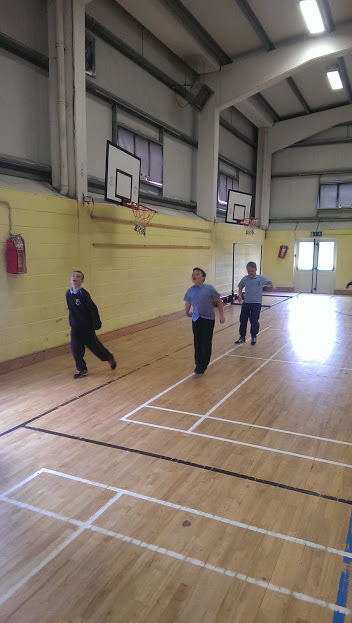 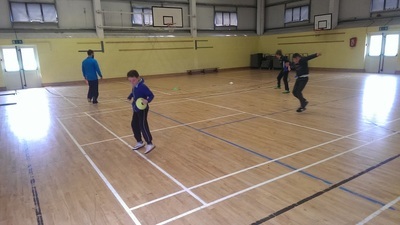 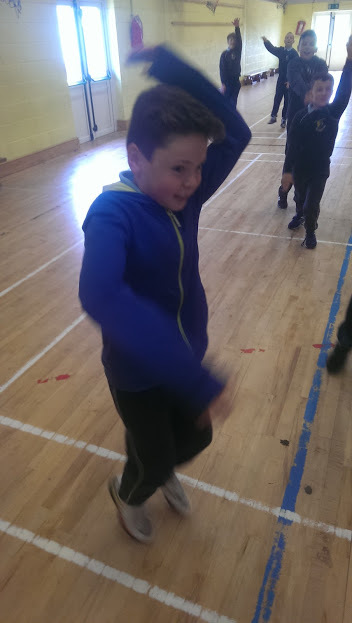 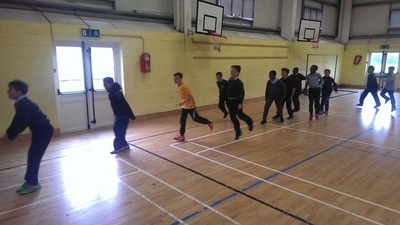 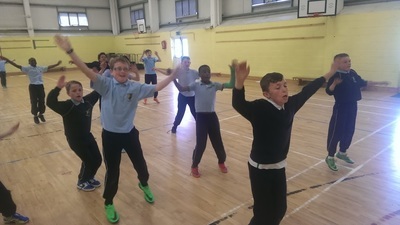 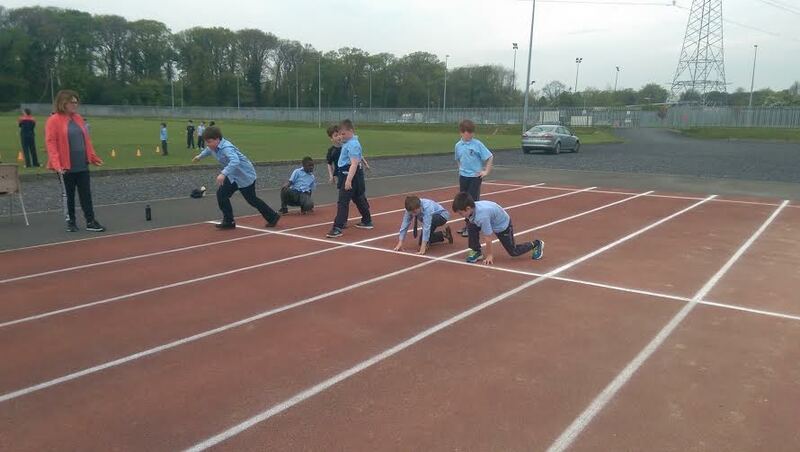 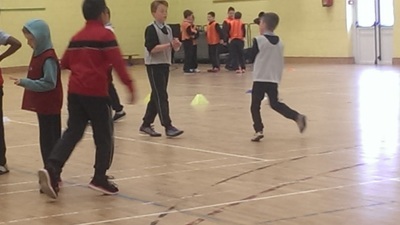 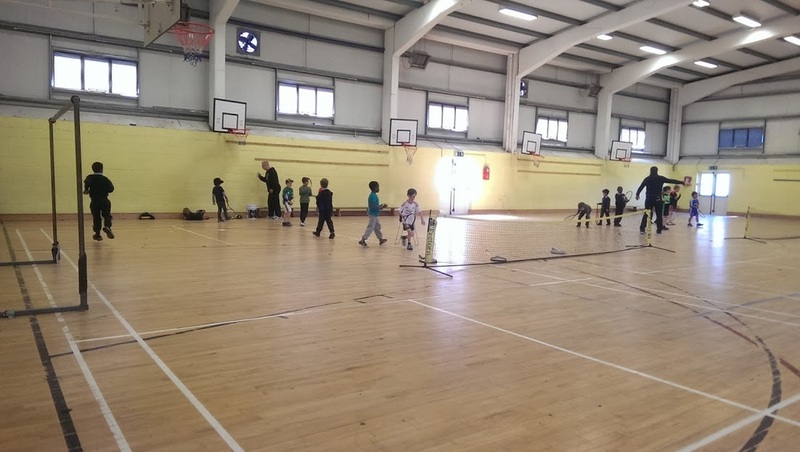 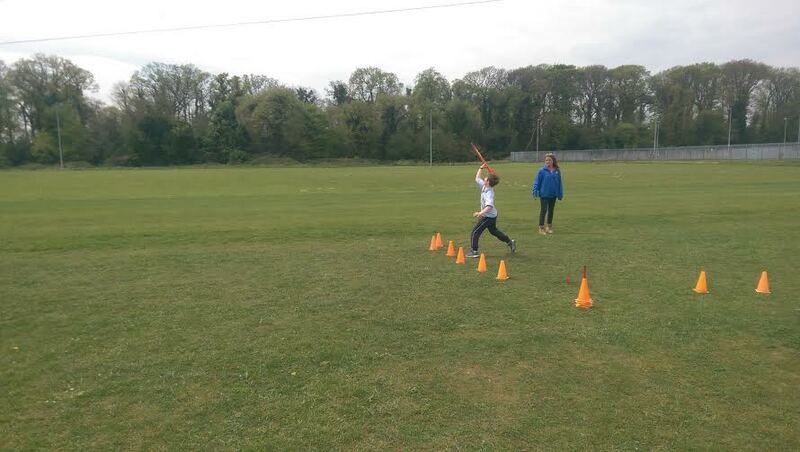 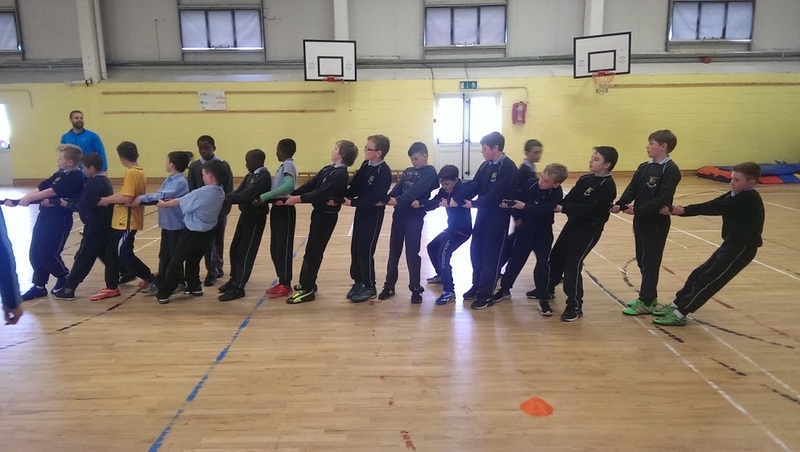 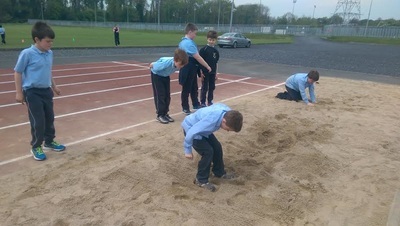 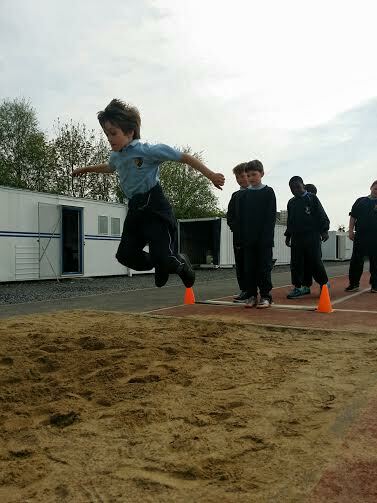 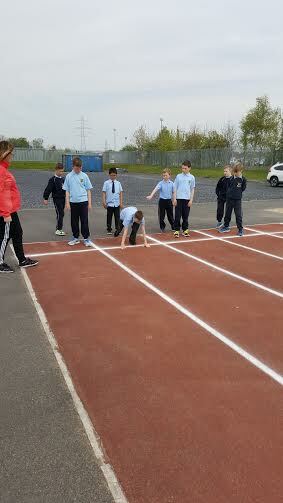 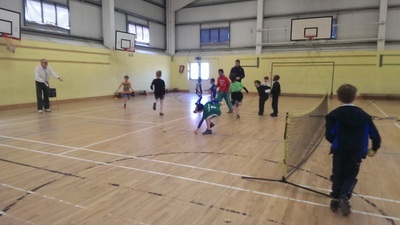 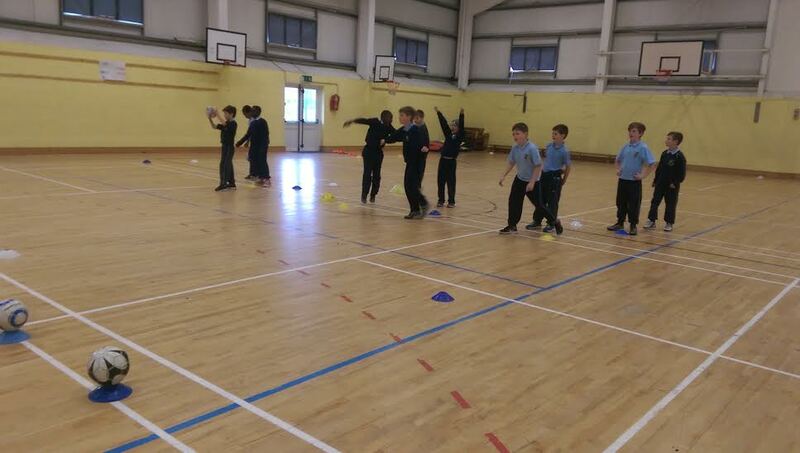 As part of our ‘Active School’s Week’ initiative and in an attempt to highlight the importance of physical exercise for children, the boys in third class have been invited to participate in a track and field training session in Celbridge Athletic Club. 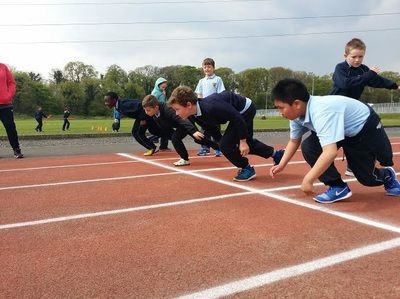 Each class will have one hour of track and field training with qualified coaches on Monday 9th May (the day we return from our break). 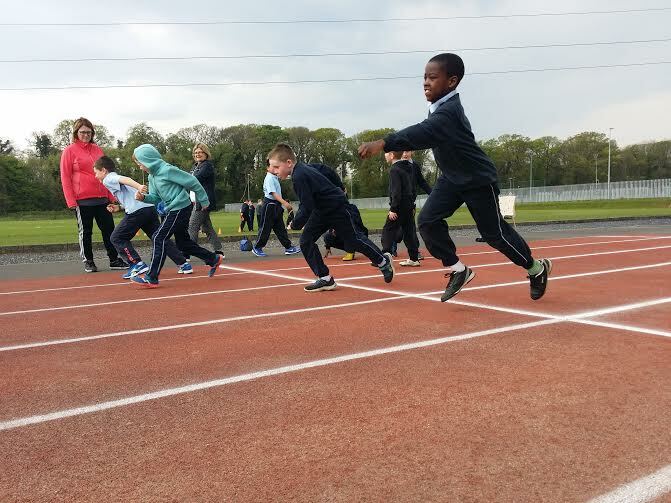 We are really looking forward to this event and are very grateful to Celbridge Athletics for supporting us during our Active Week. 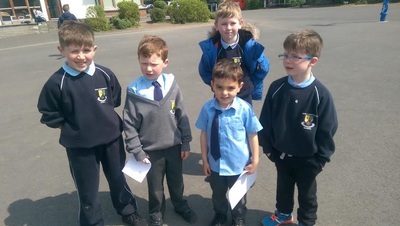 Boys are asked to wear in their school tracksuit. They must also wear runners (no astro runners, spikes, shoes or boots allowed) as the Athletics Club has recently resurfaced their track and only allow regular runners (to avoid surface damage). We are very grateful to Celbridge Athletic Club and look forward to an ongoing partnership with them as we endeavour to collaboratively promote physical well-being for our students.